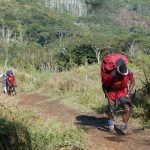 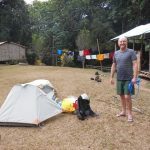 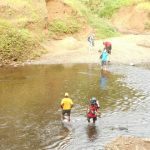 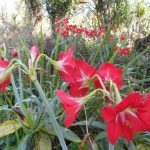 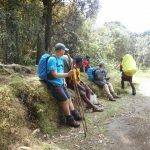 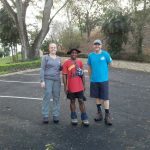 Trek 1130 : This trek commenced this morning when trekkers were picked up from their accommodation and as I type are presently being driving to the drop off point at Owers’ Corner. 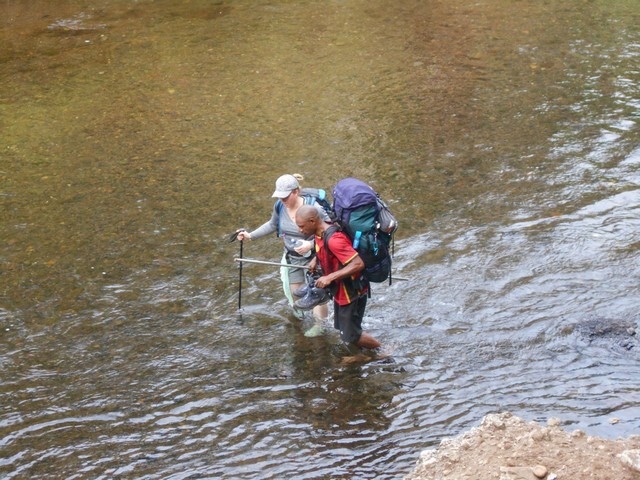 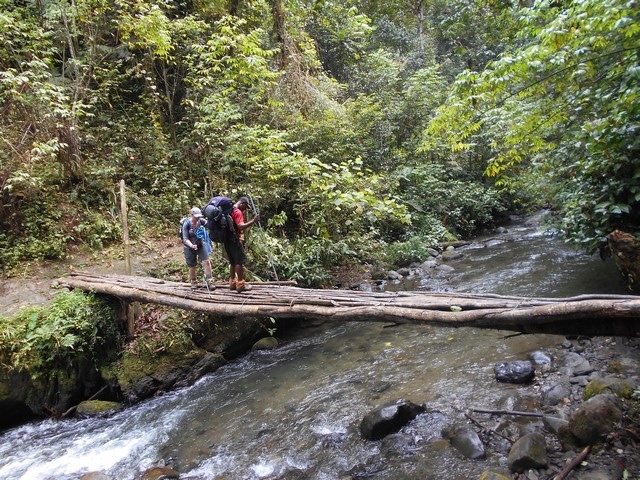 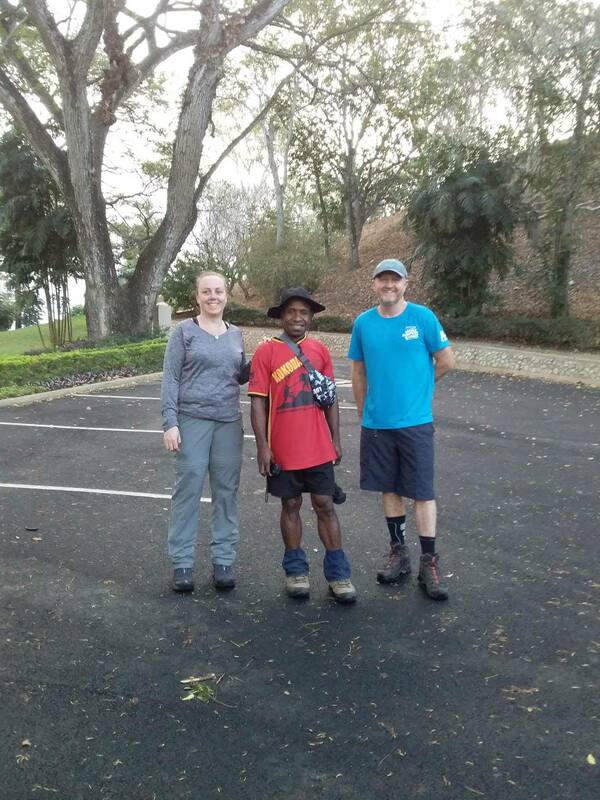 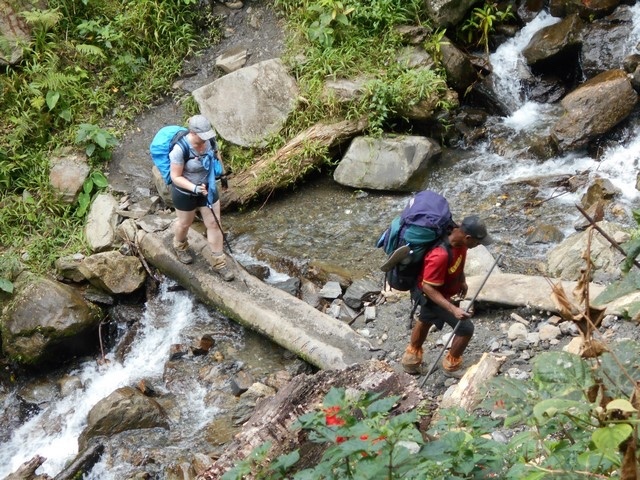 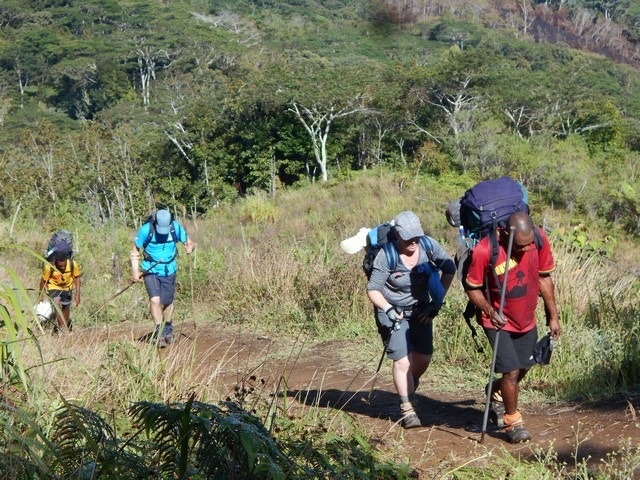 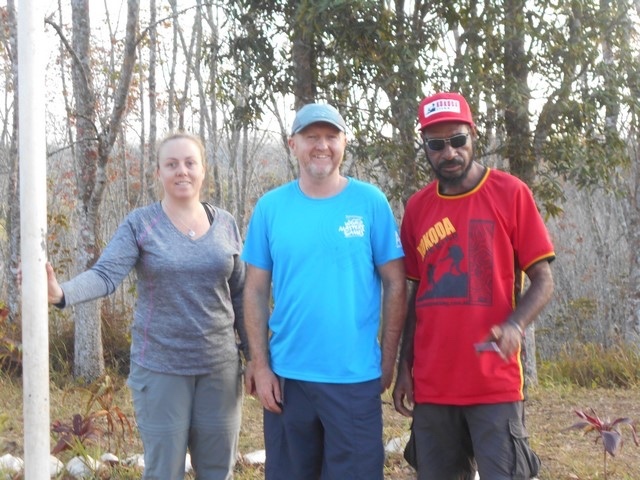 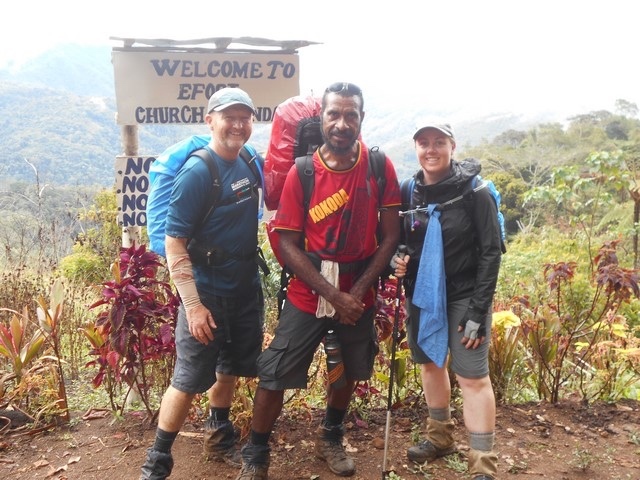 The guide for this trek is Ivan Semie seen here in this photograph with Katrina Copeland and Richard Lewer. 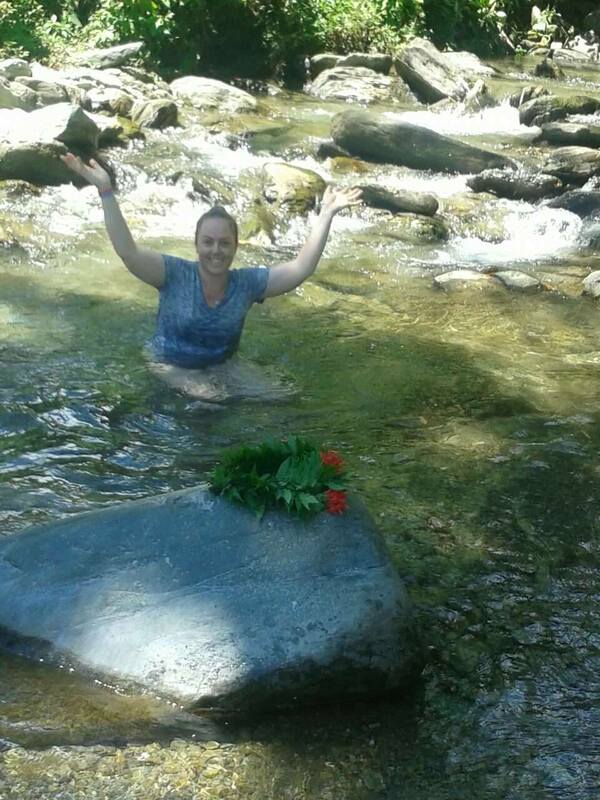 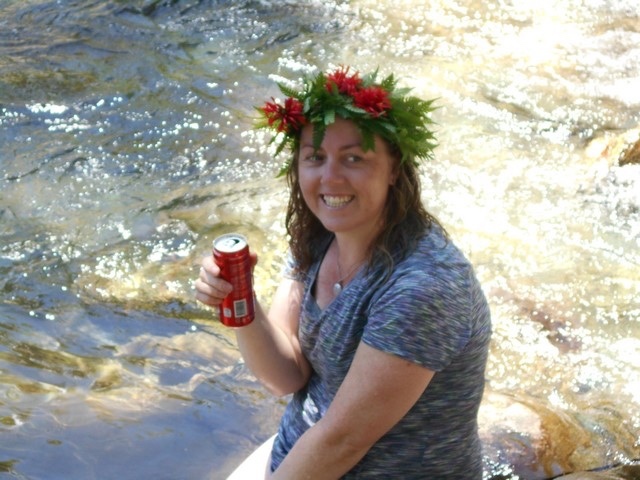 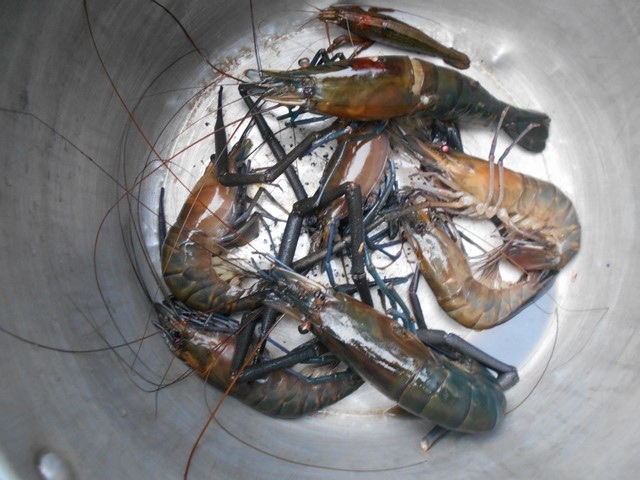 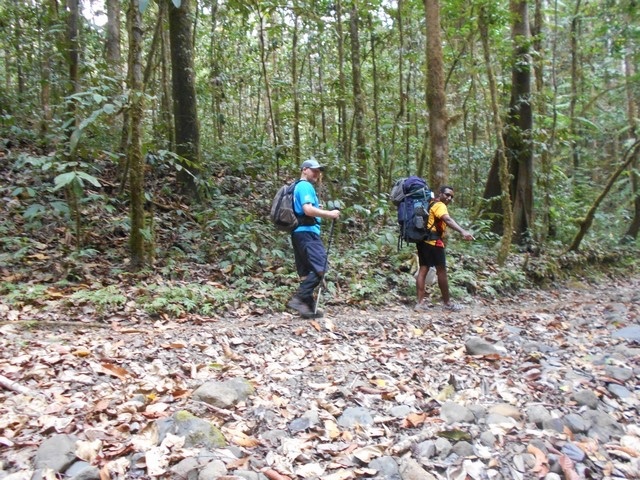 Trek 1130: This trek found themselves at Ofi Creek around 1pm this afternoon. 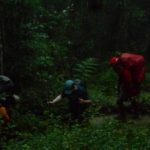 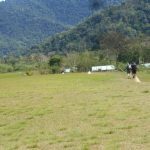 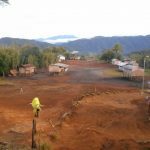 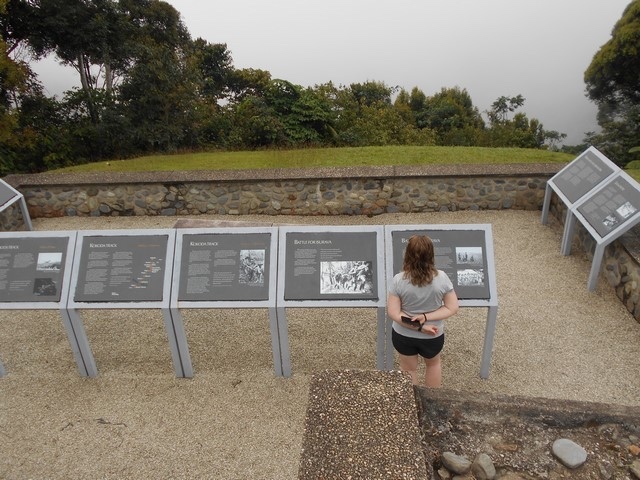 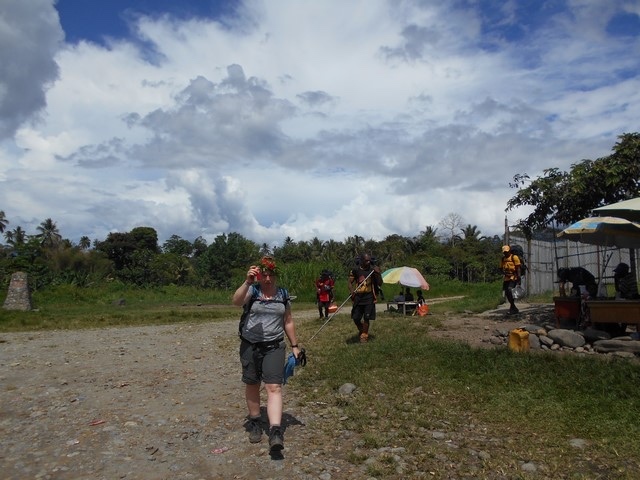 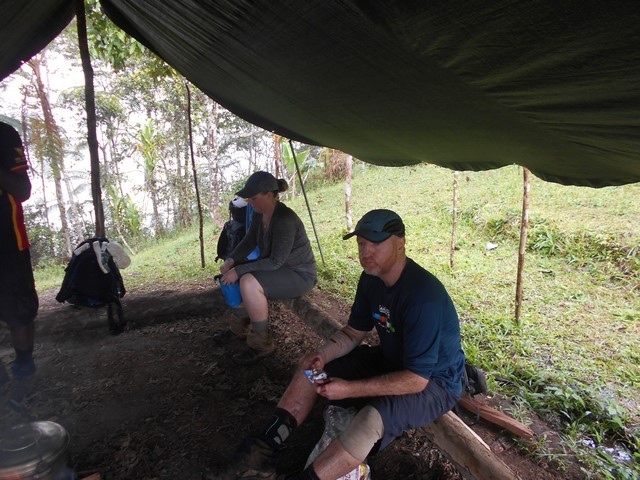 Its a dry track at the moment where they are located but they are expecting rain as they make their way out the other side in Kokoda. 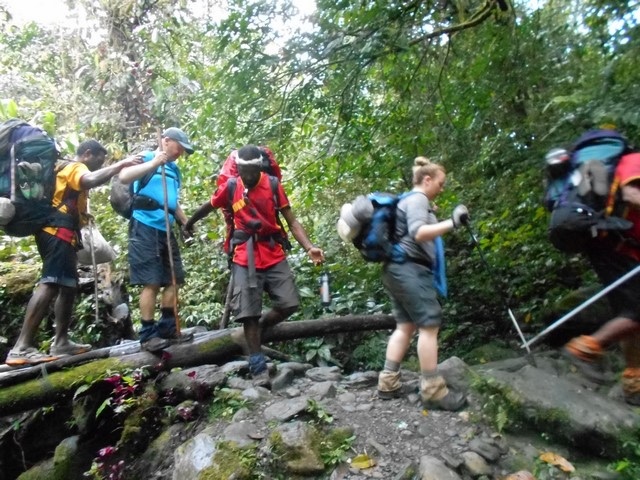 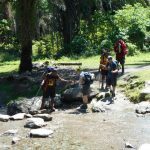 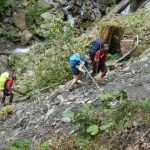 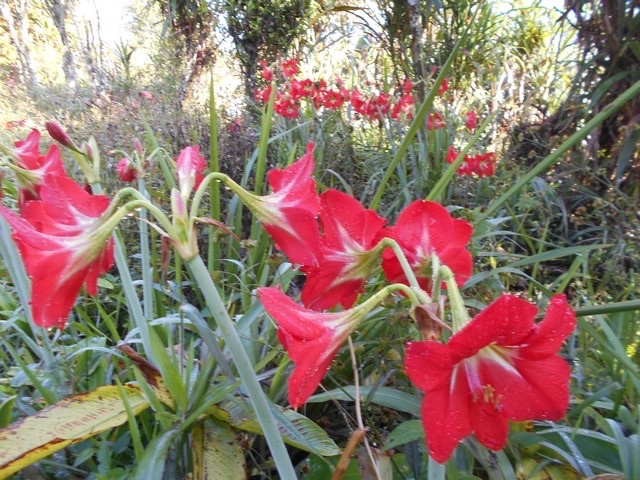 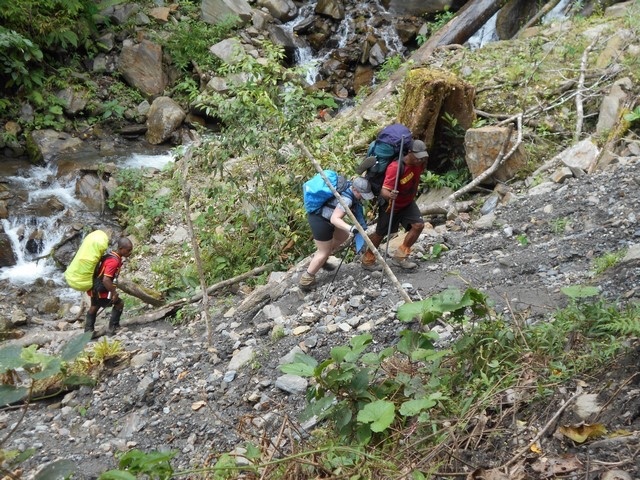 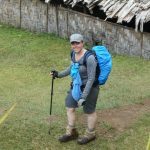 Trekkers and porters have enjoyed their day and are already looking forward to tomorrow when they head up Maguli Range. 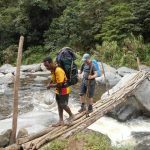 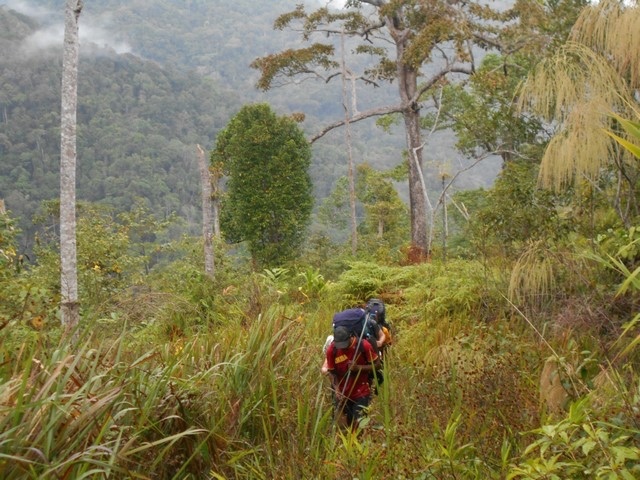 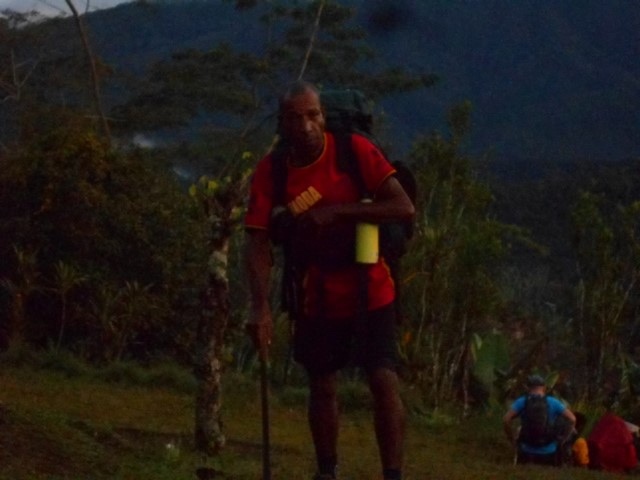 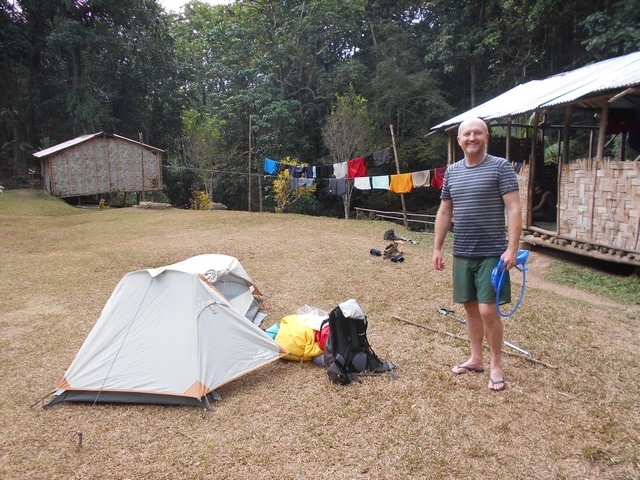 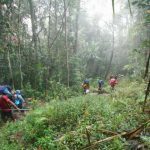 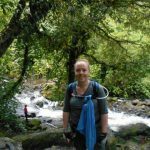 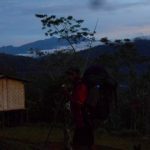 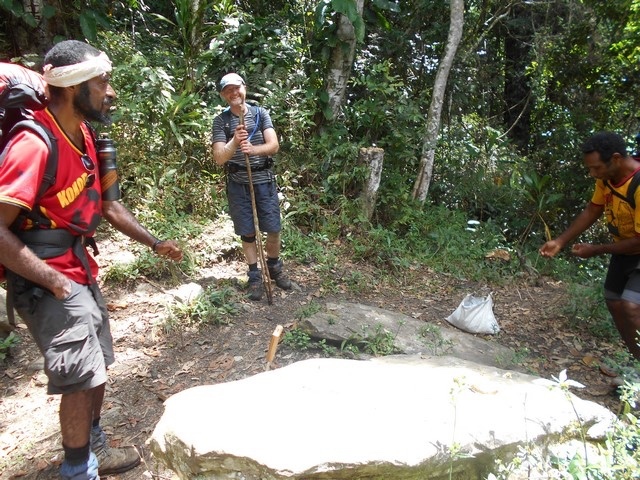 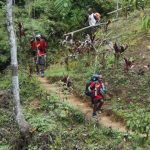 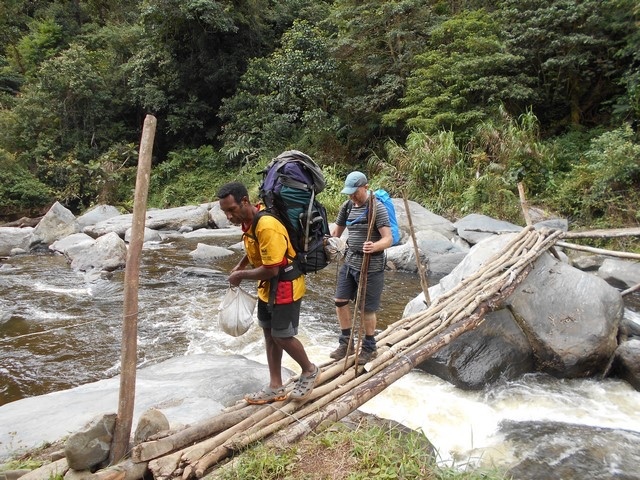 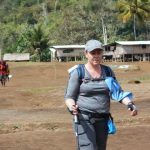 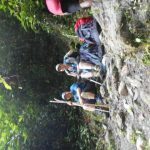 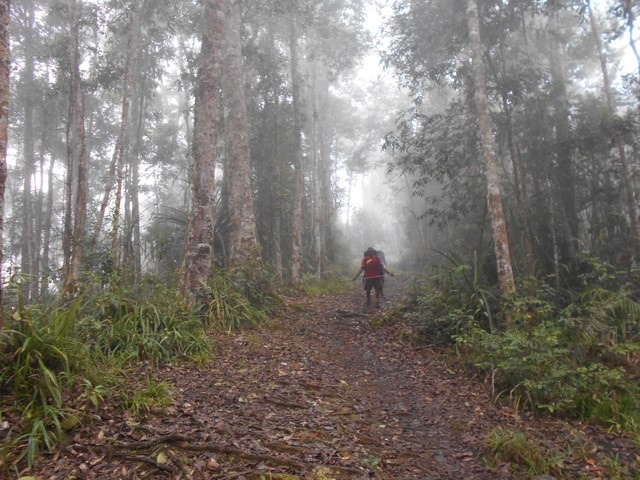 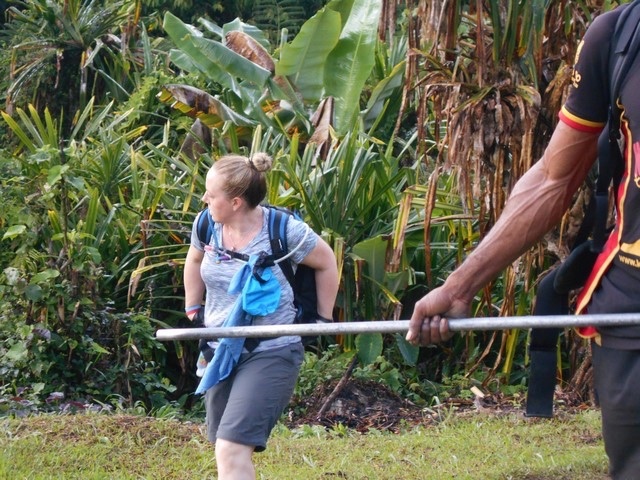 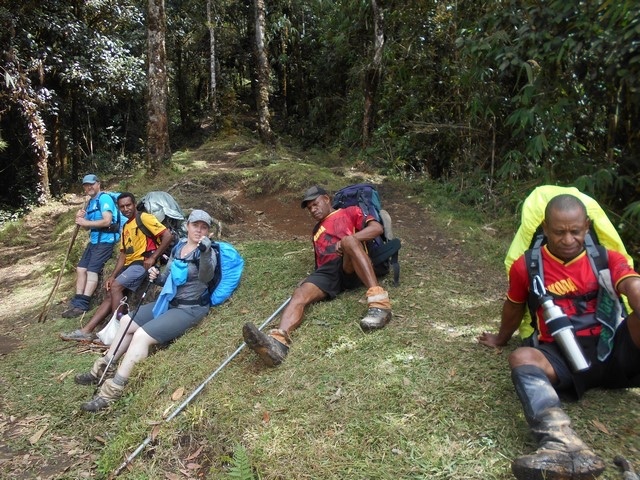 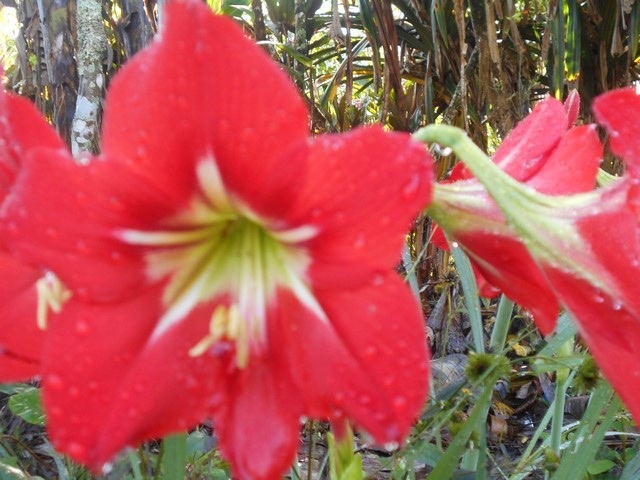 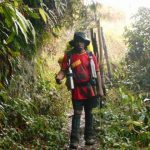 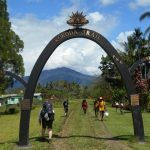 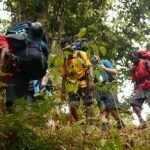 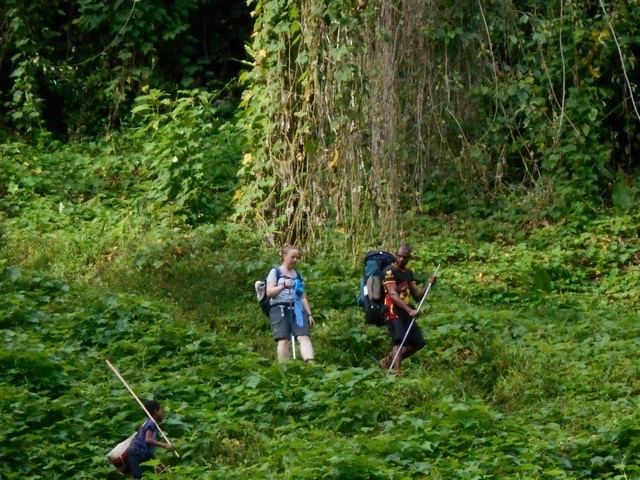 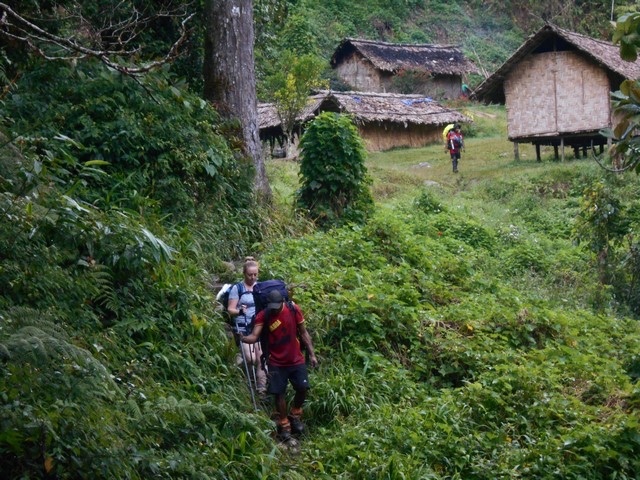 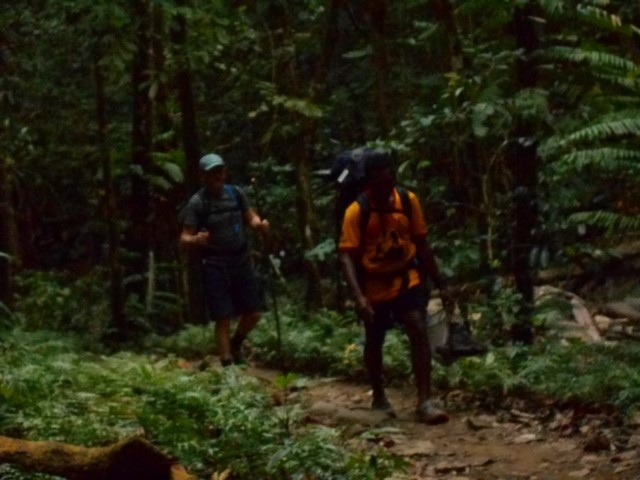 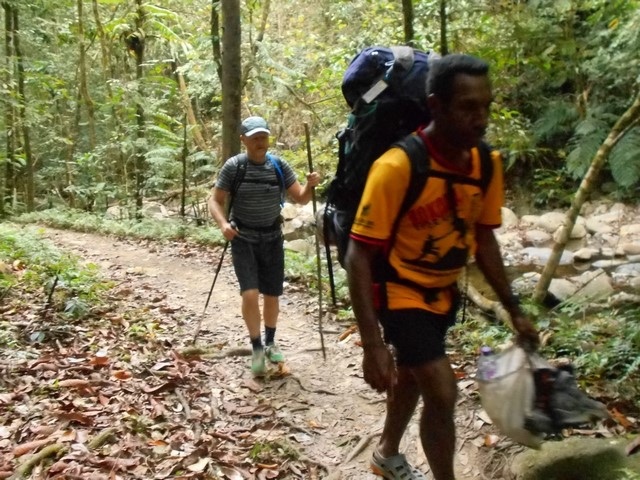 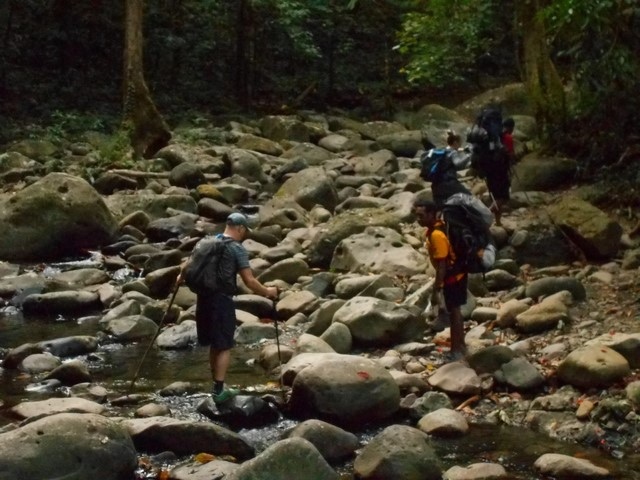 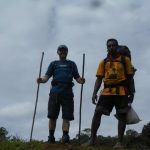 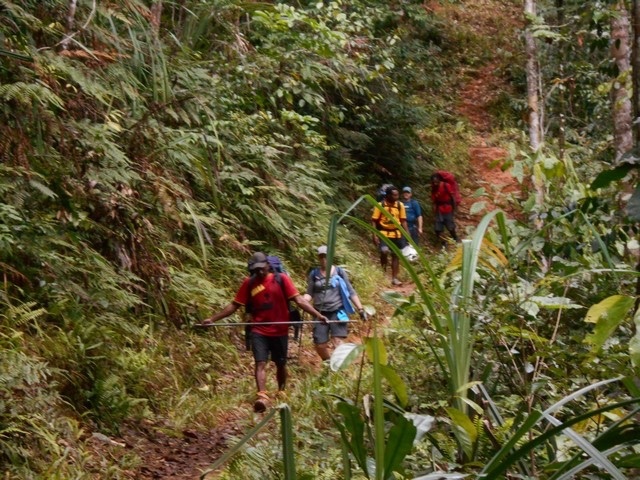 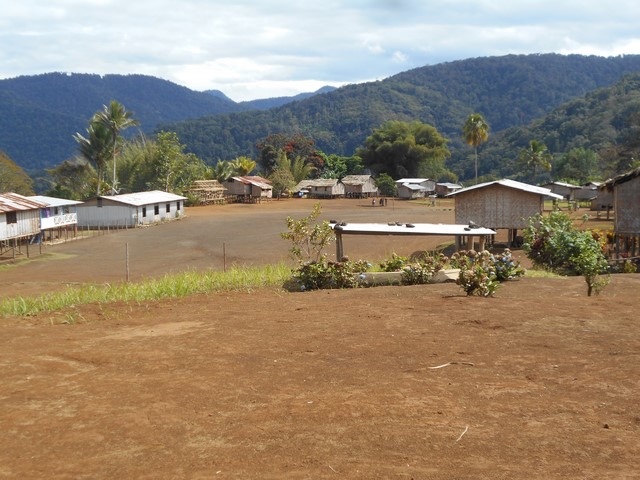 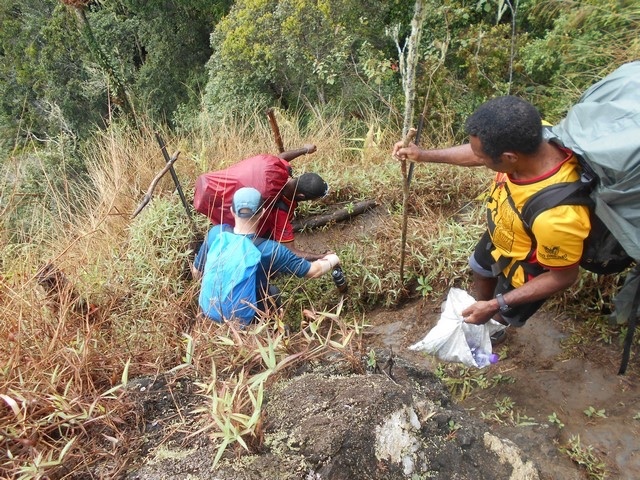 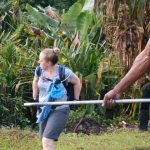 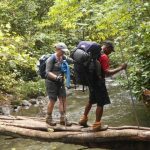 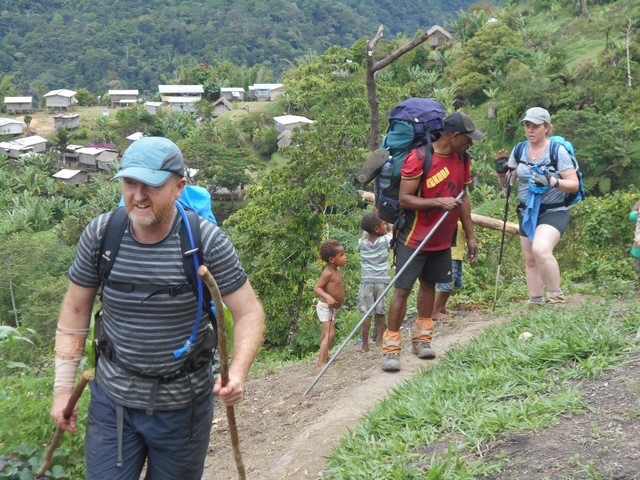 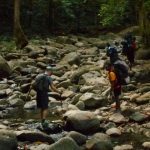 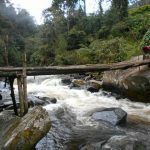 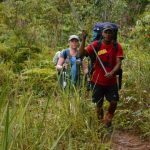 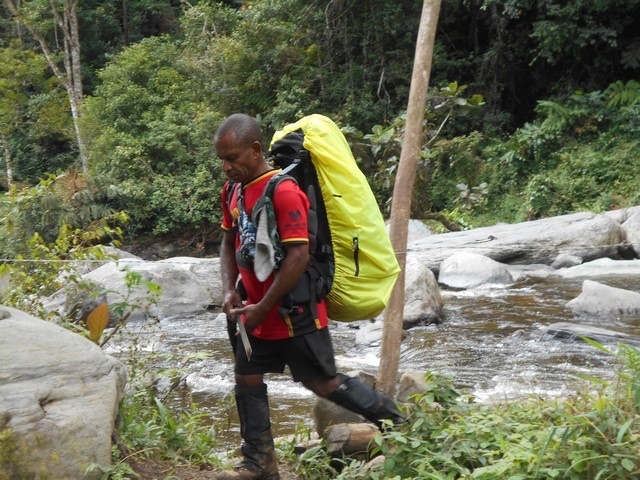 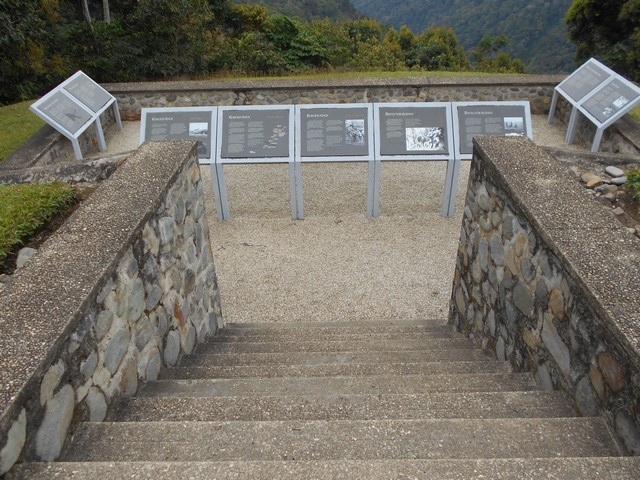 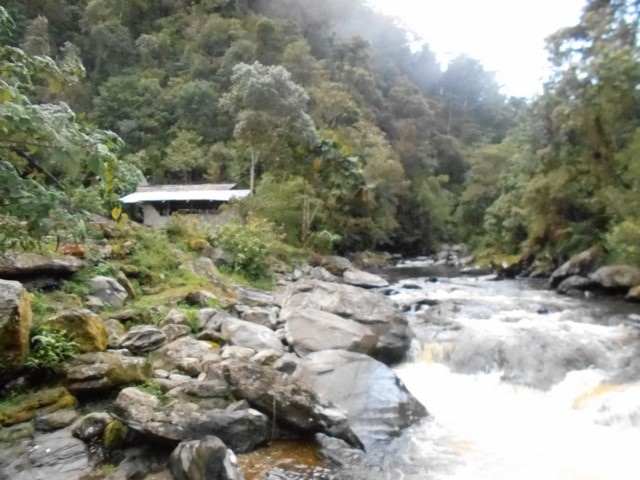 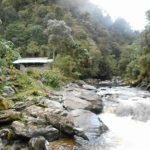 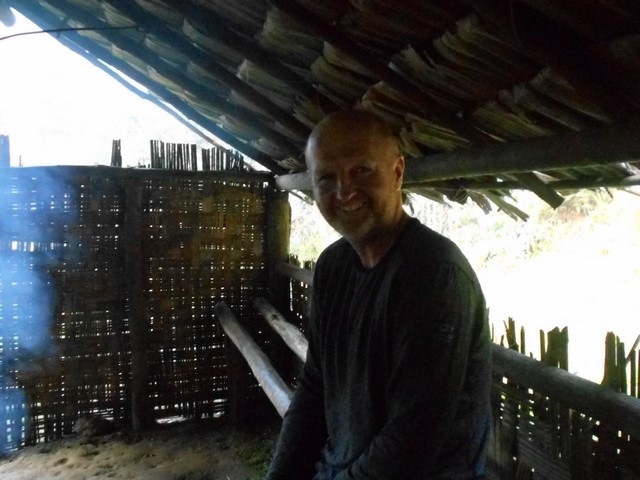 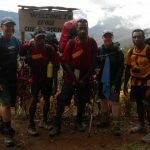 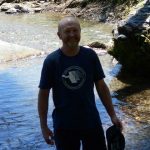 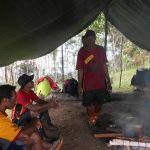 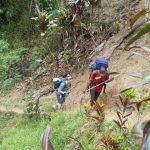 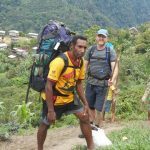 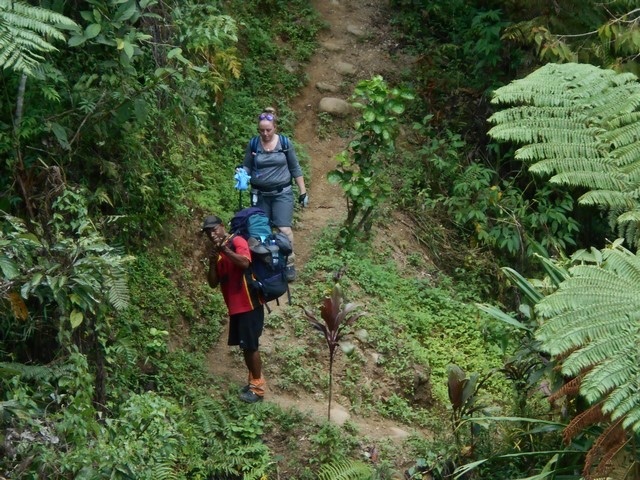 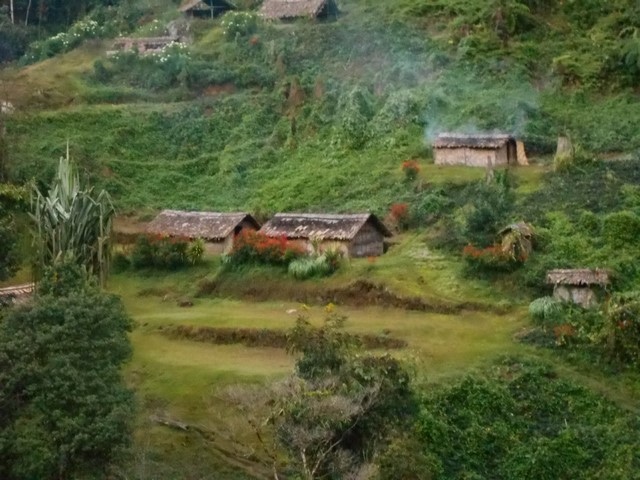 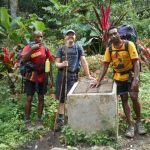 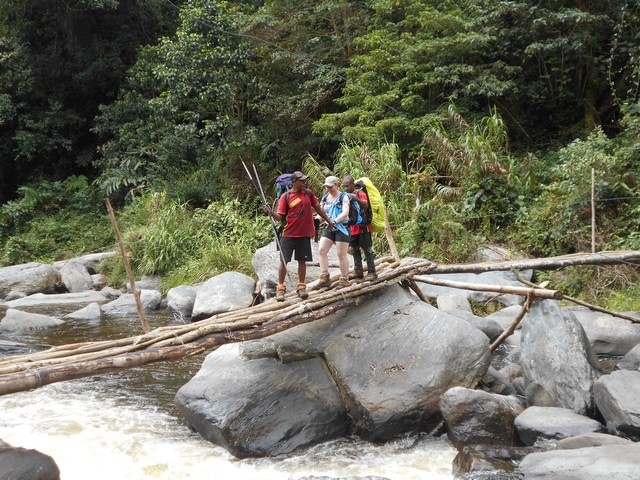 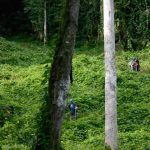 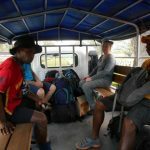 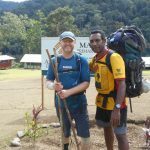 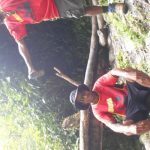 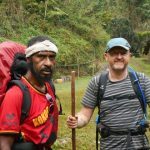 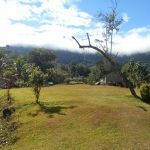 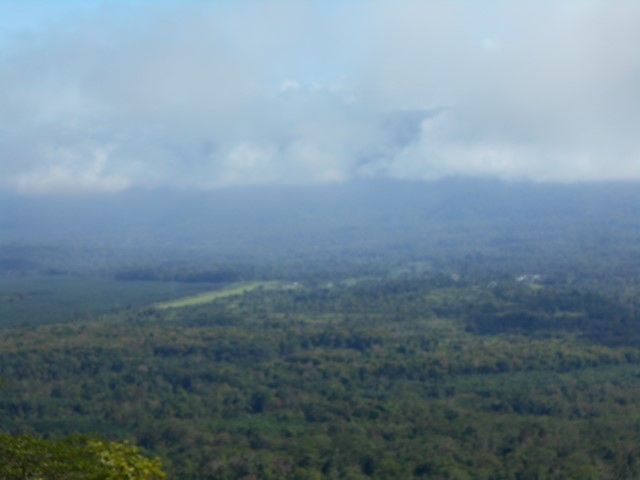 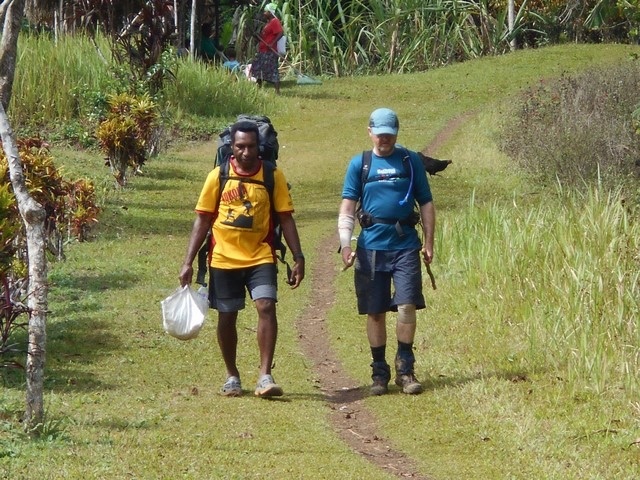 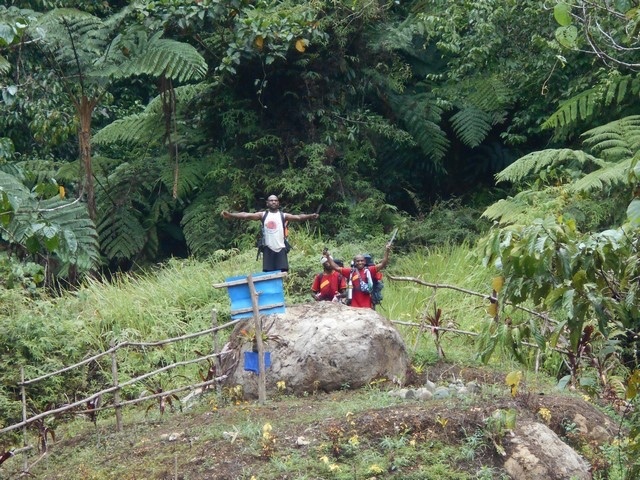 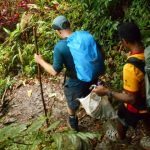 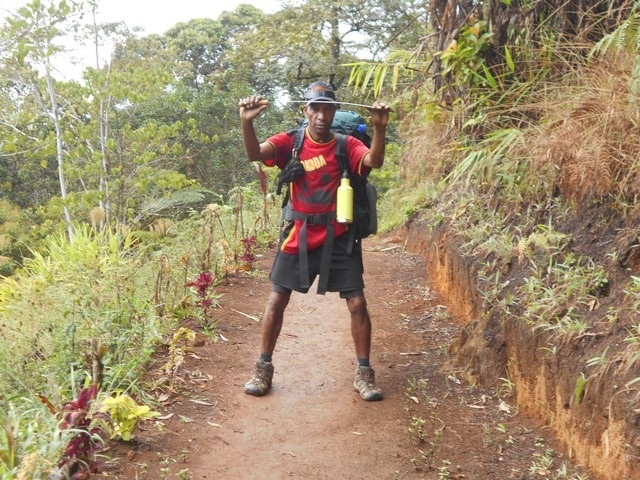 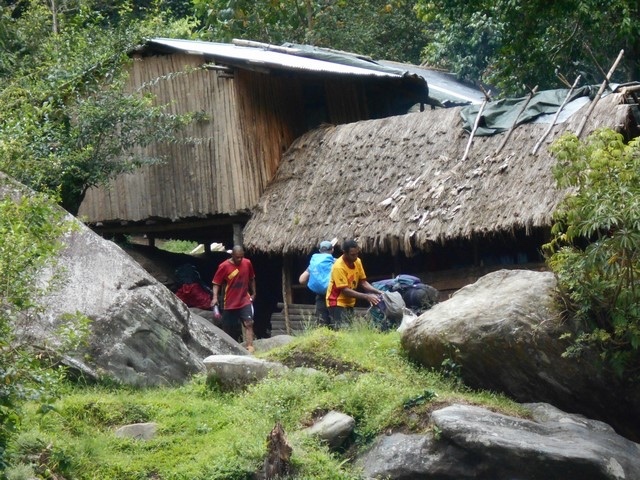 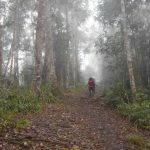 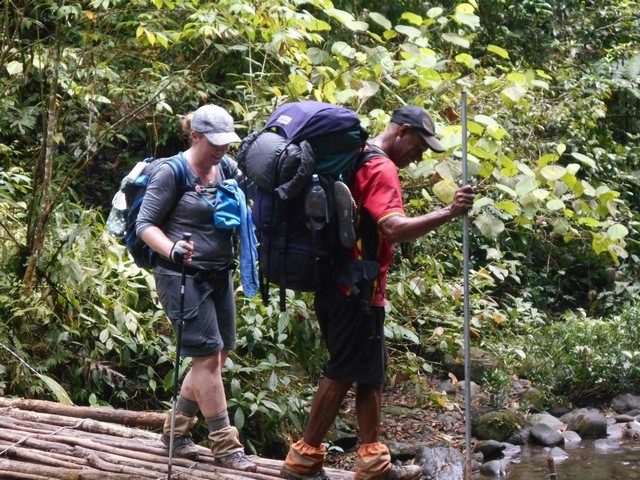 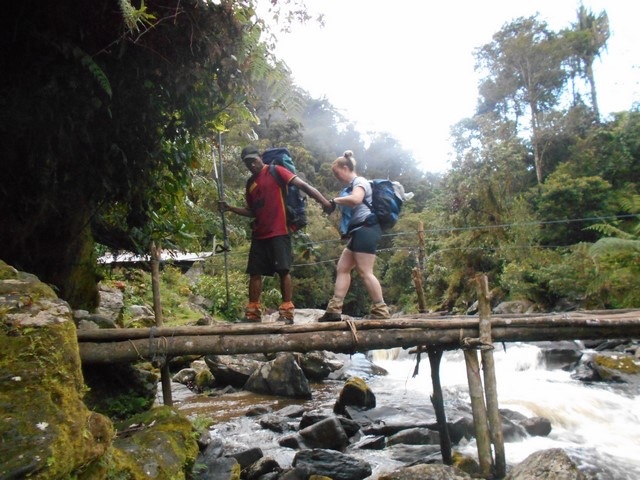 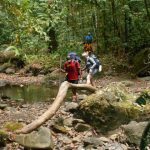 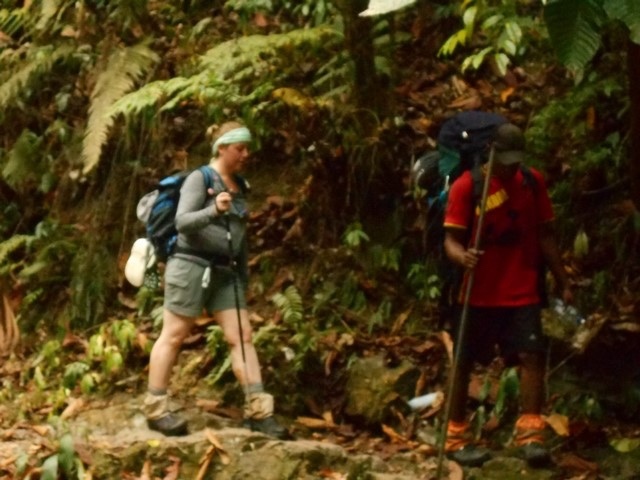 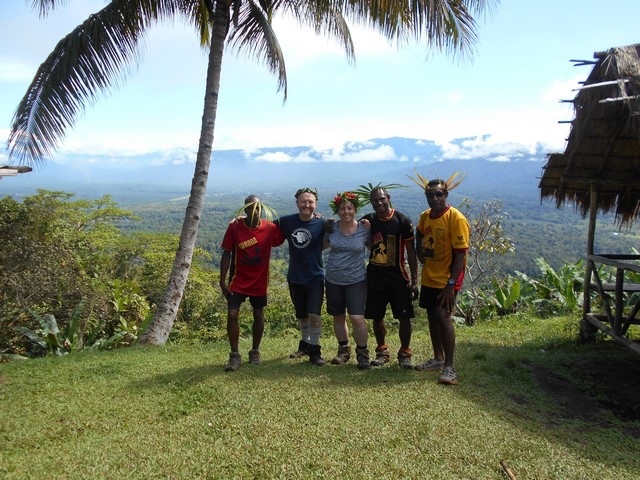 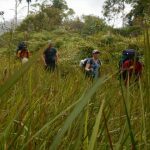 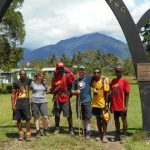 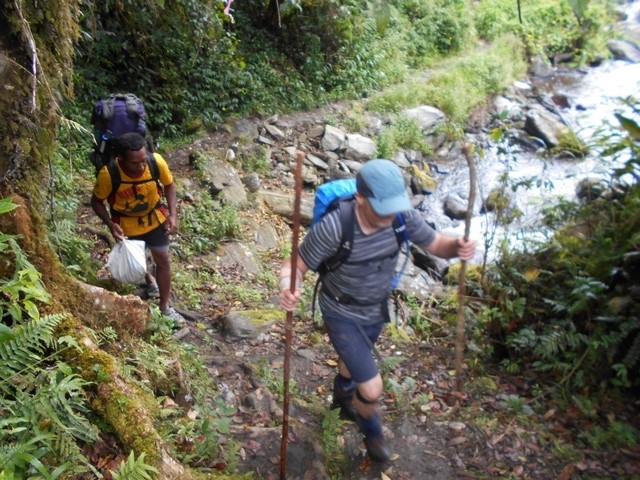 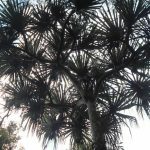 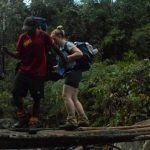 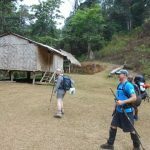 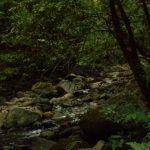 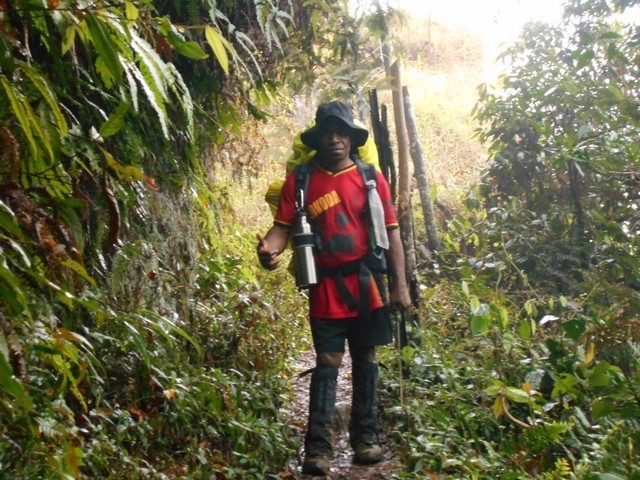 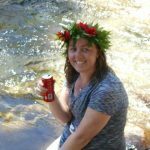 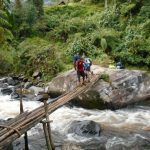 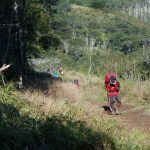 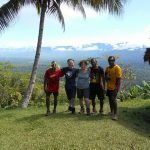 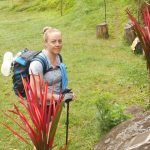 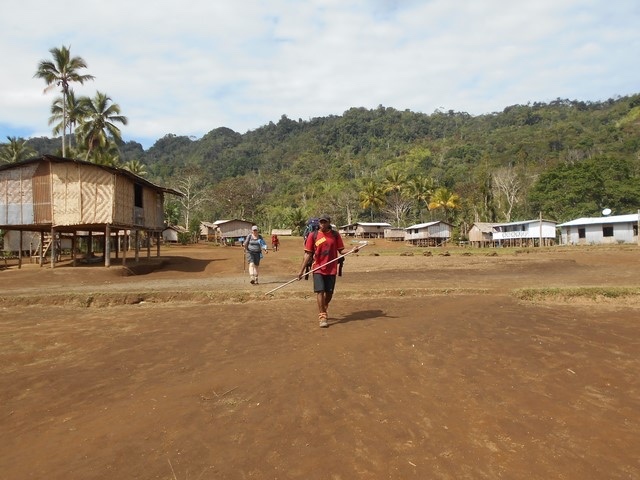 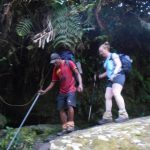 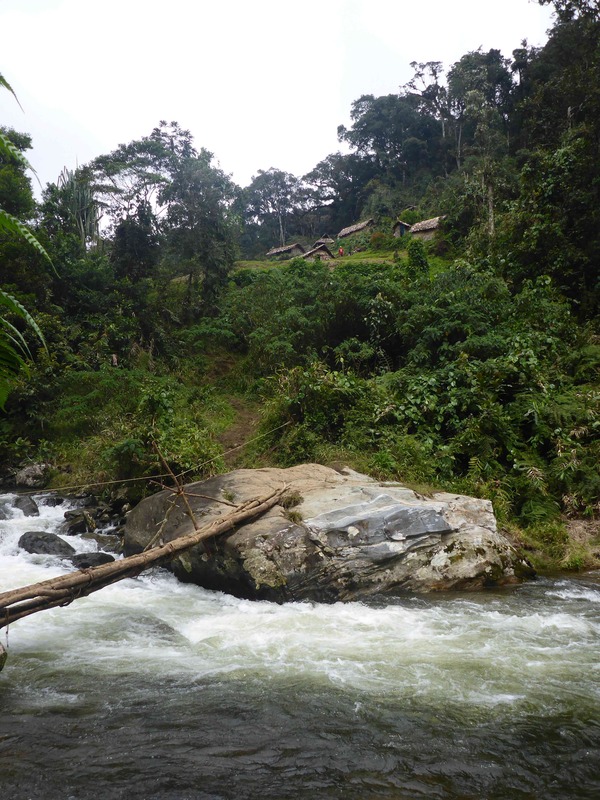 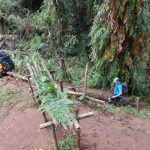 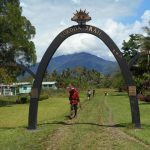 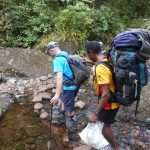 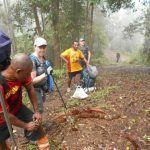 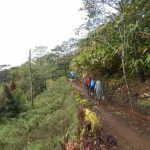 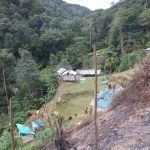 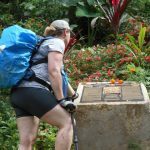 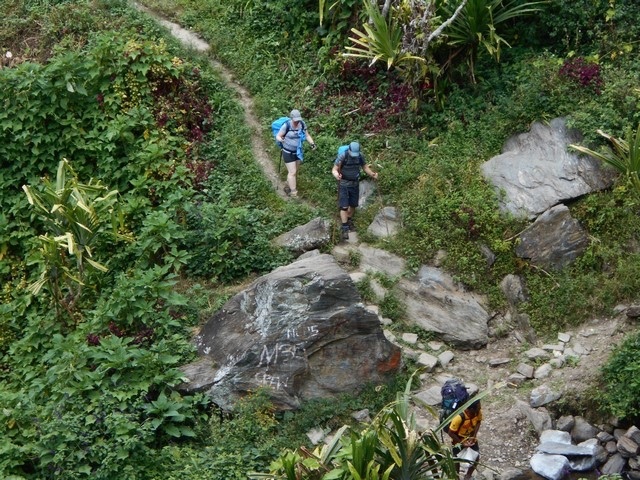 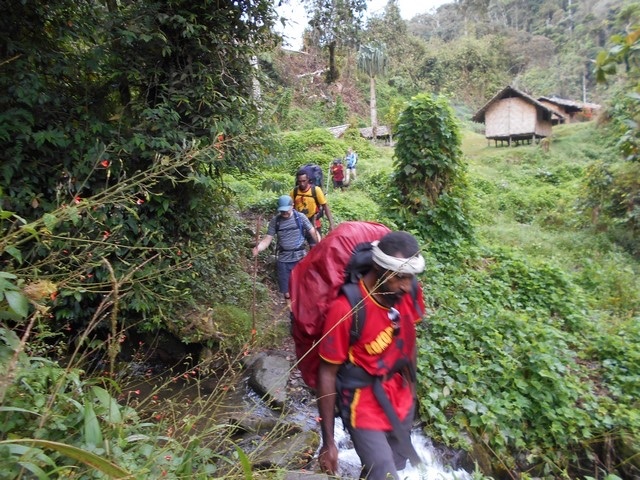 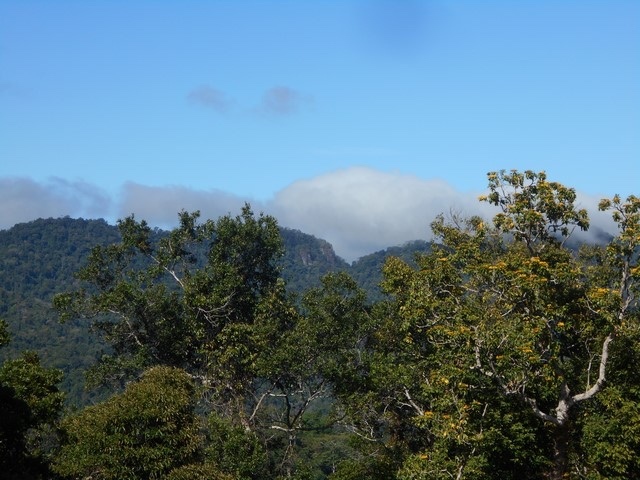 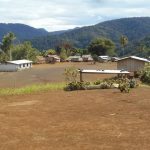 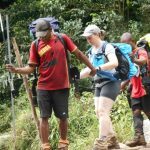 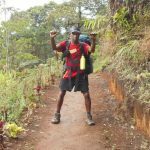 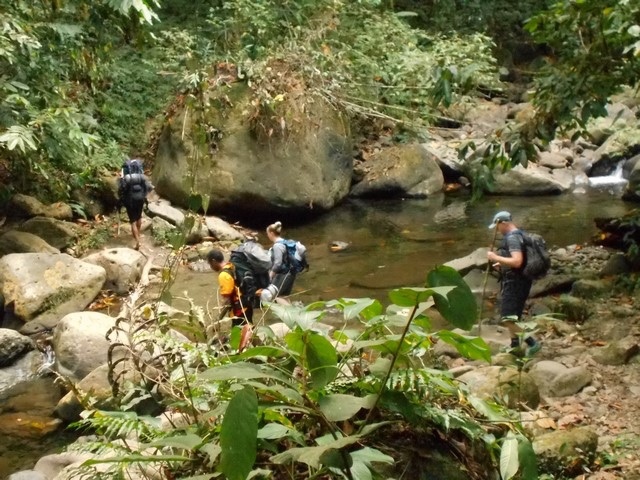 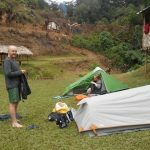 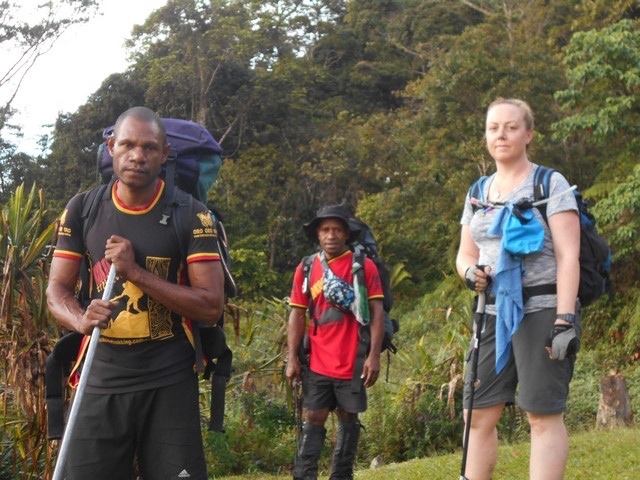 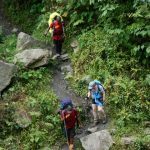 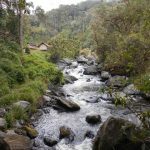 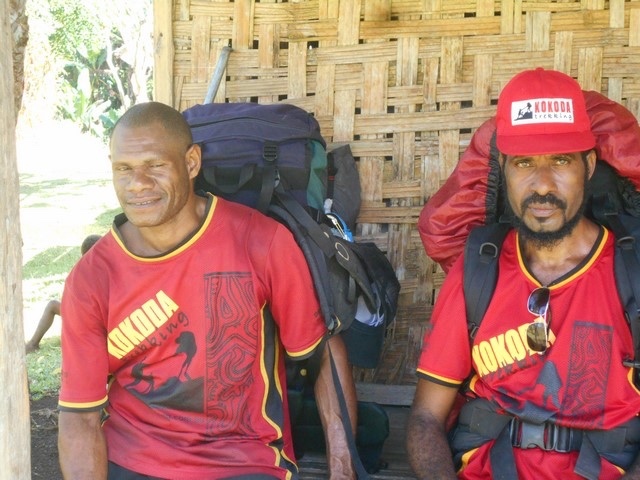 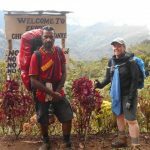 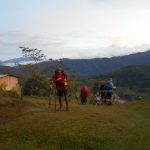 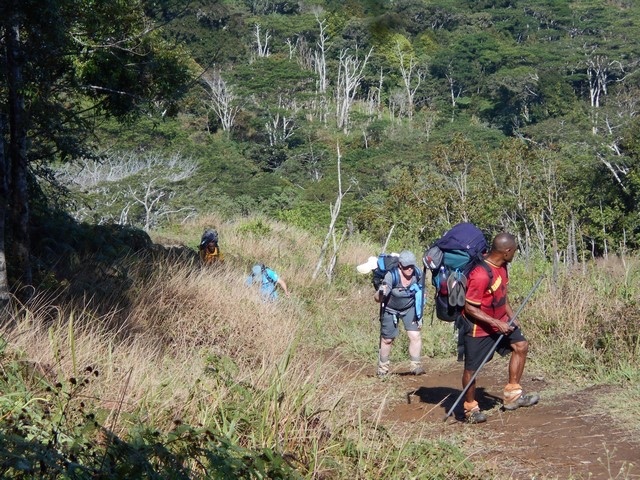 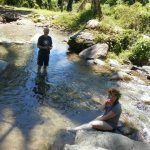 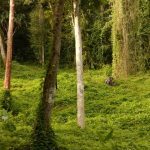 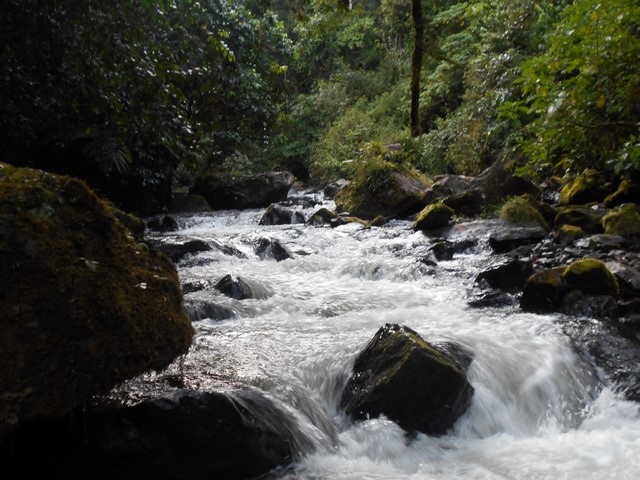 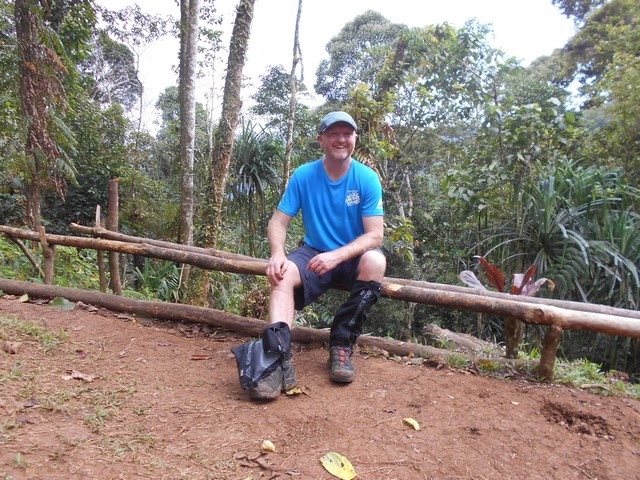 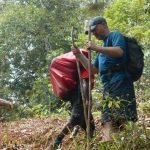 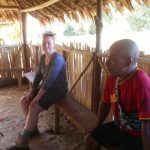 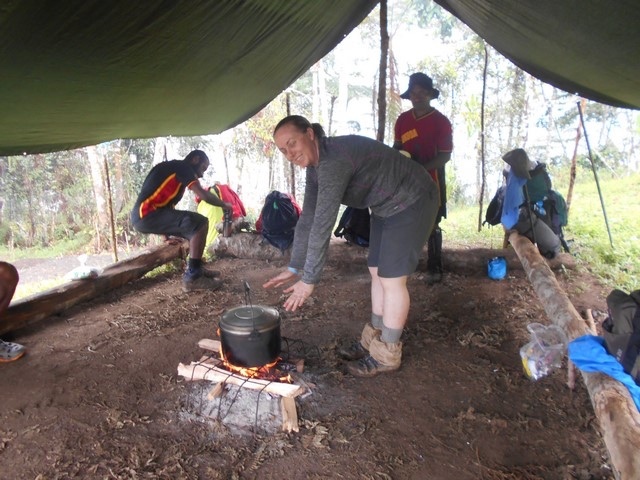 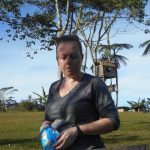 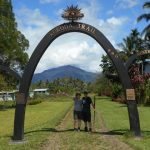 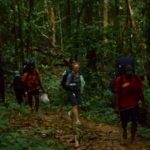 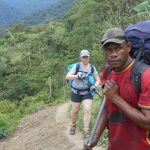 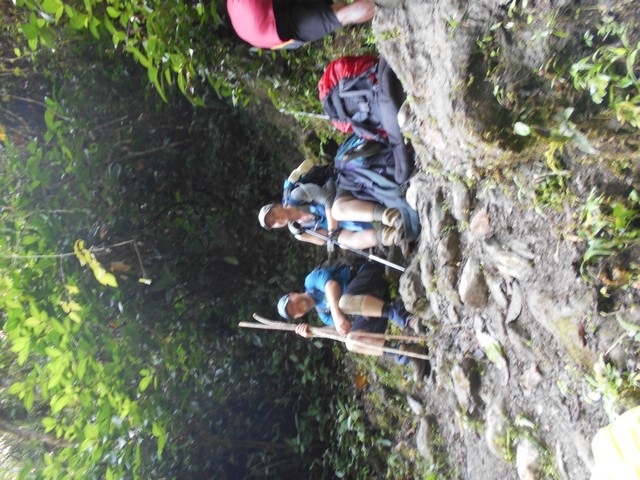 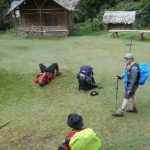 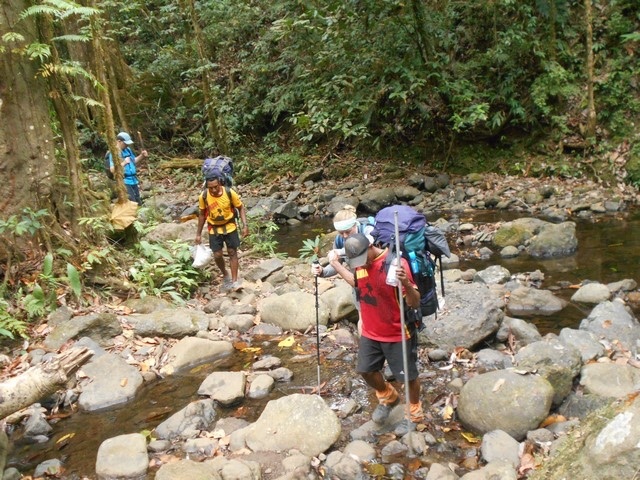 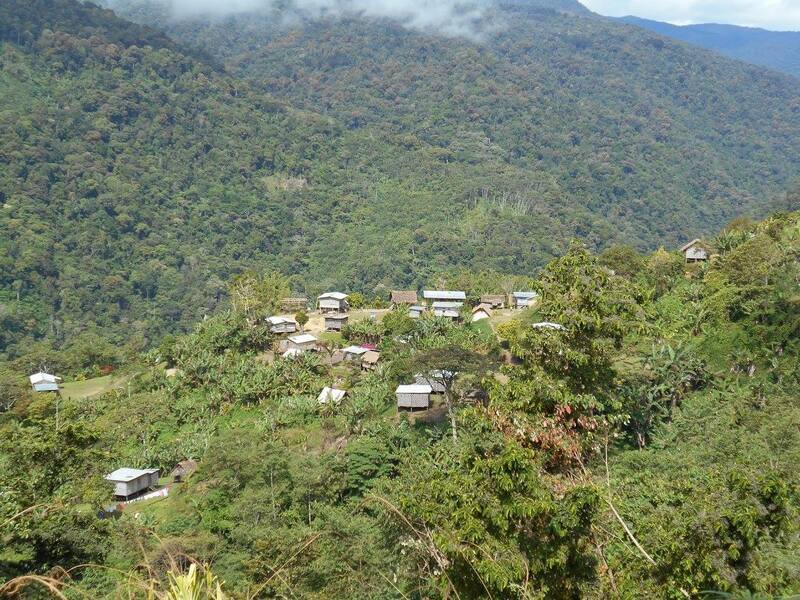 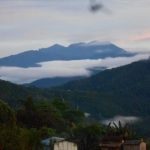 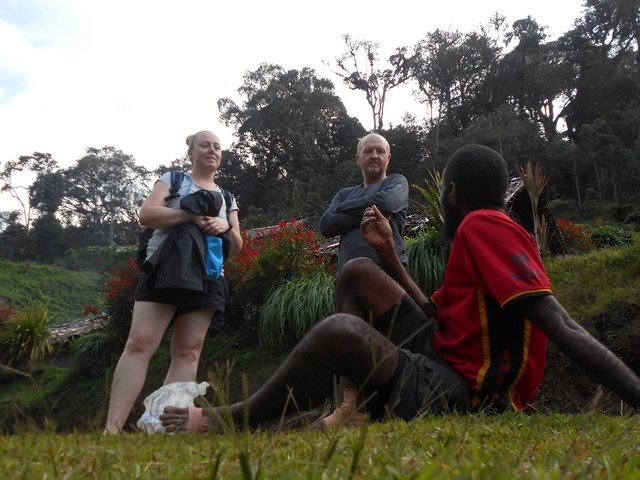 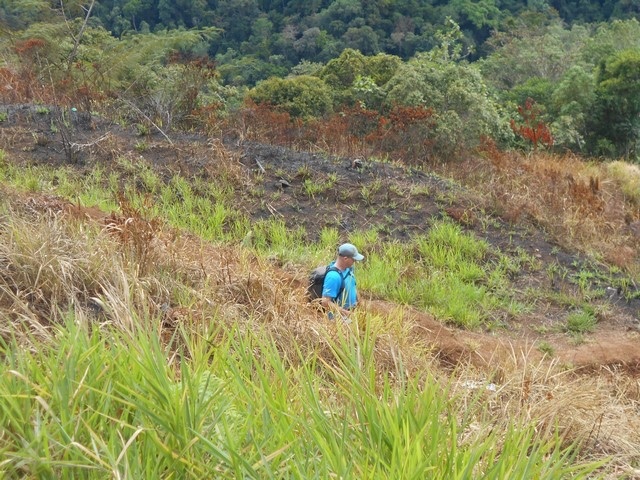 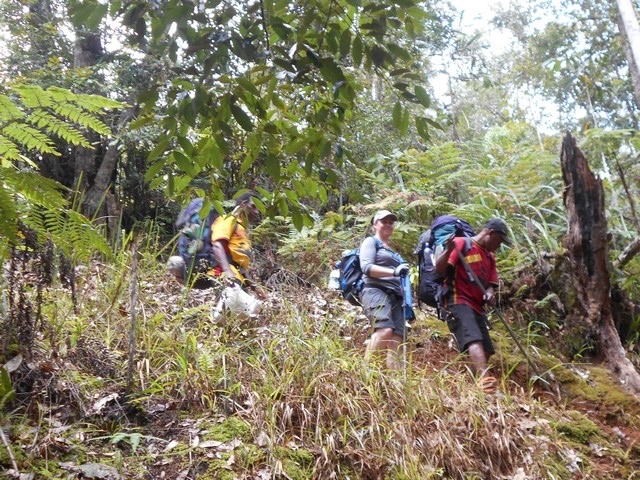 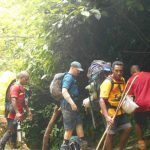 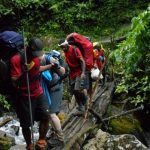 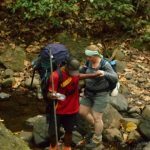 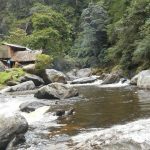 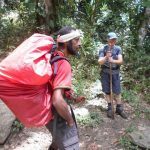 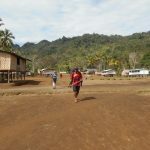 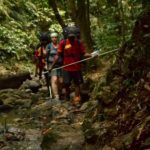 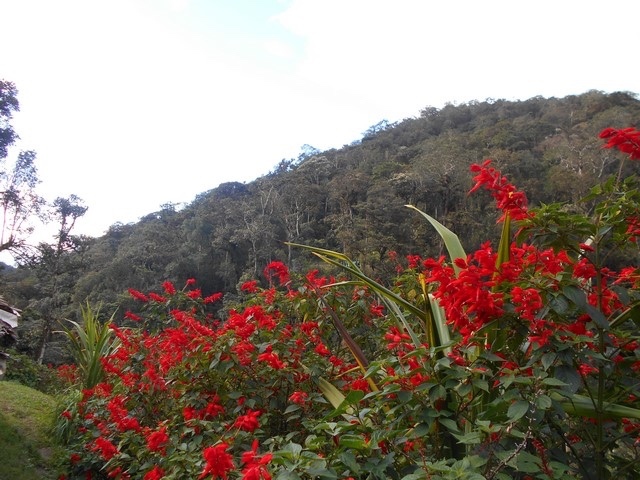 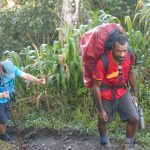 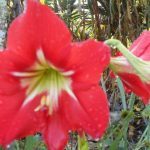 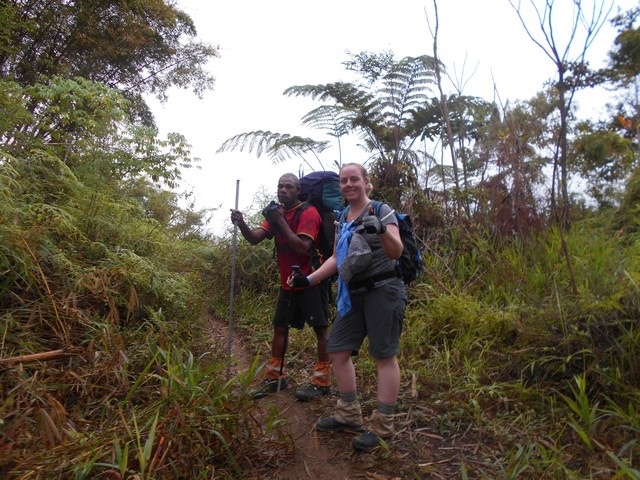 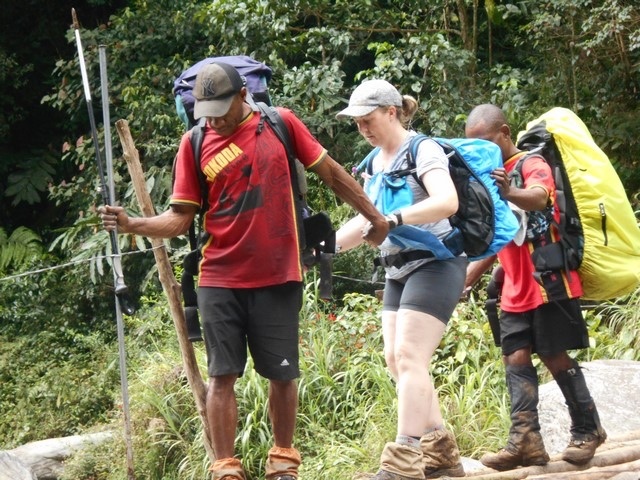 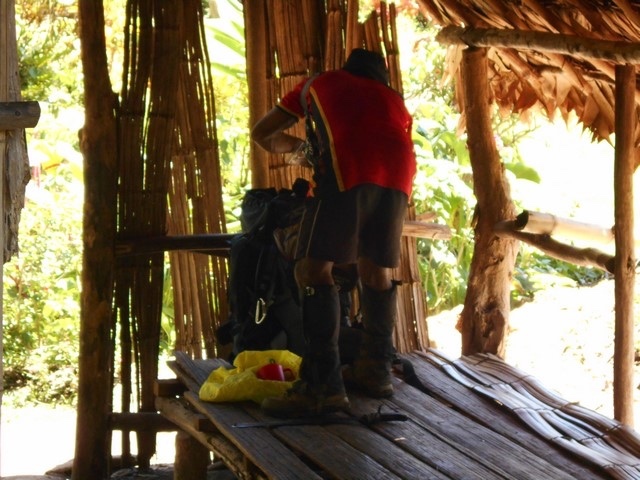 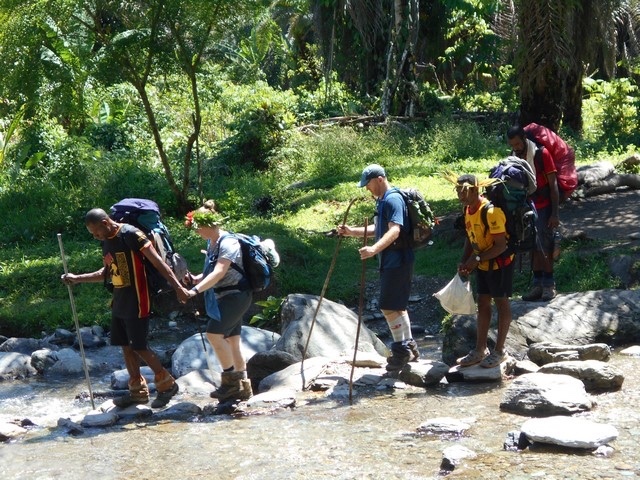 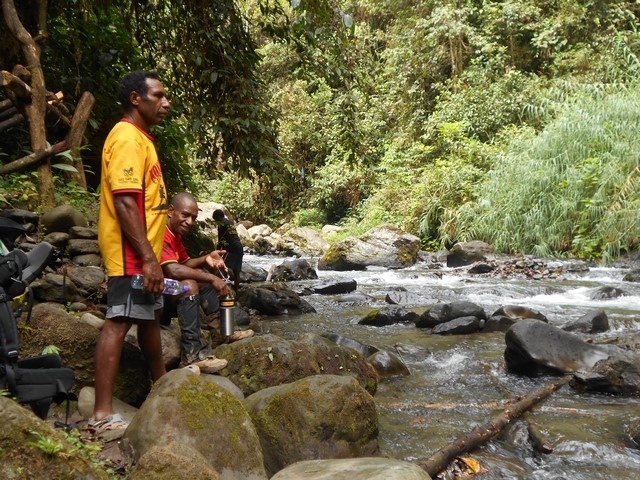 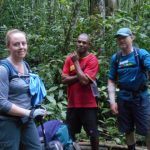 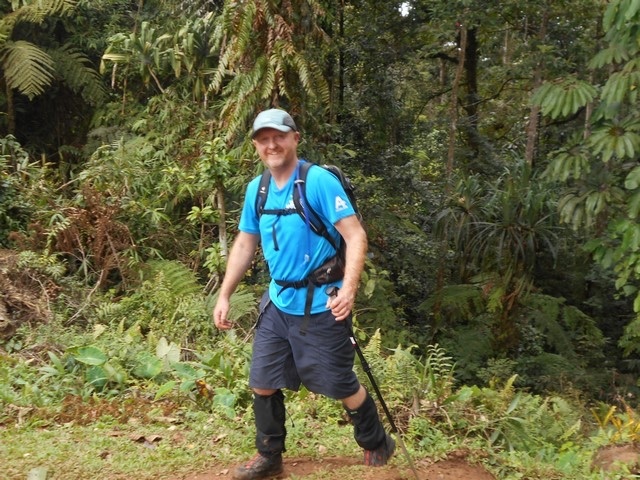 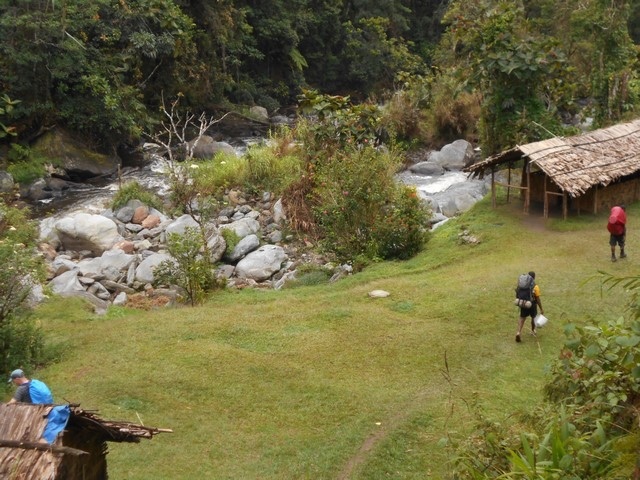 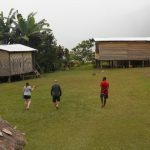 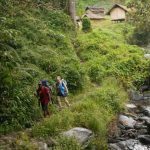 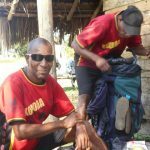 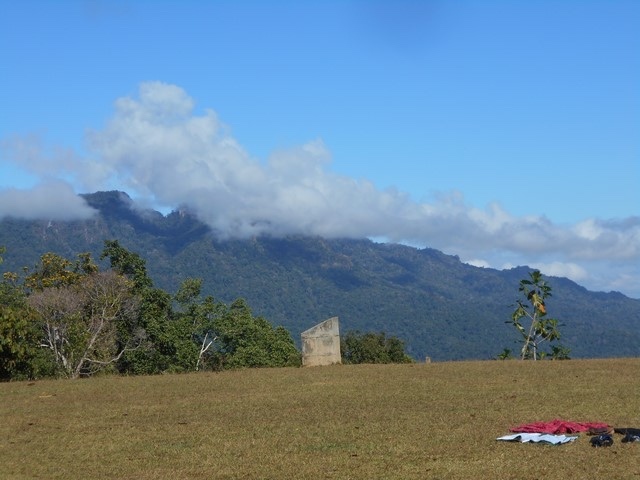 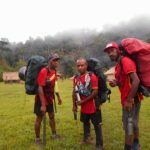 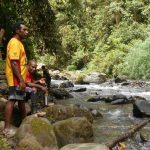 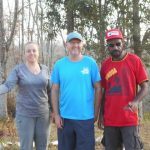 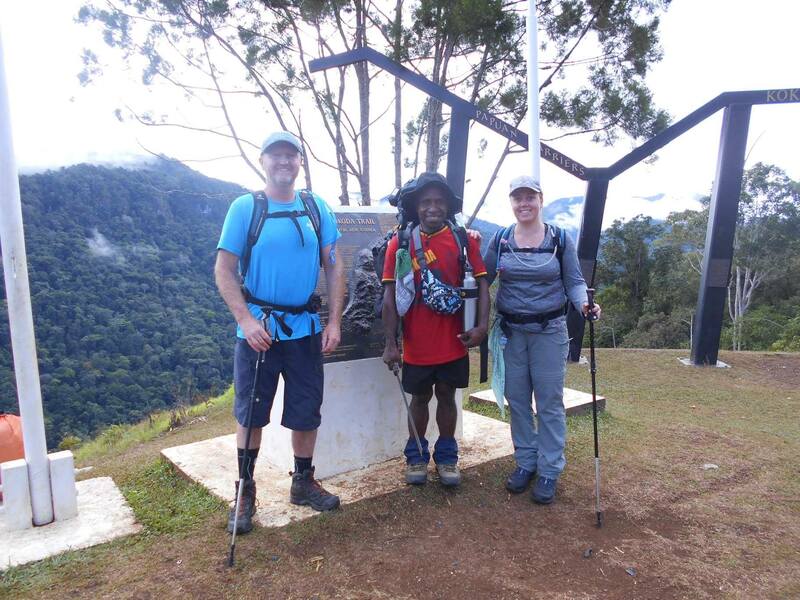 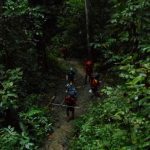 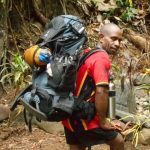 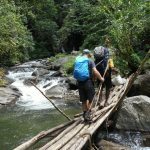 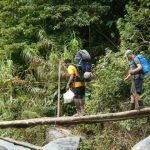 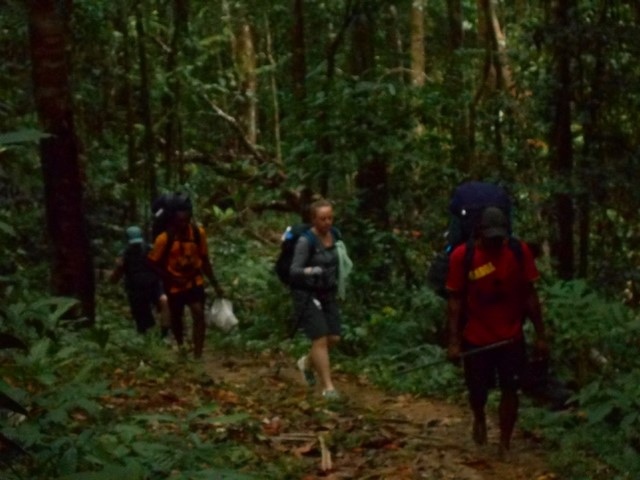 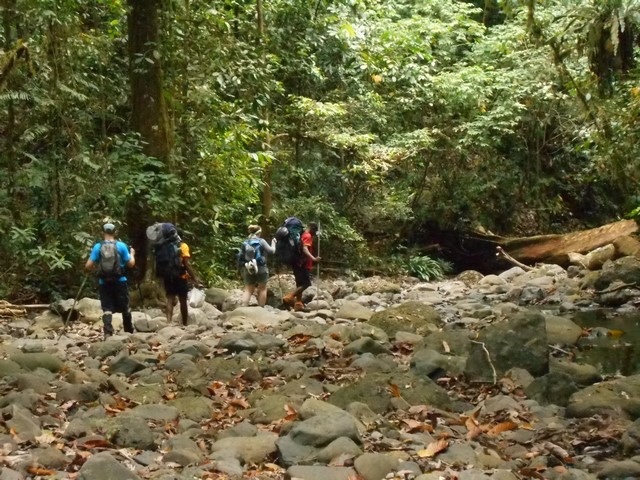 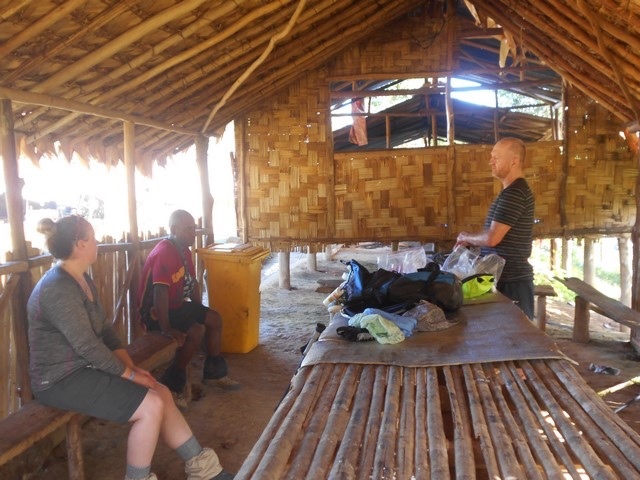 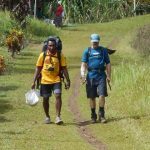 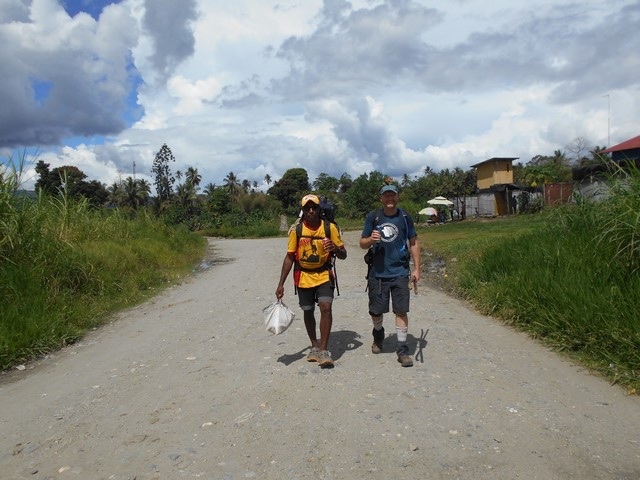 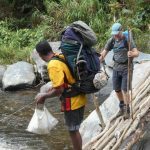 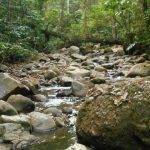 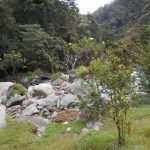 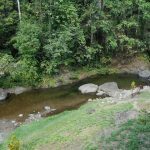 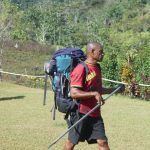 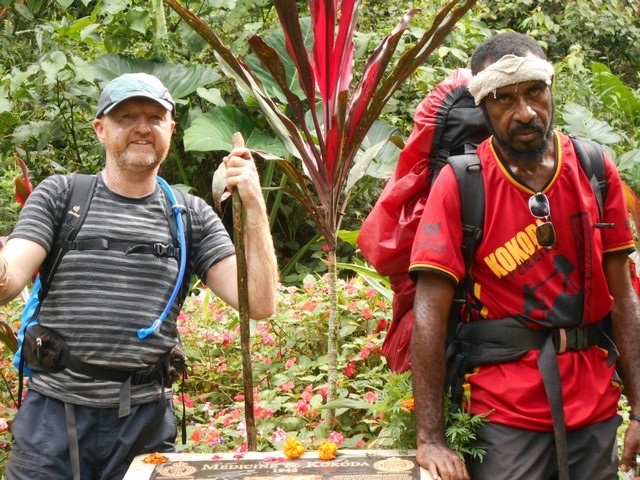 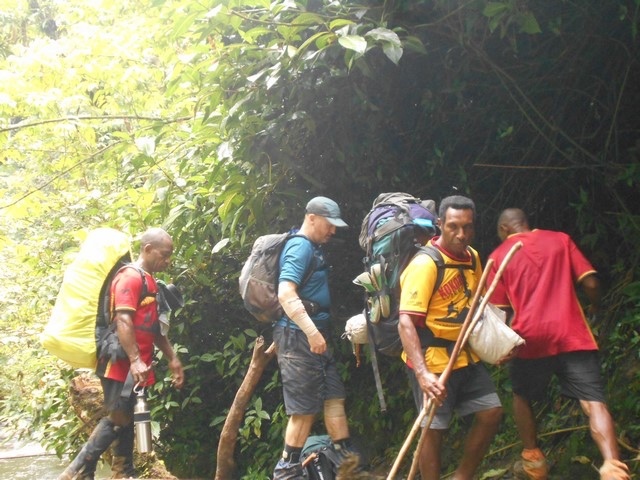 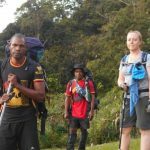 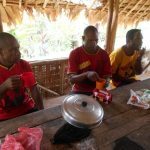 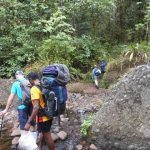 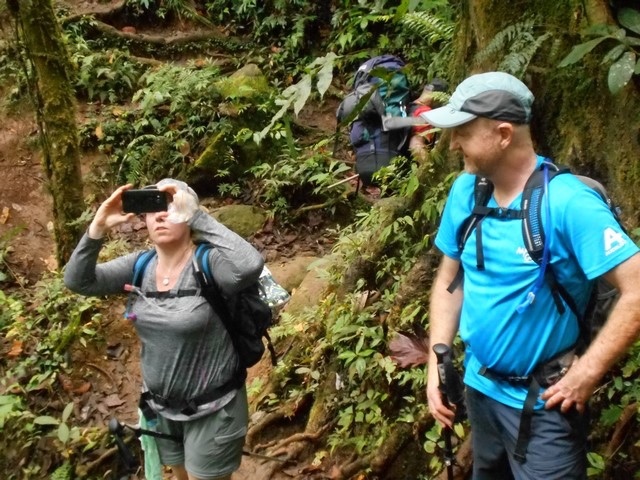 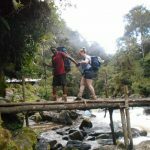 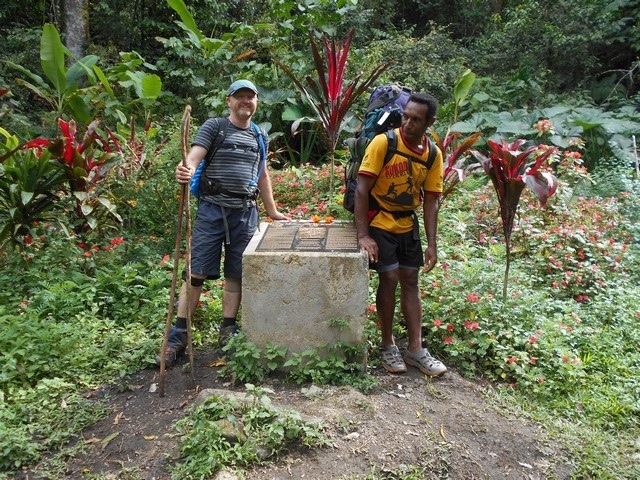 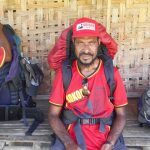 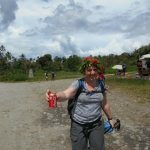 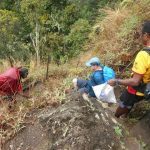 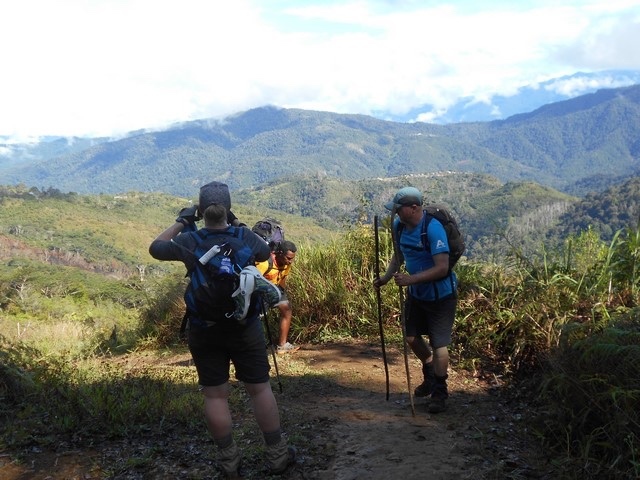 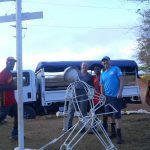 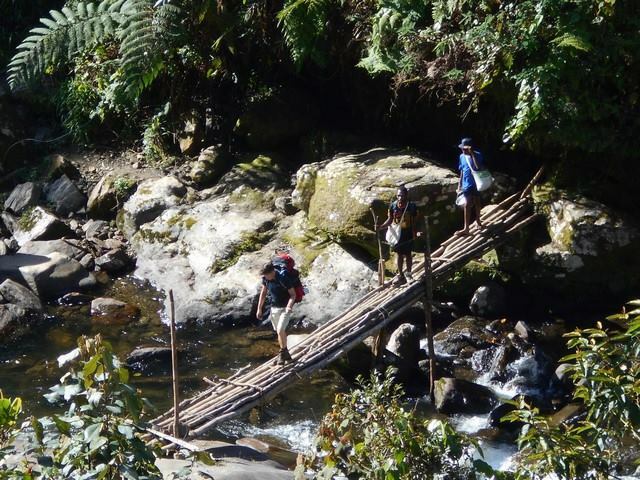 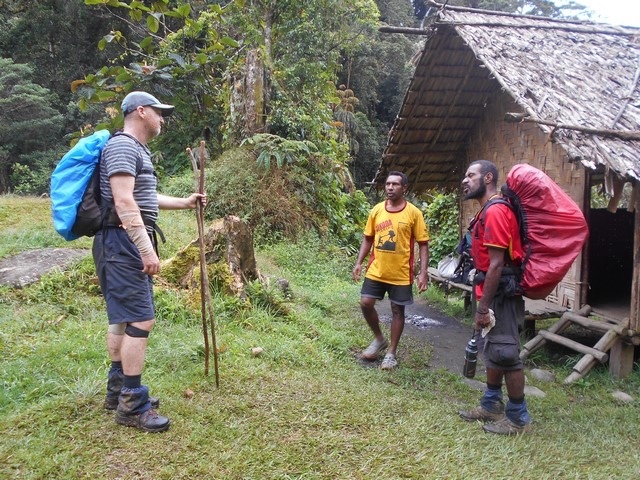 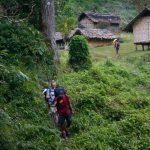 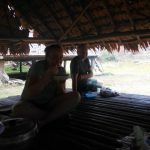 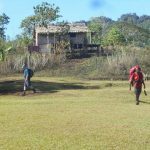 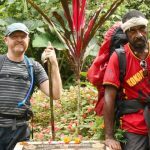 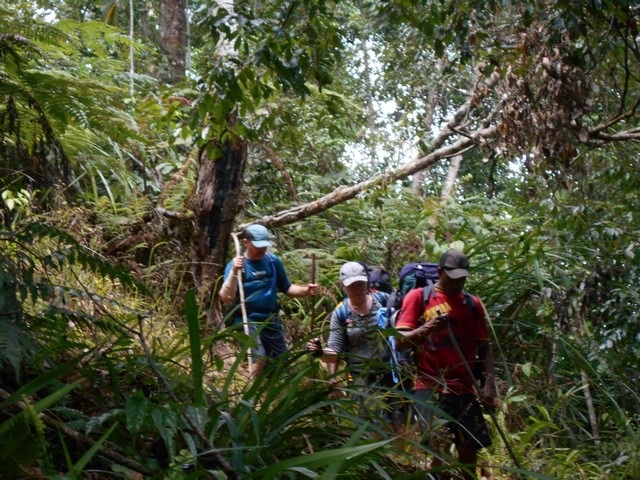 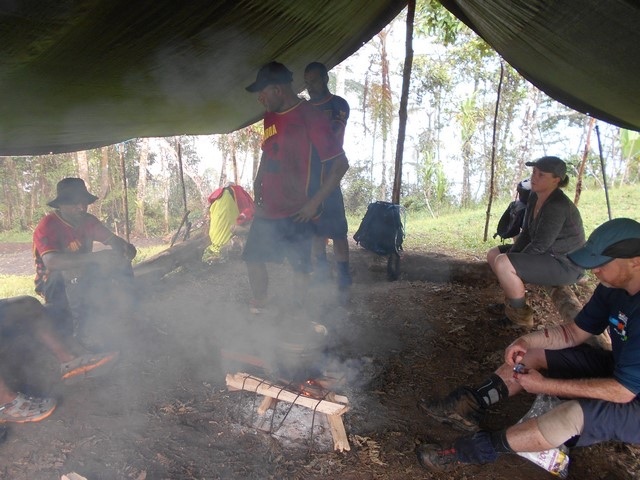 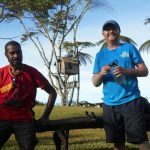 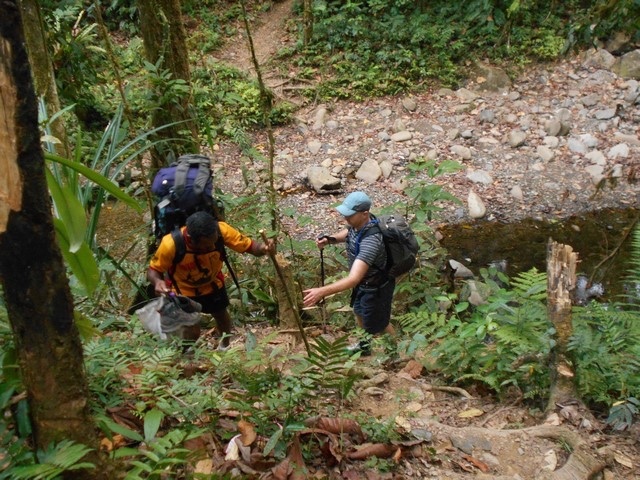 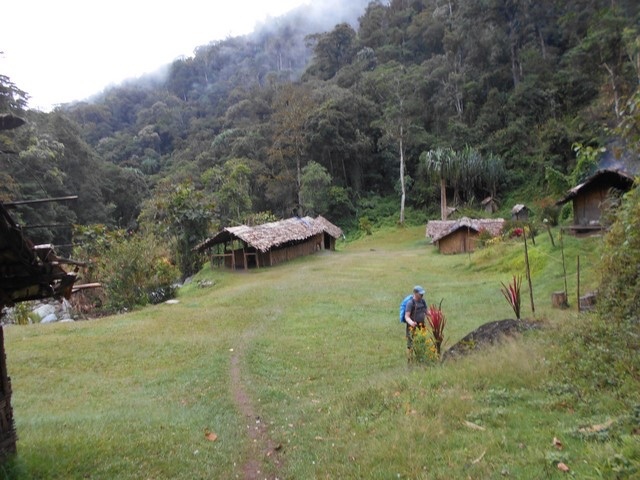 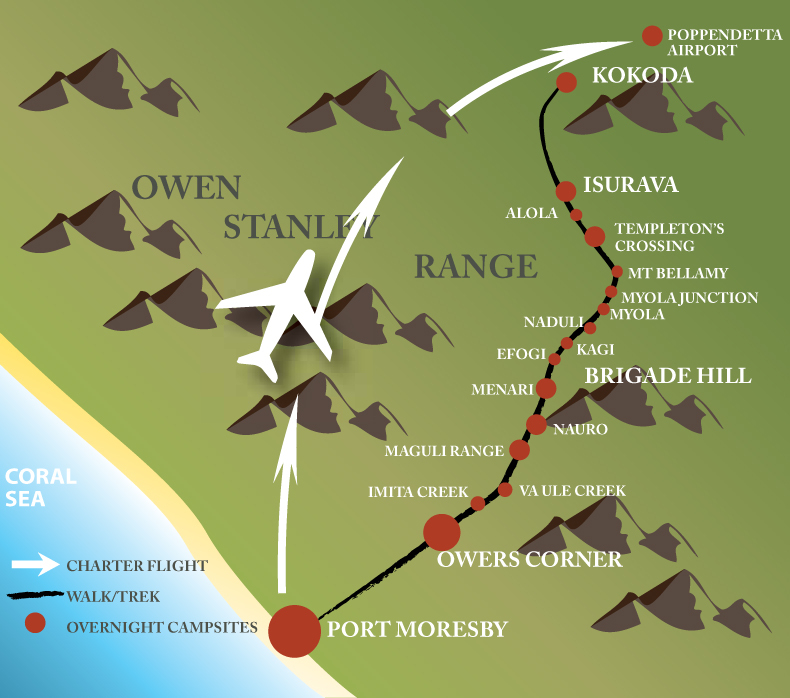 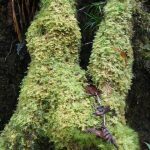 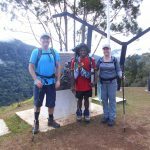 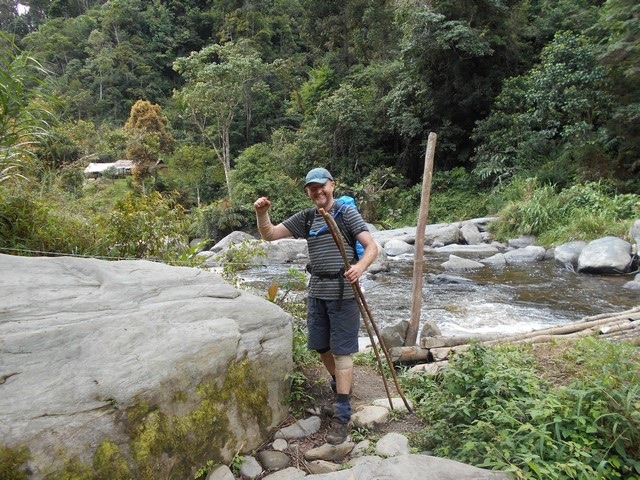 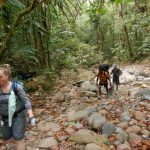 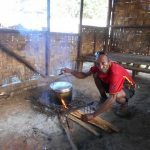 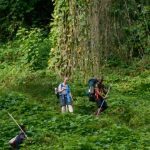 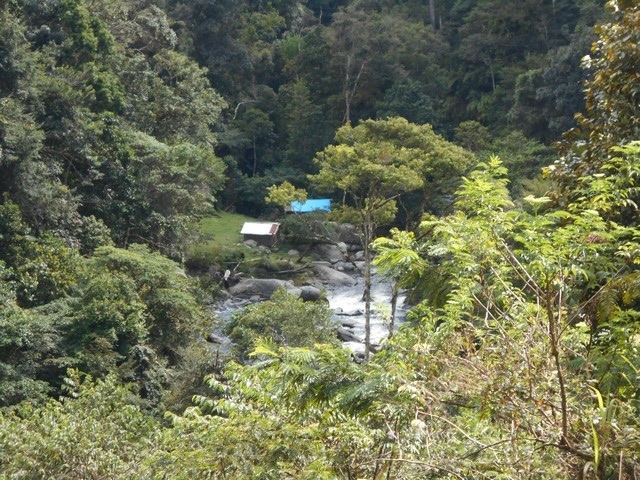 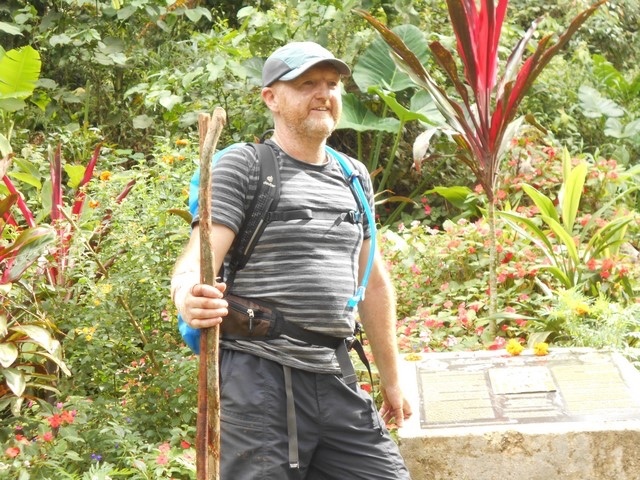 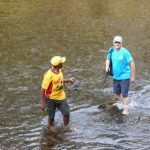 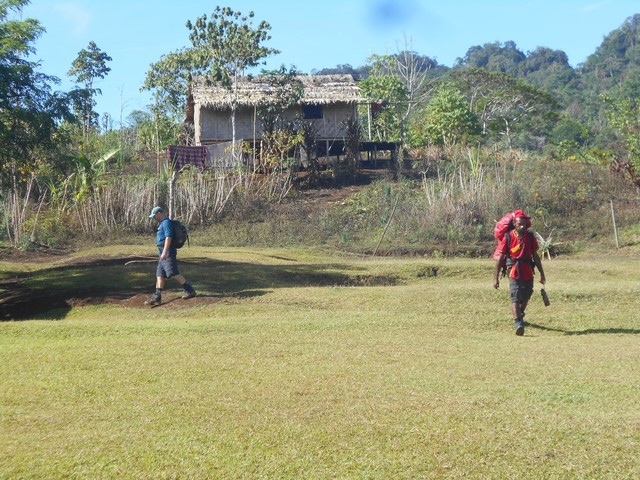 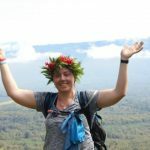 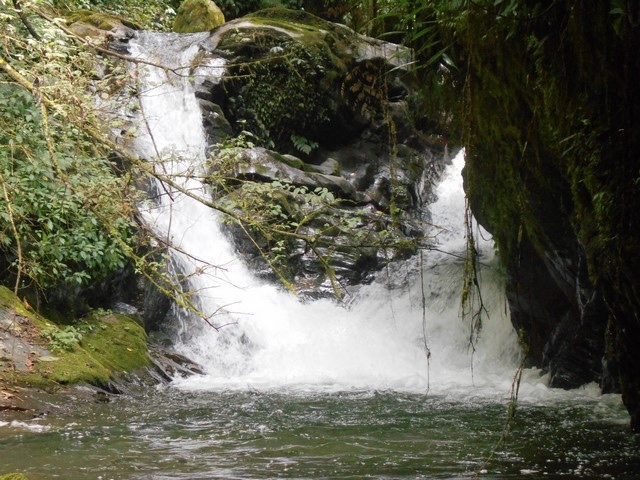 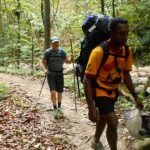 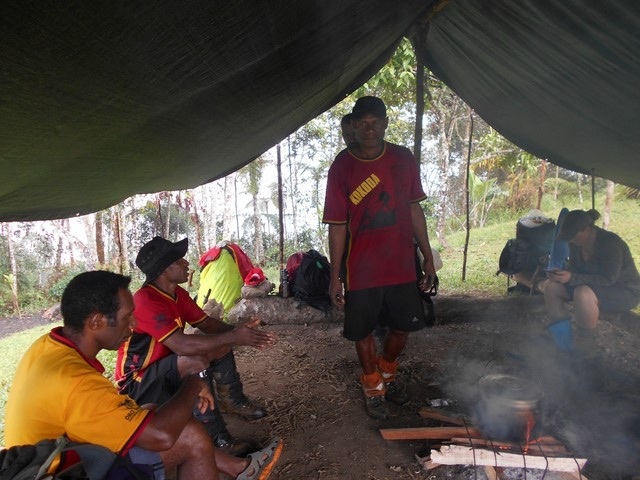 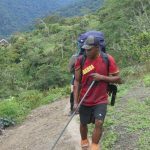 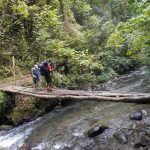 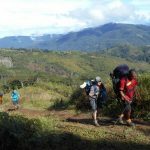 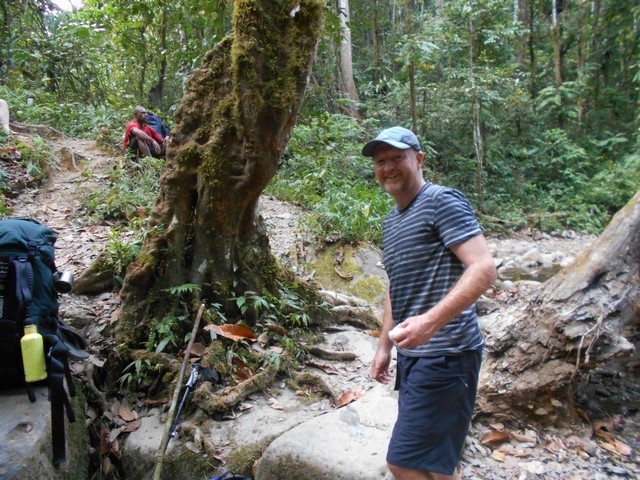 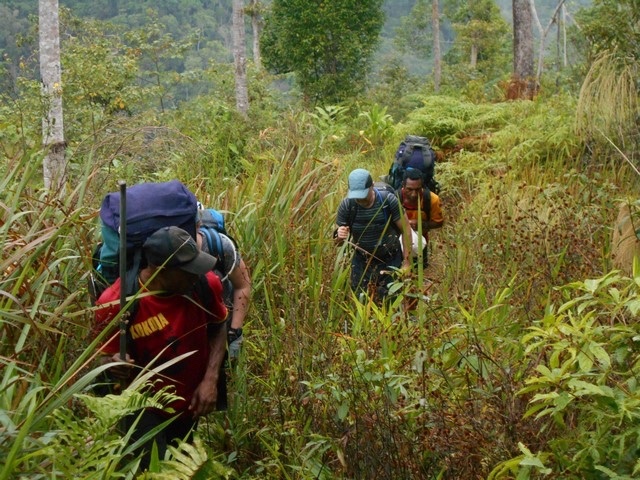 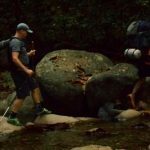 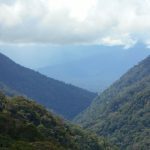 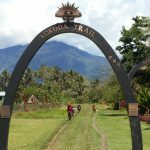 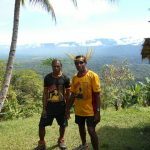 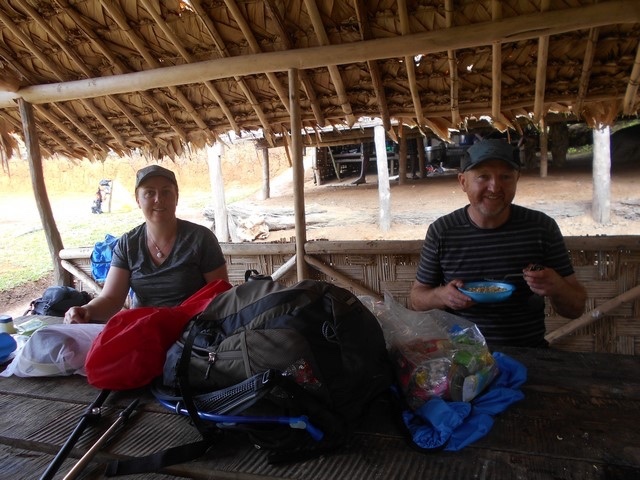 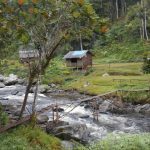 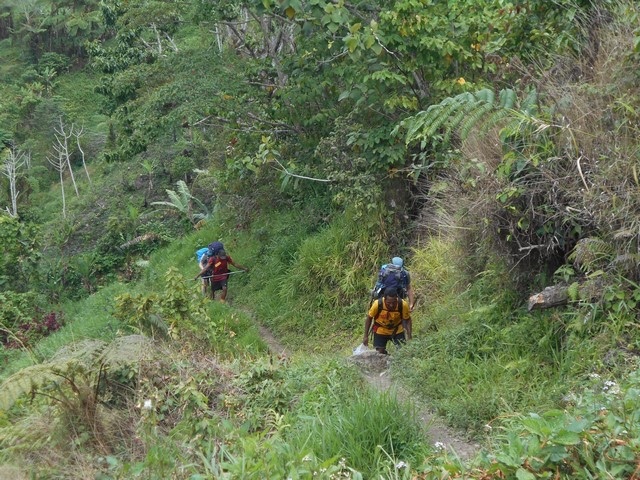 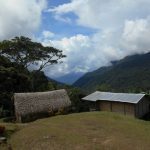 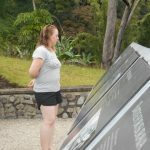 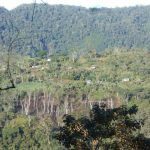 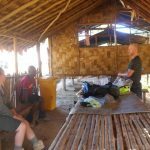 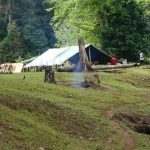 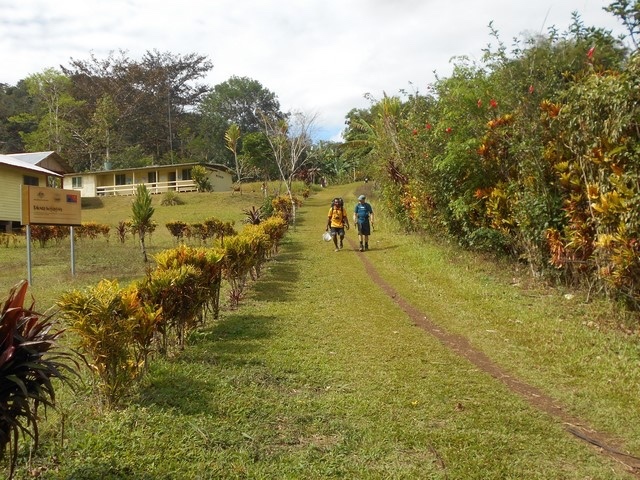 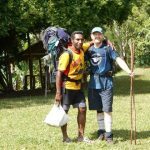 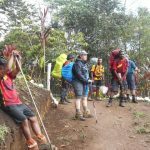 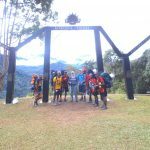 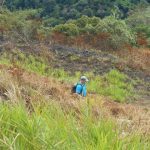 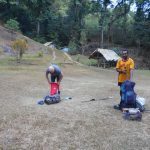 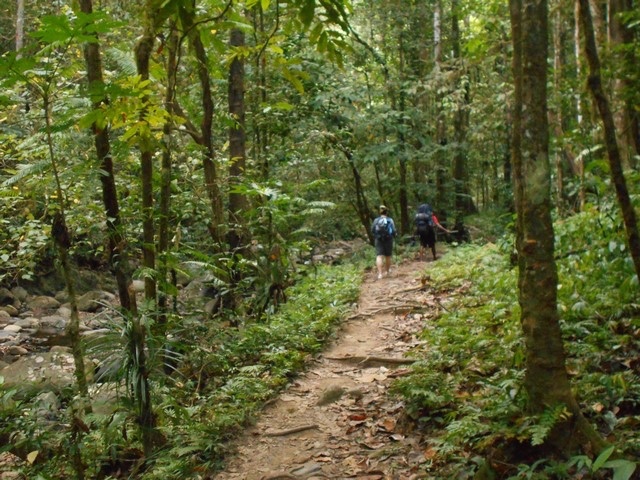 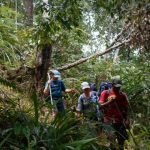 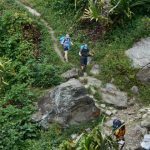 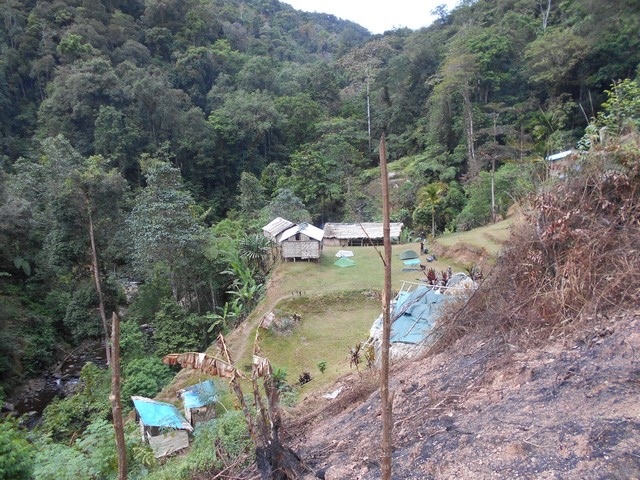 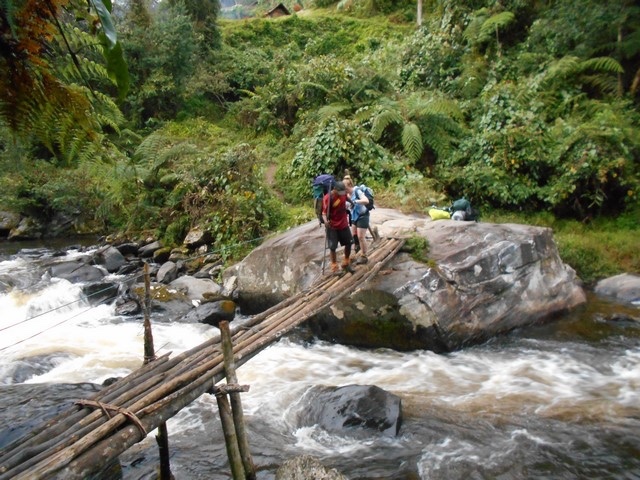 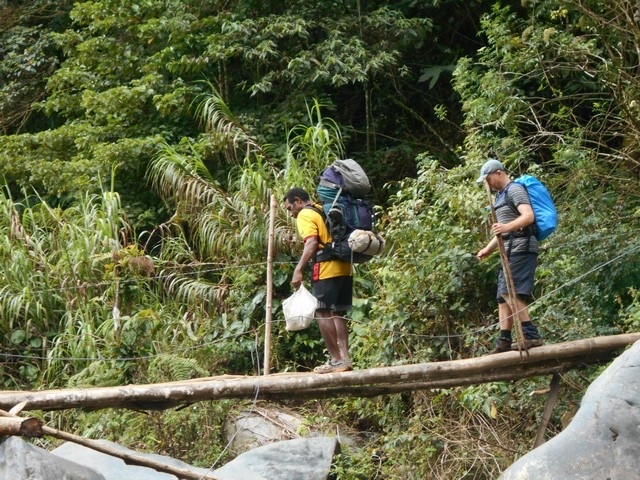 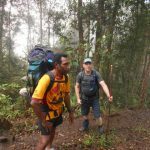 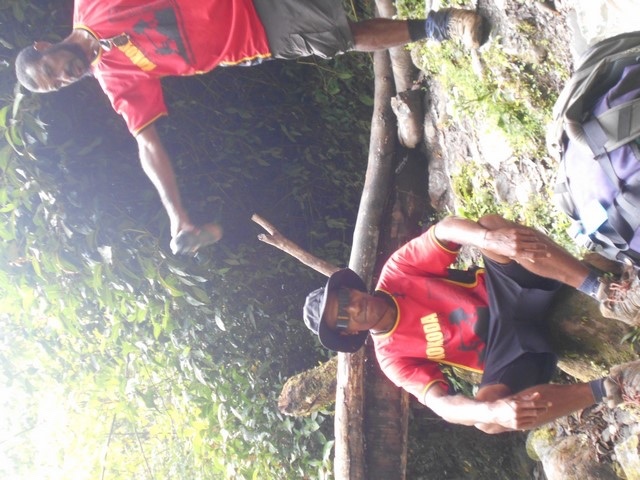 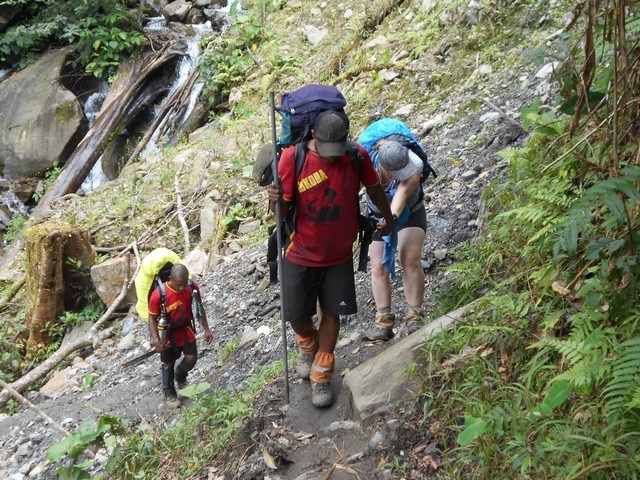 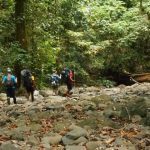 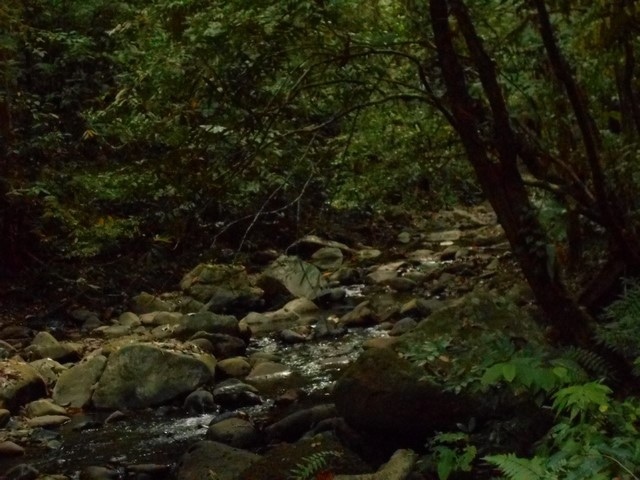 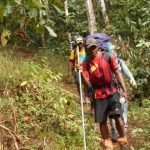 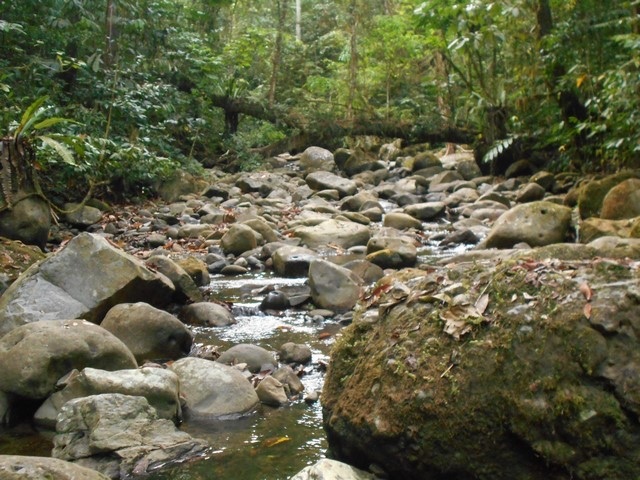 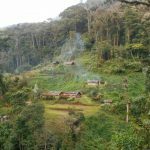 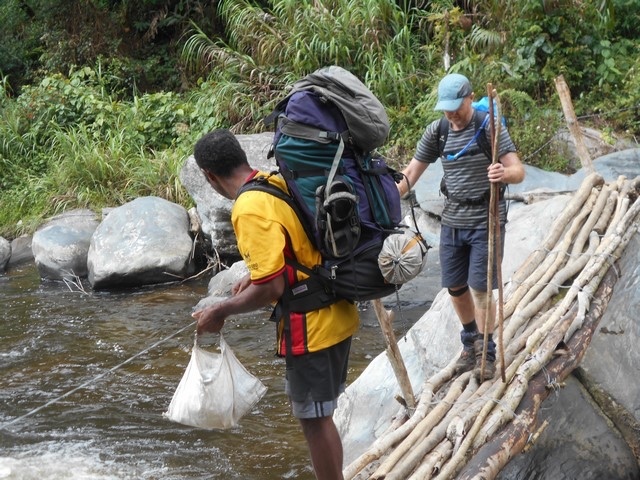 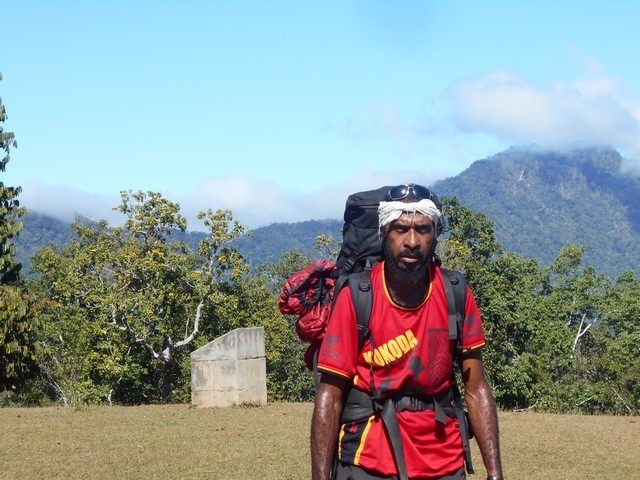 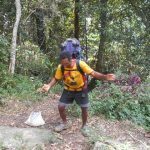 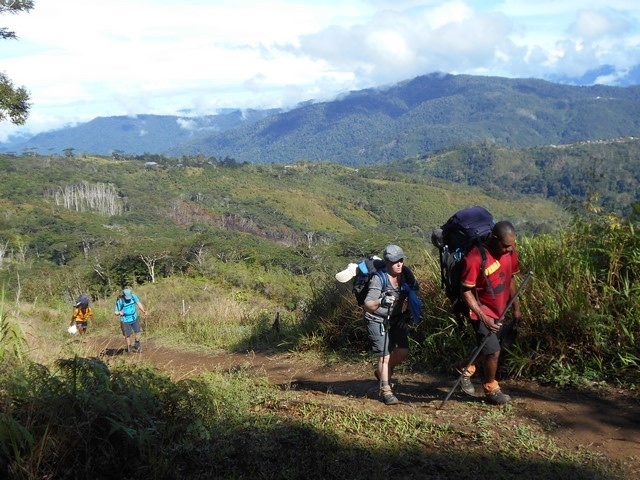 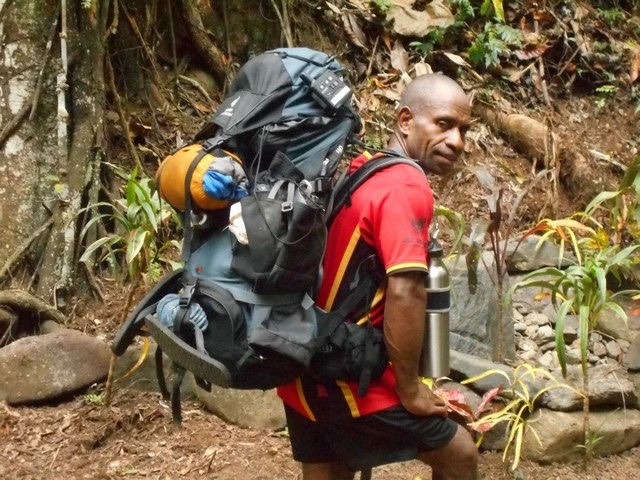 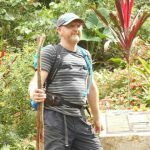 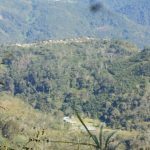 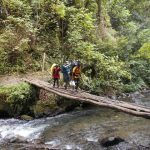 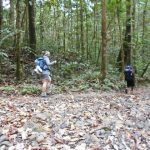 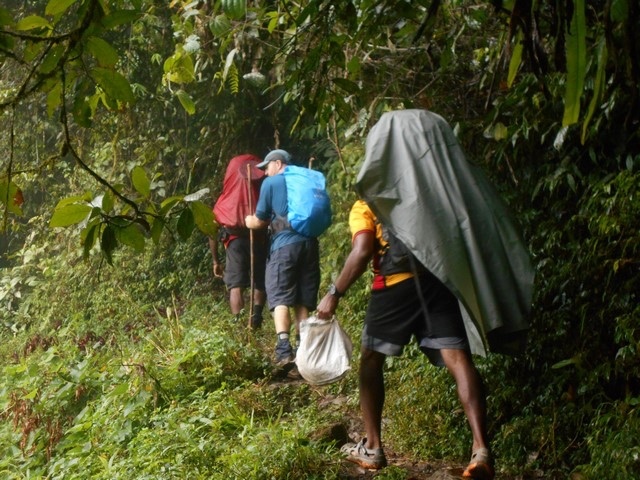 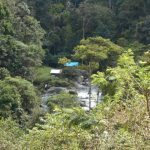 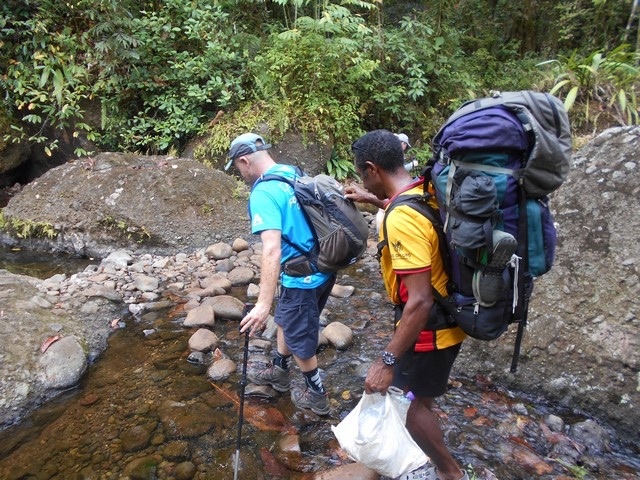 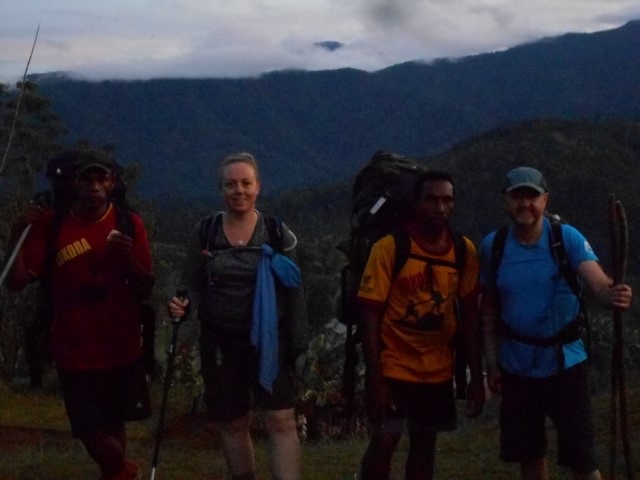 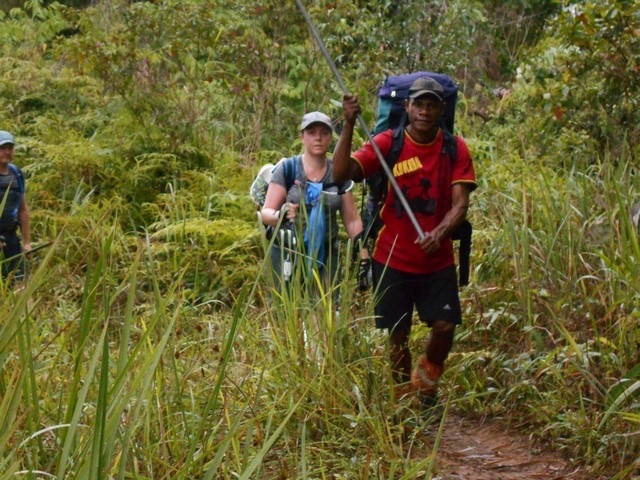 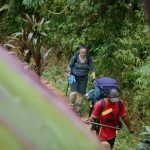 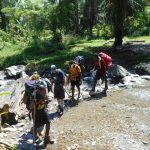 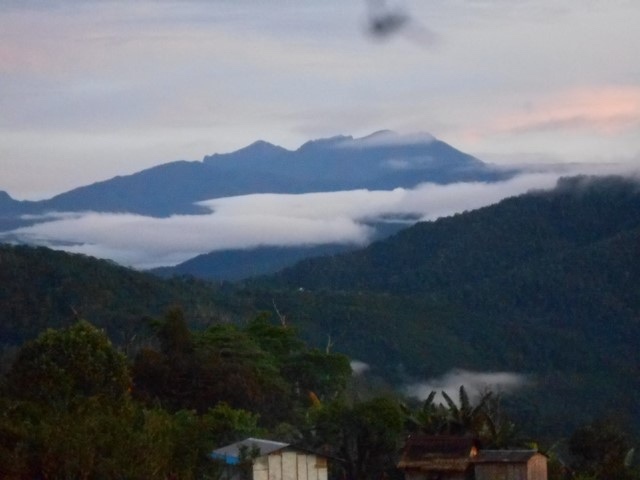 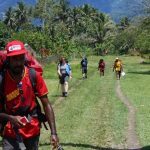 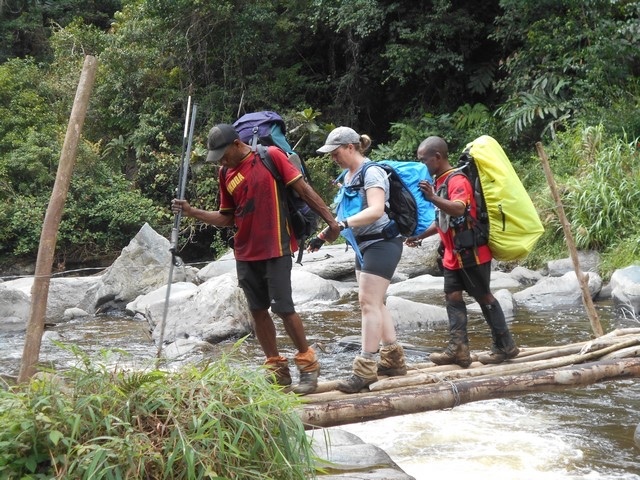 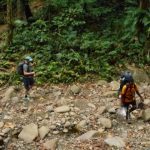 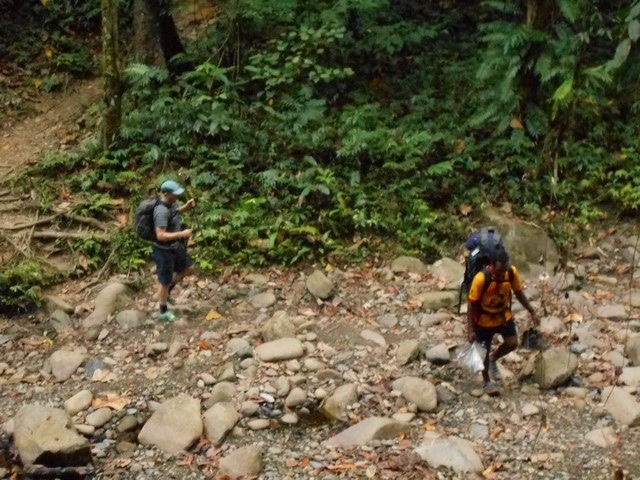 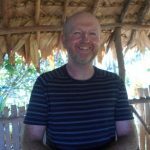 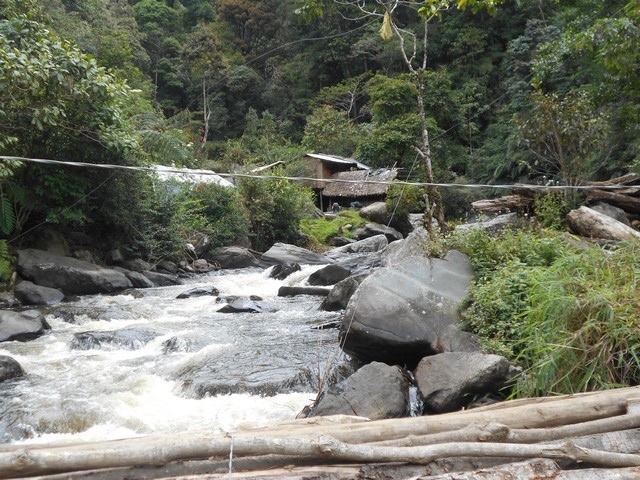 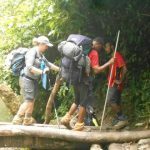 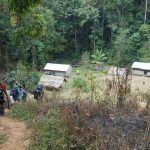 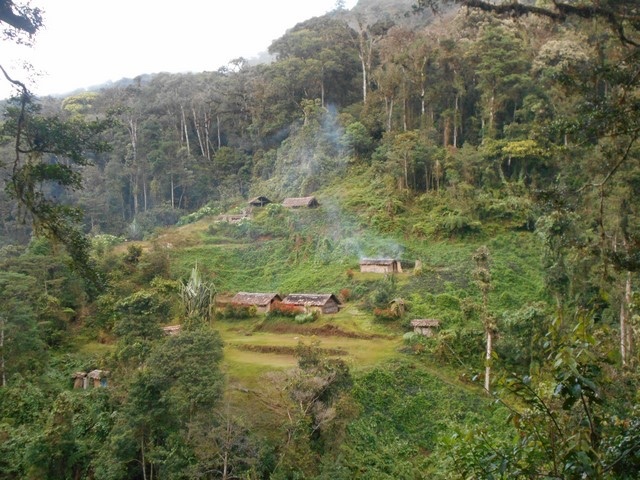 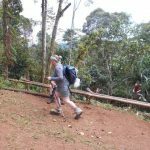 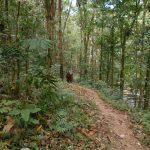 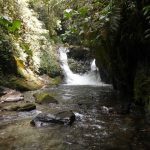 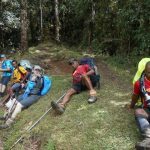 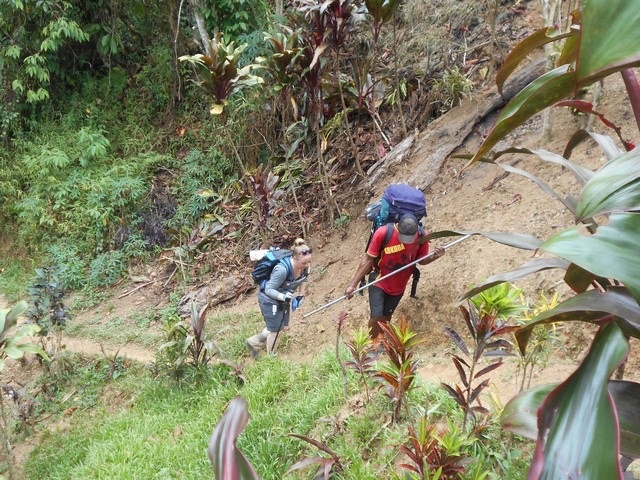 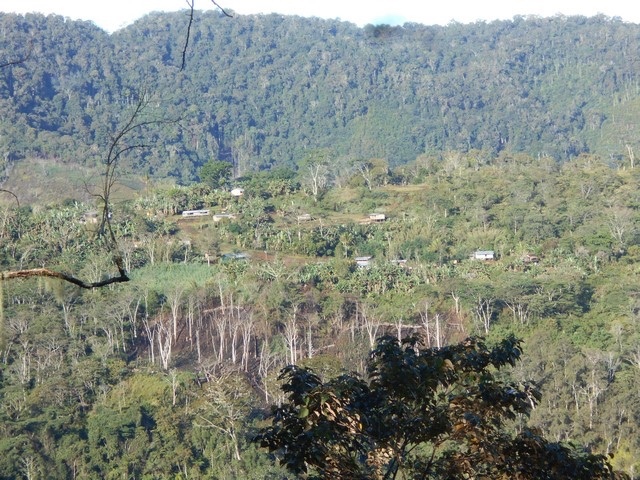 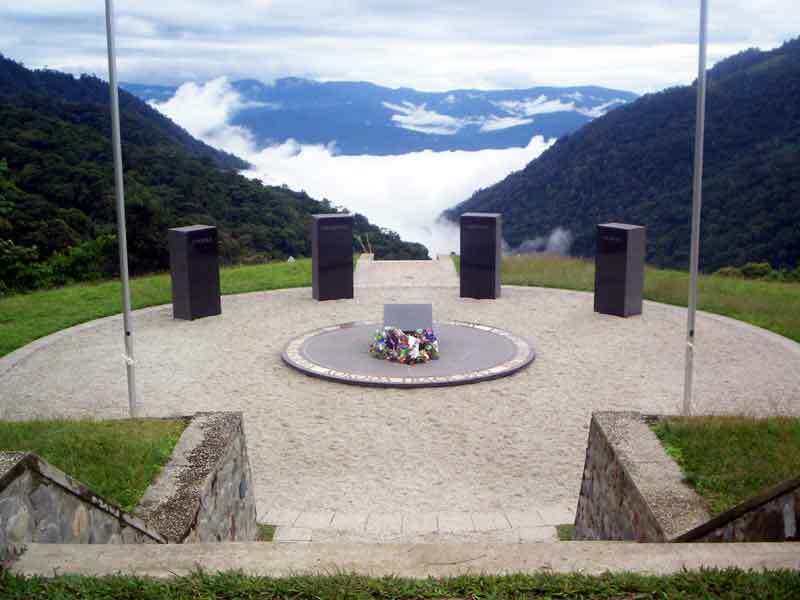 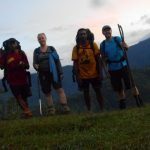 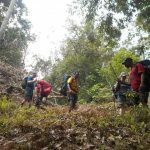 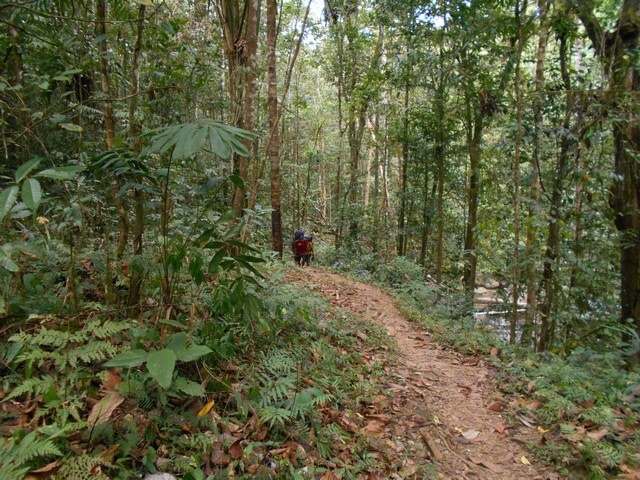 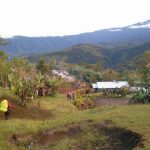 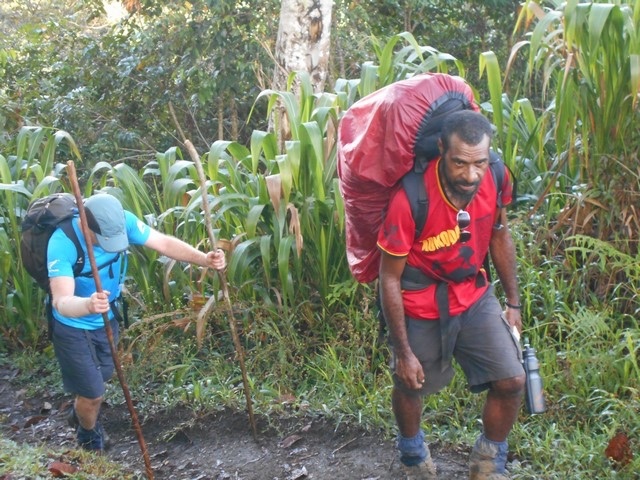 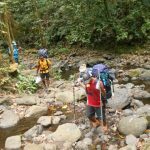 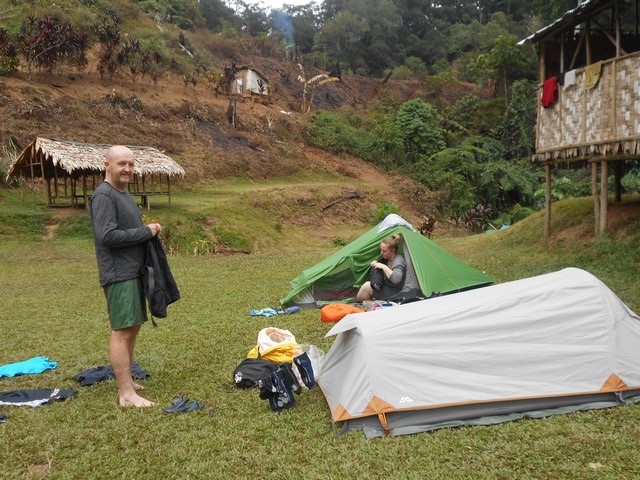 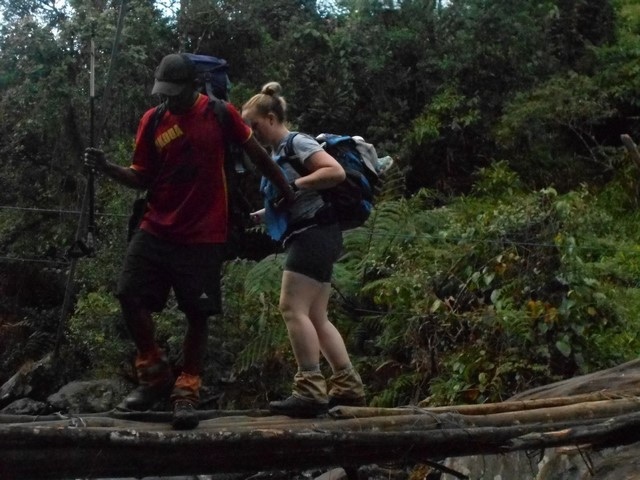 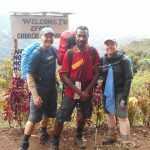 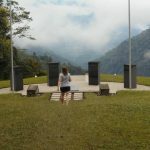 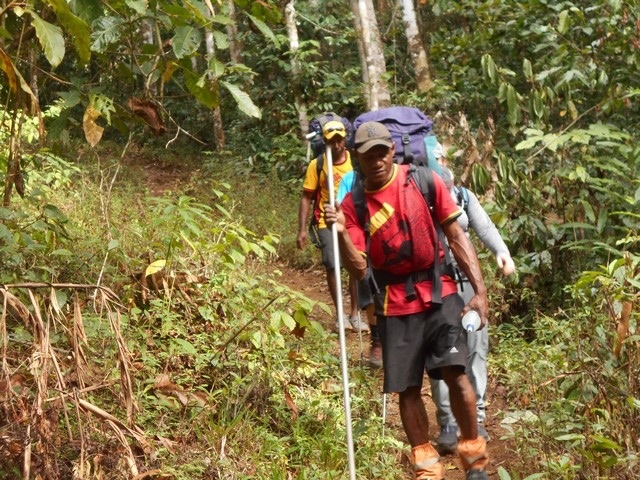 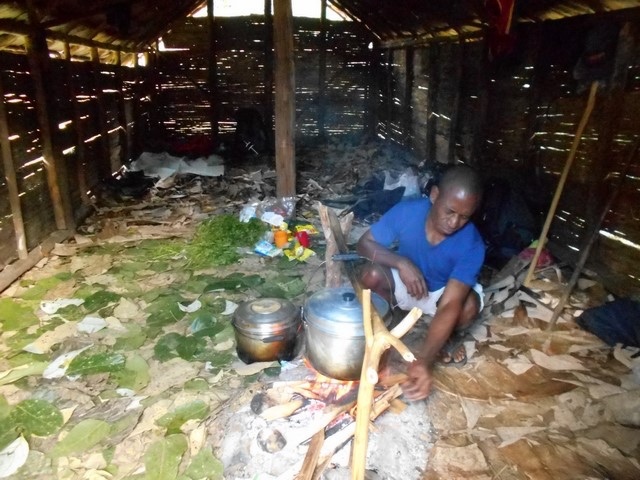 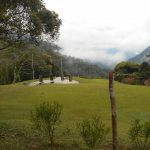 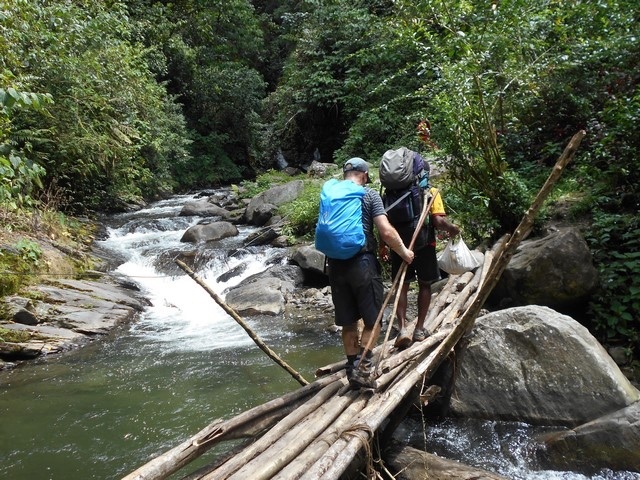 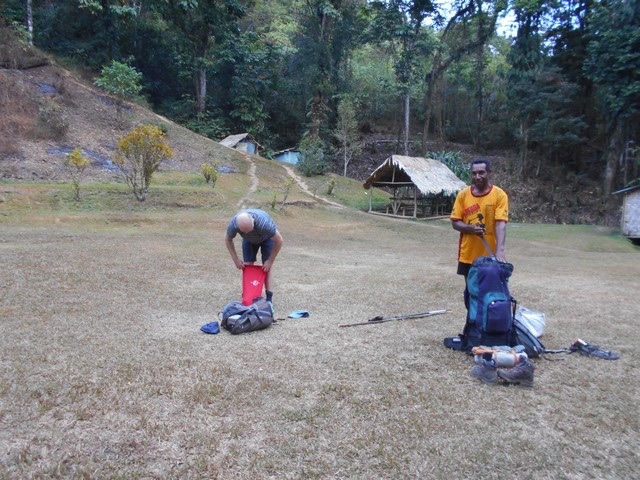 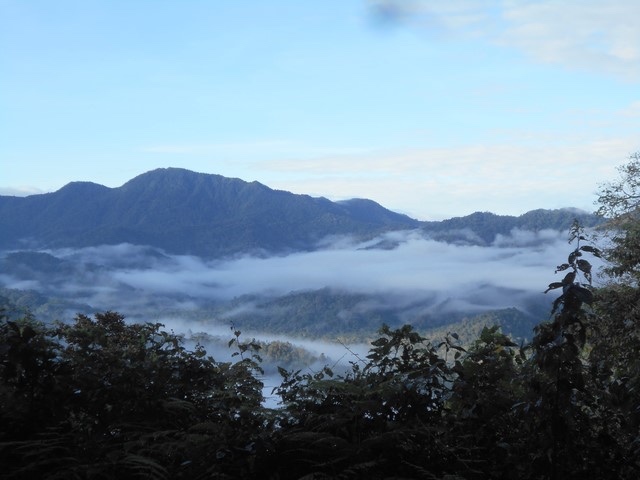 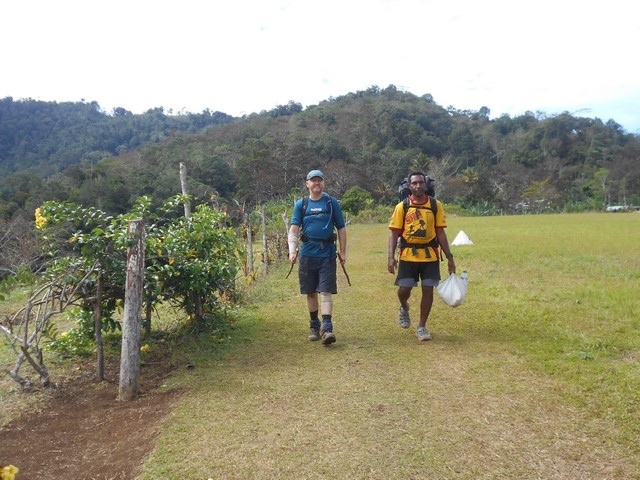 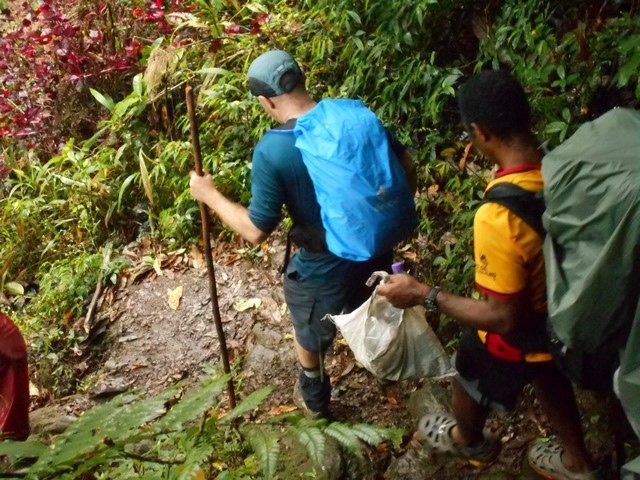 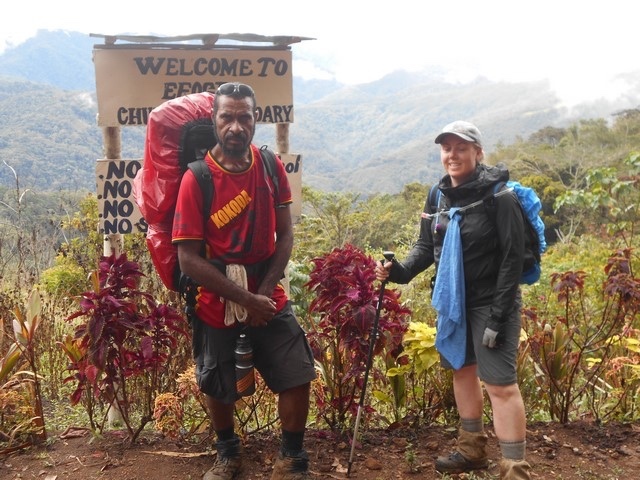 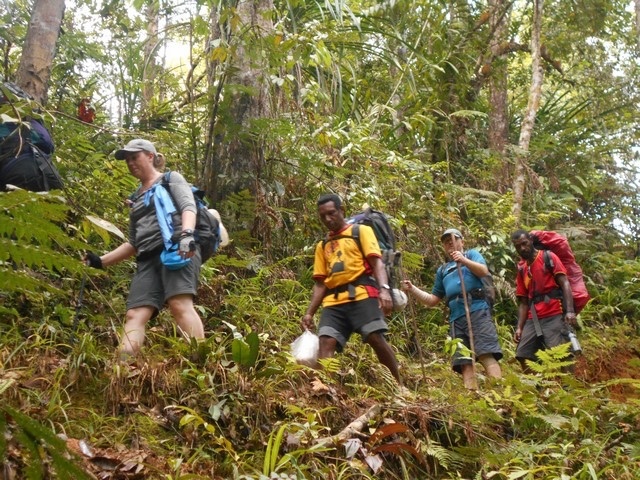 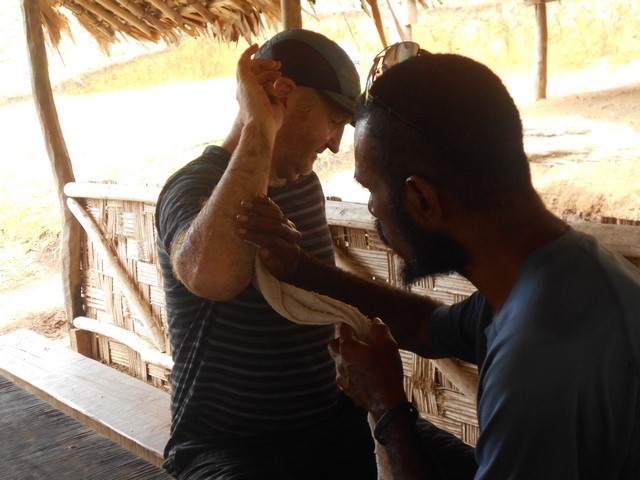 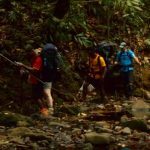 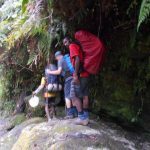 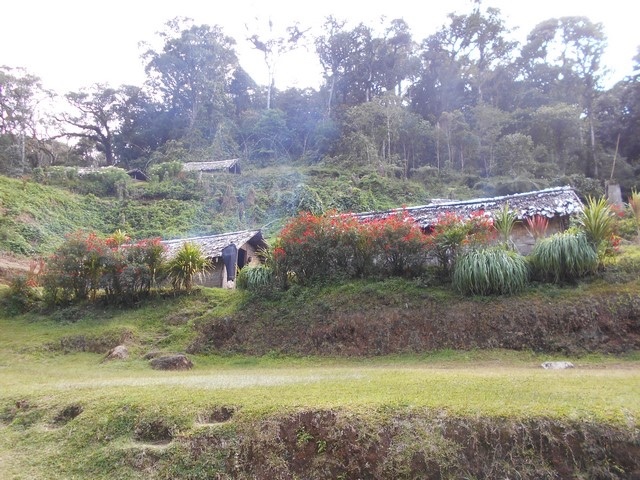 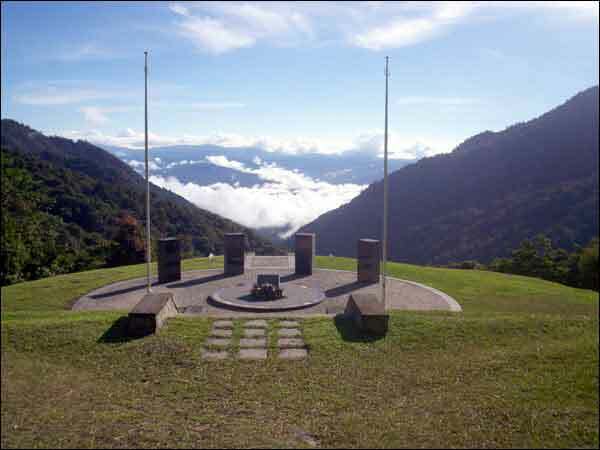 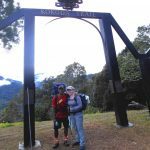 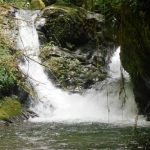 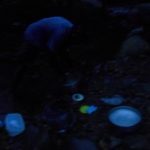 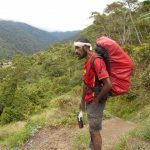 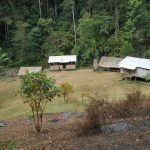 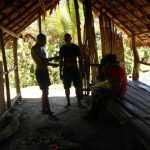 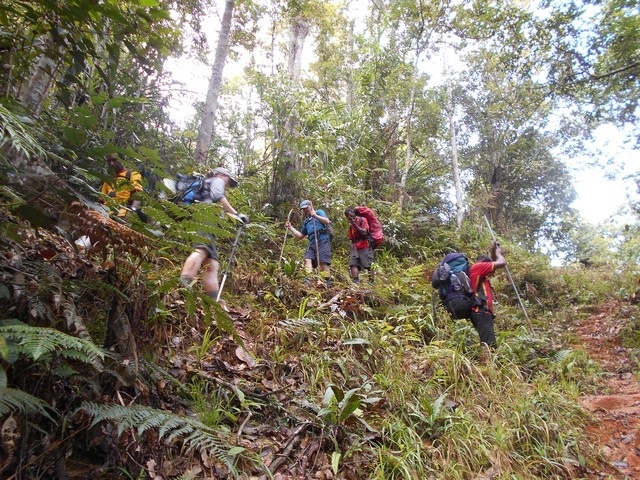 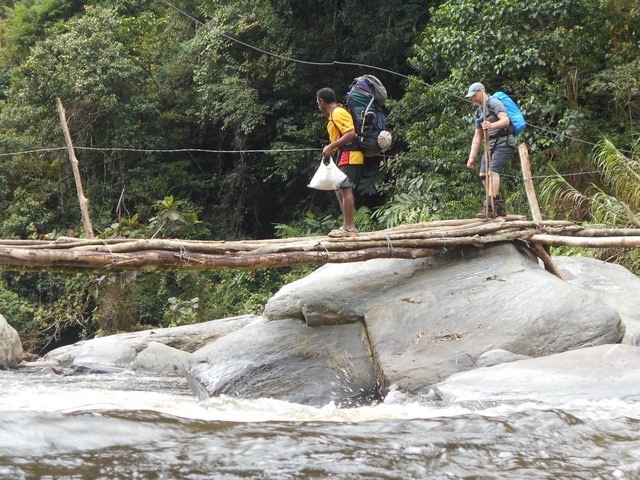 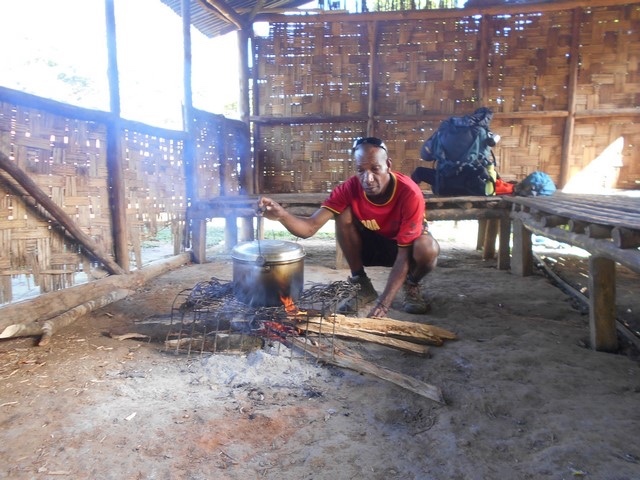 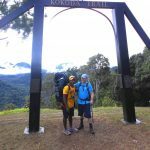 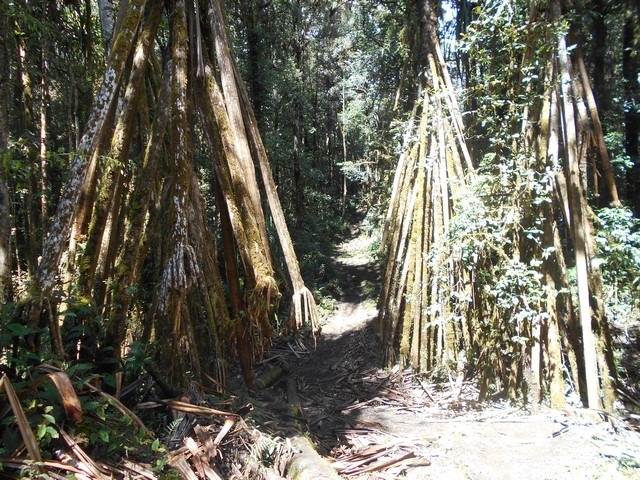 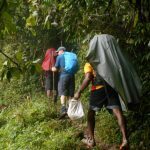 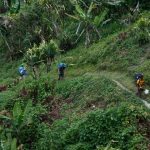 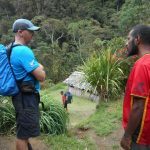 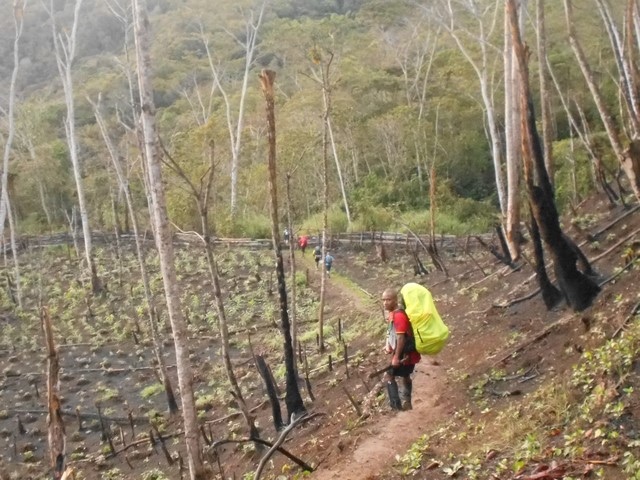 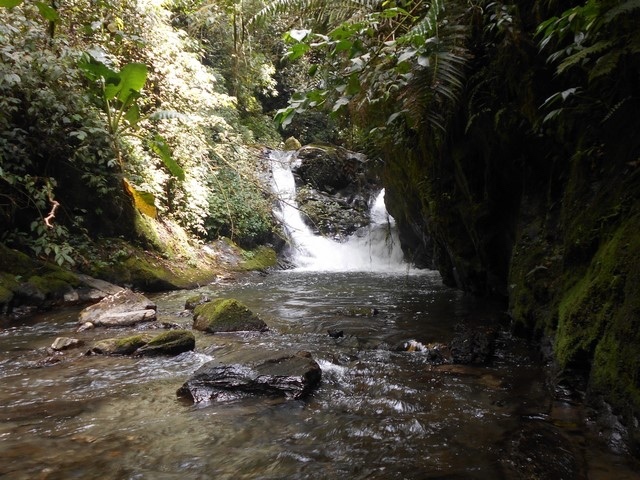 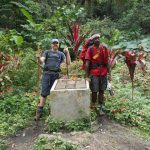 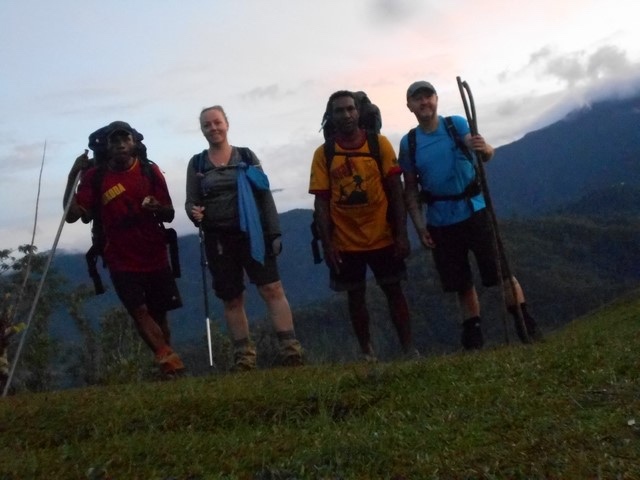 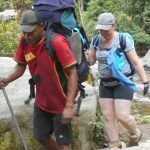 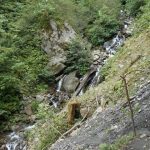 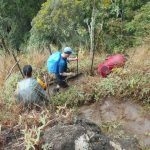 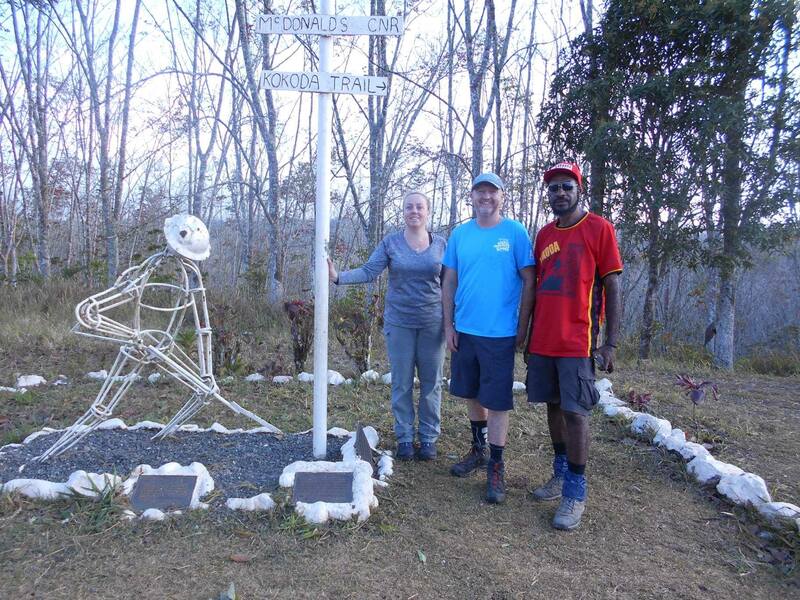 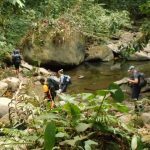 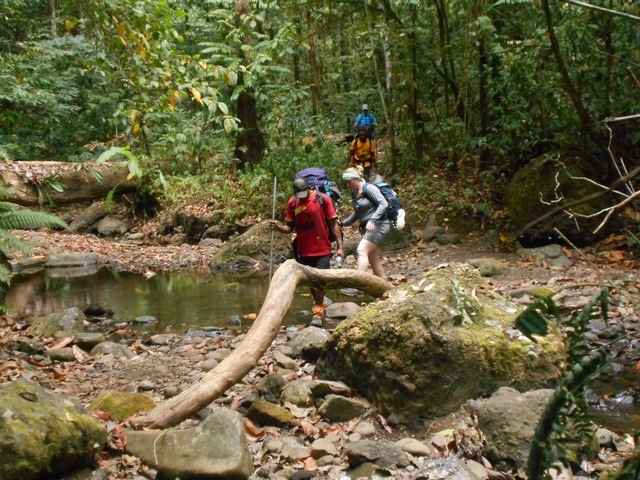 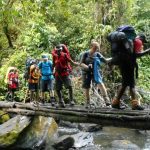 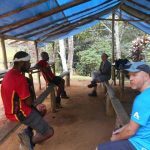 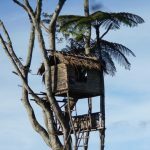 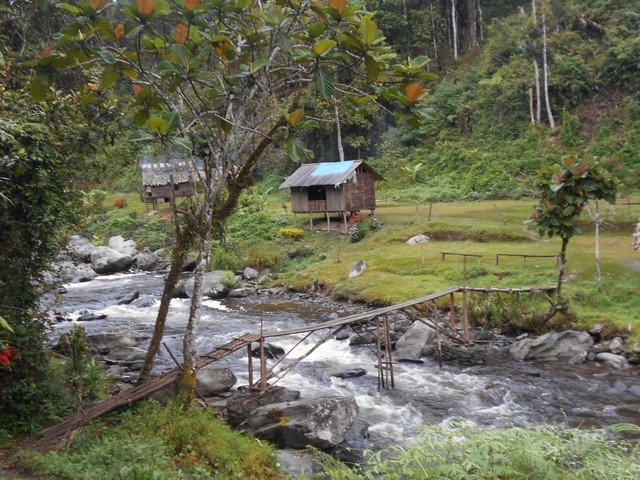 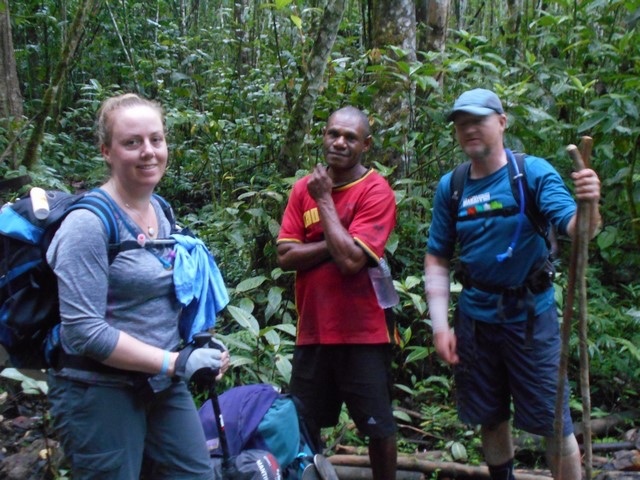 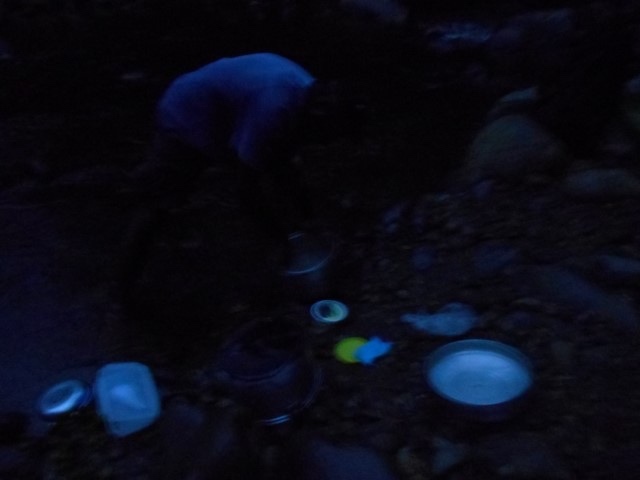 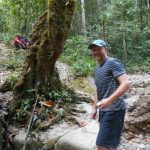 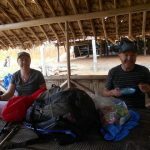 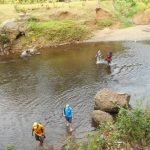 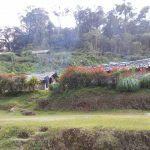 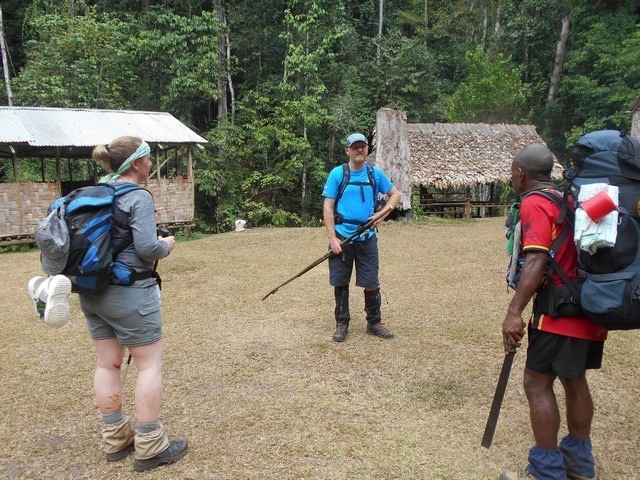 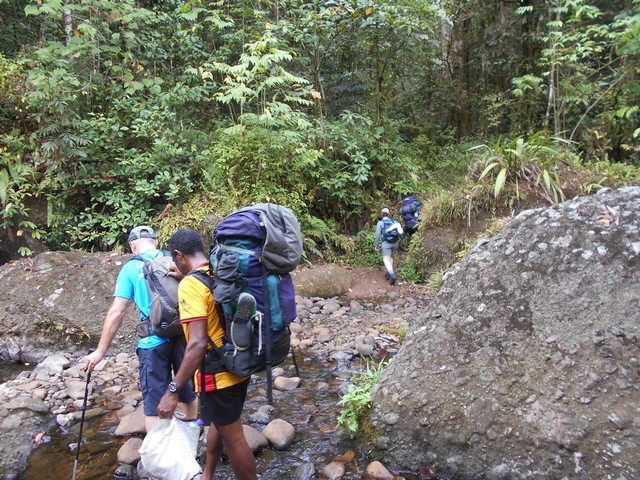 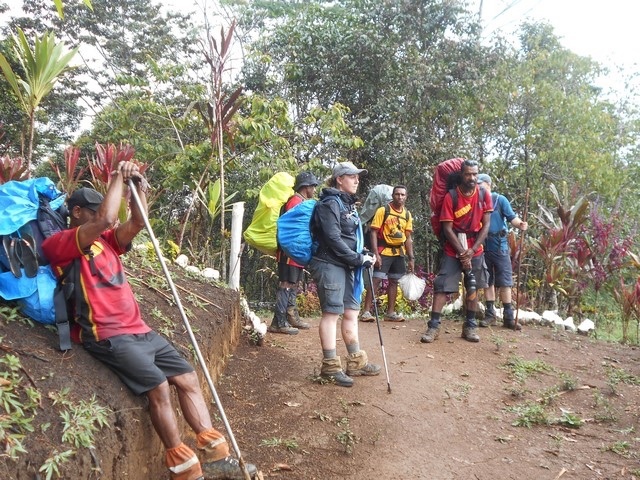 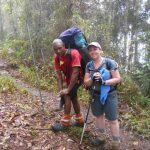 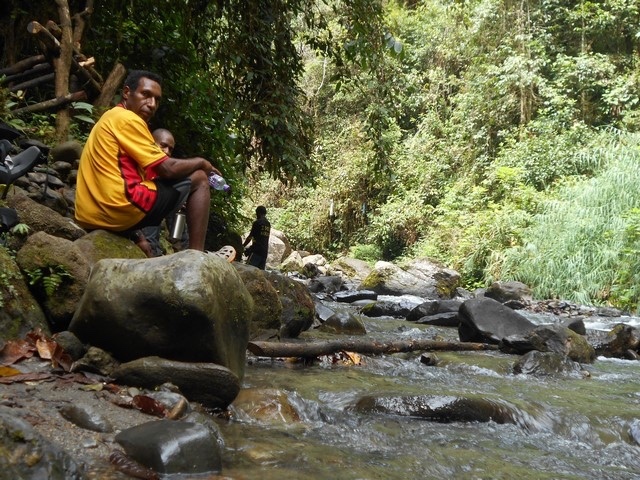 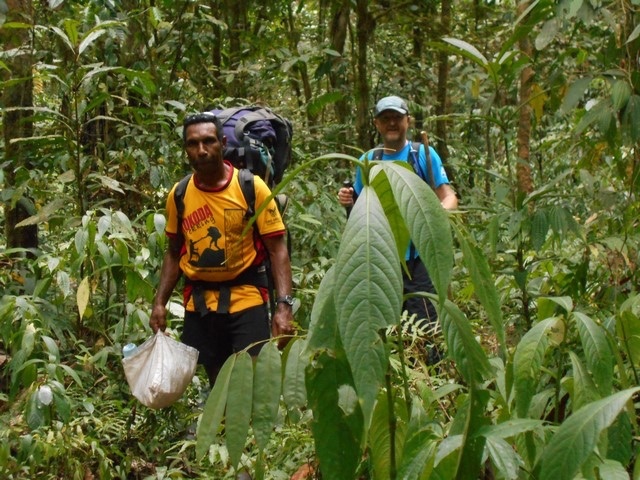 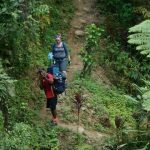 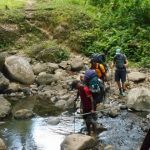 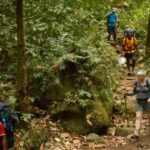 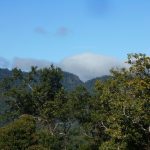 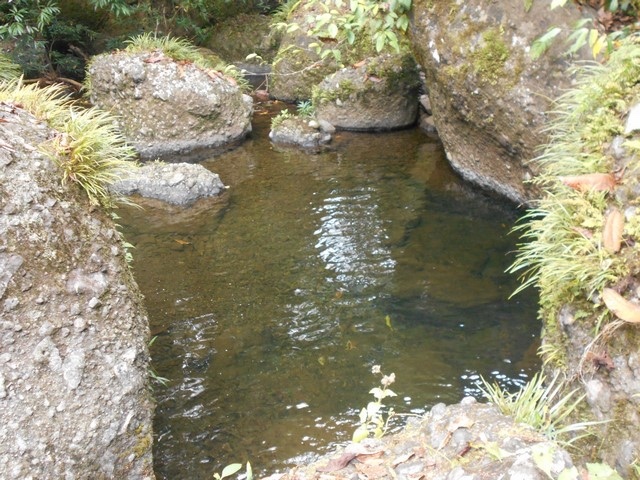 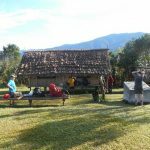 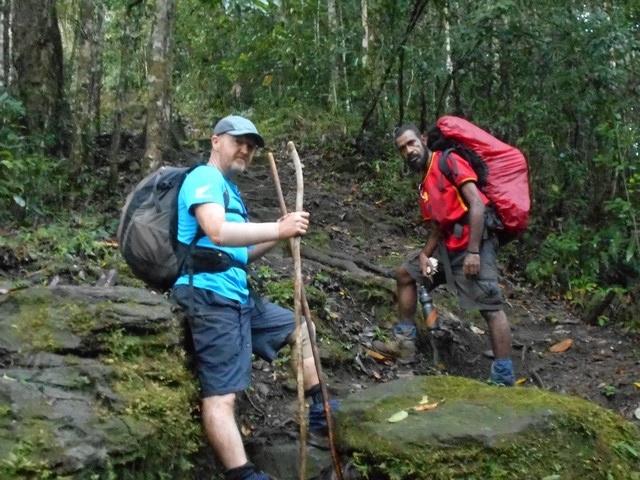 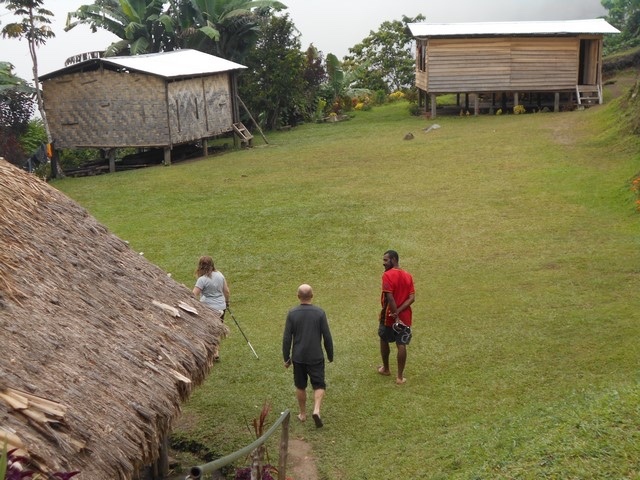 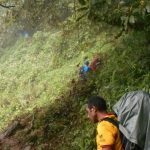 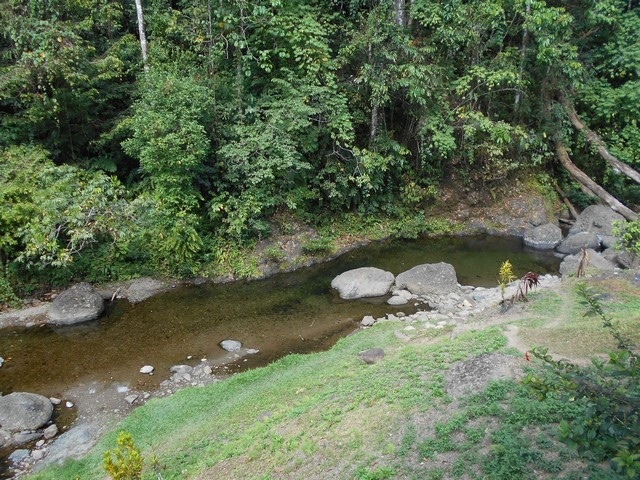 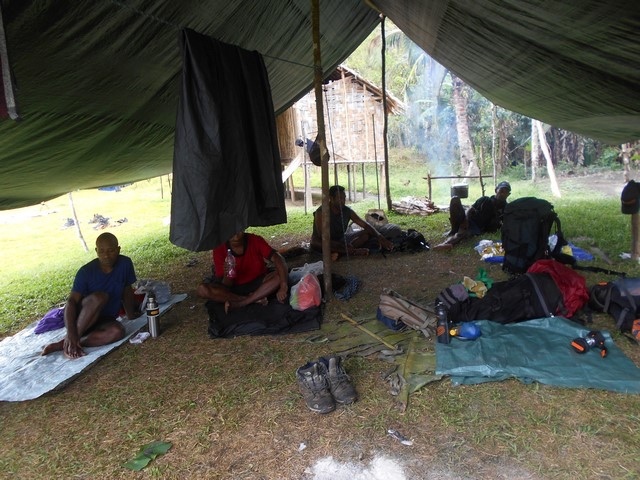 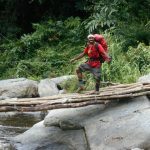 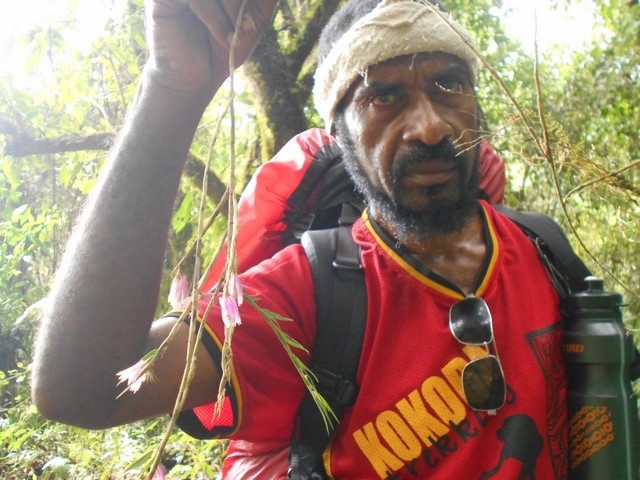 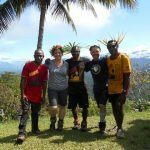 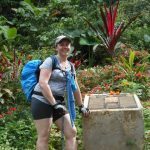 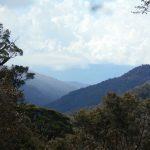 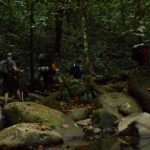 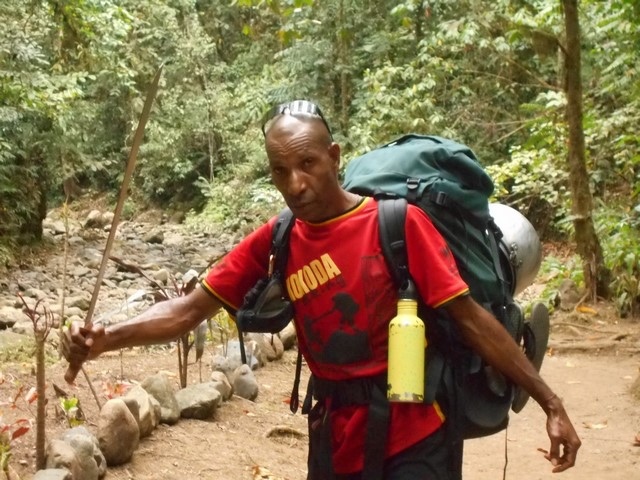 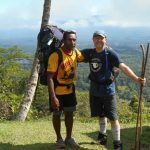 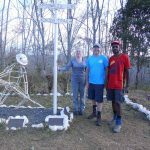 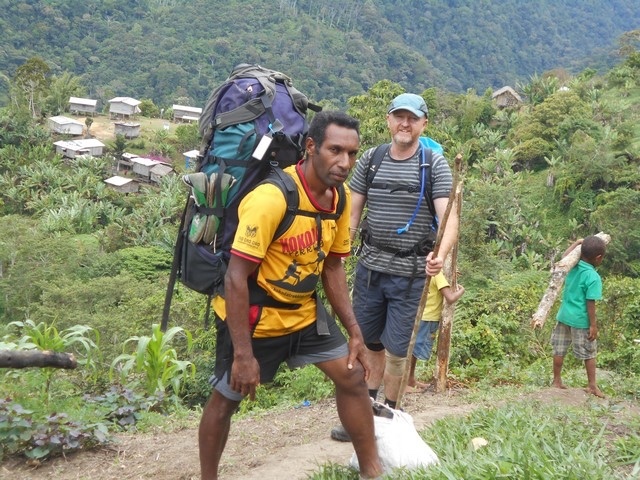 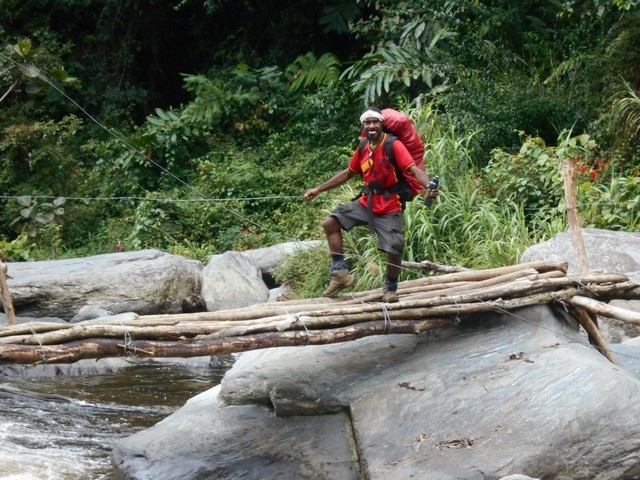 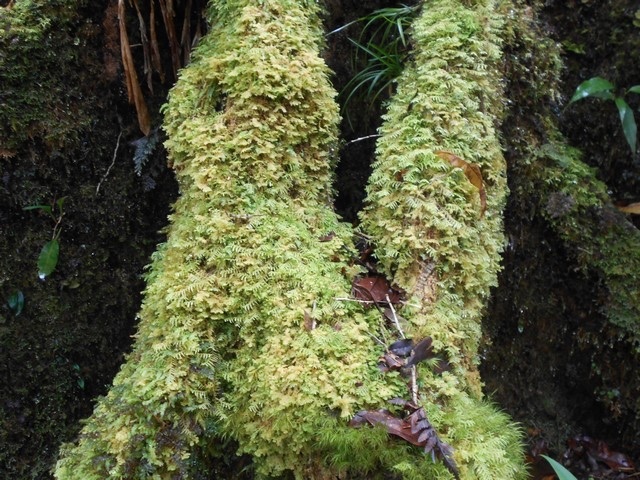 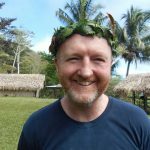 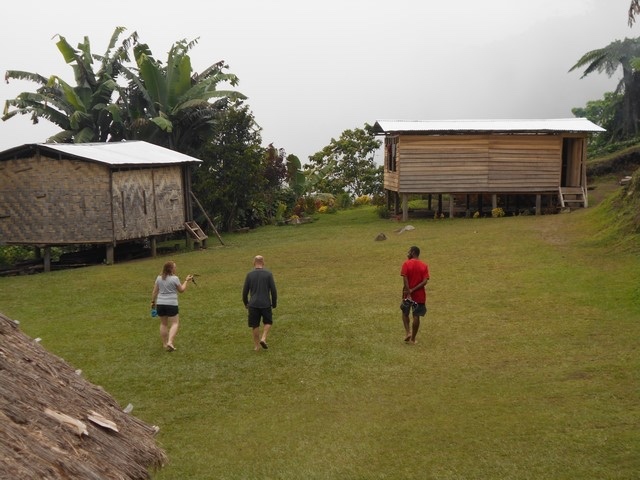 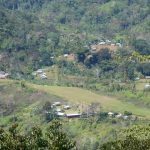 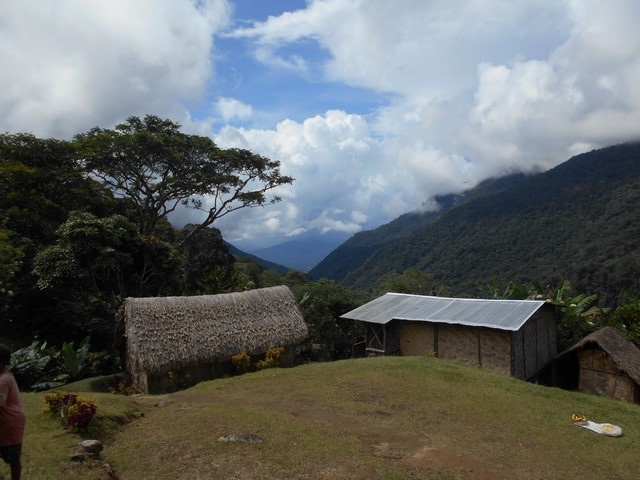 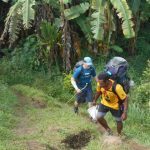 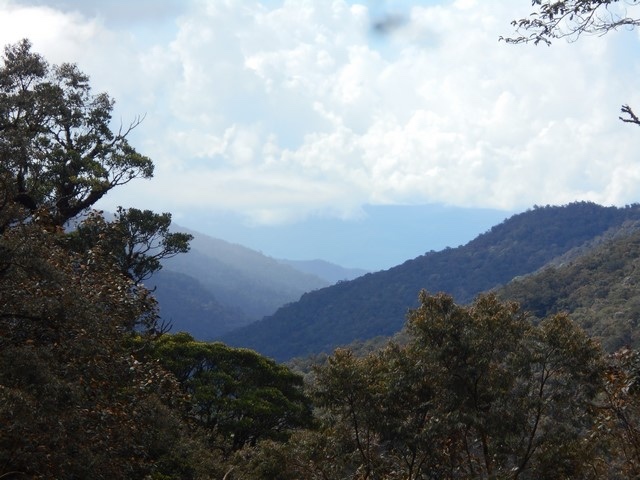 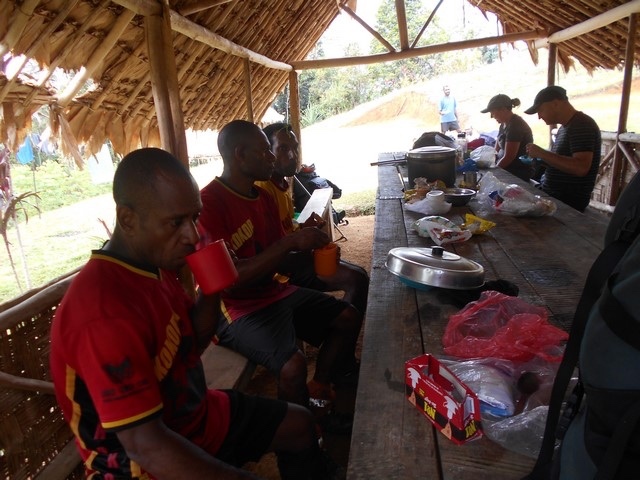 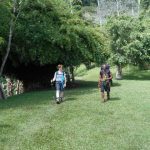 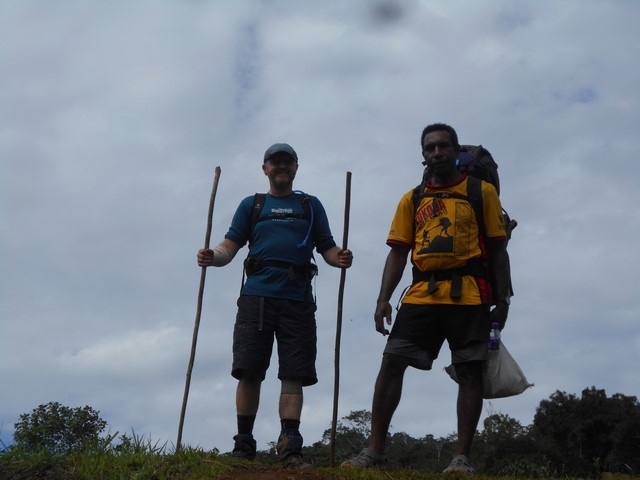 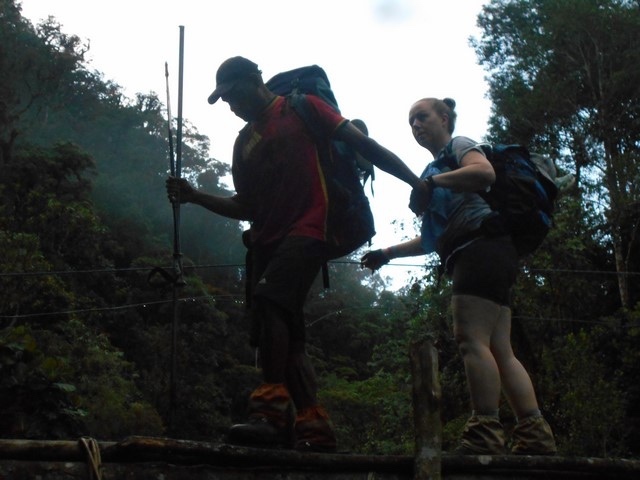 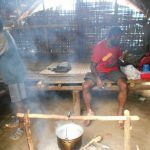 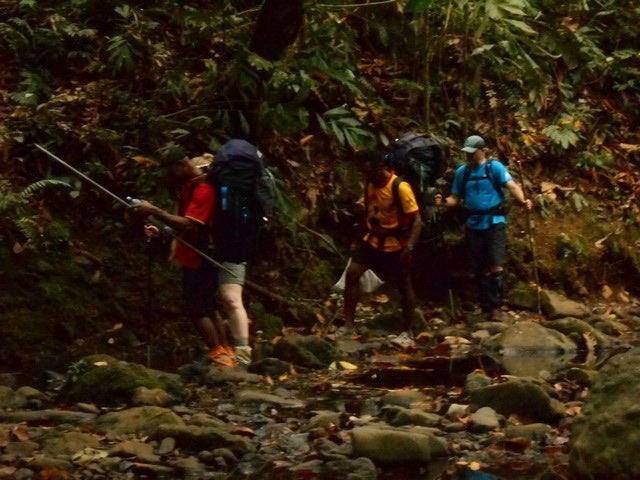 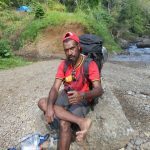 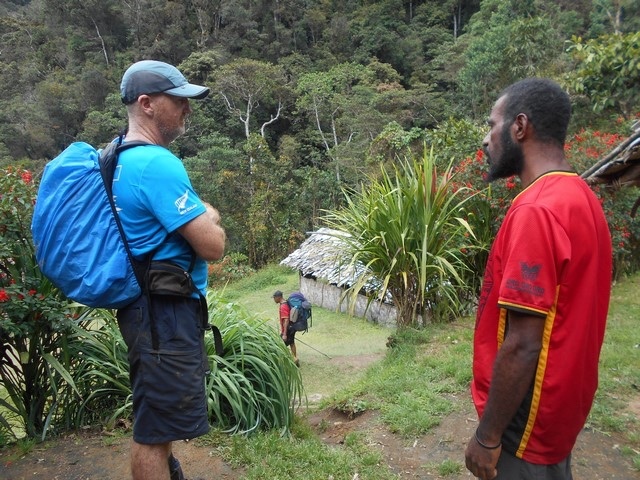 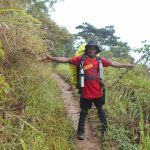 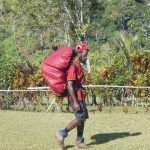 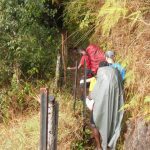 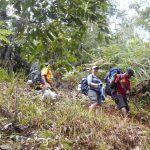 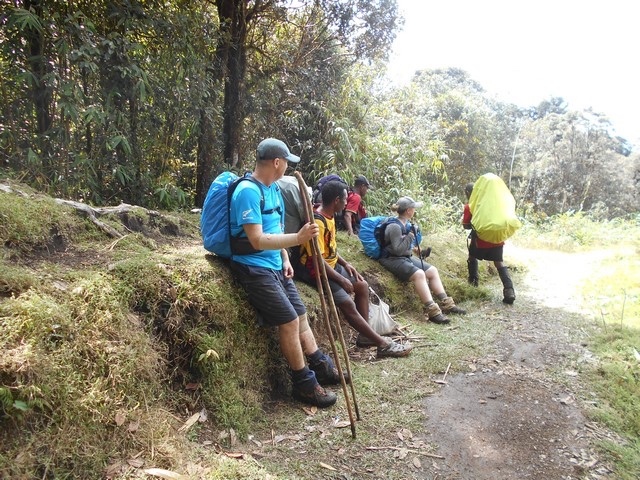 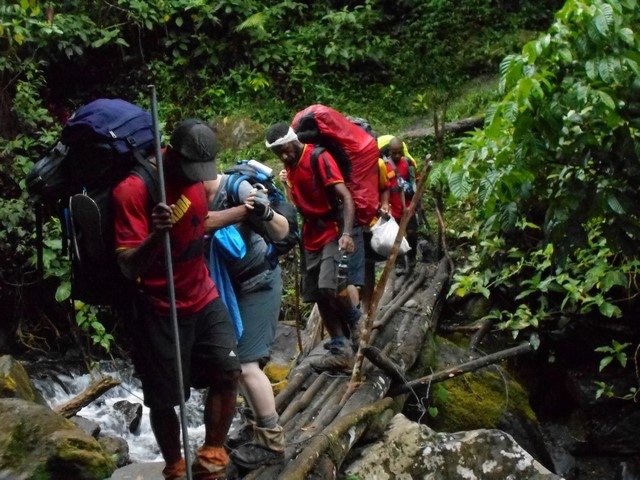 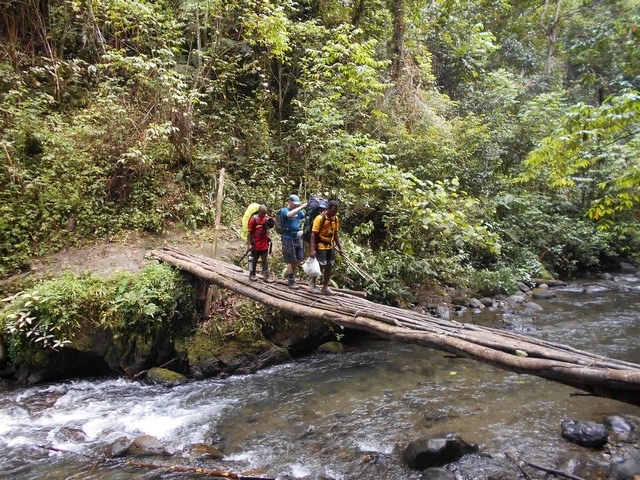 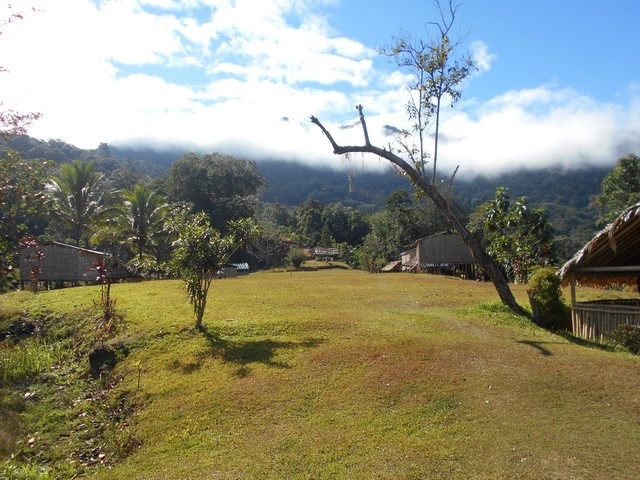 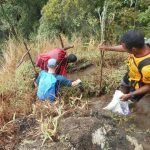 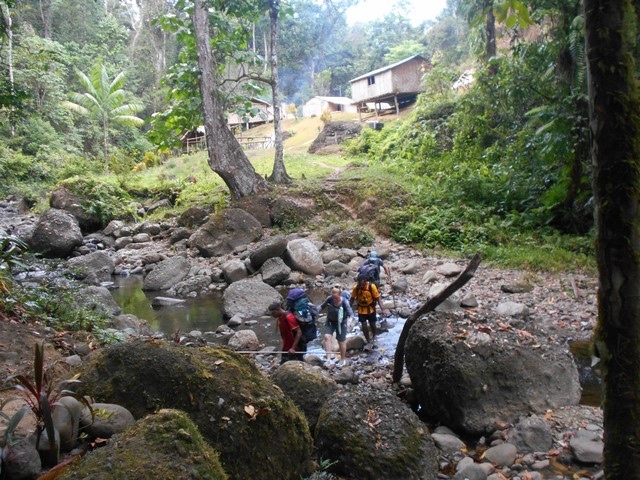 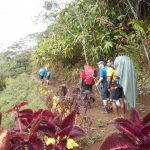 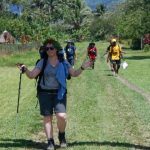 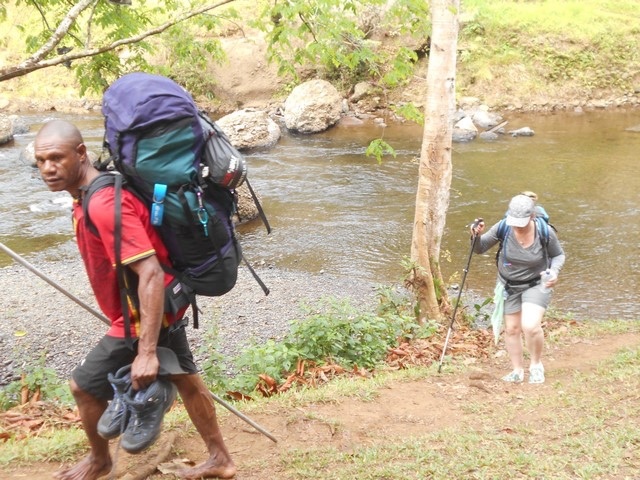 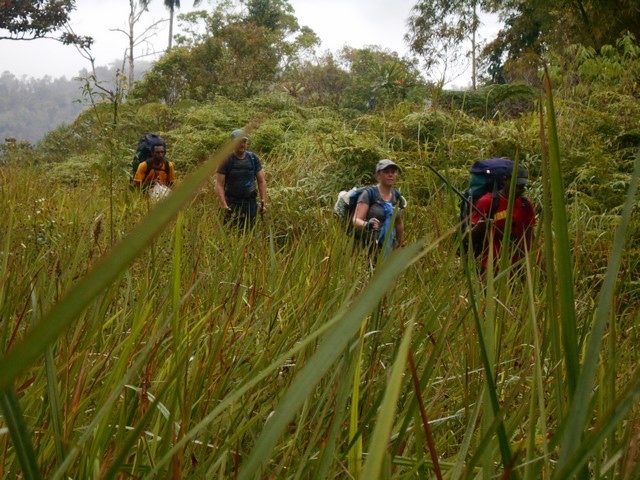 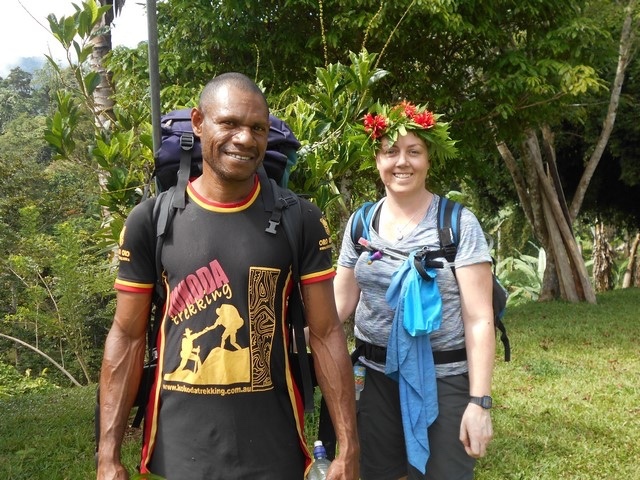 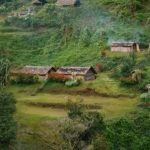 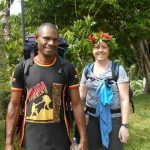 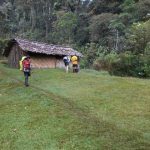 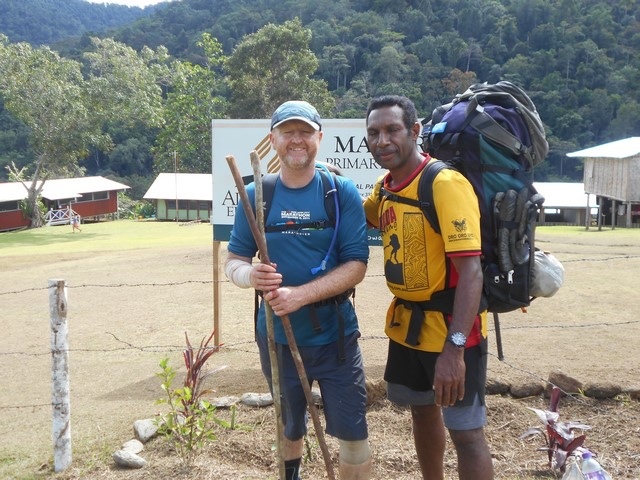 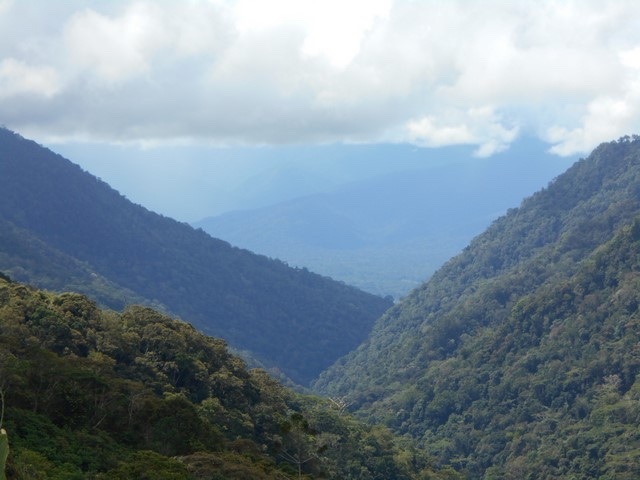 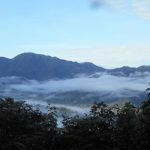 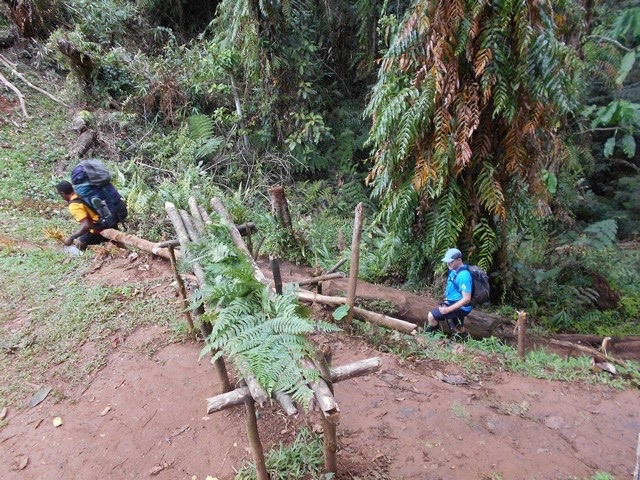 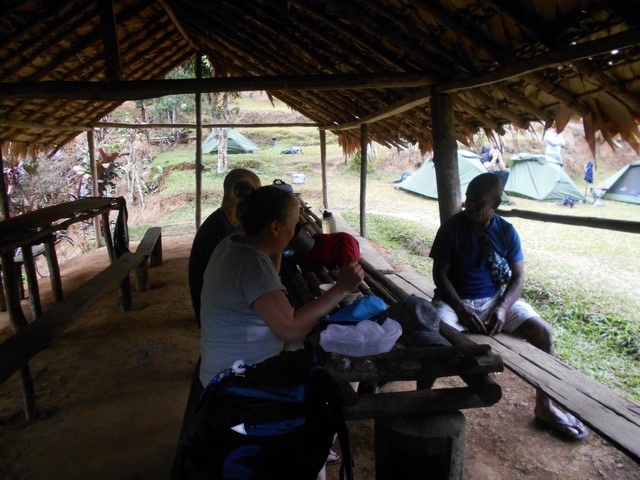 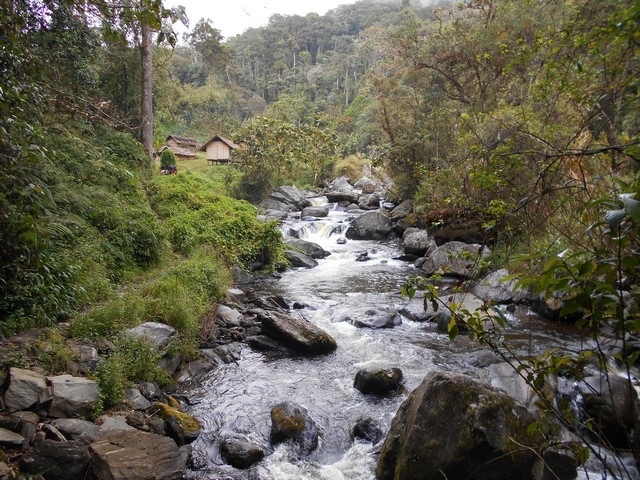 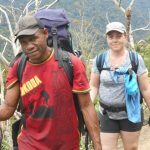 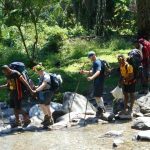 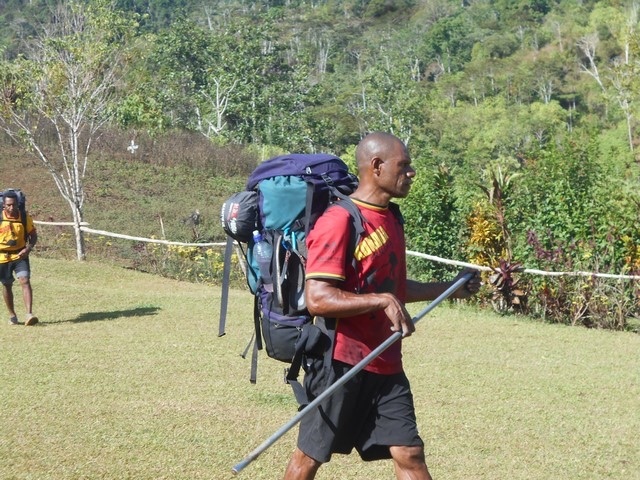 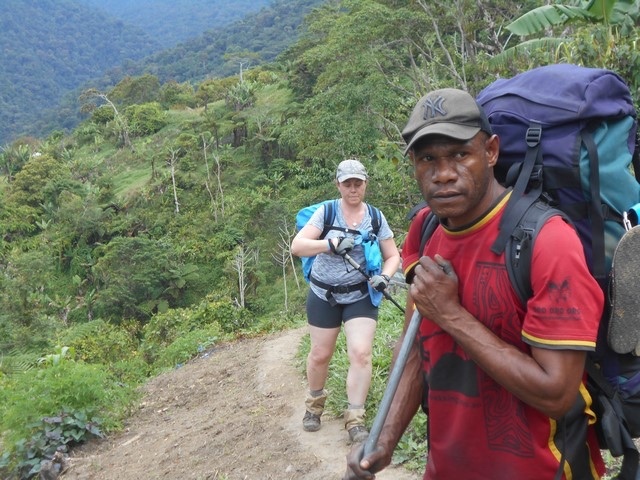 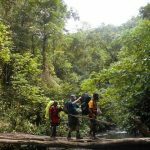 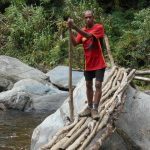 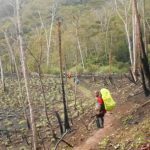 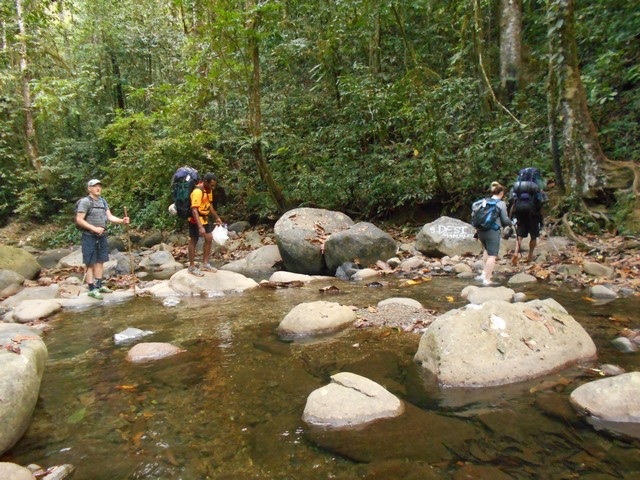 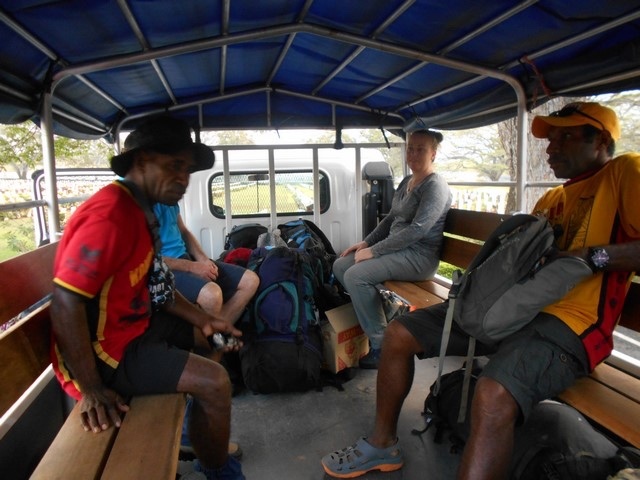 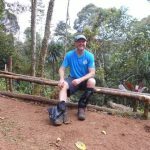 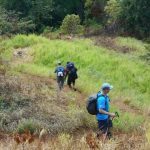 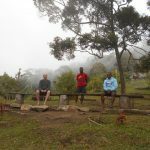 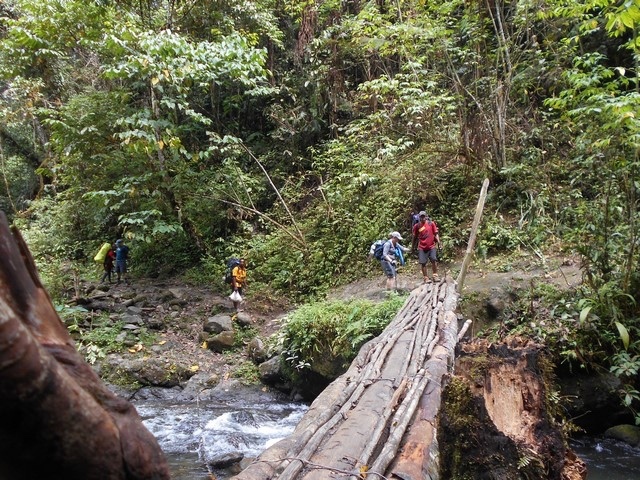 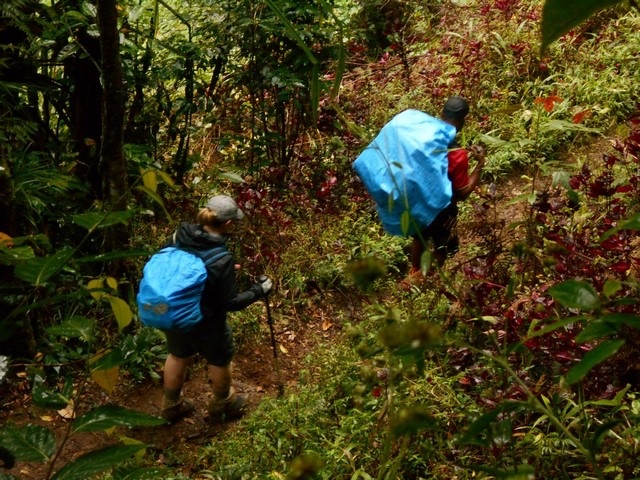 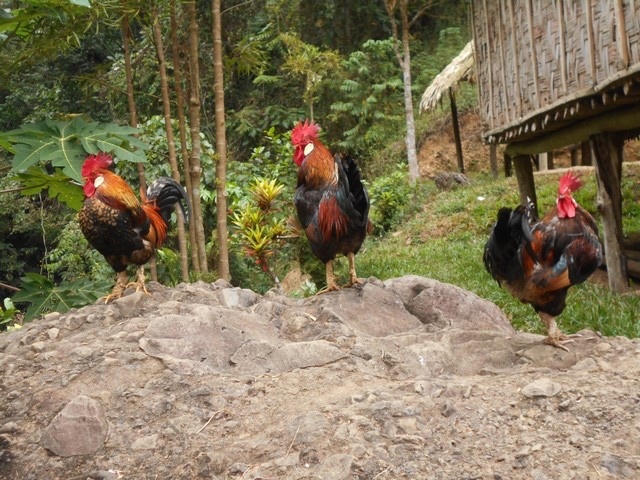 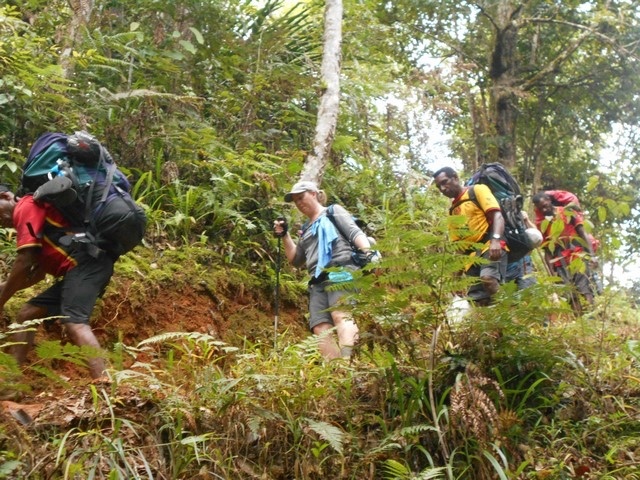 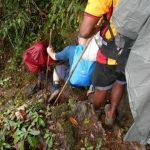 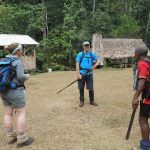 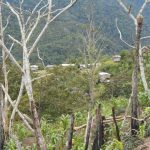 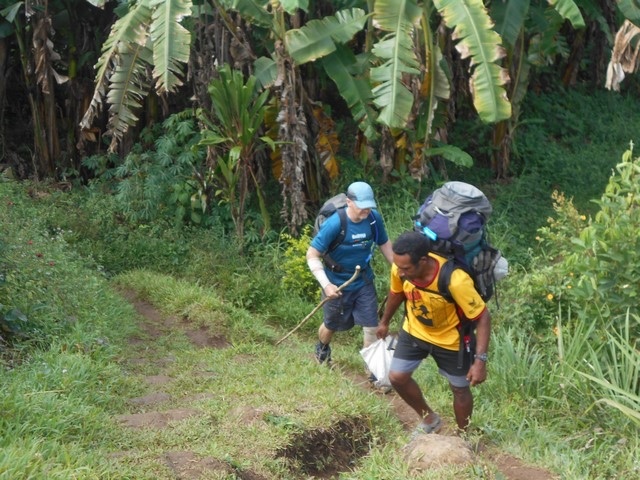 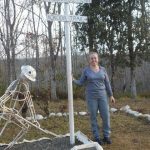 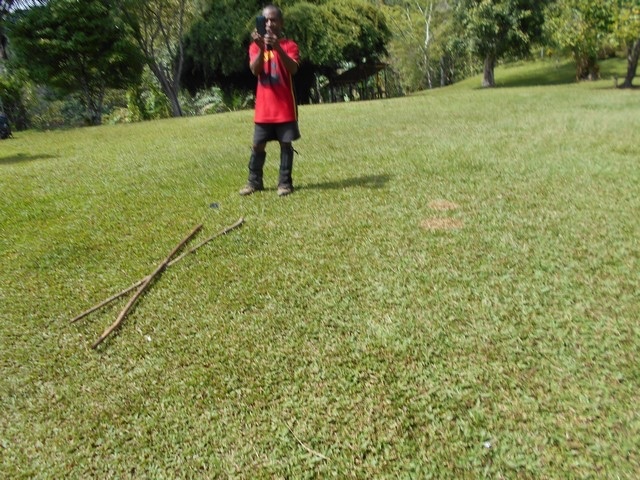 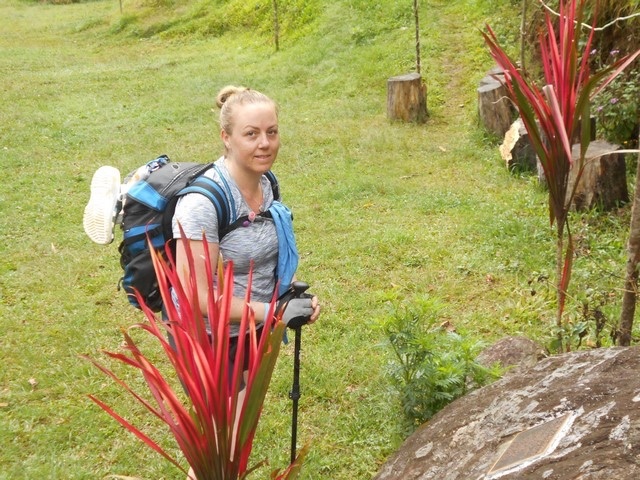 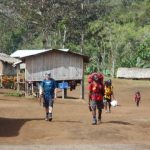 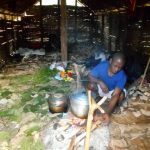 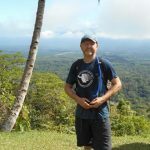 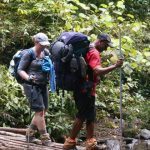 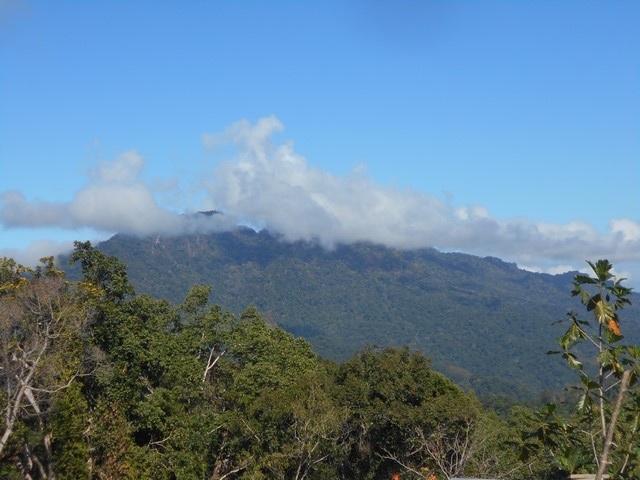 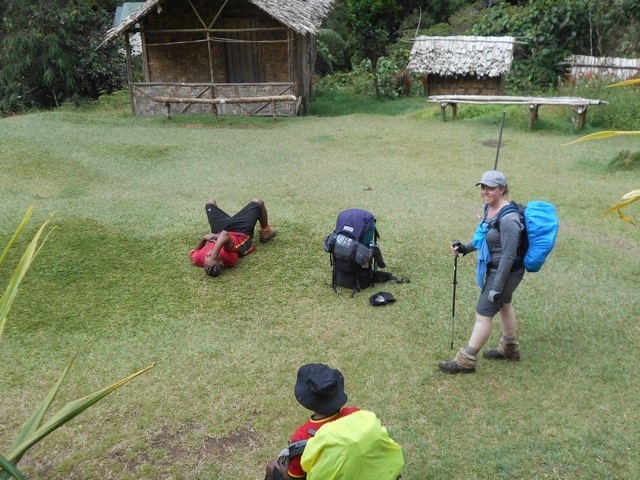 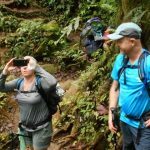 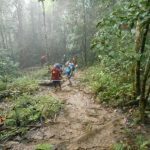 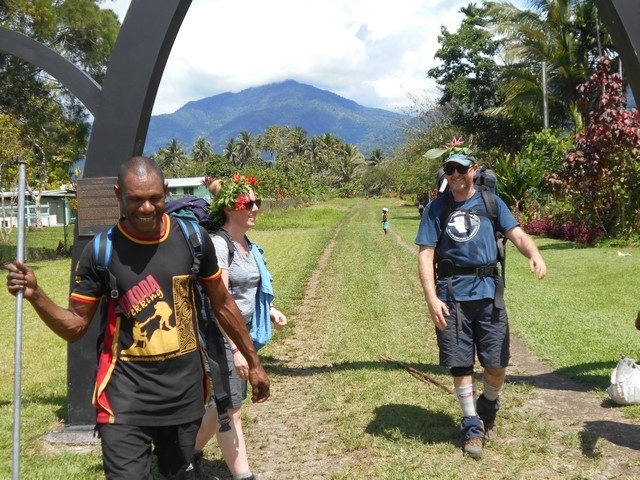 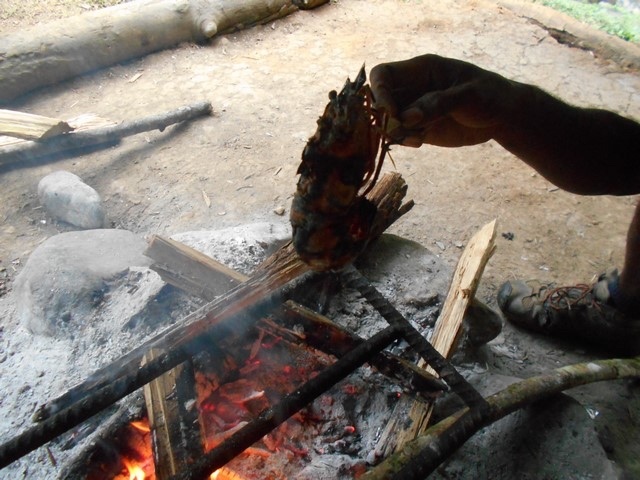 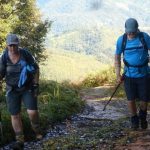 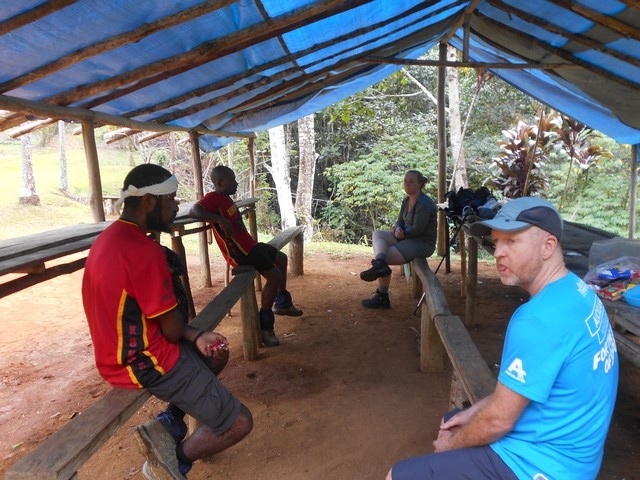 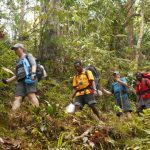 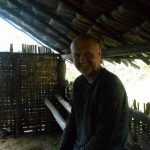 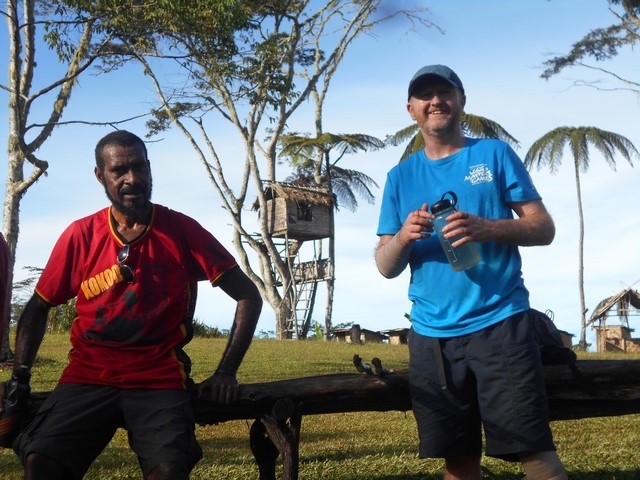 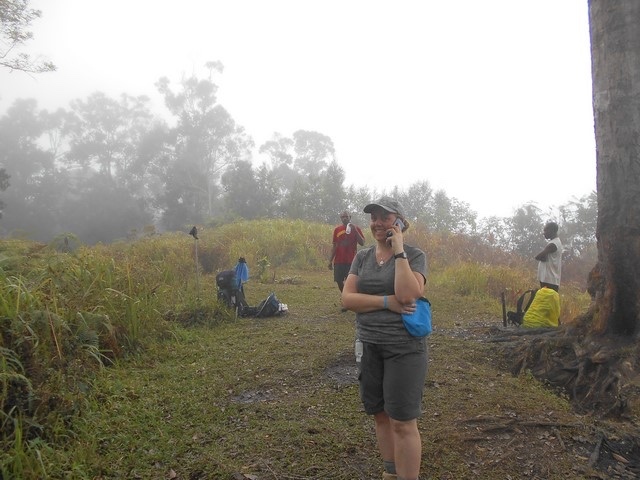 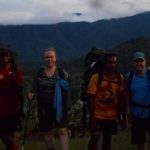 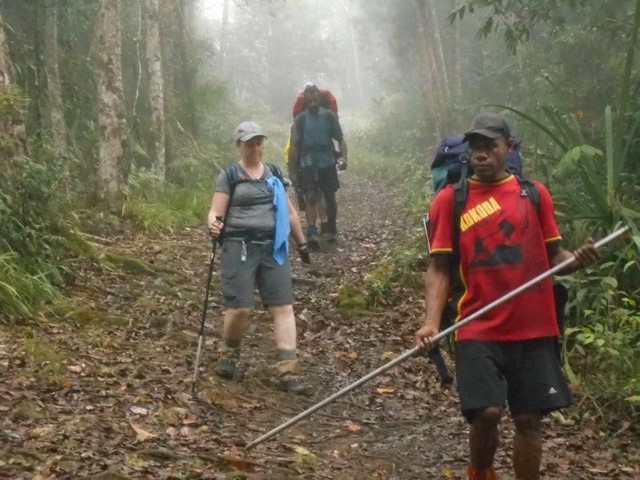 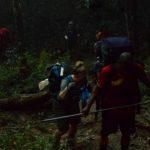 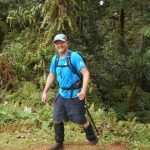 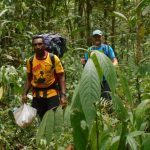 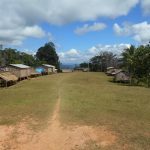 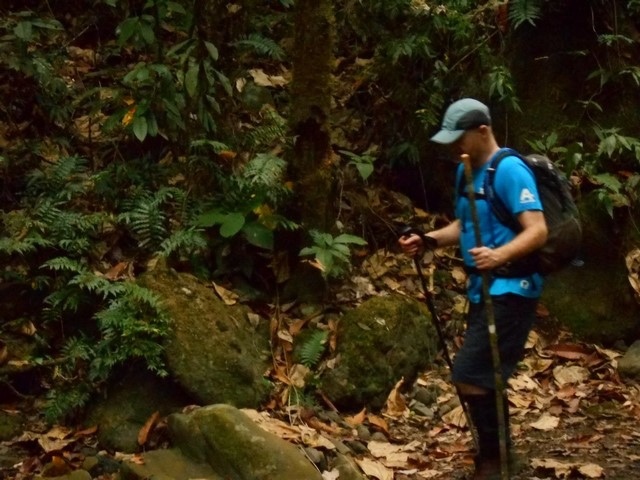 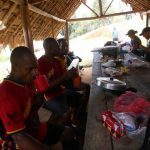 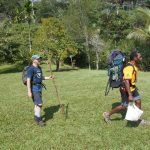 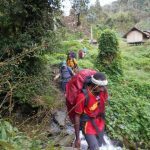 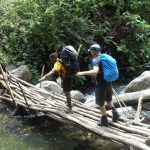 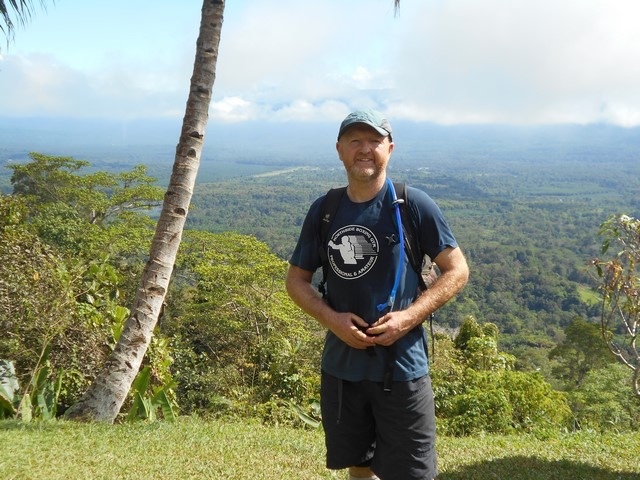 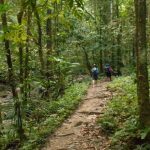 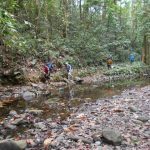 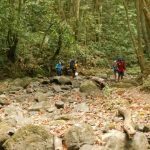 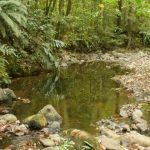 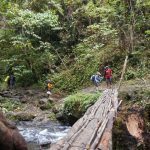 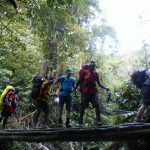 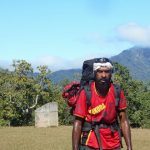 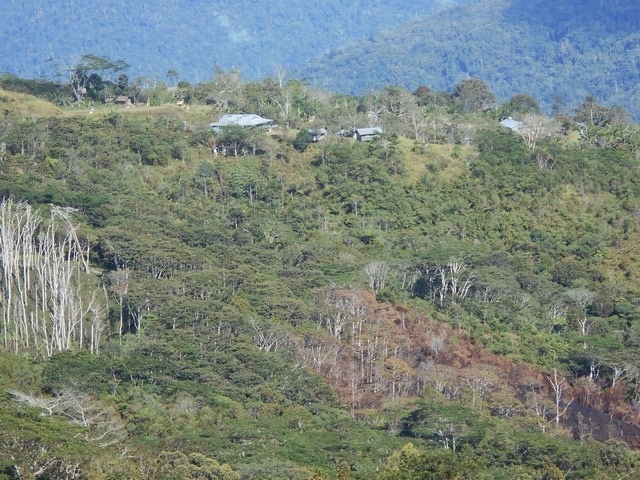 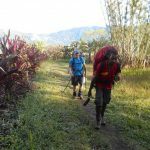 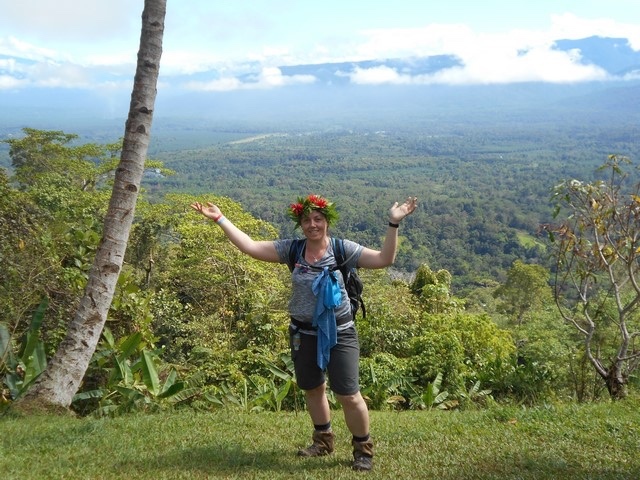 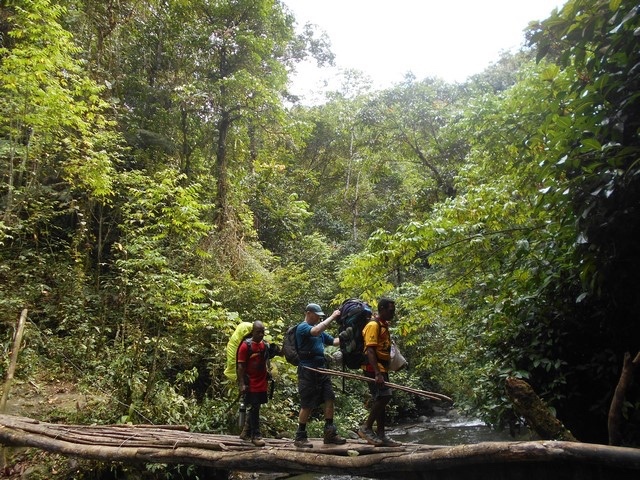 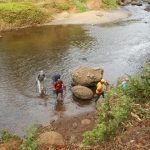 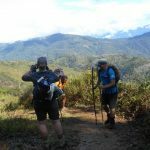 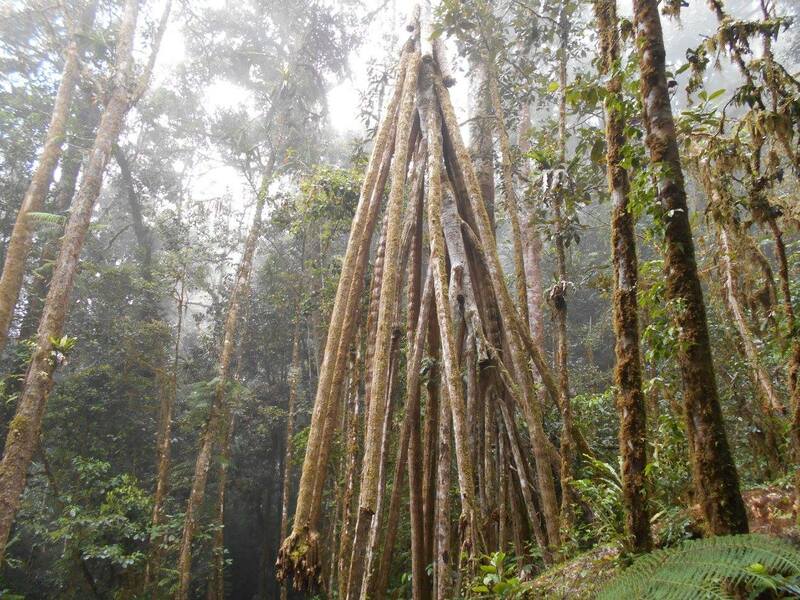 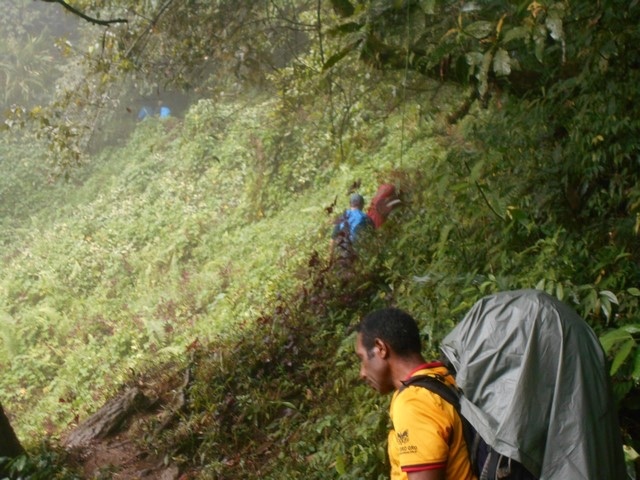 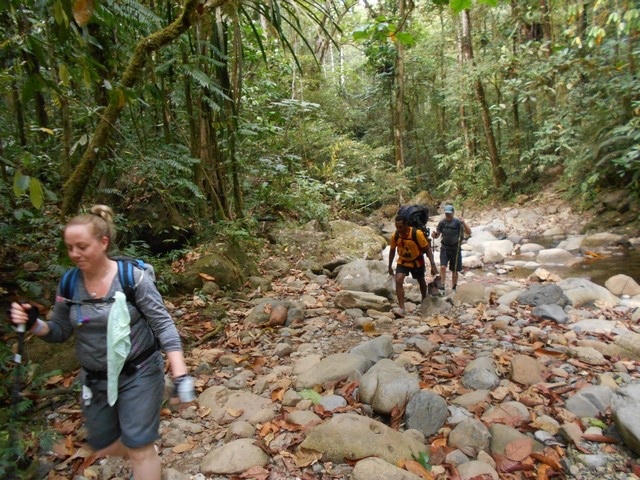 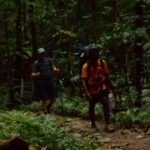 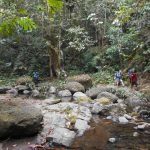 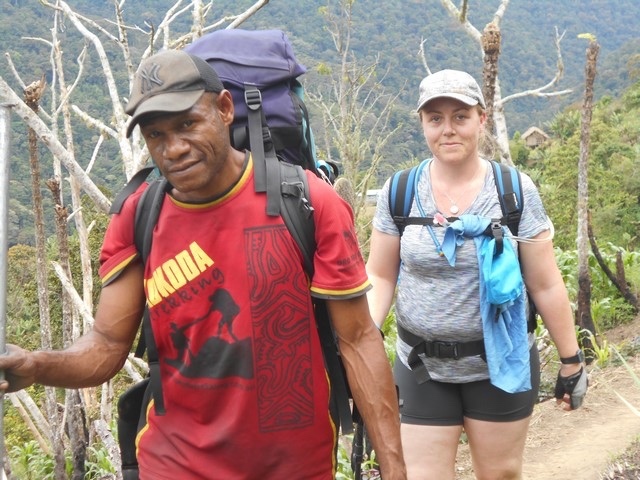 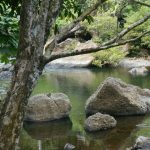 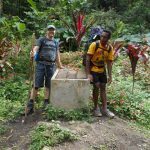 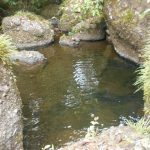 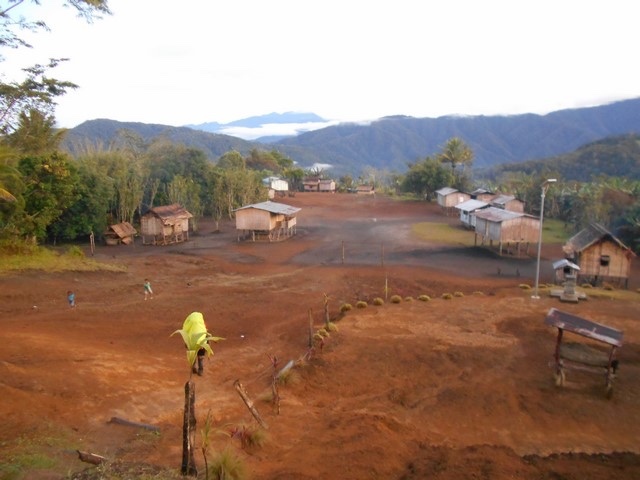 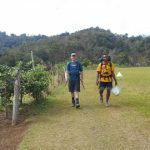 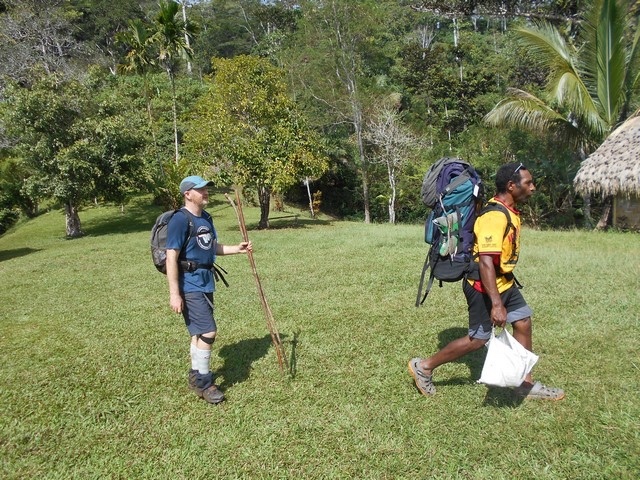 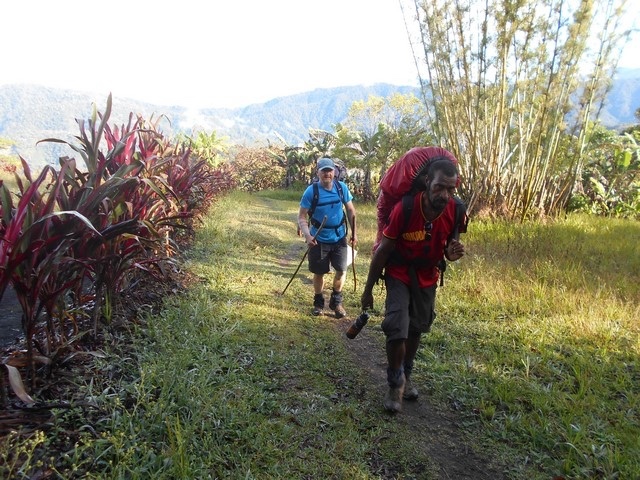 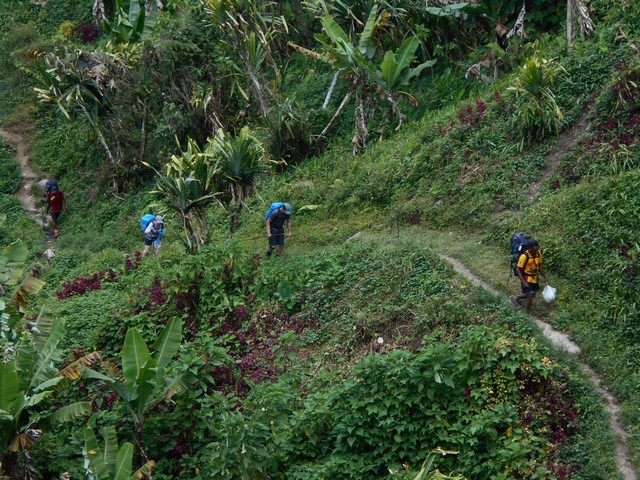 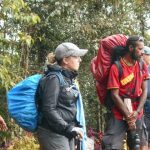 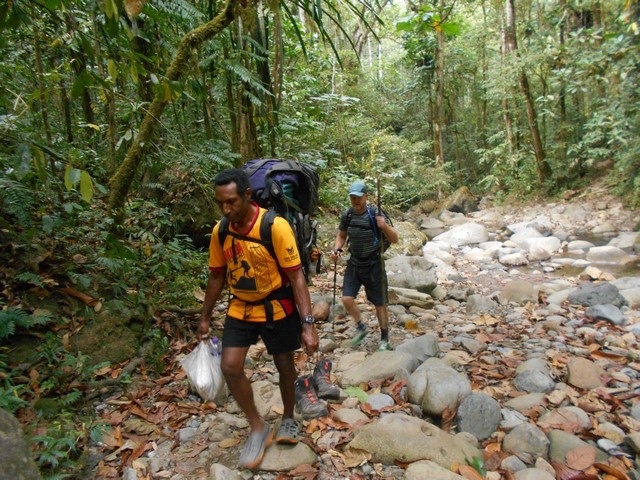 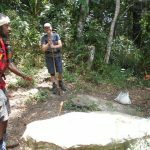 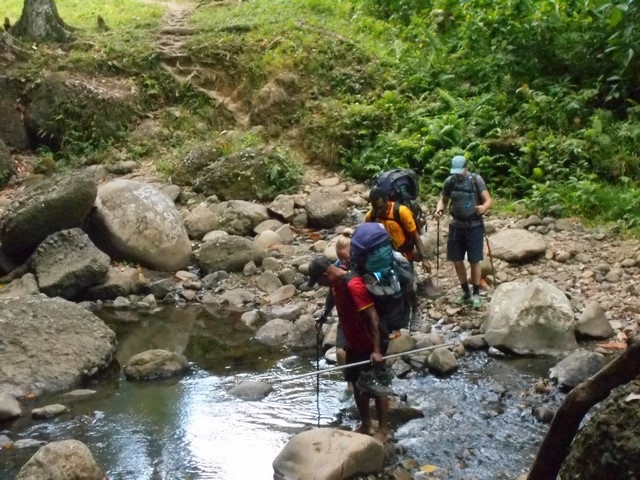 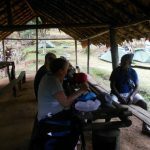 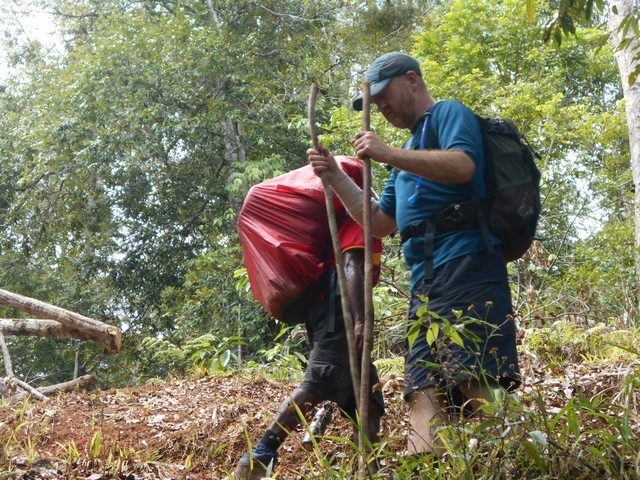 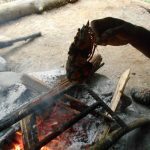 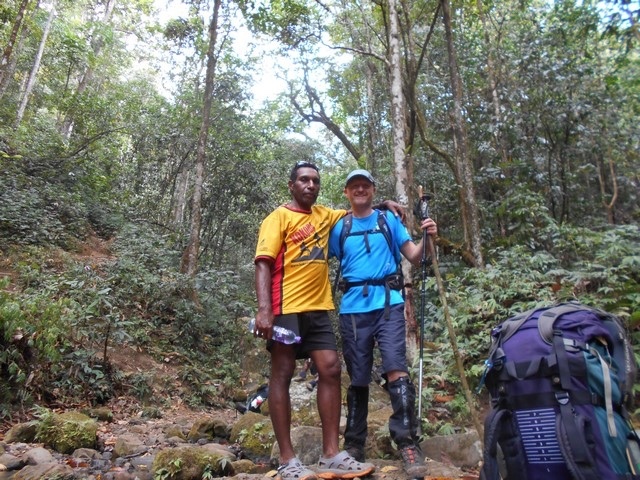 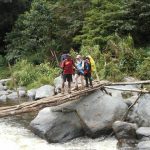 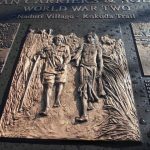 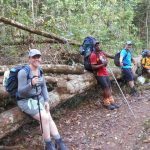 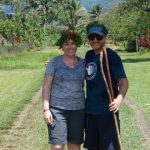 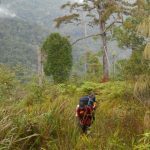 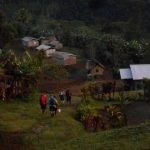 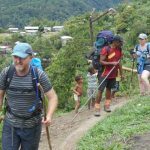 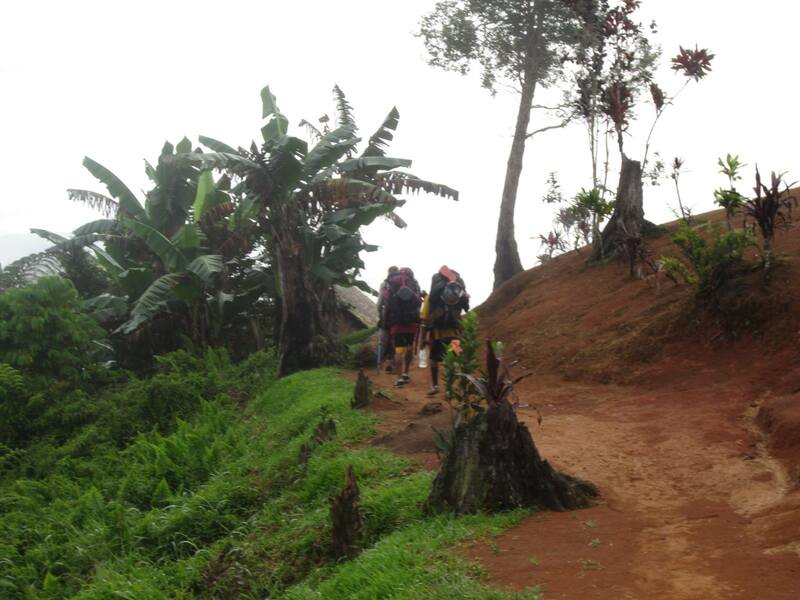 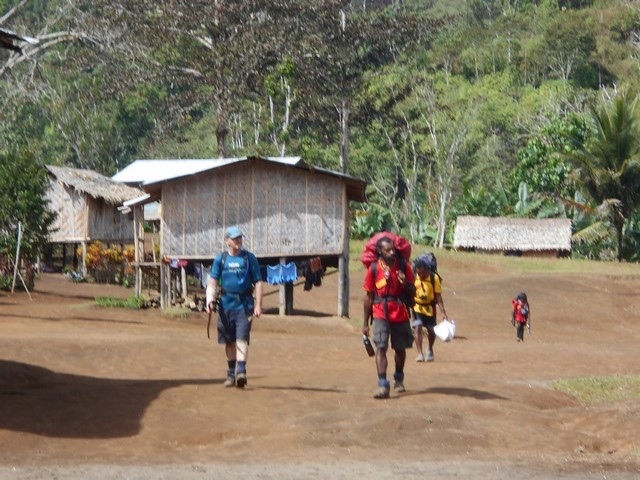 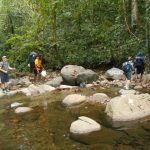 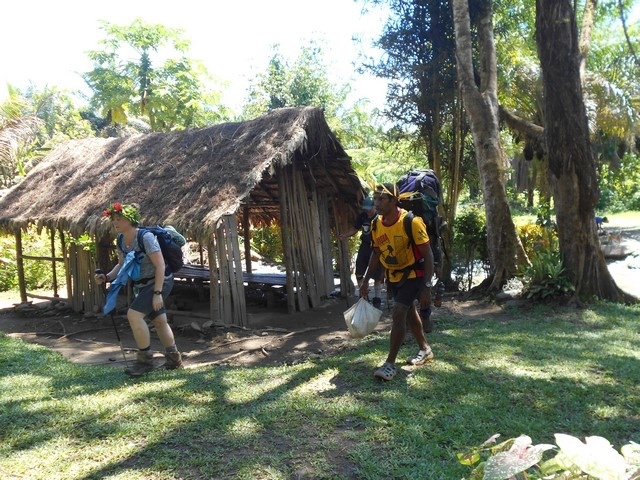 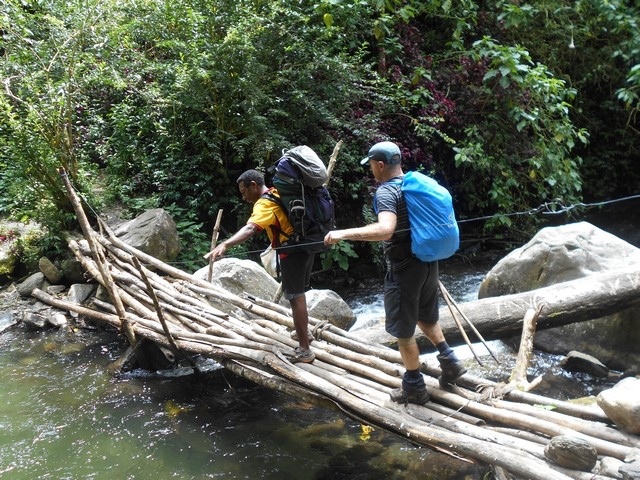 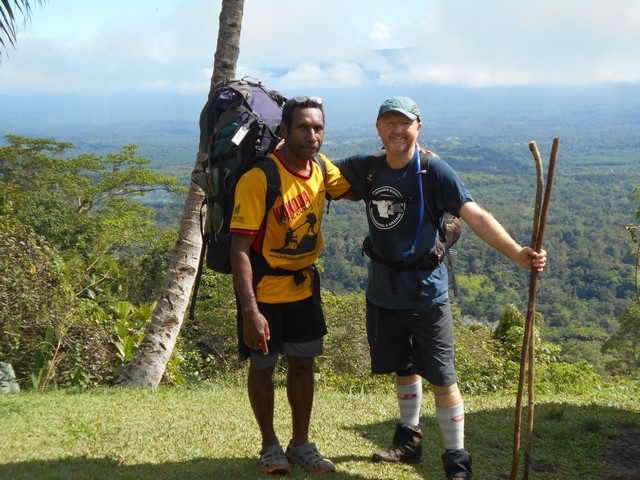 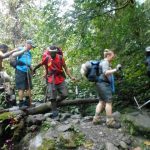 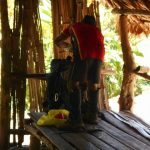 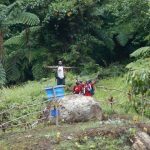 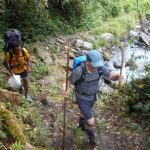 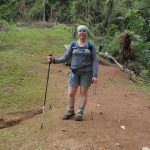 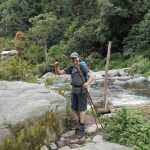 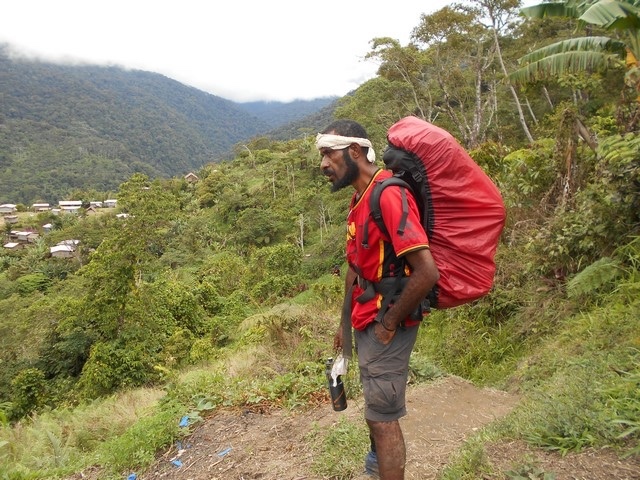 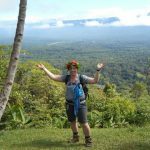 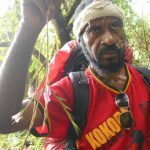 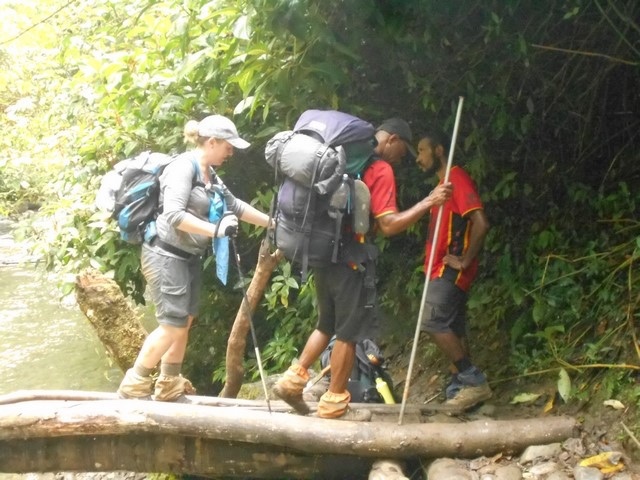 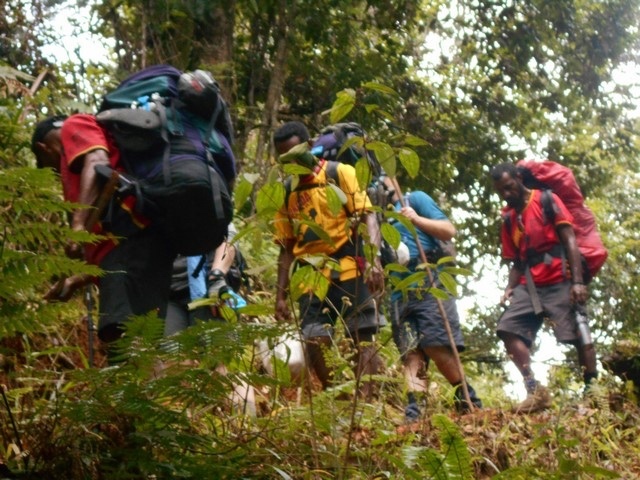 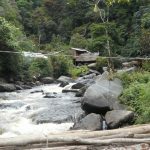 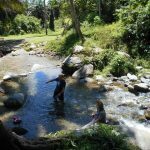 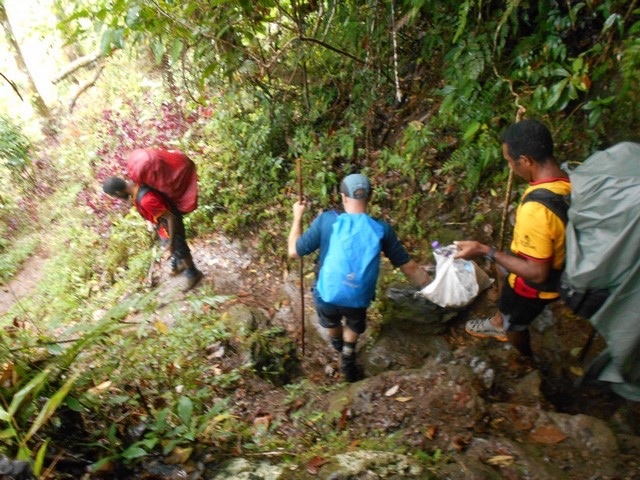 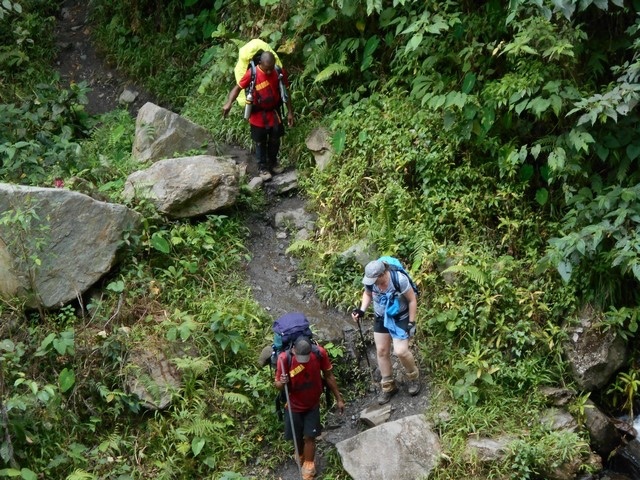 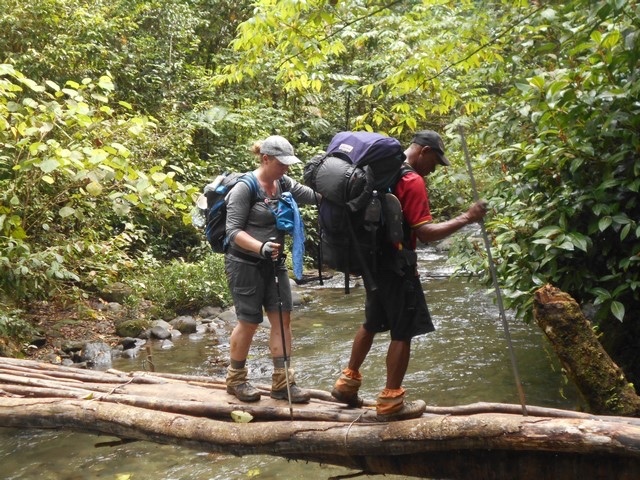 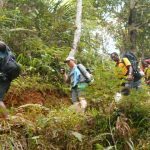 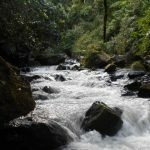 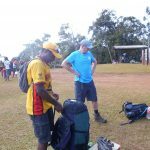 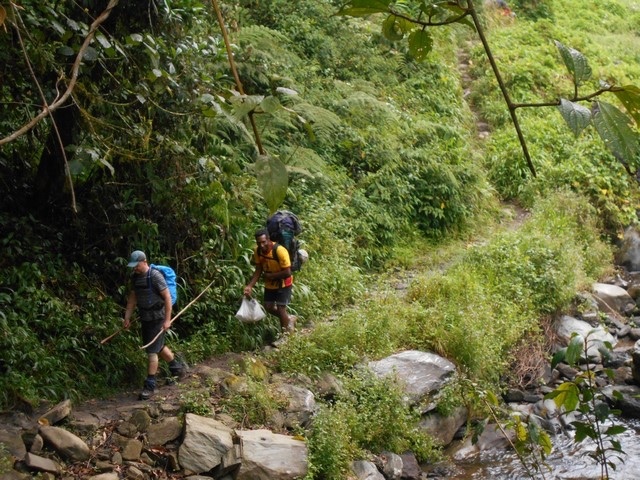 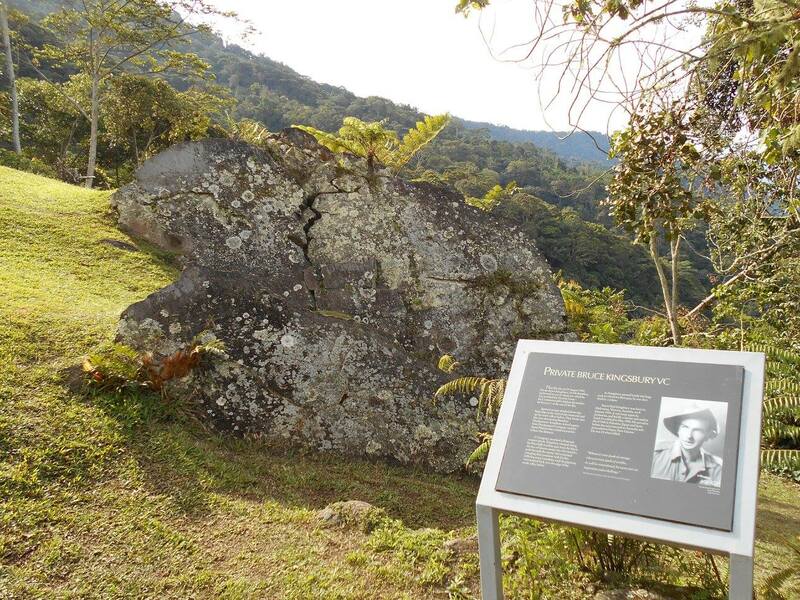 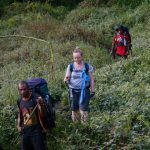 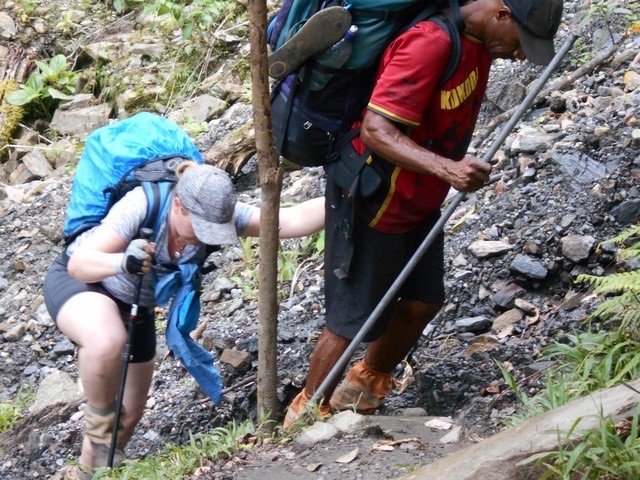 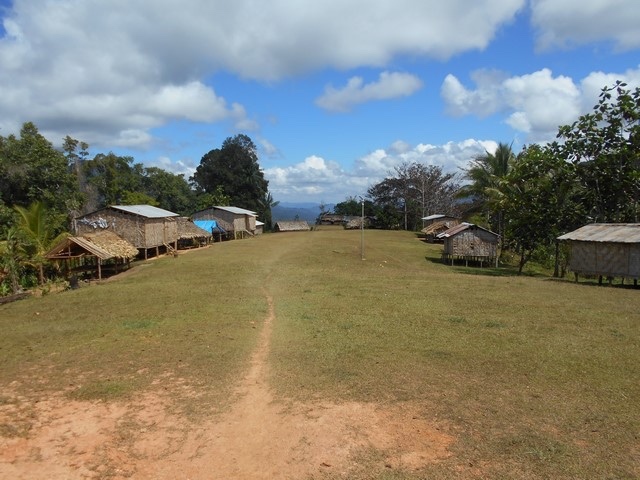 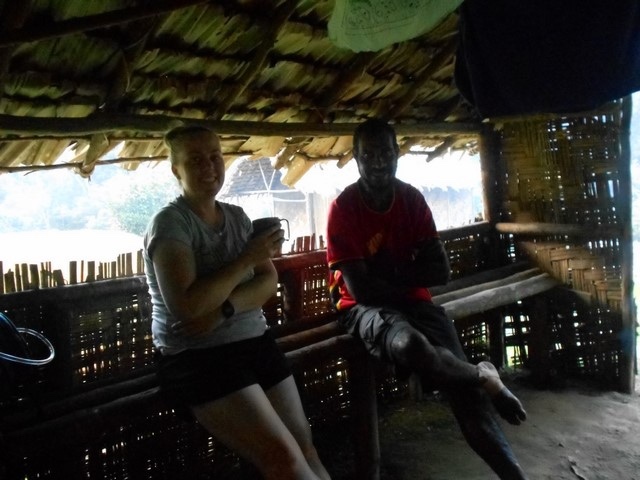 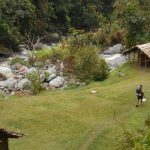 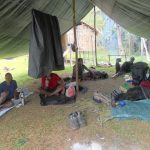 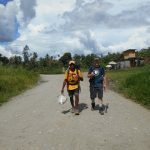 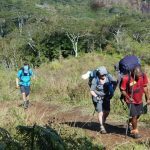 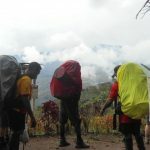 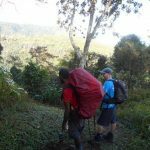 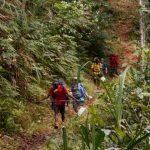 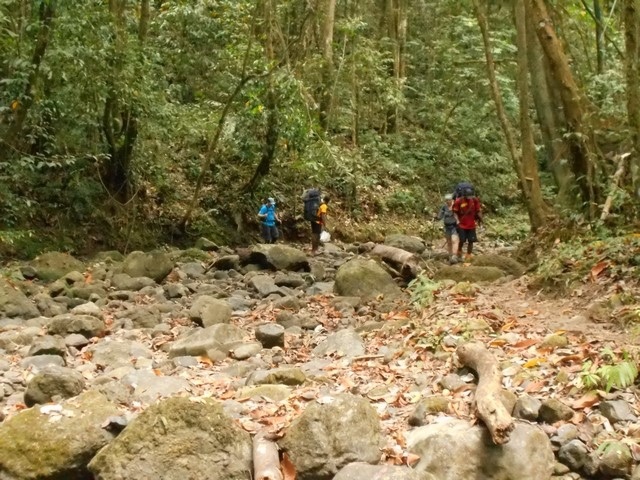 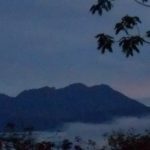 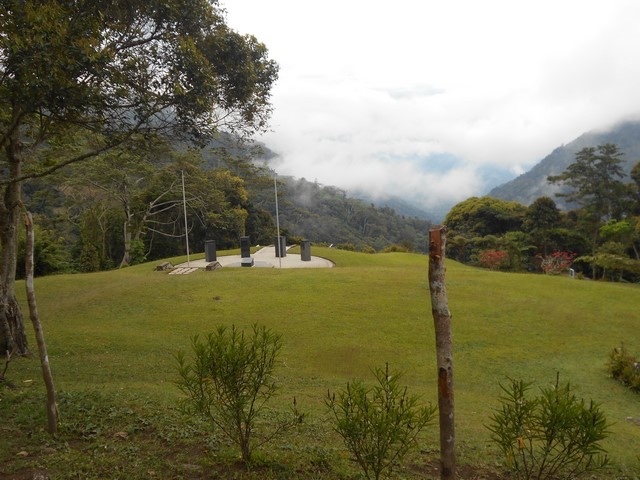 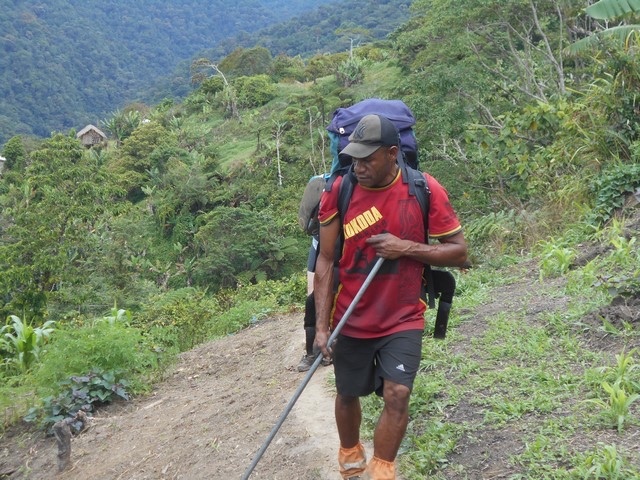 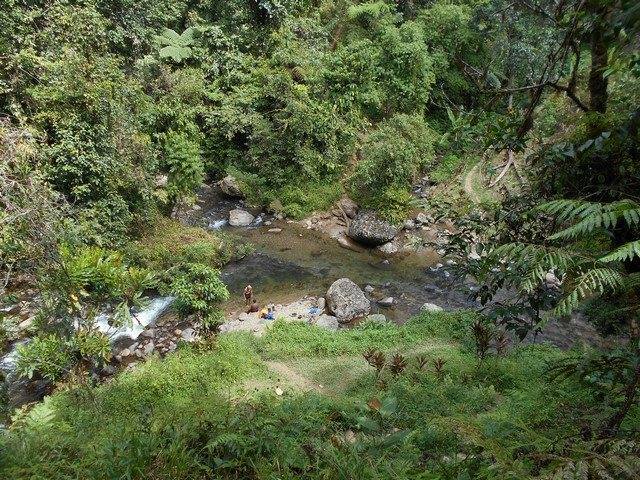 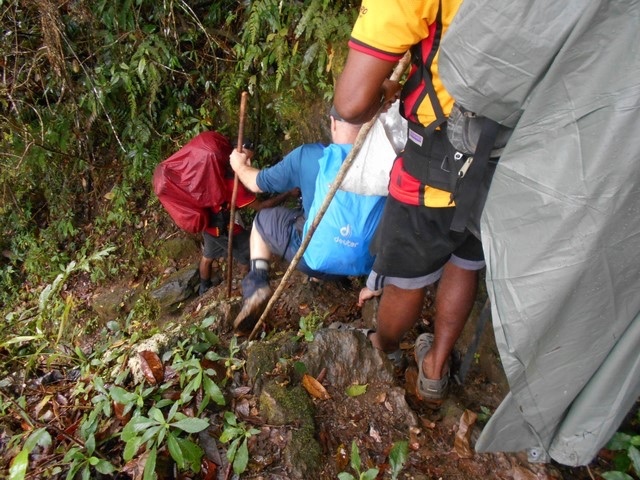 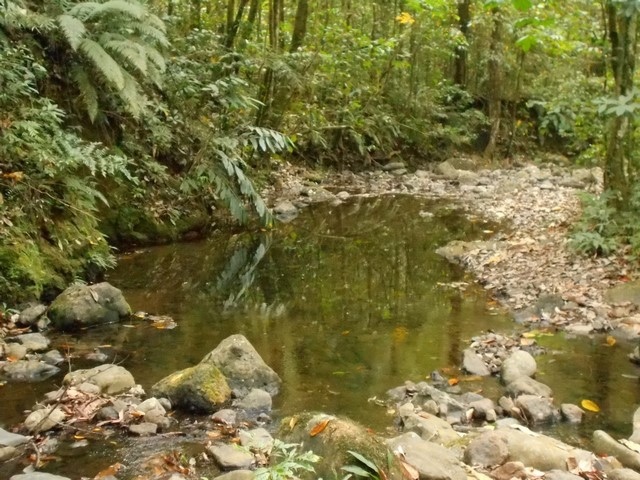 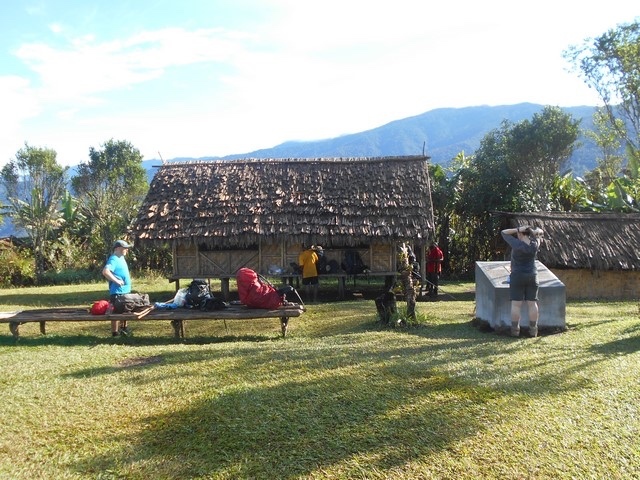 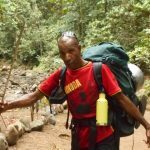 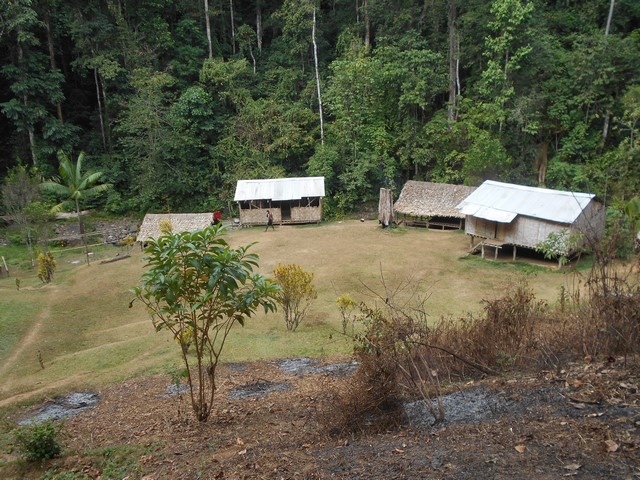 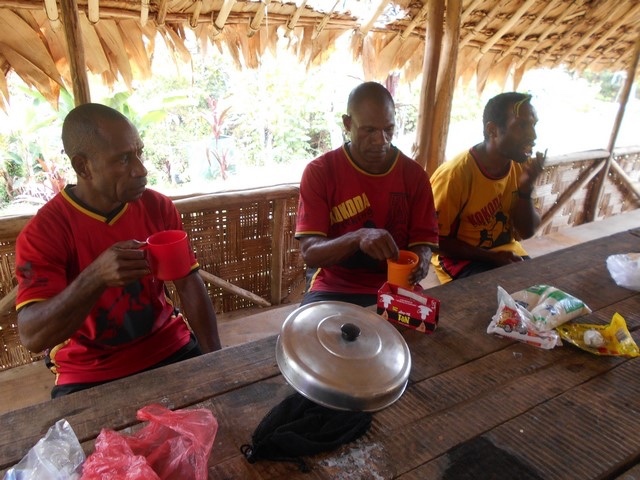 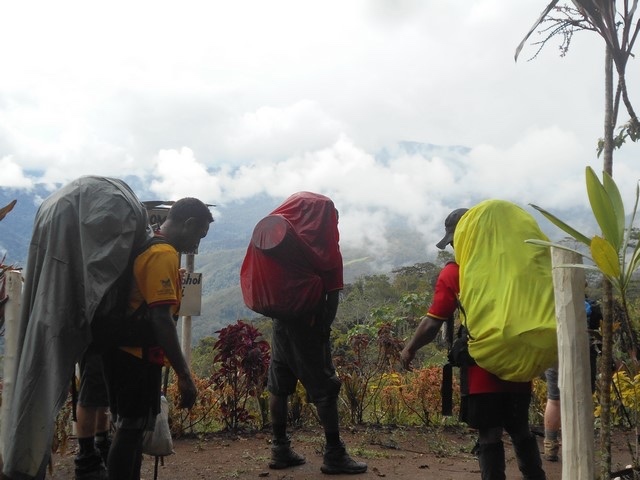 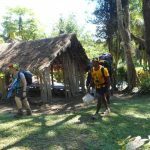 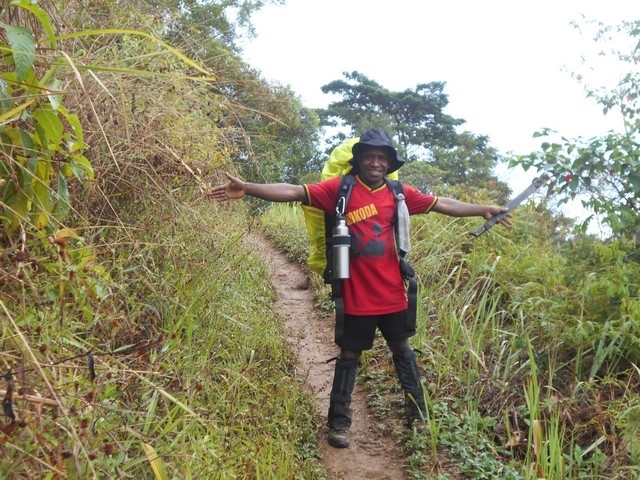 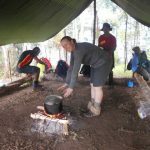 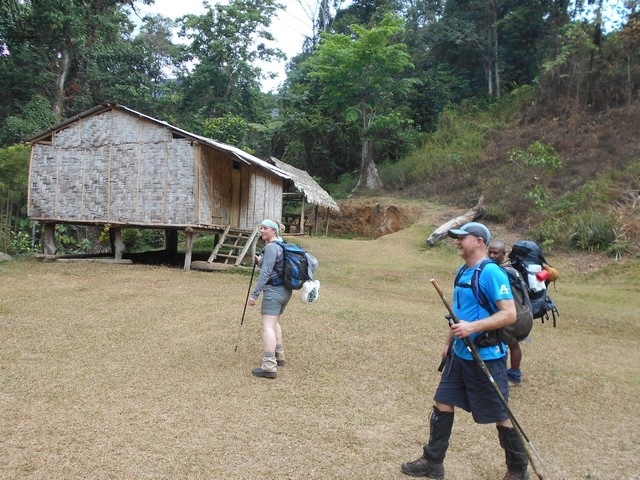 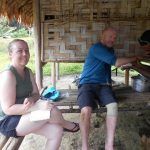 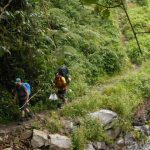 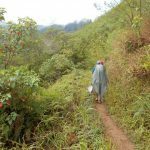 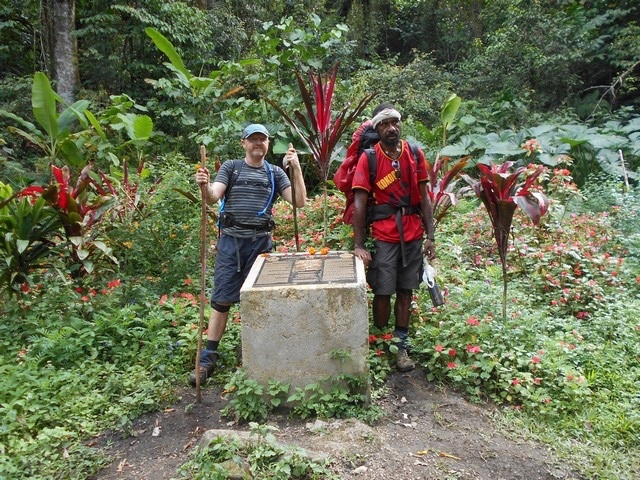 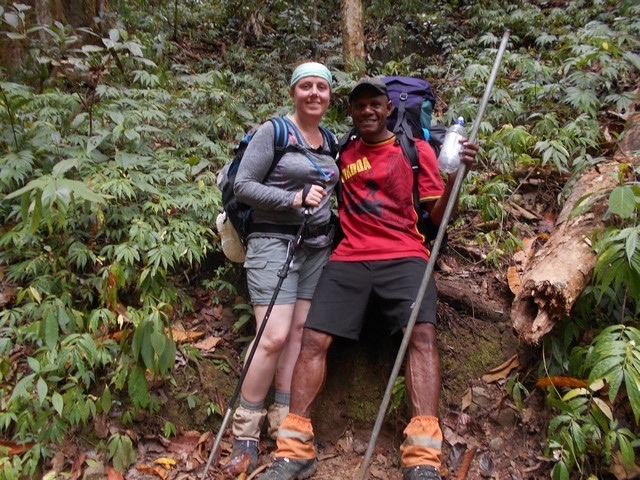 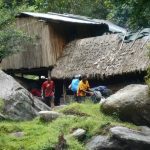 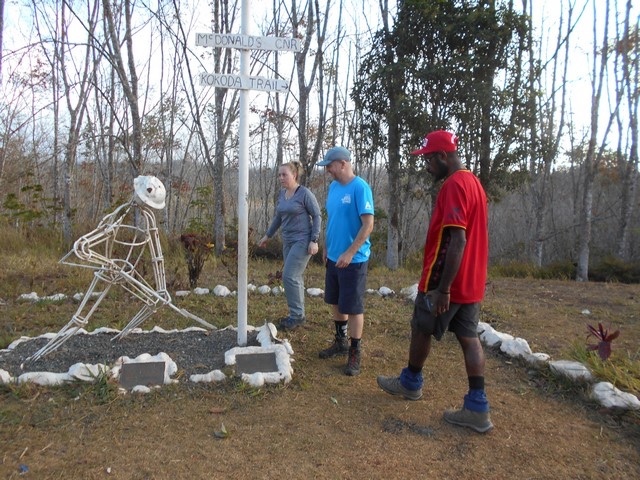 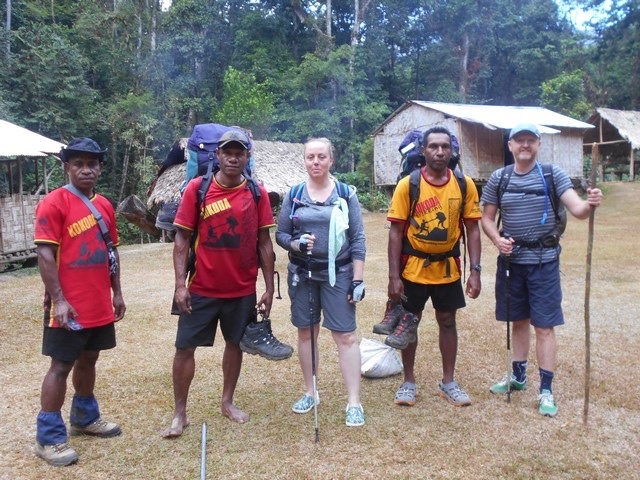 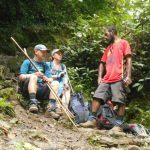 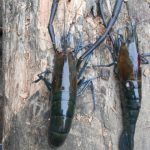 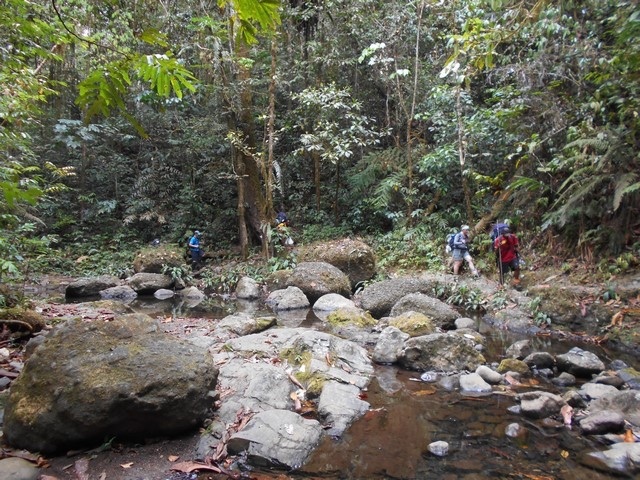 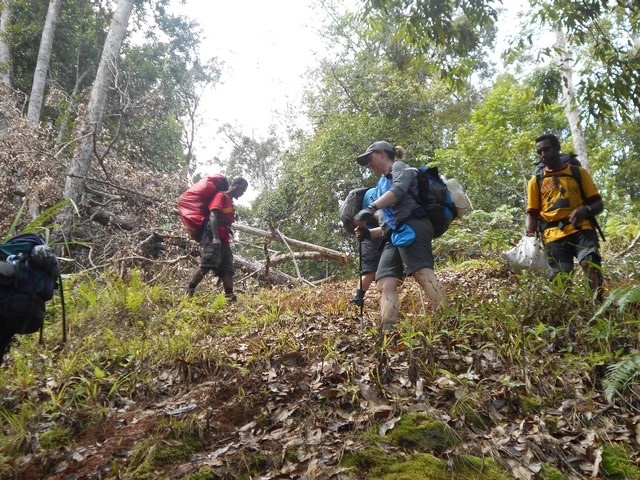 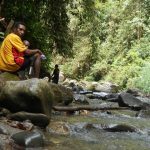 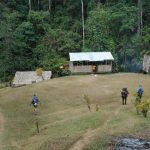 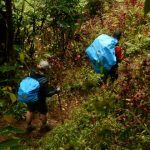 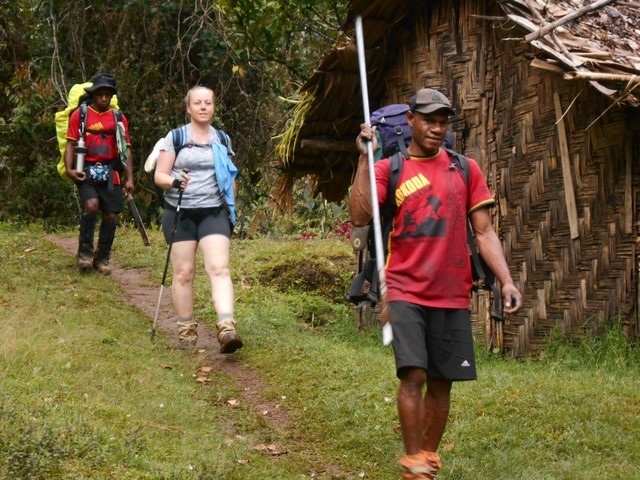 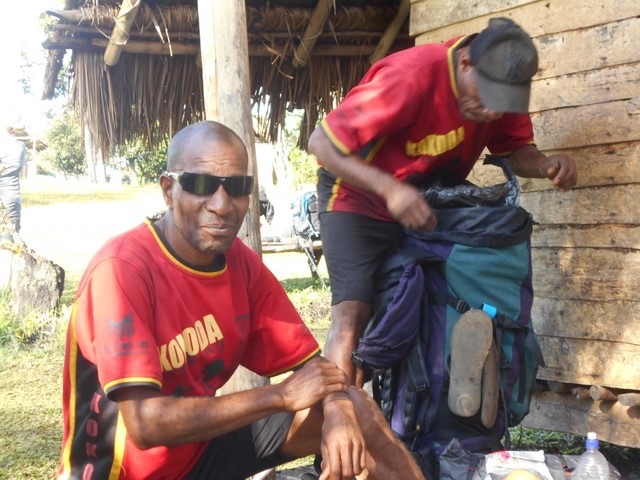 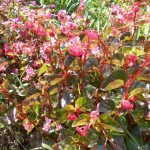 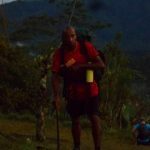 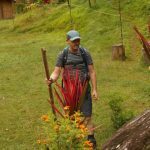 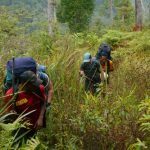 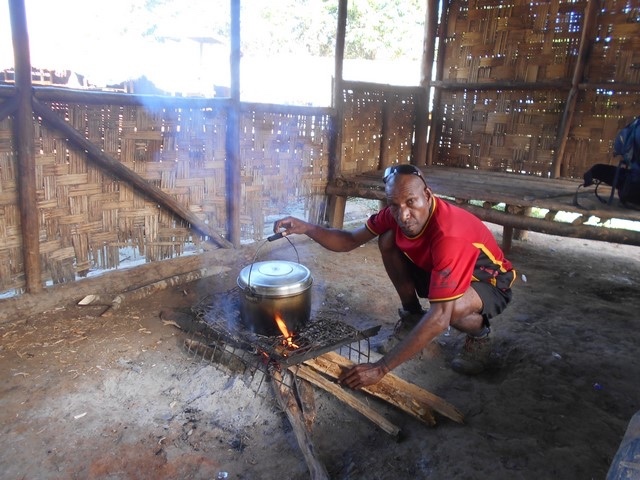 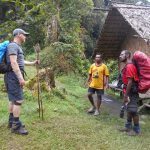 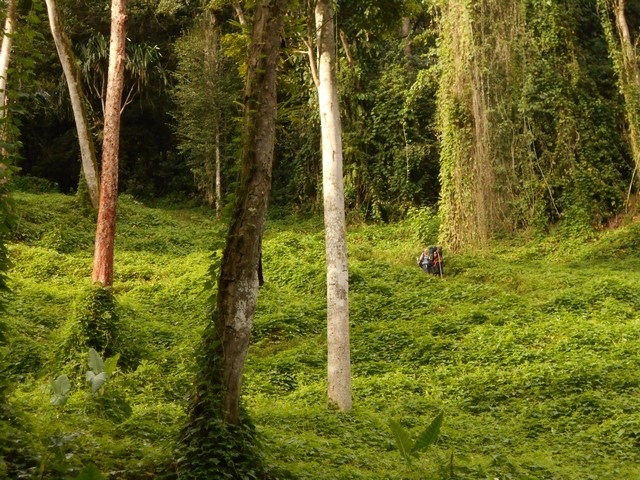 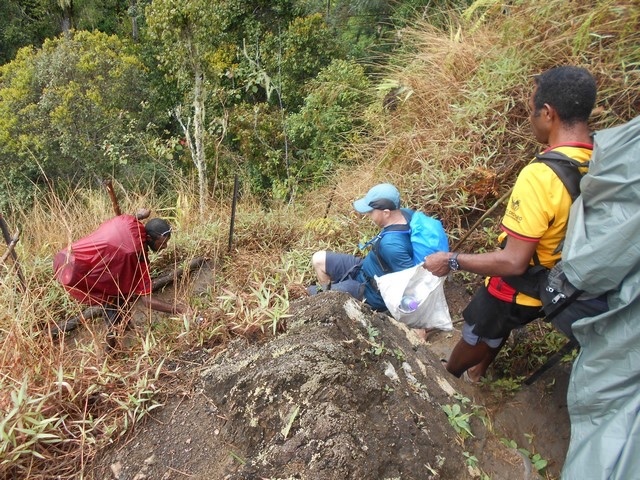 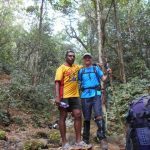 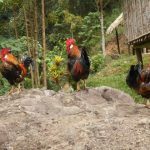 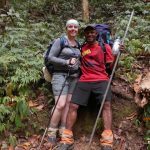 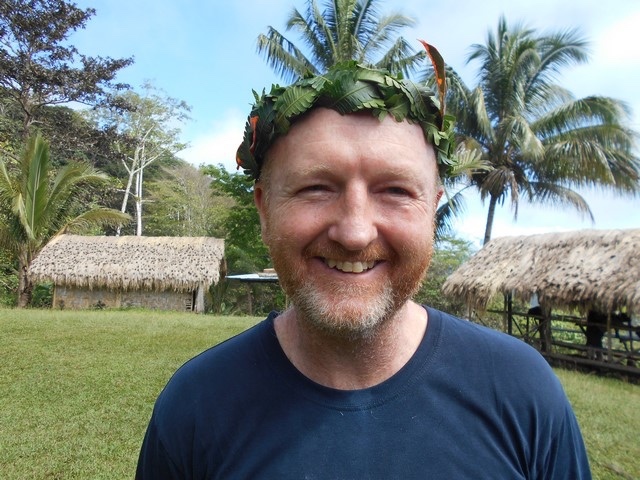 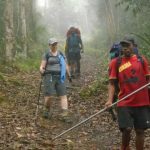 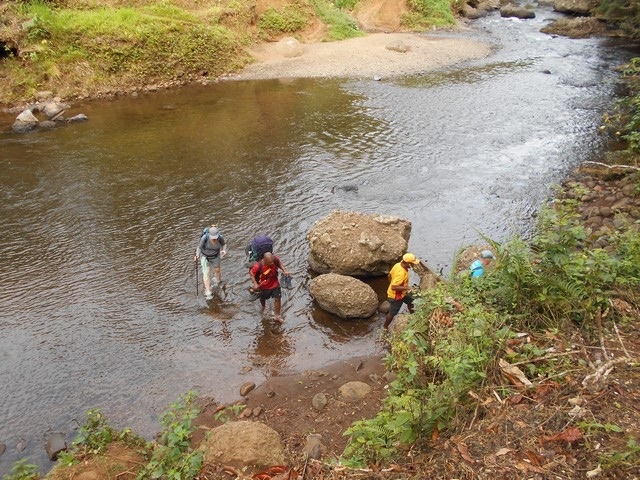 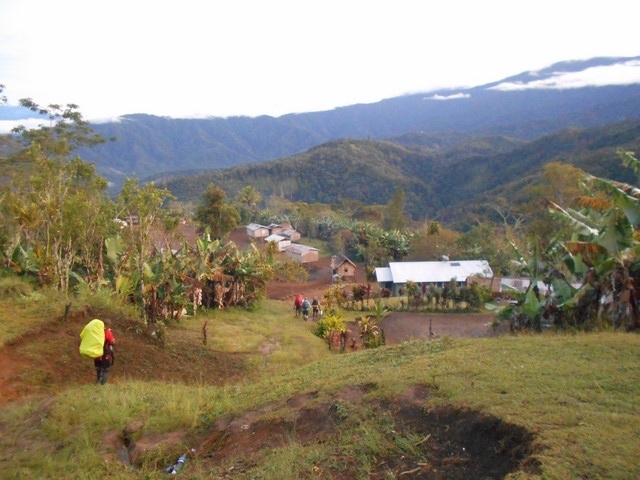 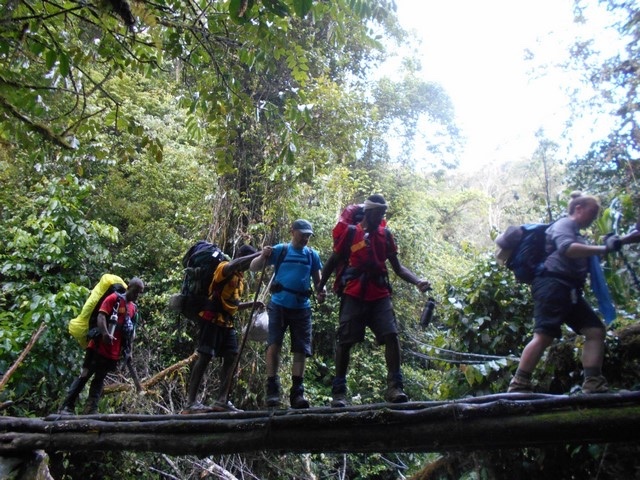 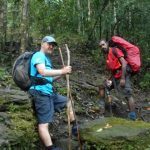 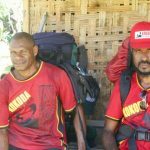 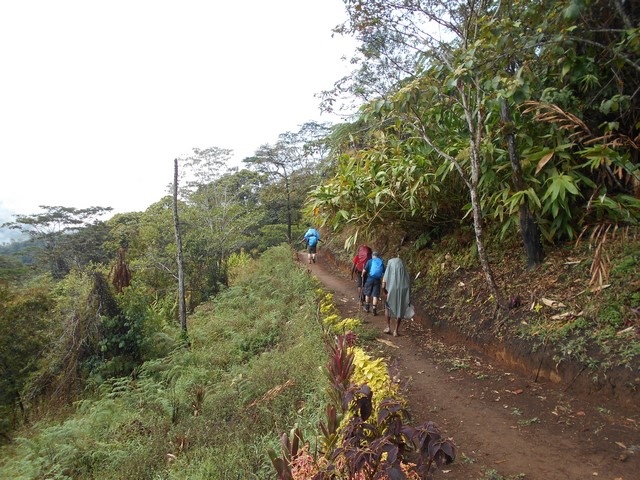 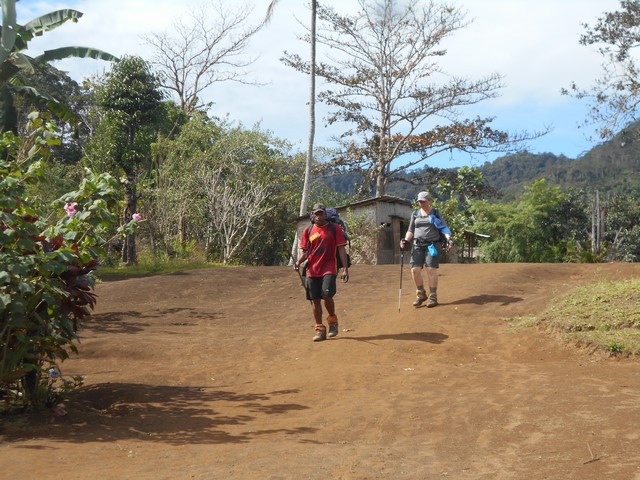 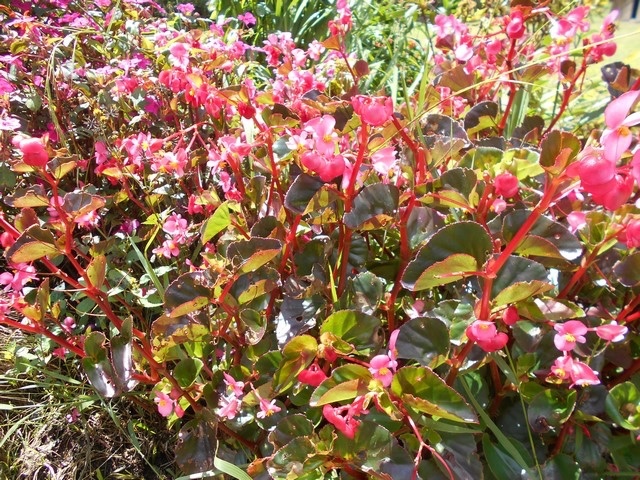 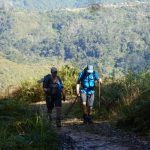 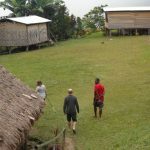 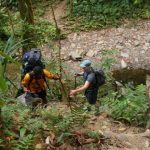 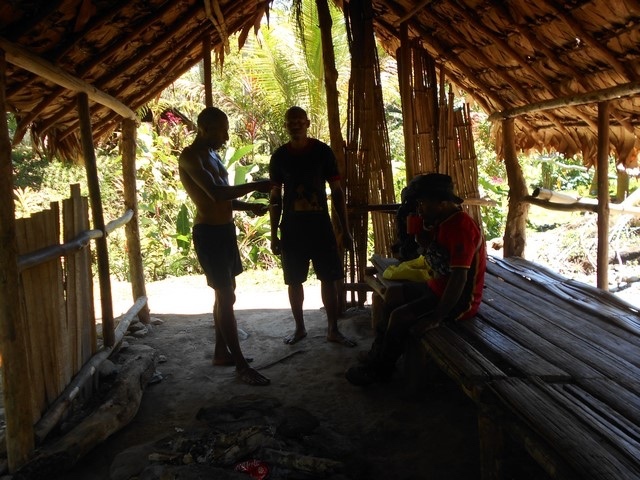 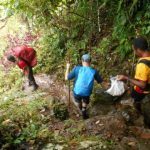 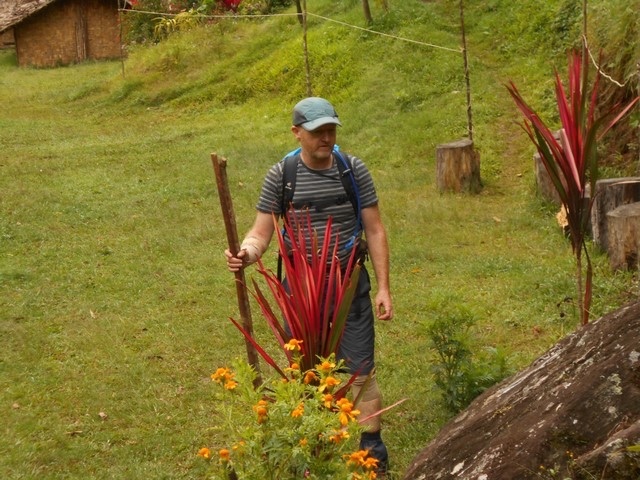 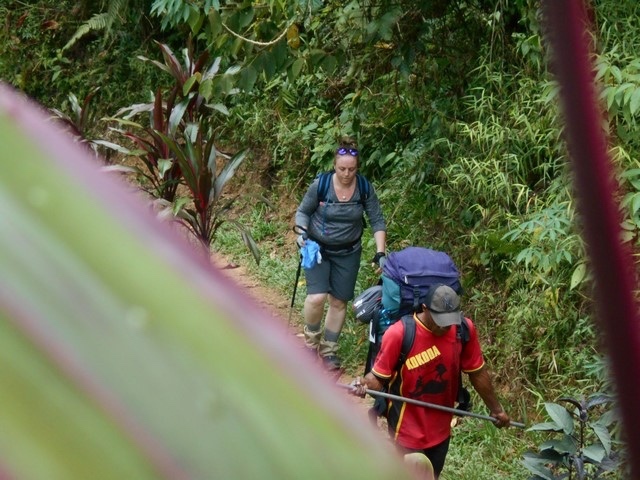 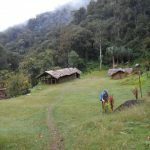 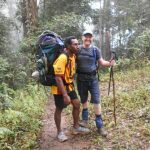 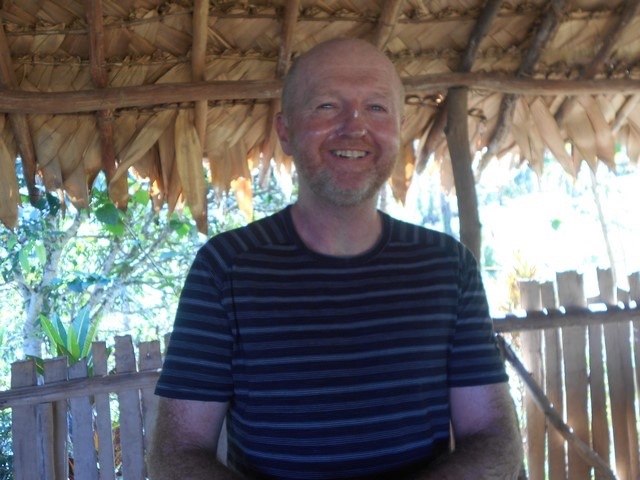 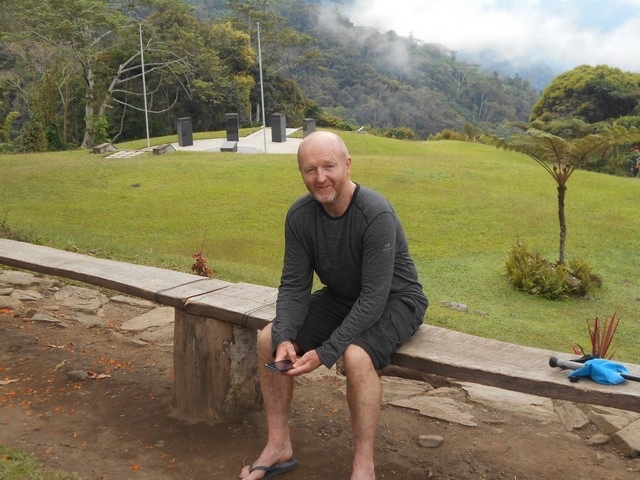 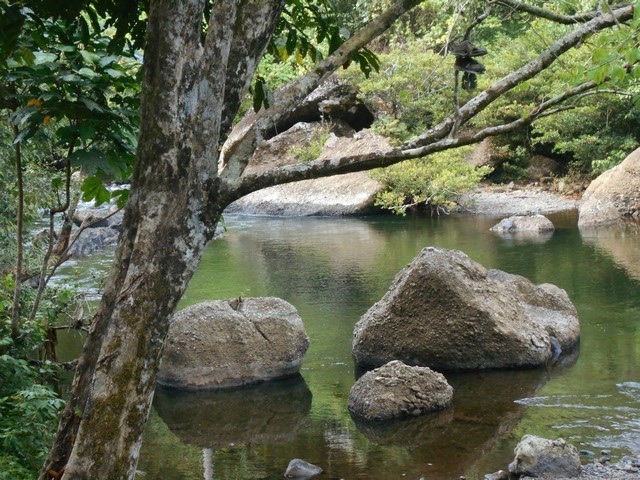 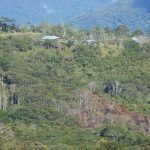 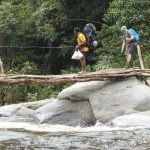 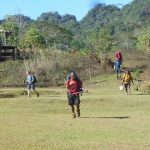 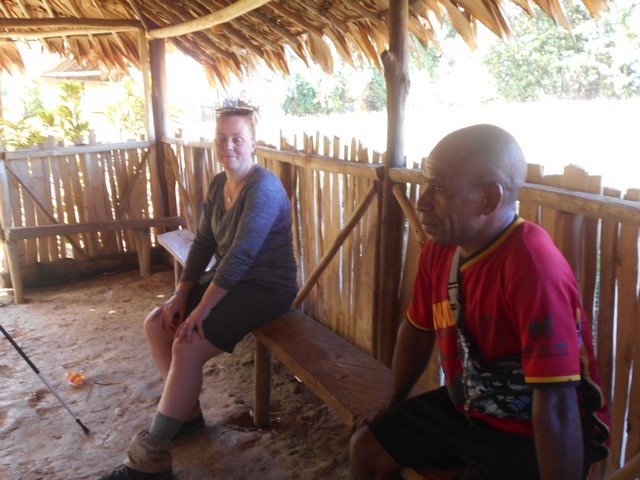 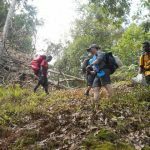 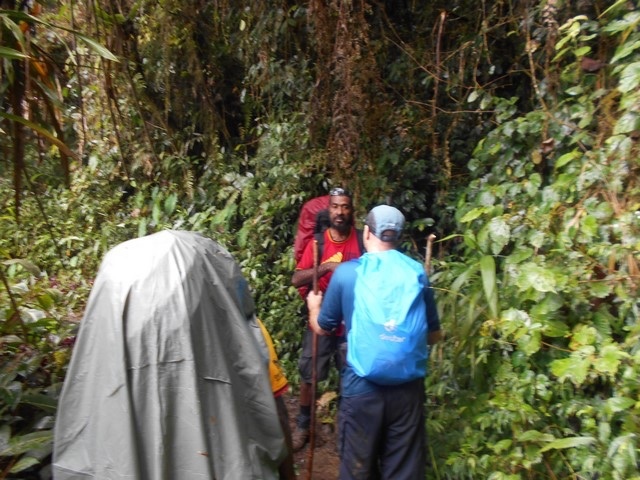 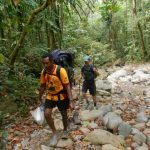 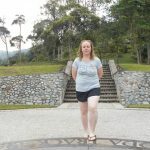 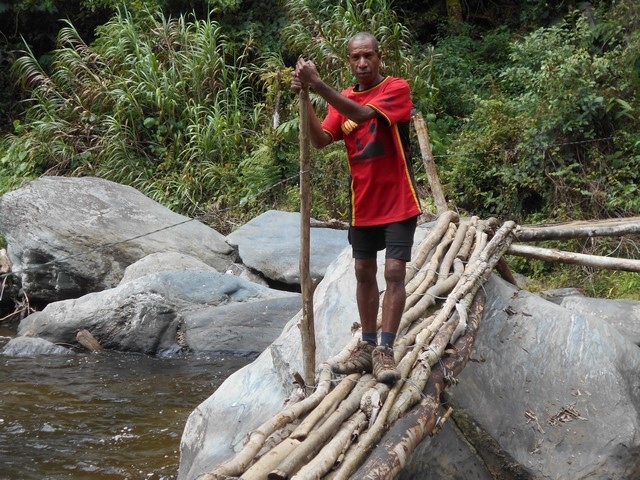 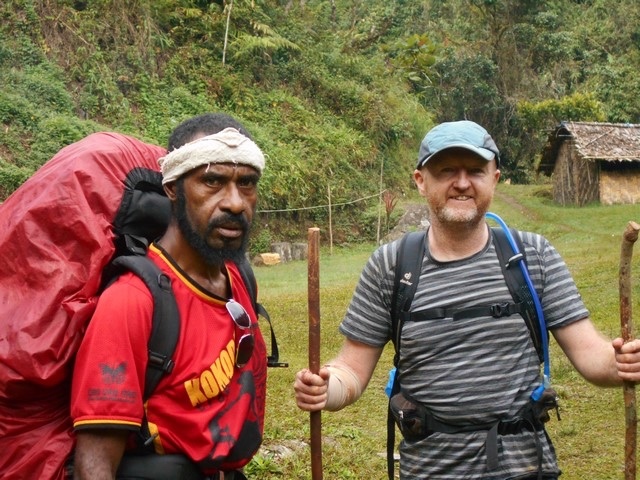 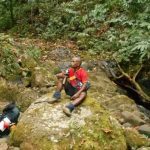 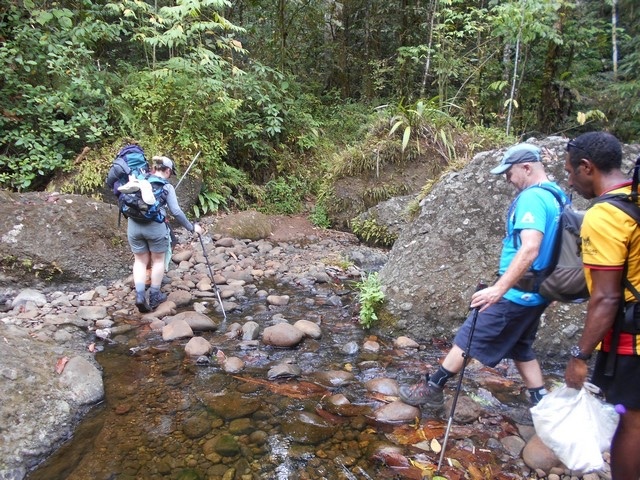 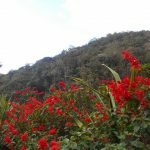 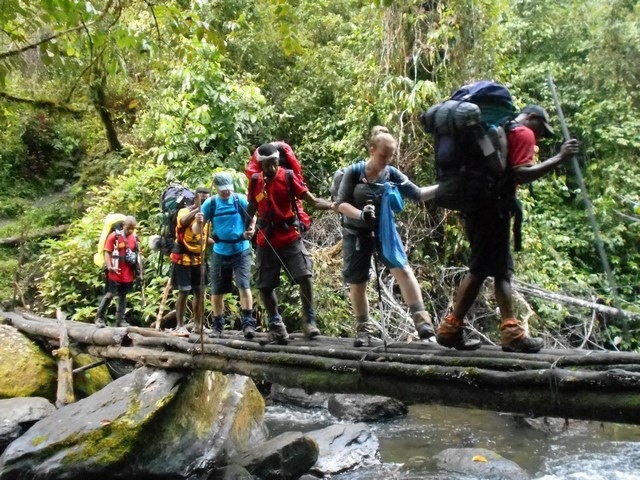 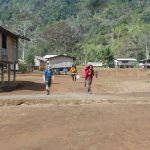 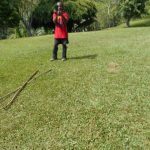 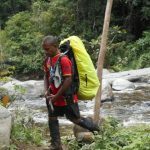 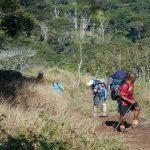 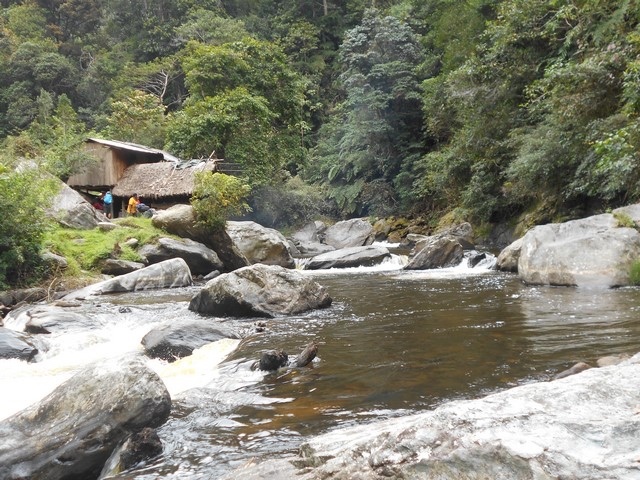 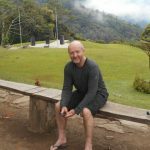 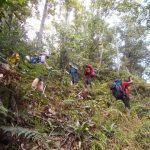 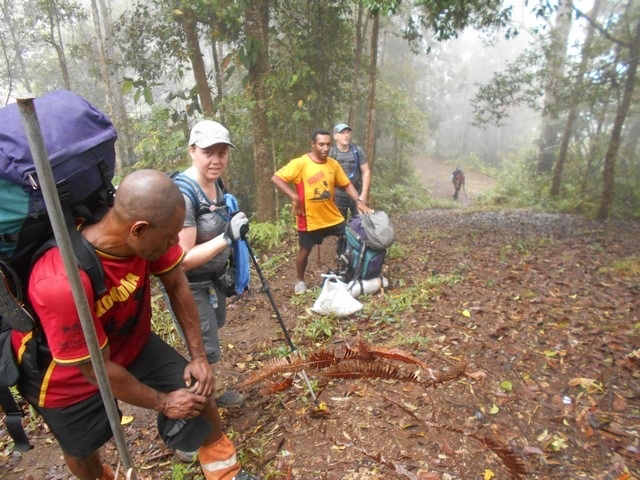 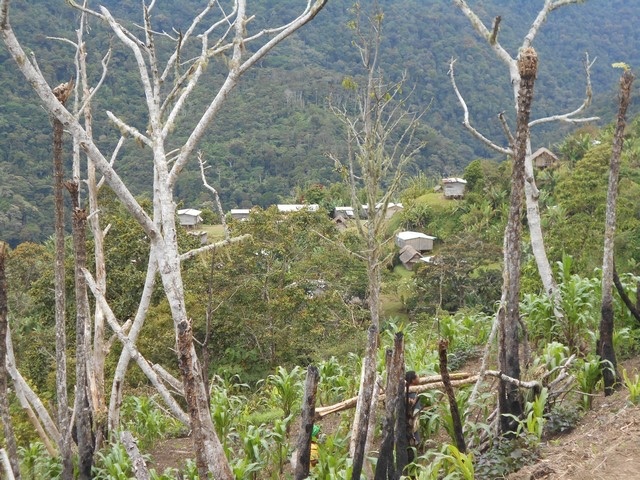 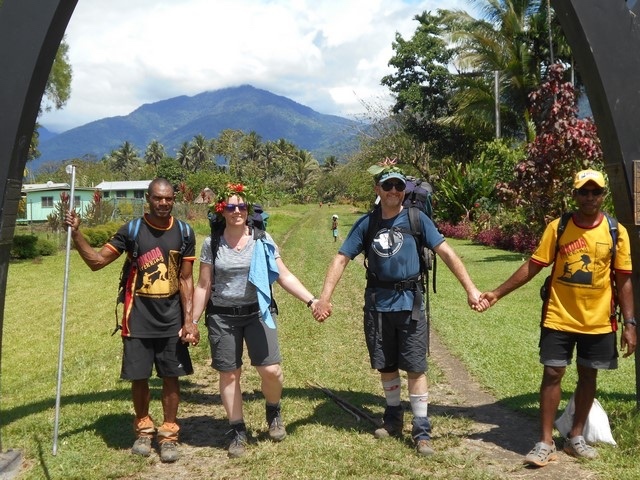 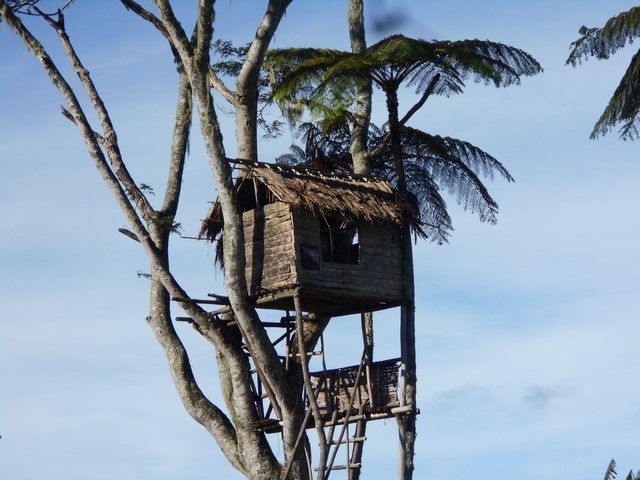 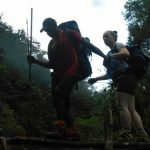 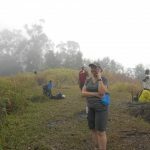 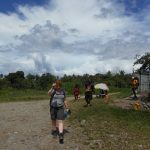 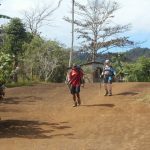 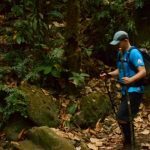 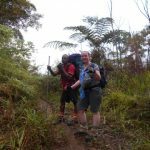 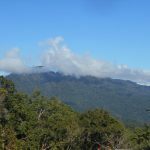 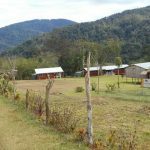 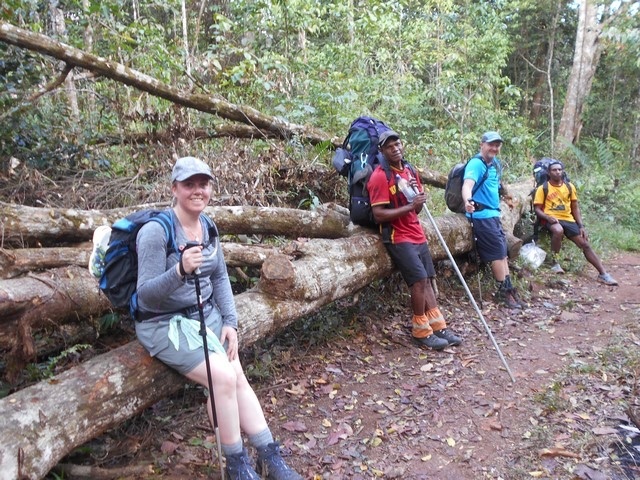 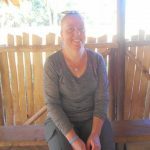 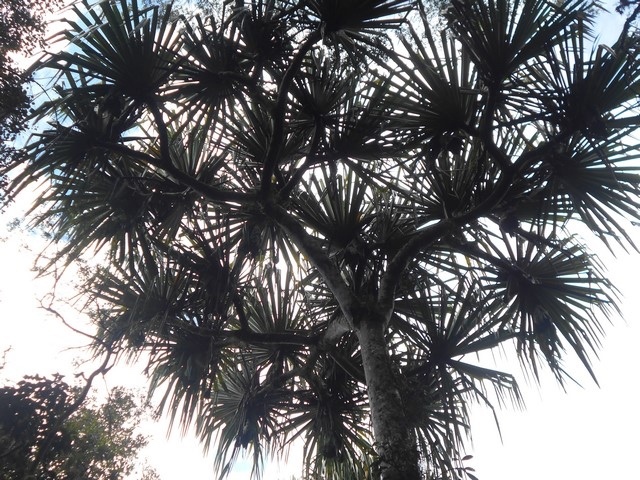 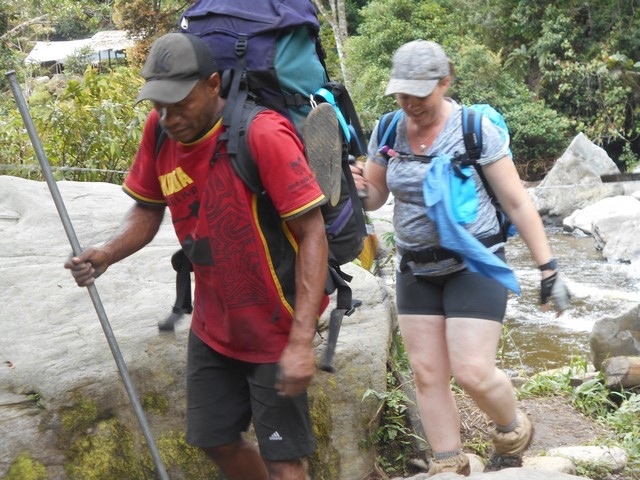 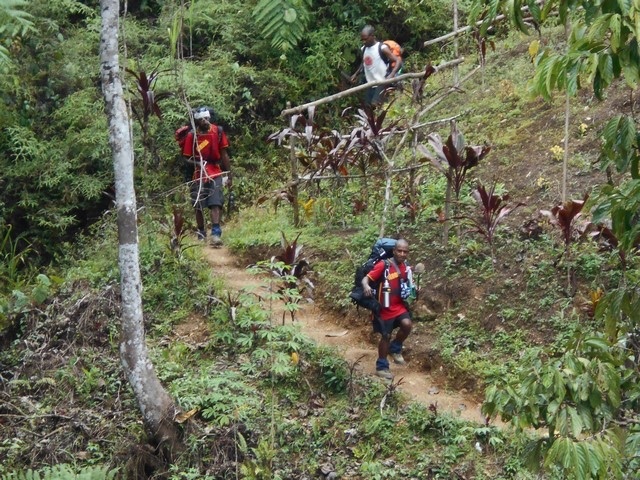 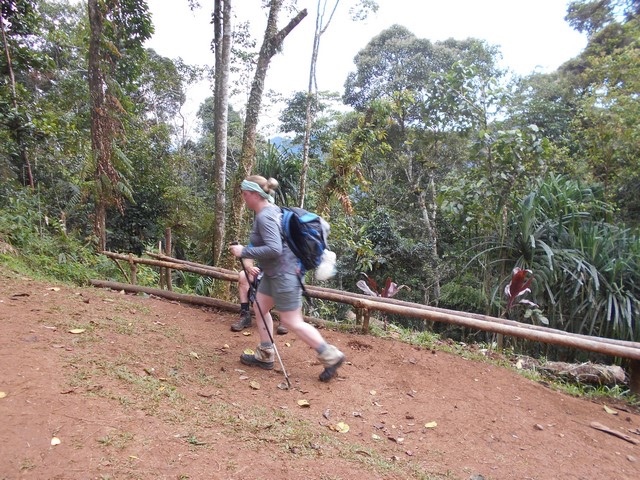 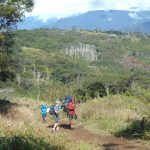 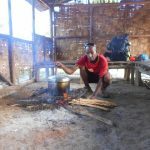 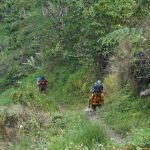 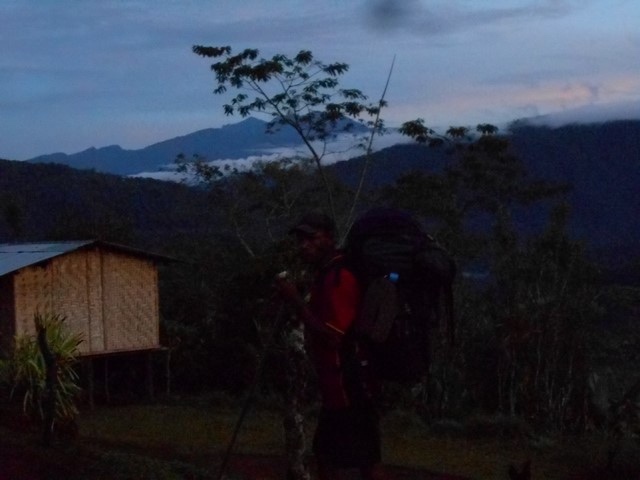 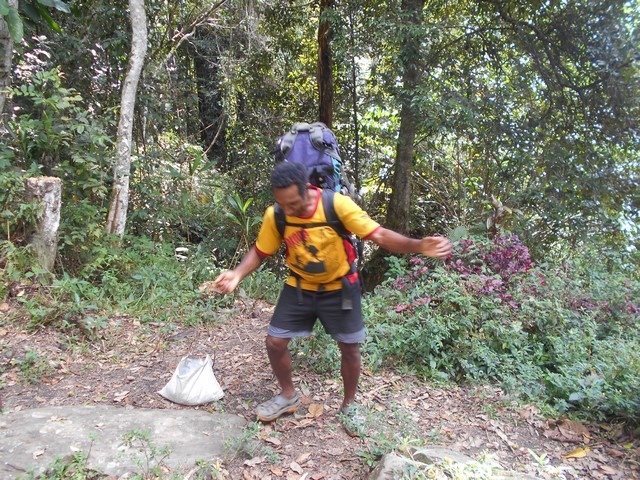 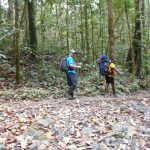 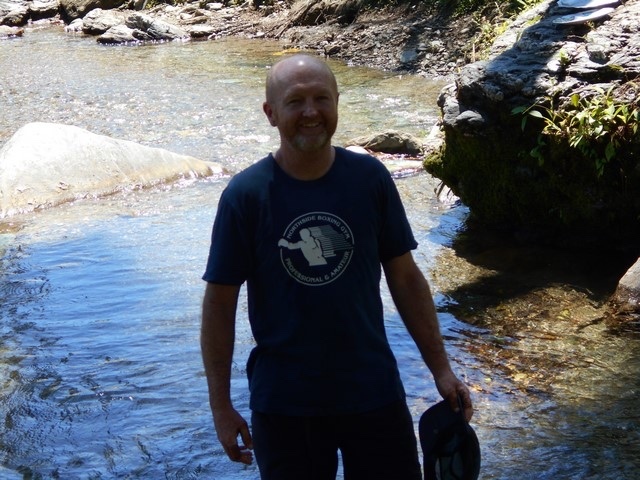 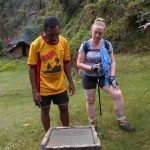 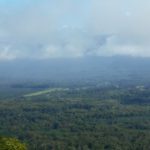 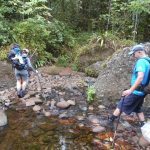 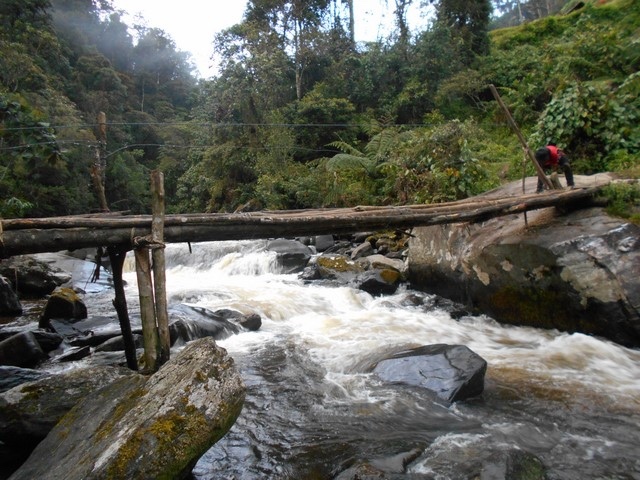 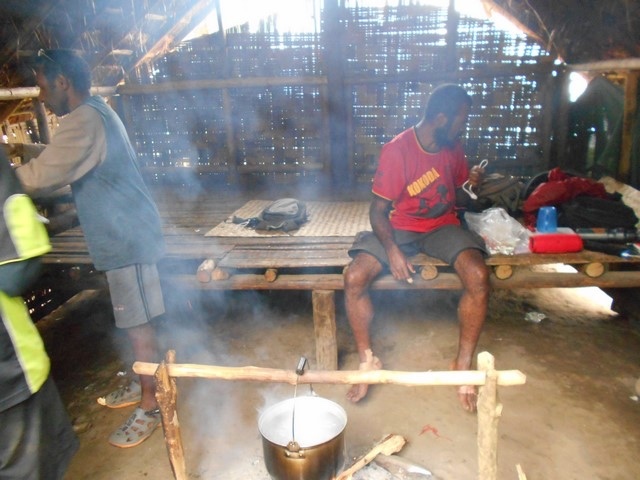 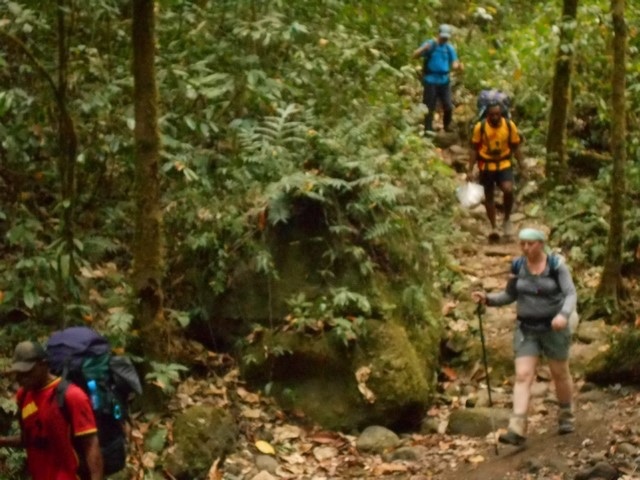 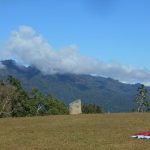 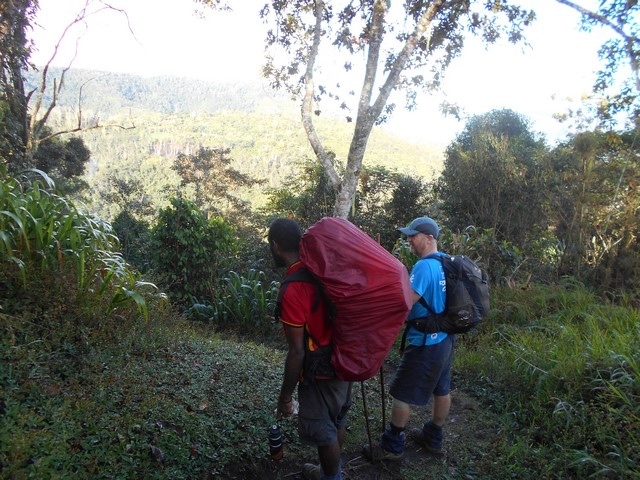 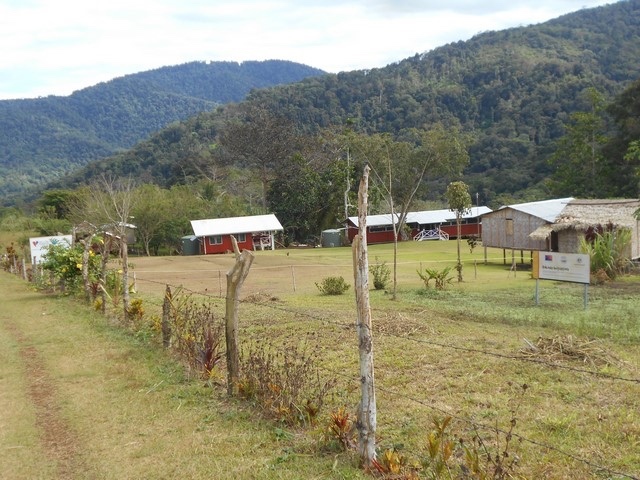 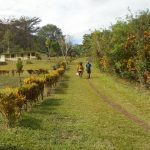 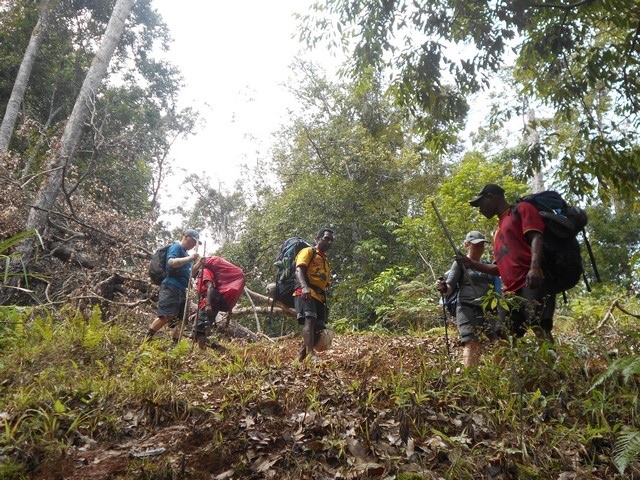 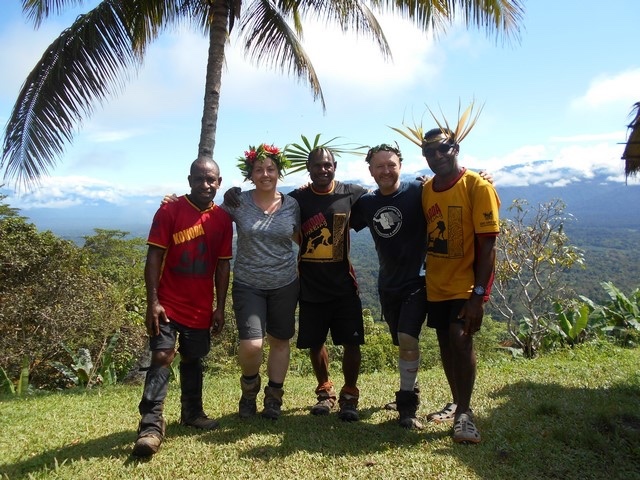 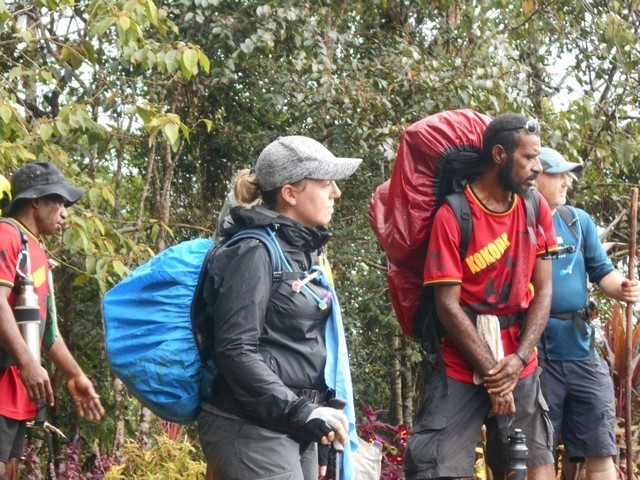 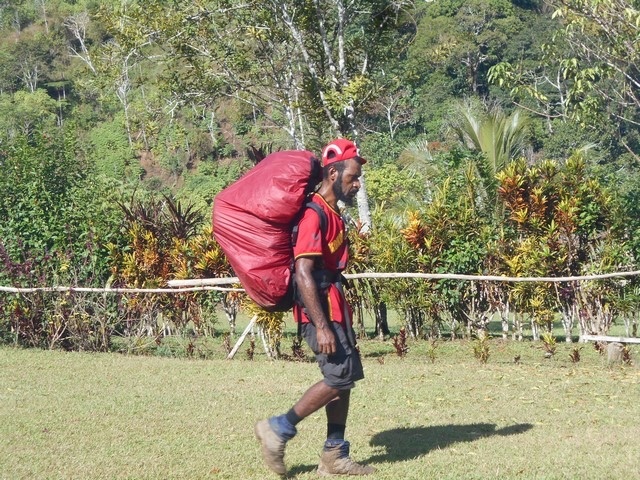 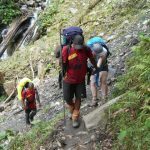 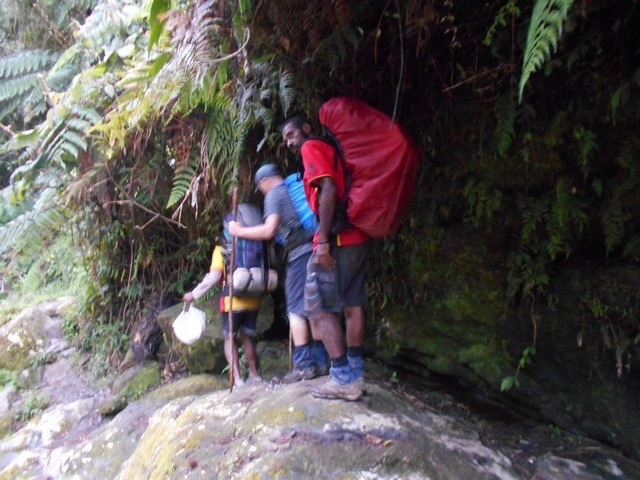 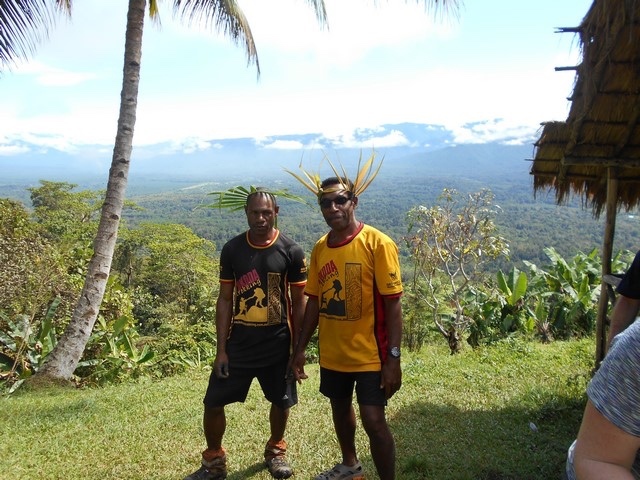 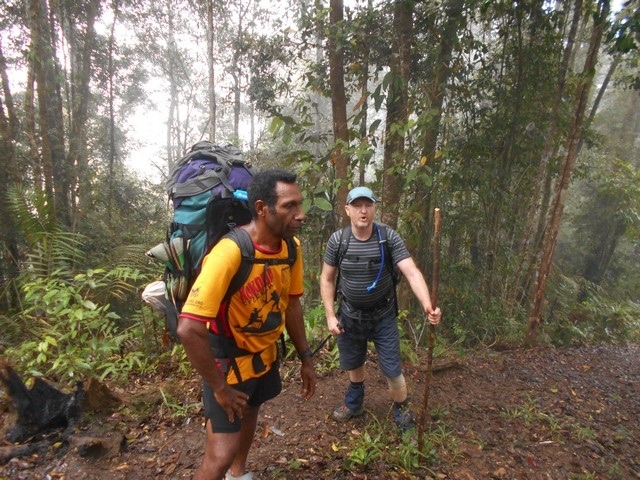 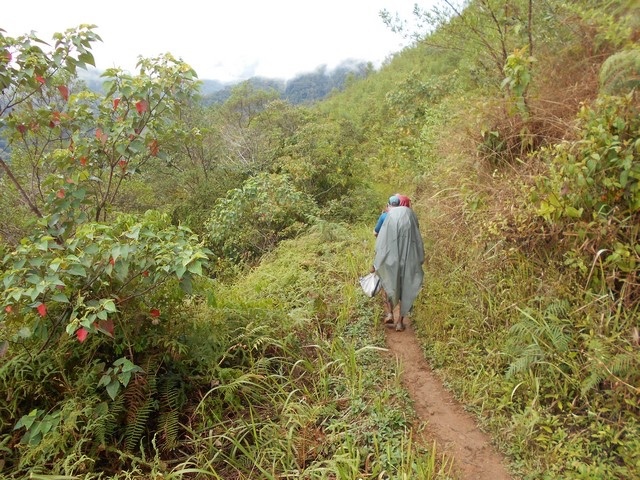 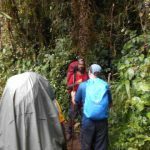 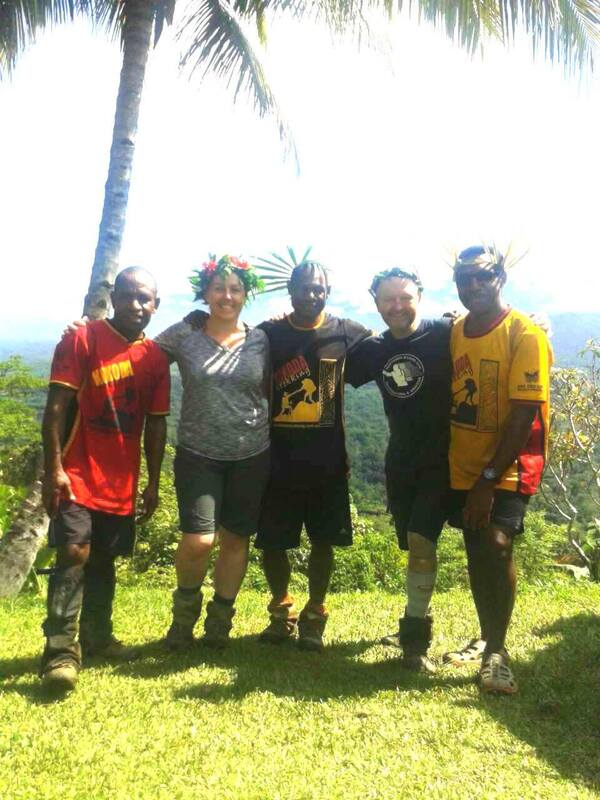 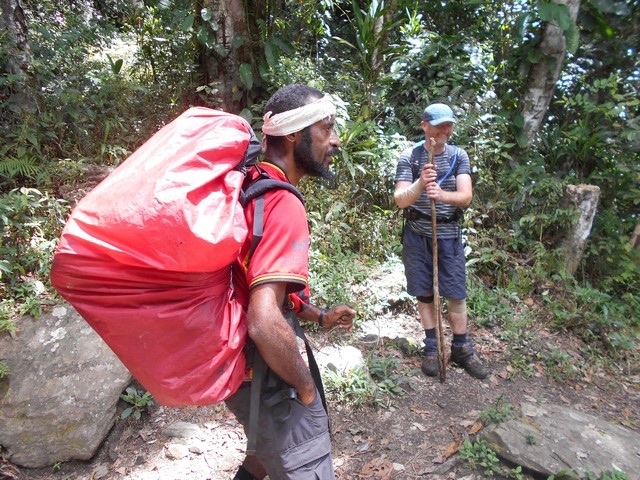 The guide on this trek is Ivan Semie from Saga Village in Kokoda. 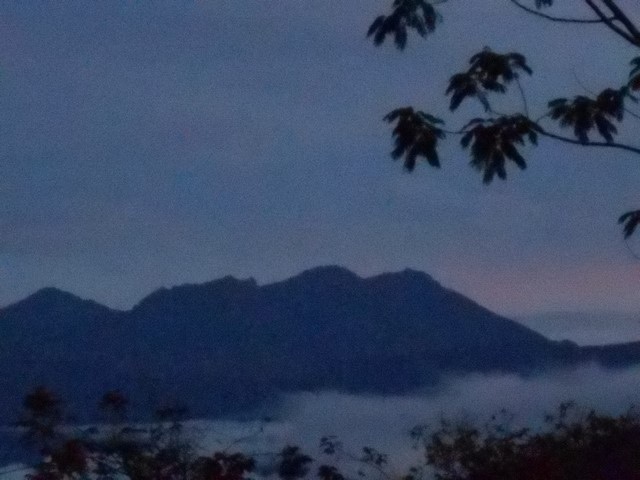 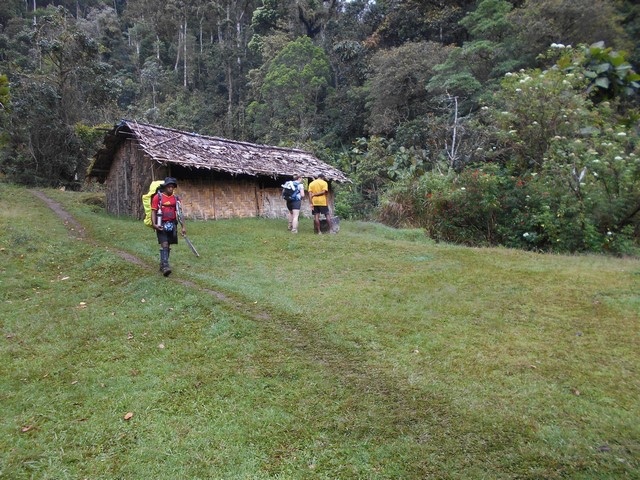 Trek 1130: Tonight this trek finds themselves at Agulogo for the night. 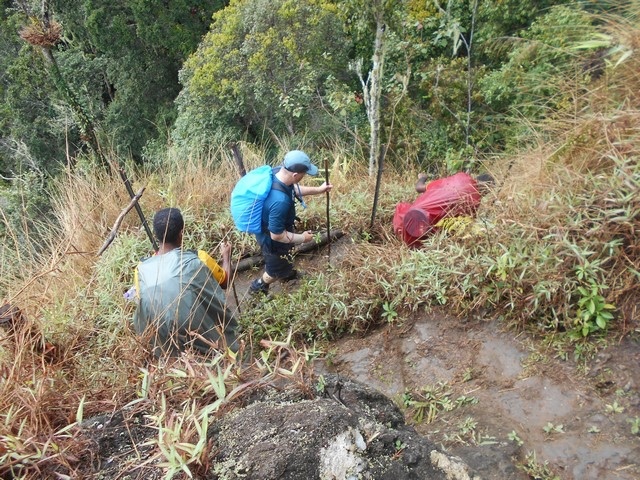 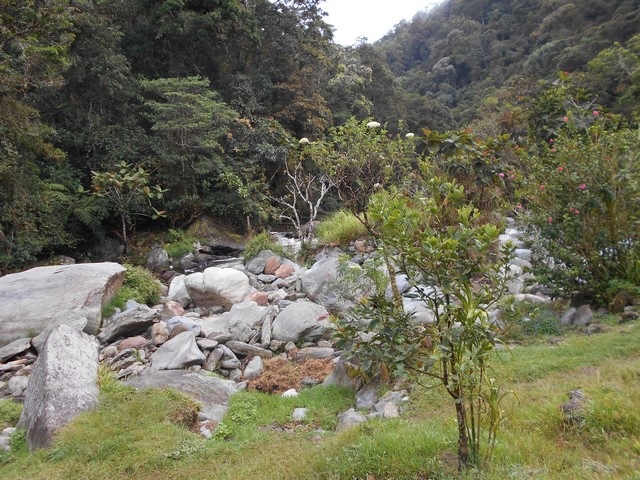 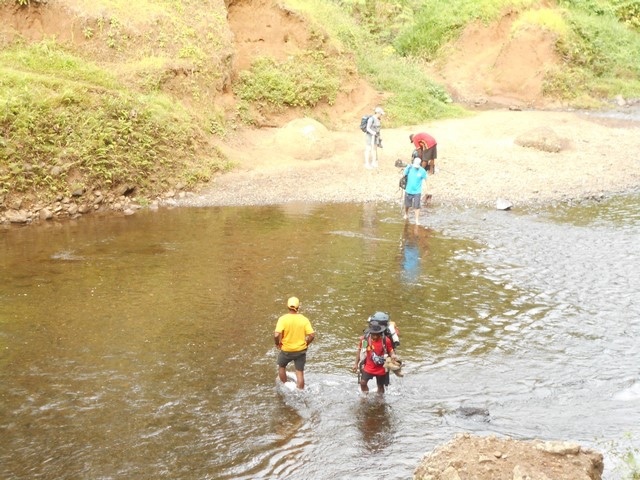 Apparently a wet and slippery trek so instead of pushing on to Menari, Ivan decided to pull the group up at Agulogo. 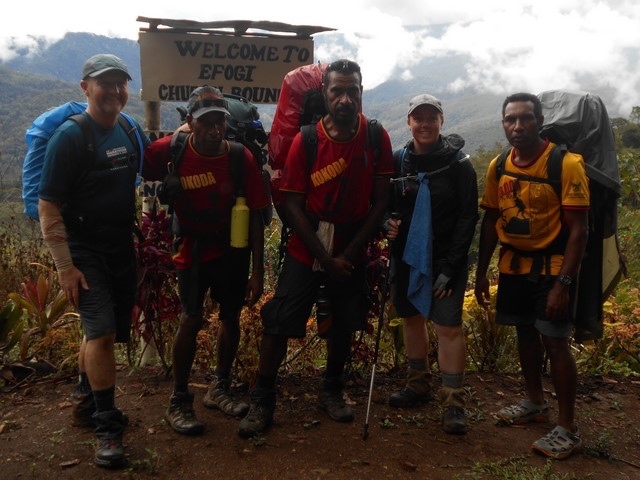 Tomorrow they will head to Efogi II. 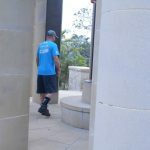 He said everyone is doing just great. 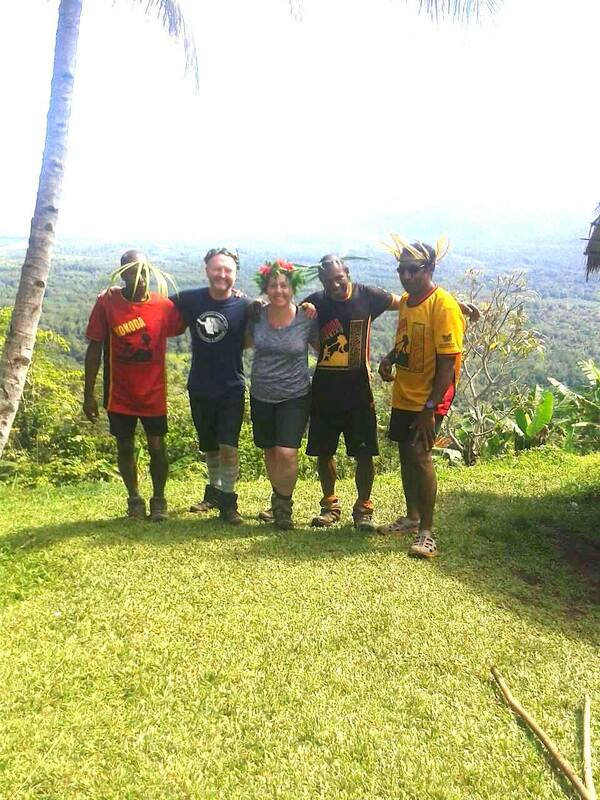 Trek 1130: This afternoon I got to speak to Ivan, Katrina and Richard. 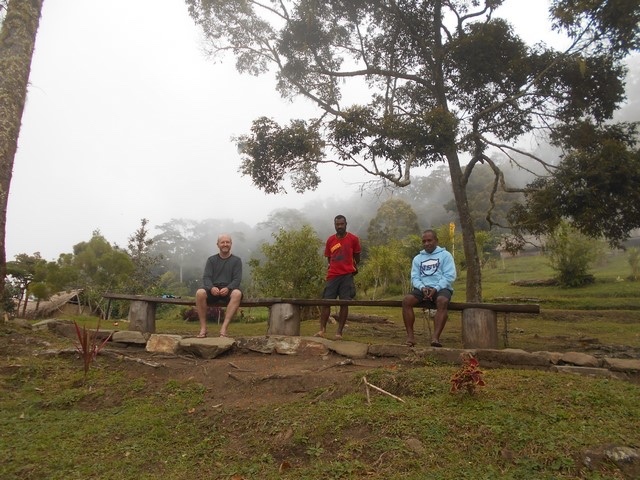 Ivan said they are now at Efogi II, that its wet but all of them did well today. 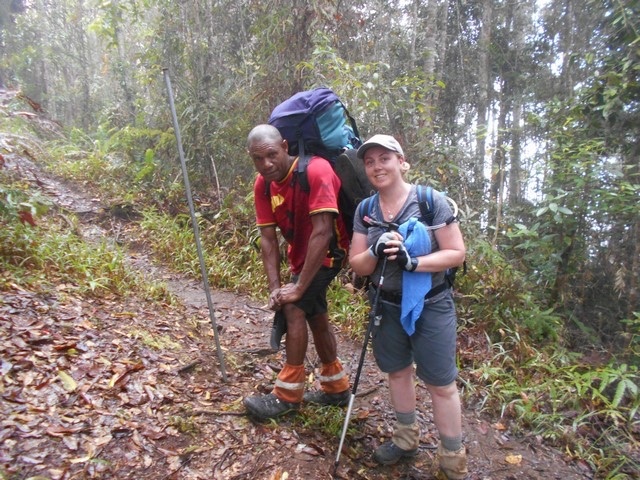 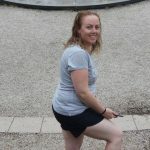 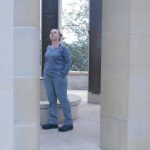 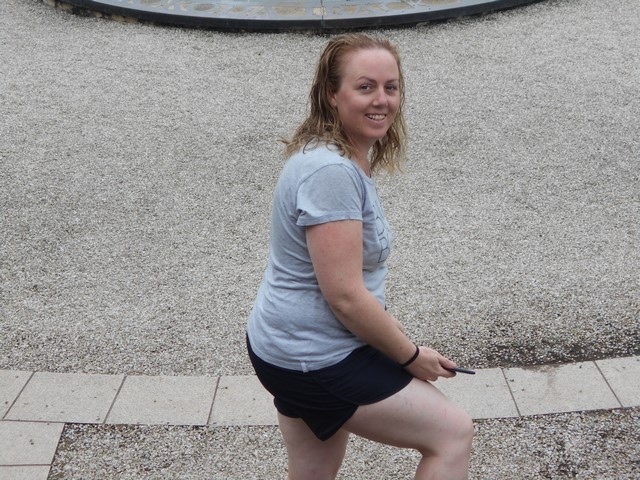 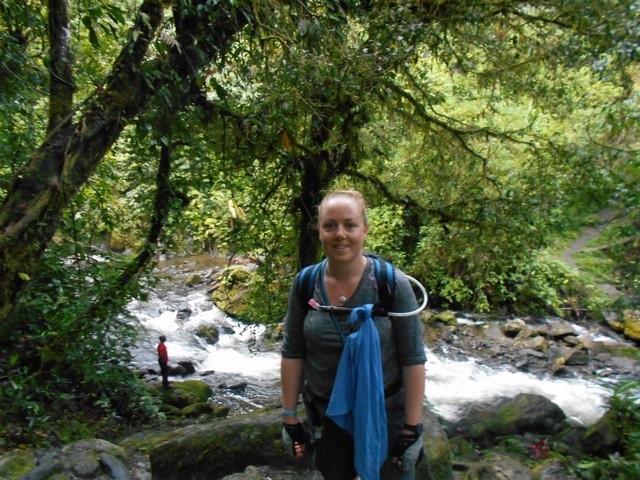 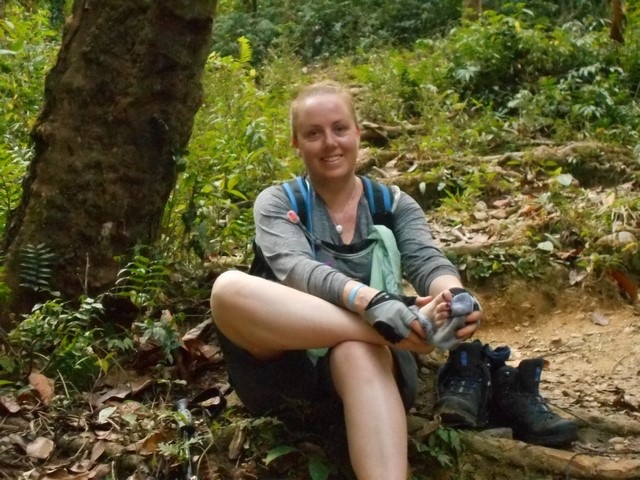 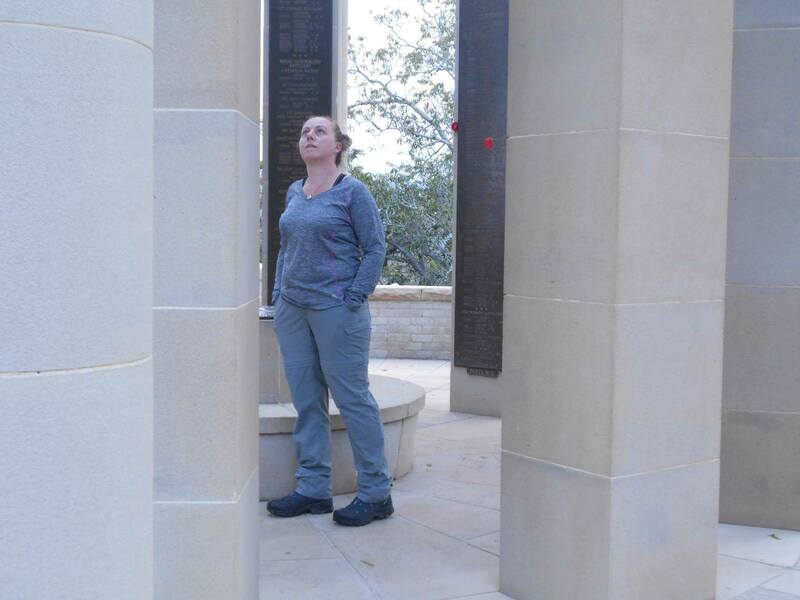 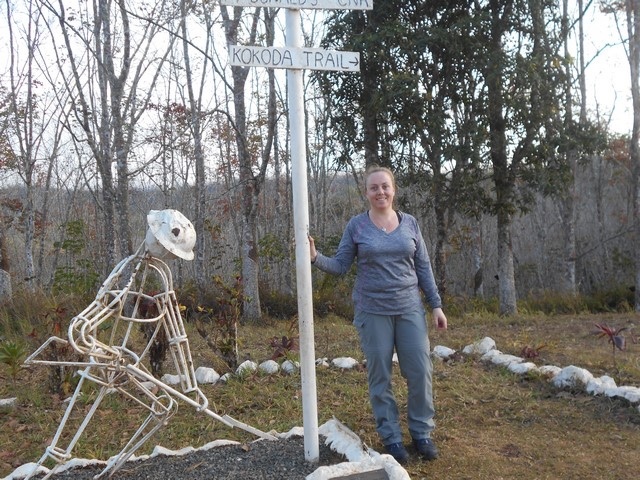 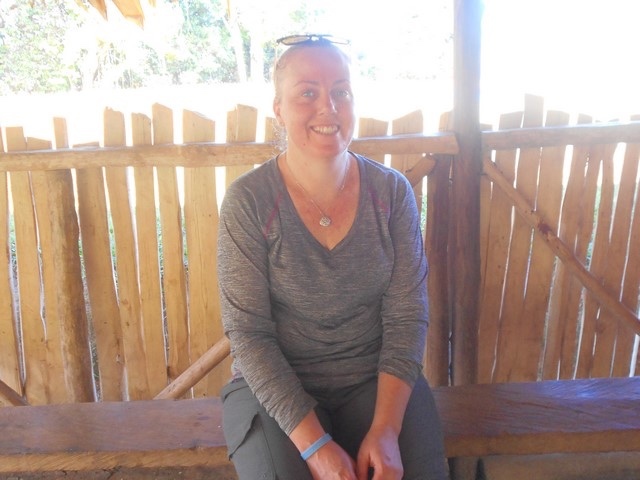 Katrina, said she experienced a tough day today but is still enjoying her trek. 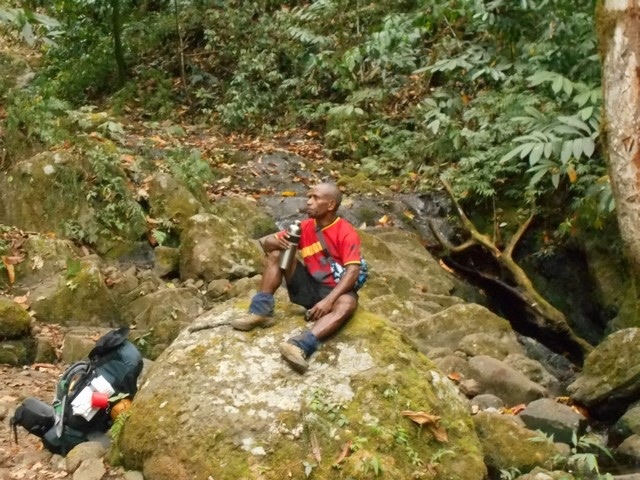 Richard slipped over and hurt his arm but he too said he is ok and loving his trek. 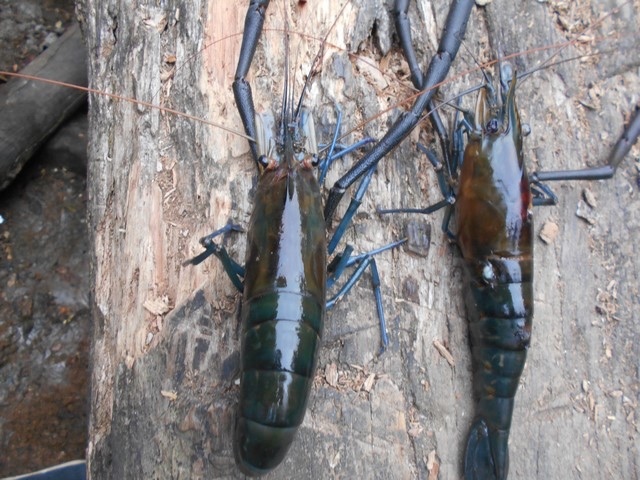 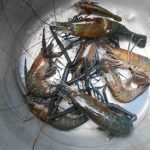 Tomorrow they head to Dump 1. 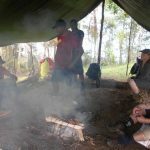 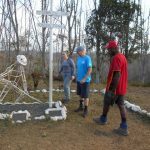 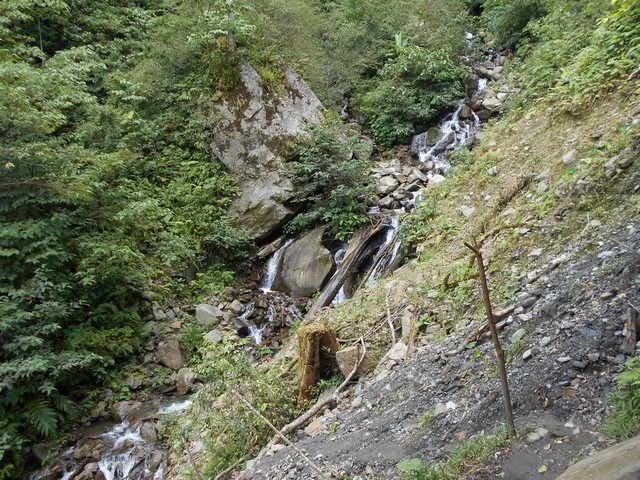 Trek 1130: Trekkers are now at Dump 1 and tomorrow will head for Isurava Memorial for the night. 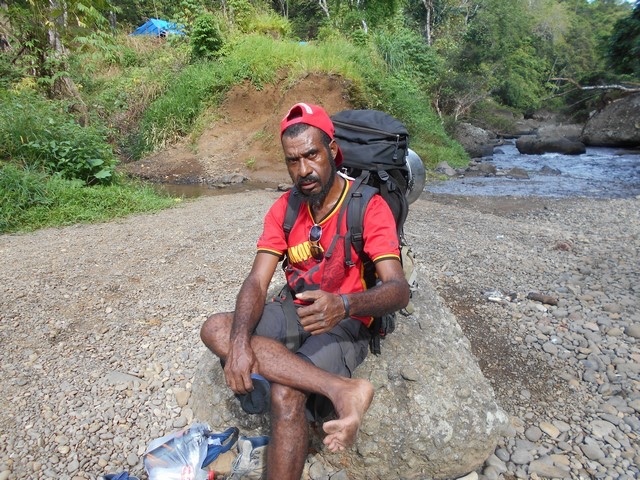 Ivan called and said they are all ok and doing well. 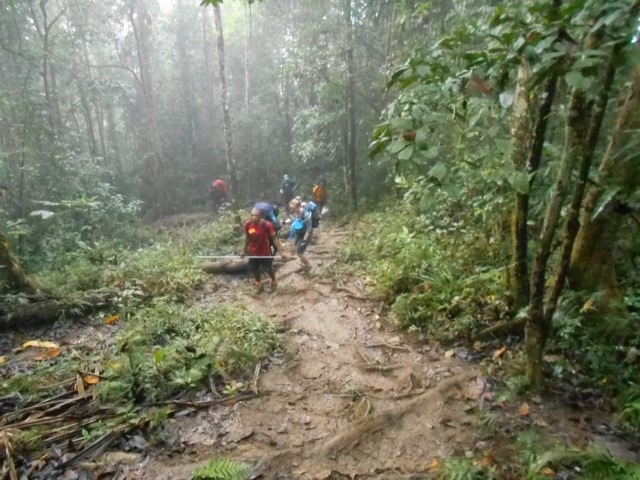 He said its still wet and slippery. 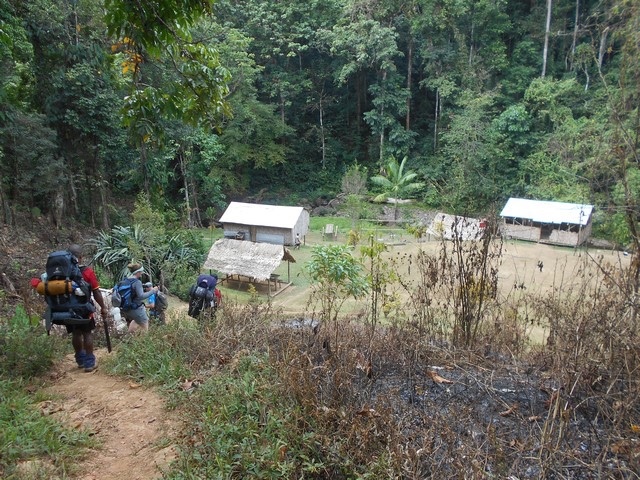 Think of them tomorrow as they make their way along the track. 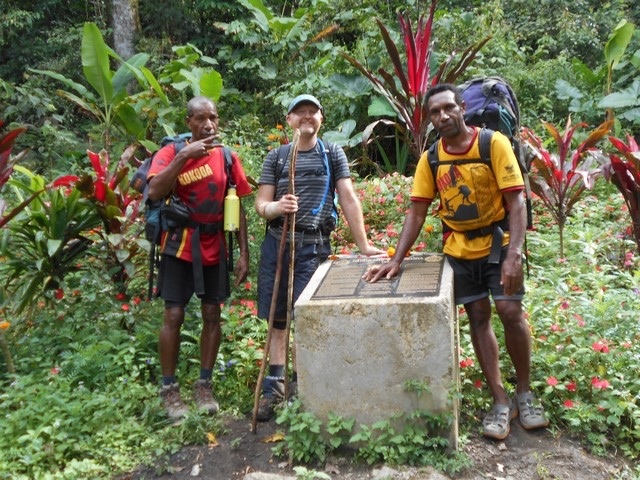 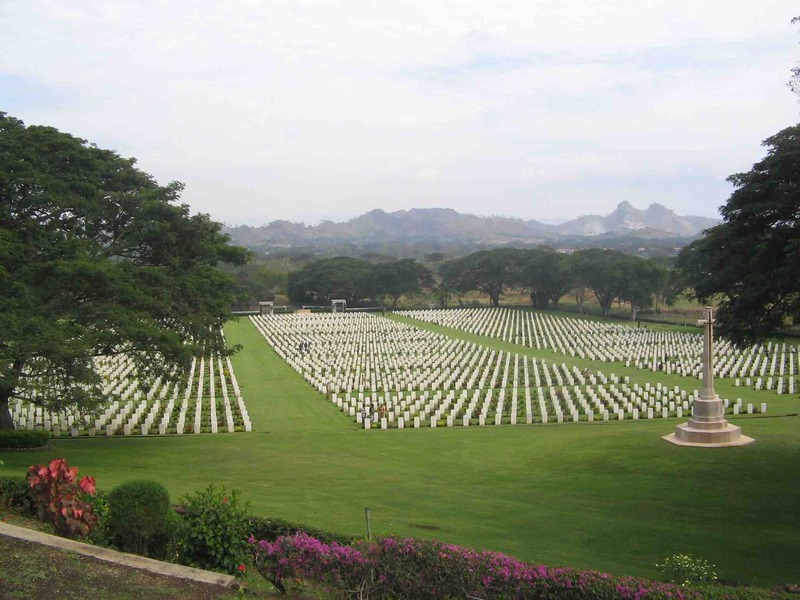 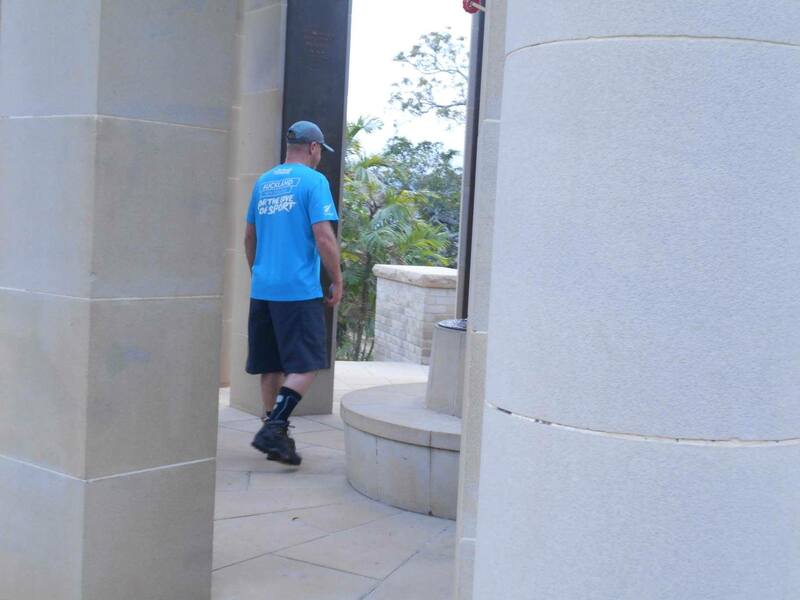 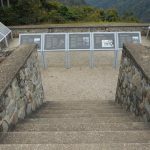 Trek 1130: This group have now reached Isurava Memorial. 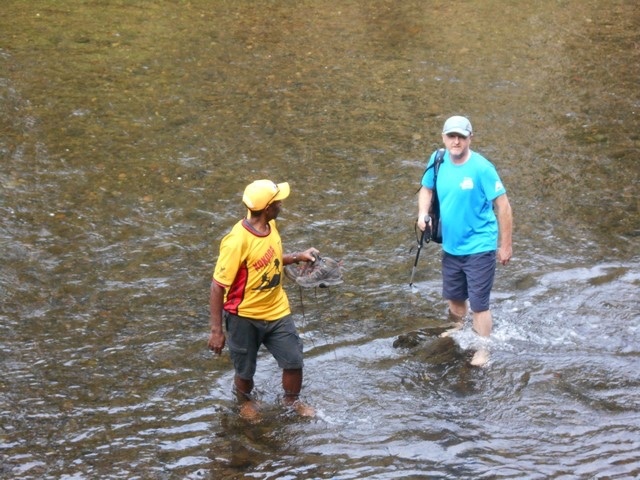 Today the track has been dry according to Ivan. 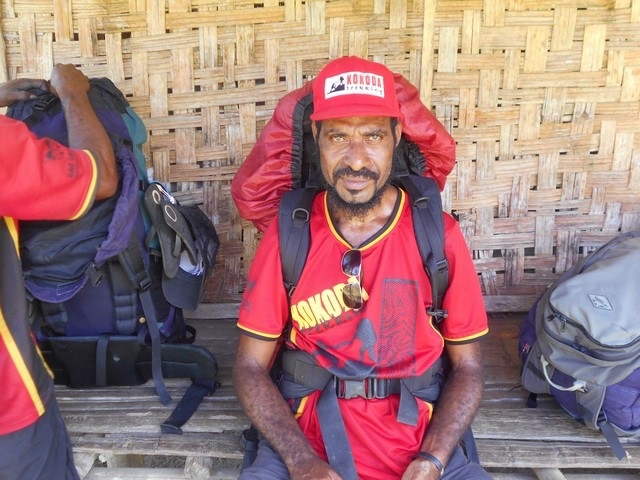 He said they arrived at their destination around 2pm and have now decided to walk off the track tomorrow instead of the next day. 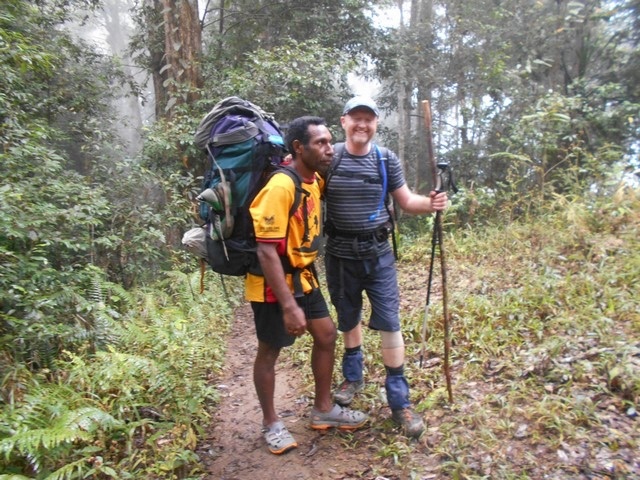 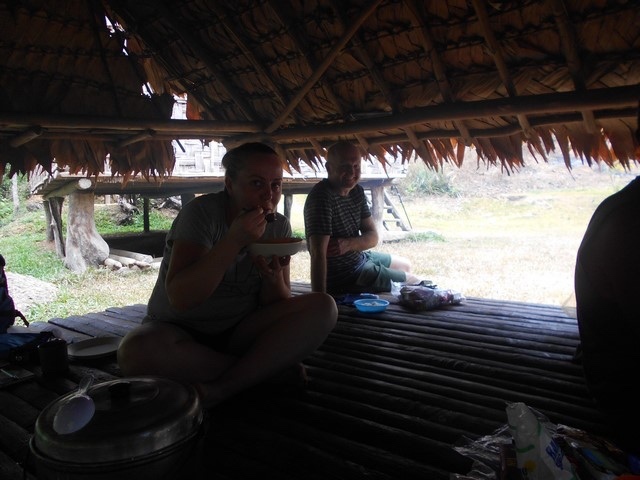 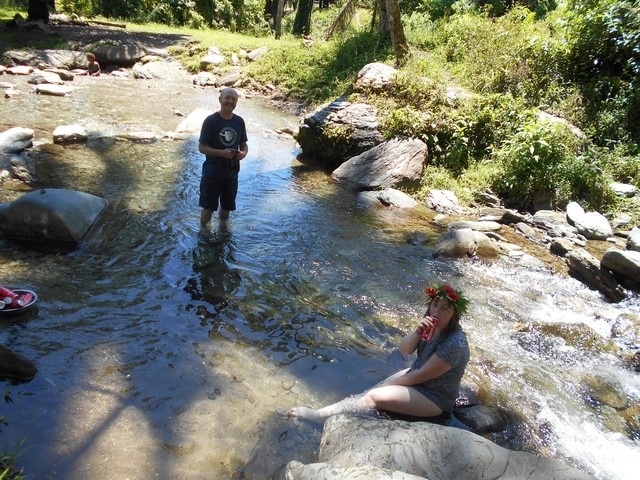 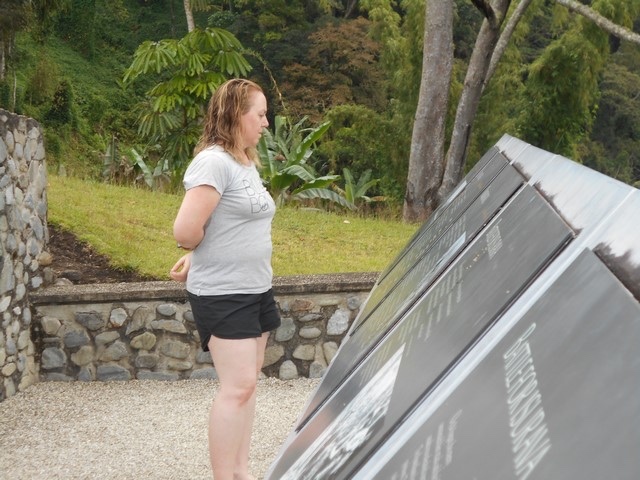 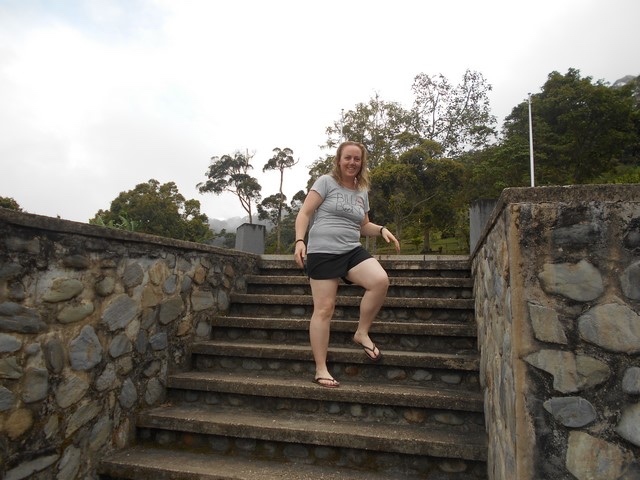 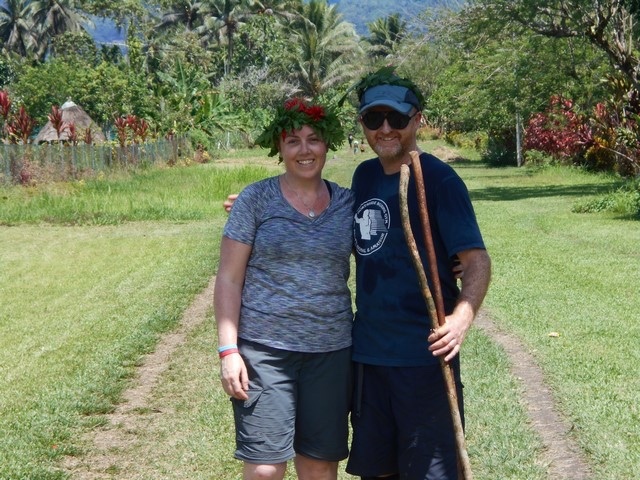 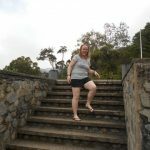 Apparently they are both happy and still enjoying their Kokoda experience. 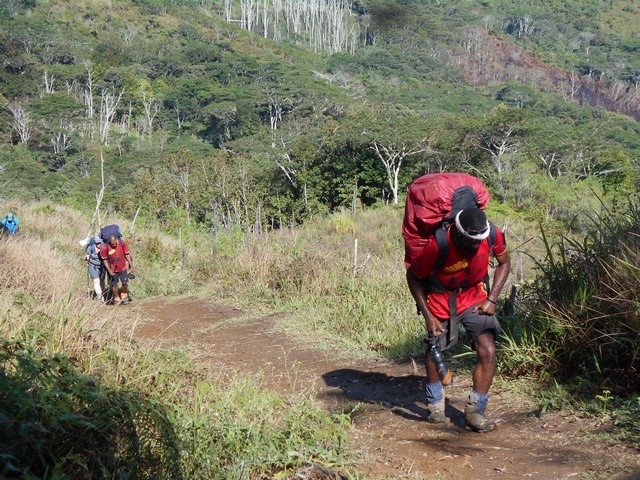 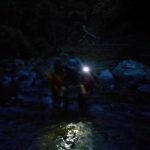 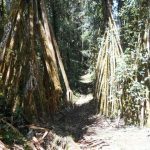 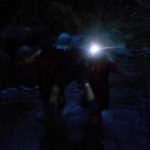 Trek 1130: I could sense the excitement today as Ivan contacted me saying they are presently at Deniki and on their way off the track. 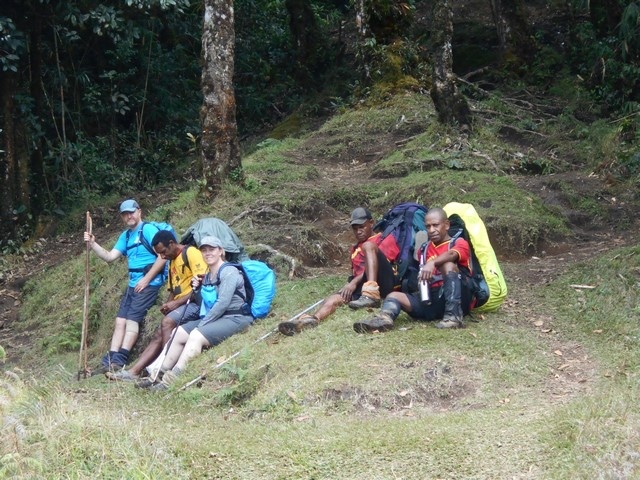 Just look at the trekkers faces, do they look HAPPY or WHAT??? 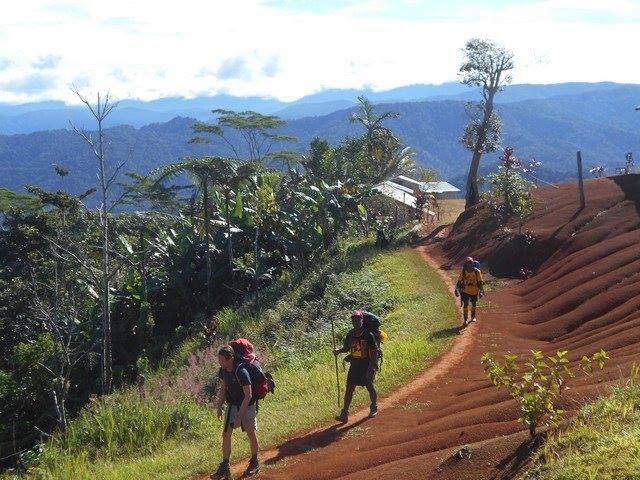 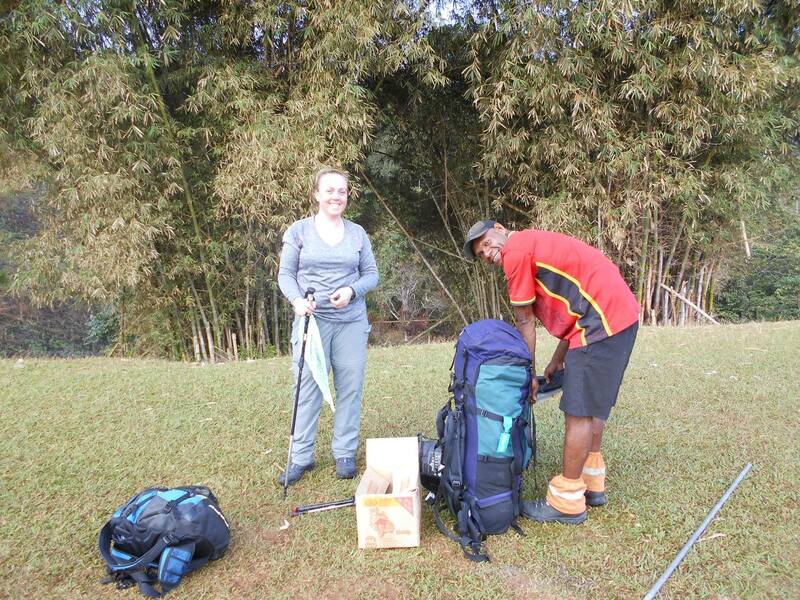 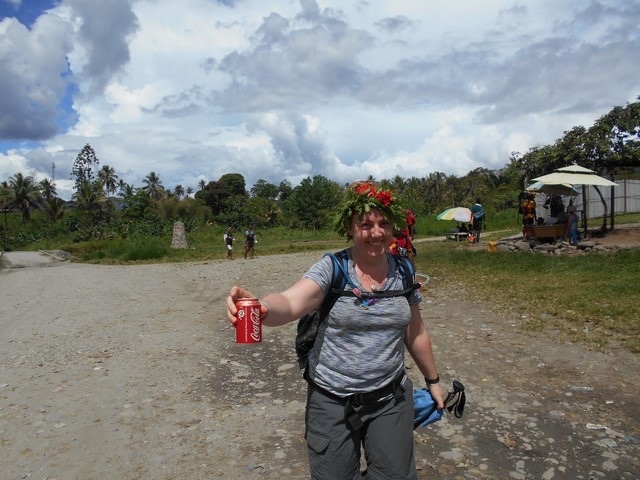 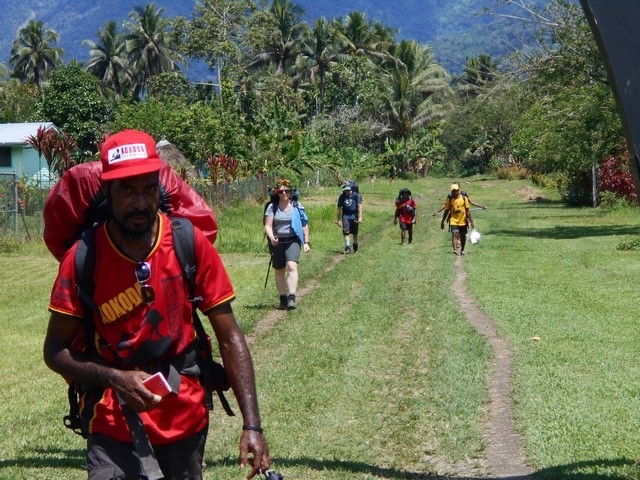 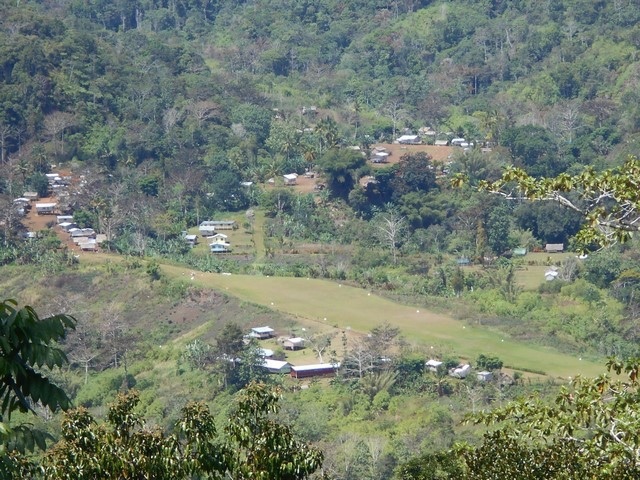 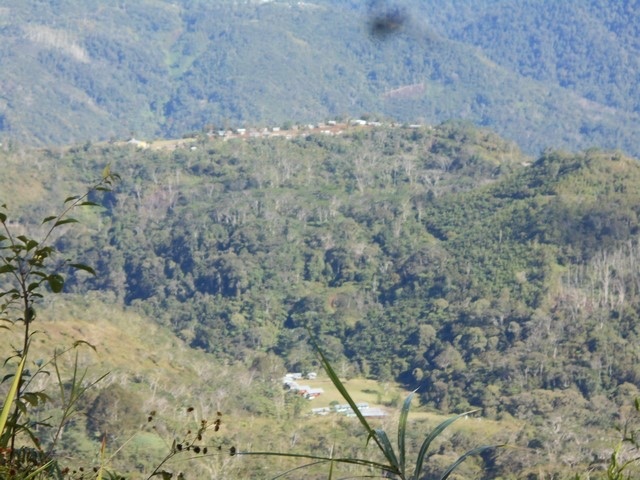 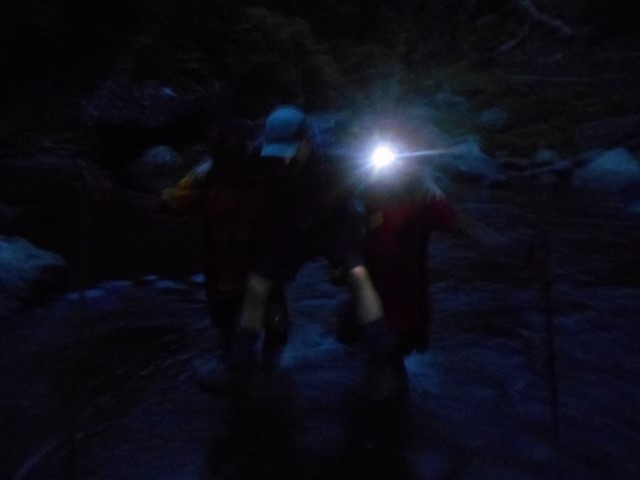 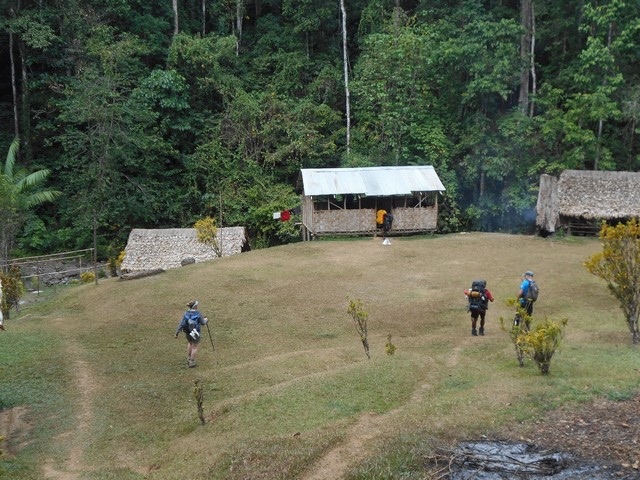 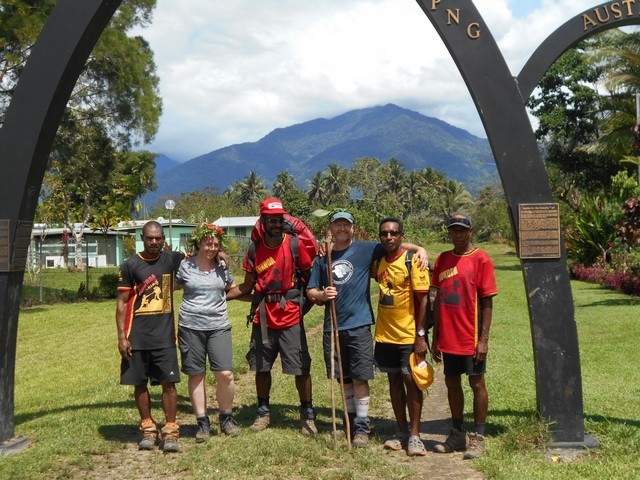 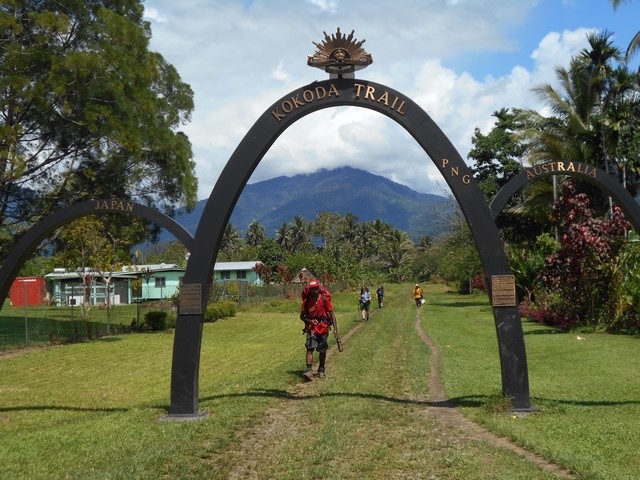 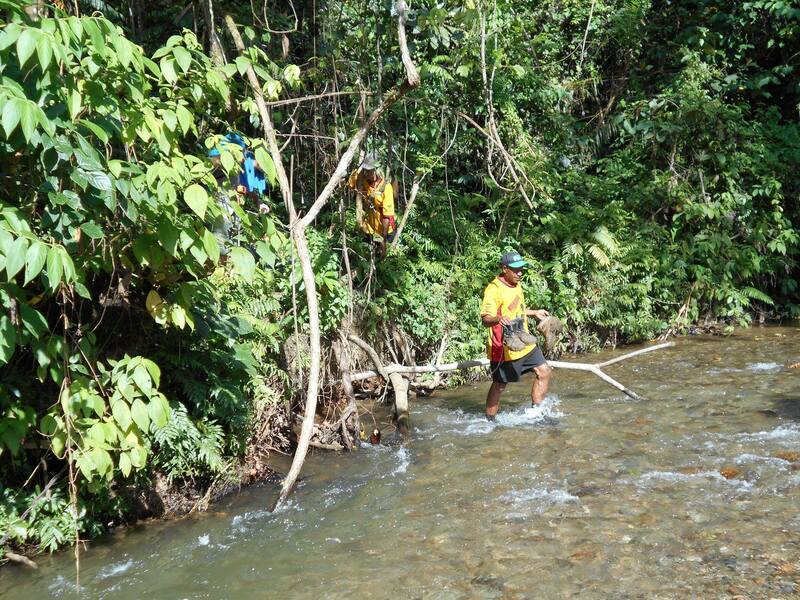 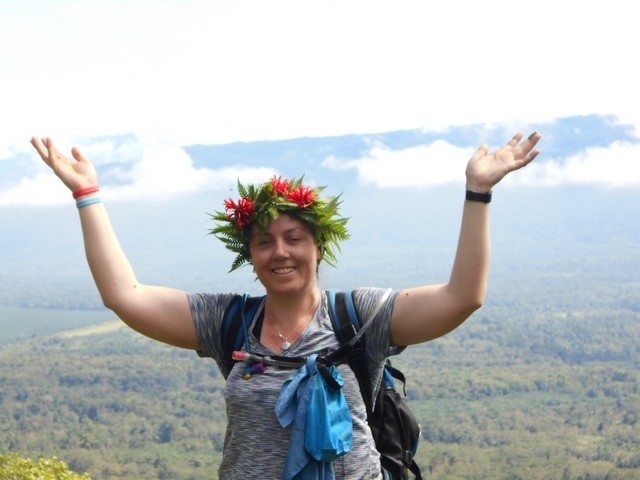 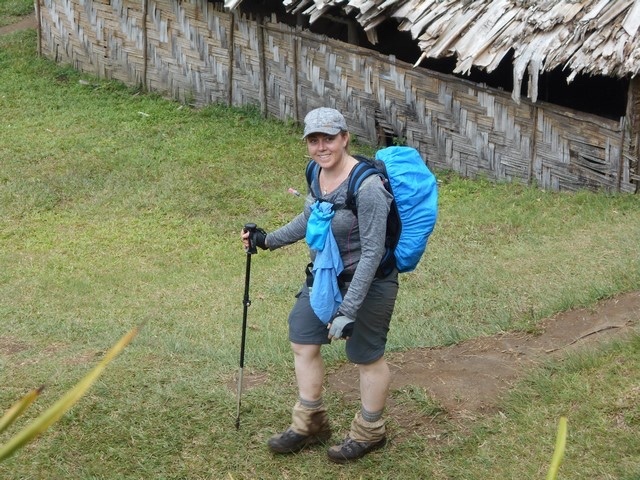 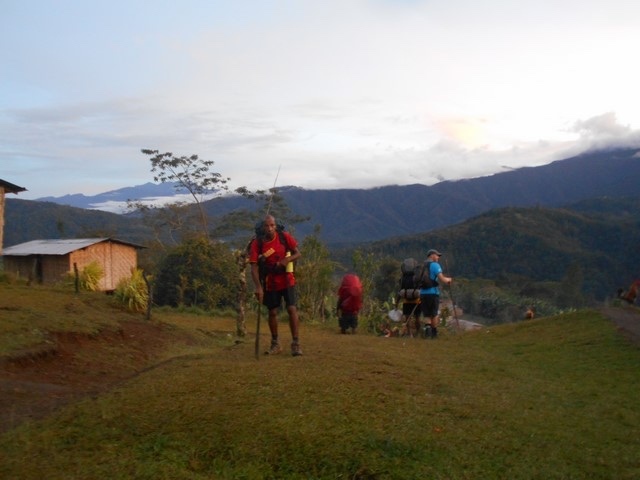 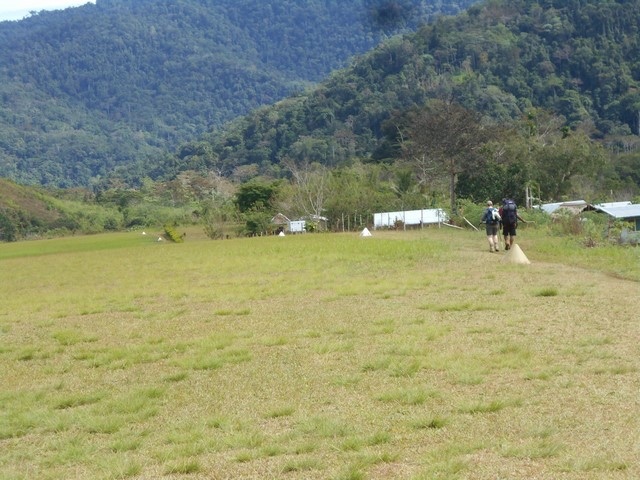 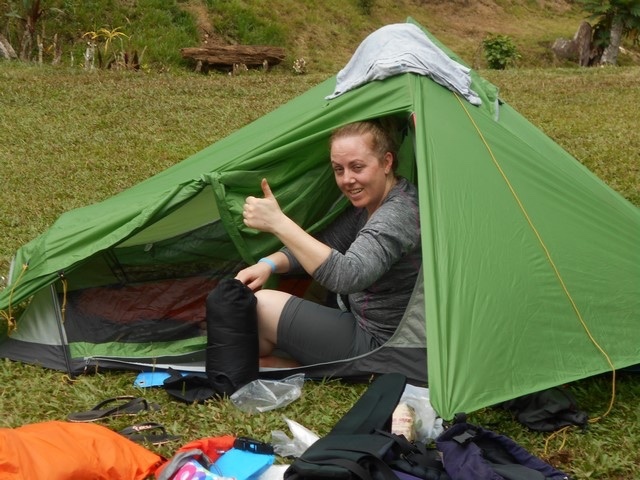 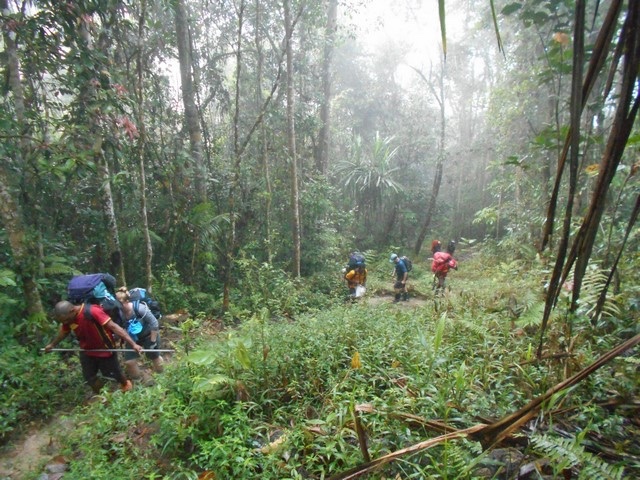 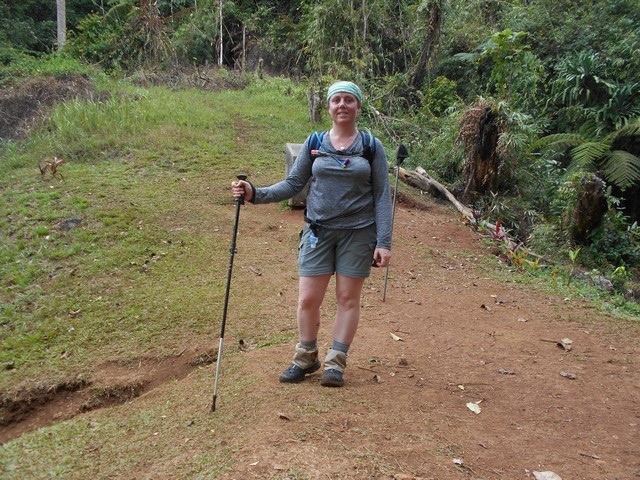 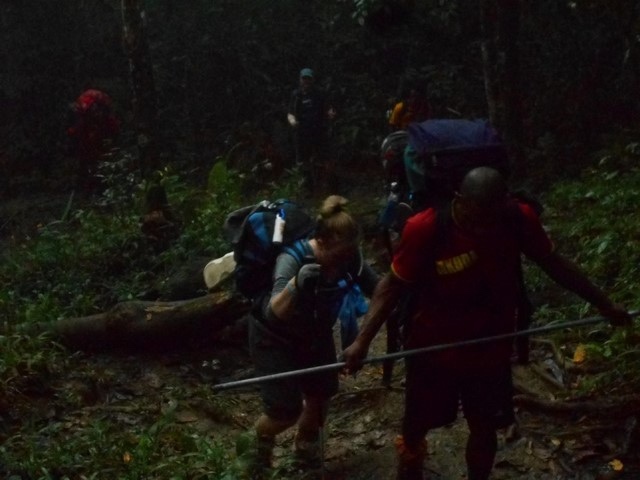 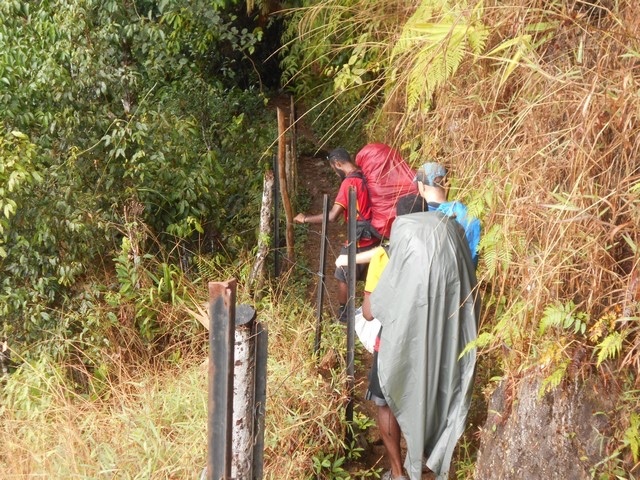 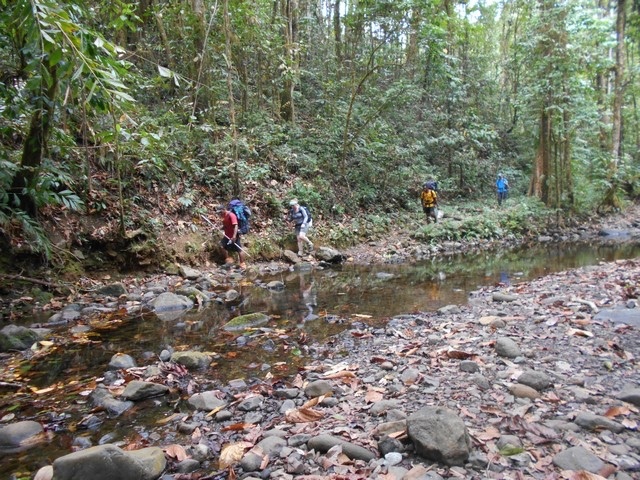 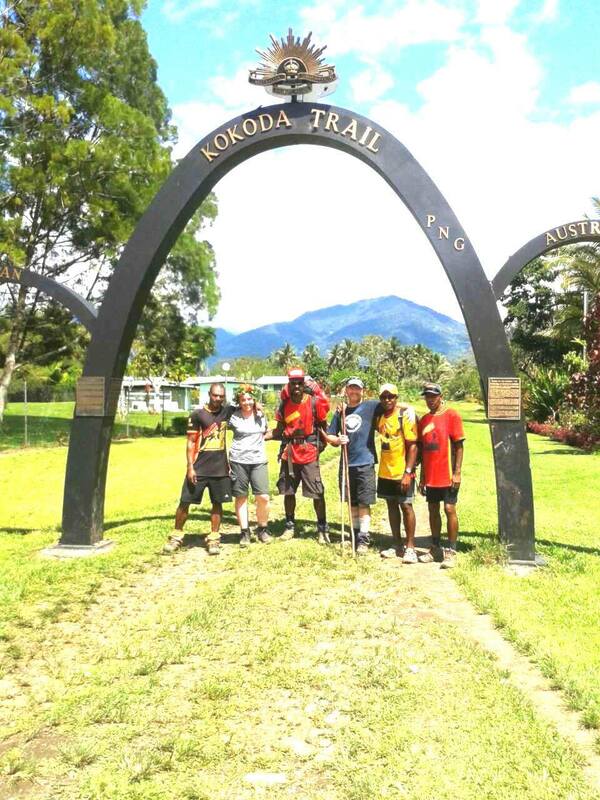 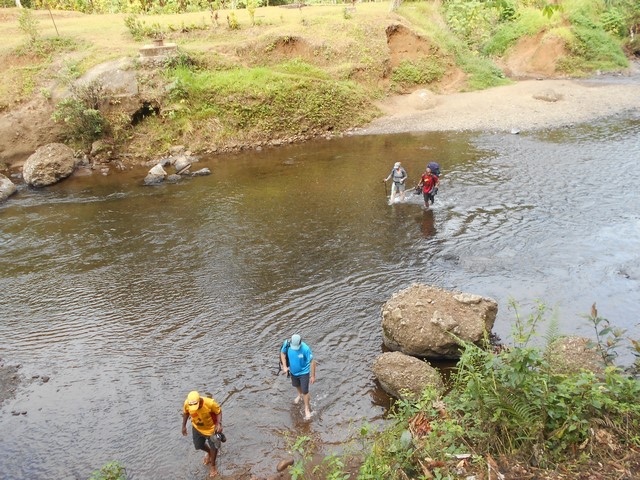 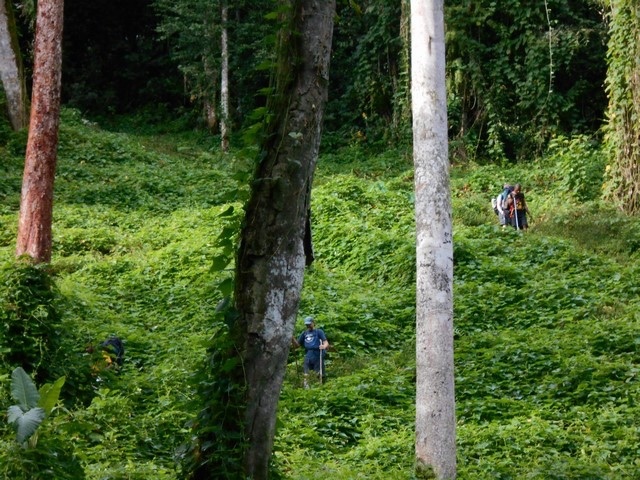 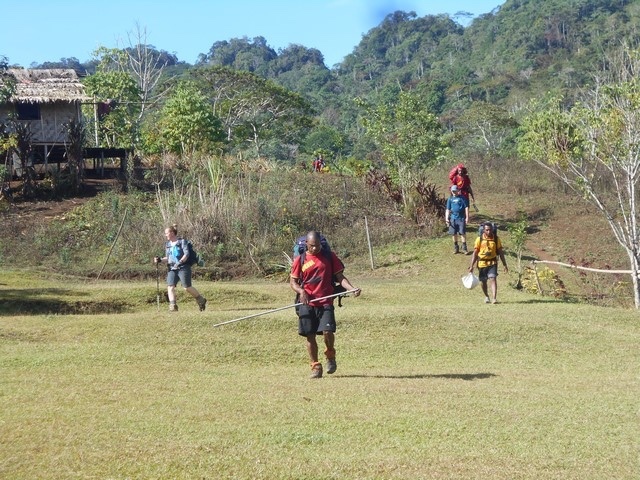 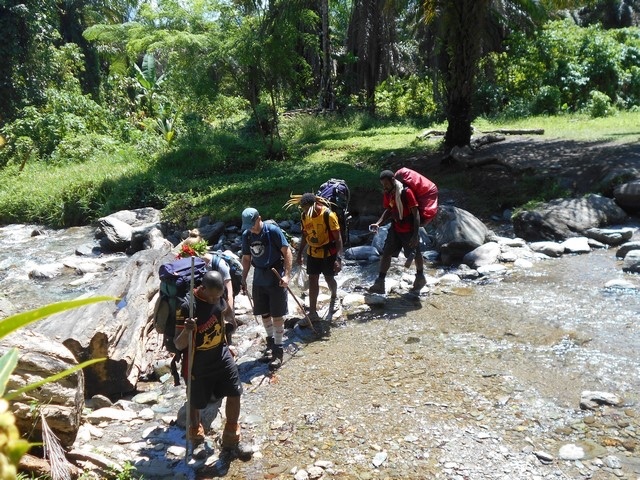 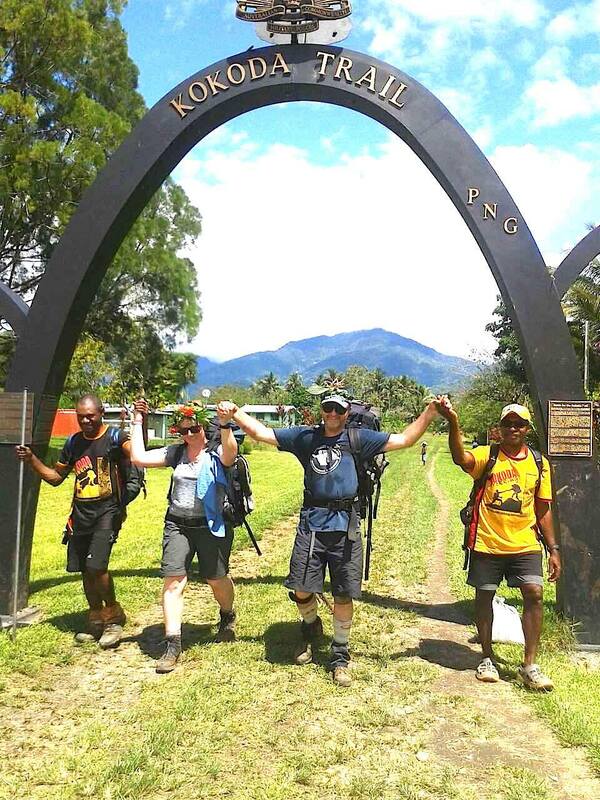 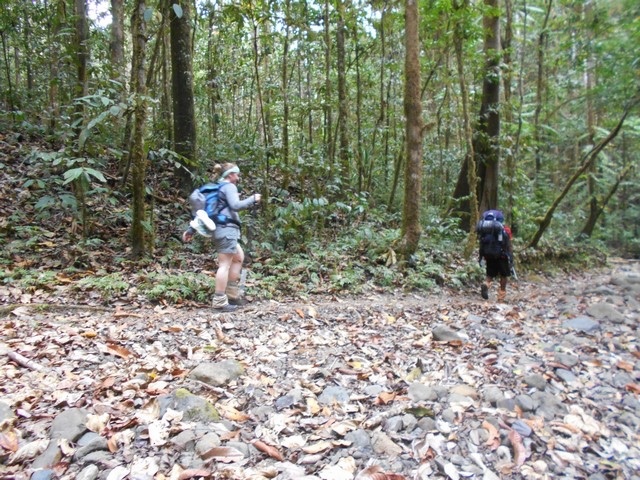 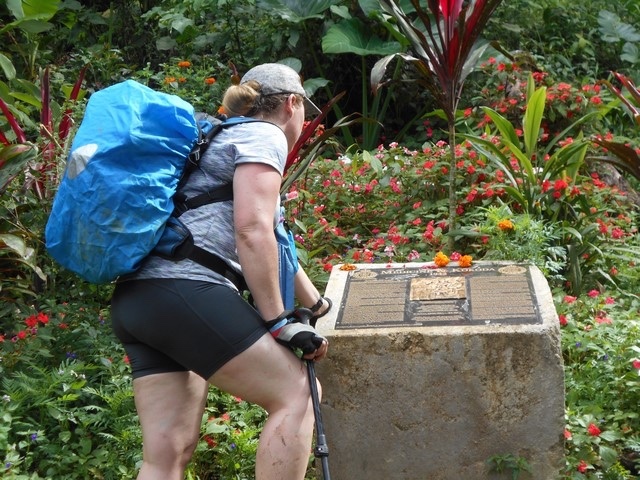 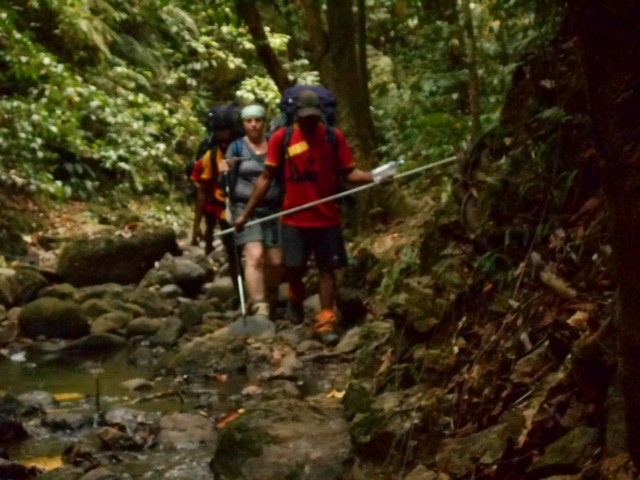 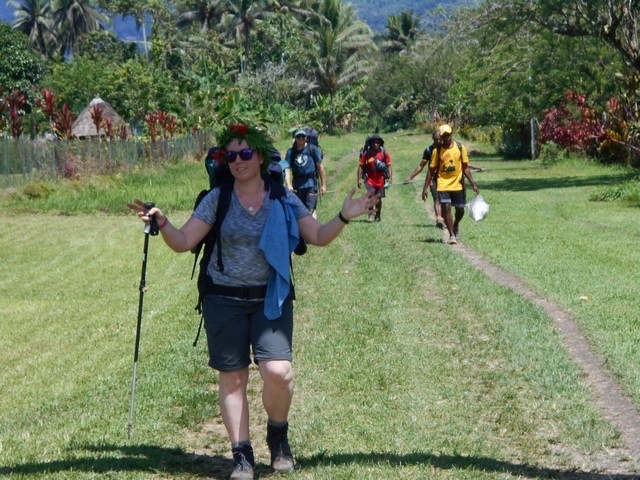 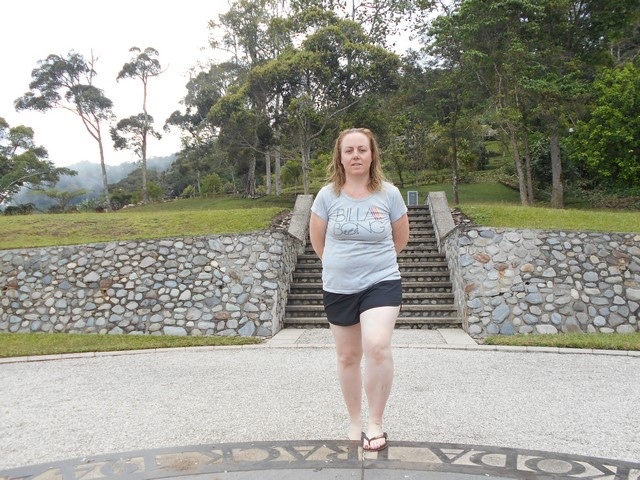 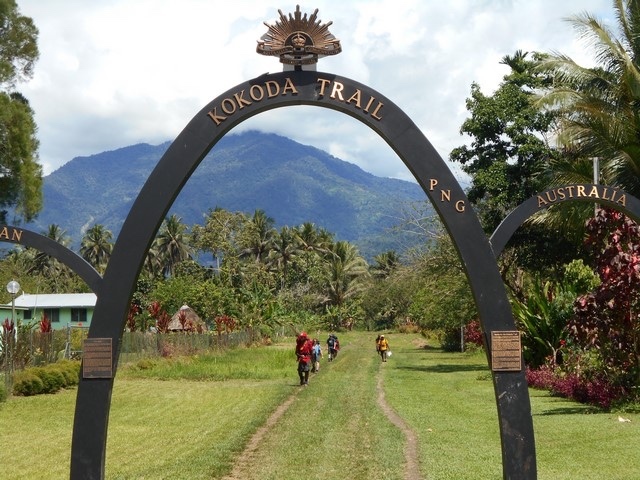 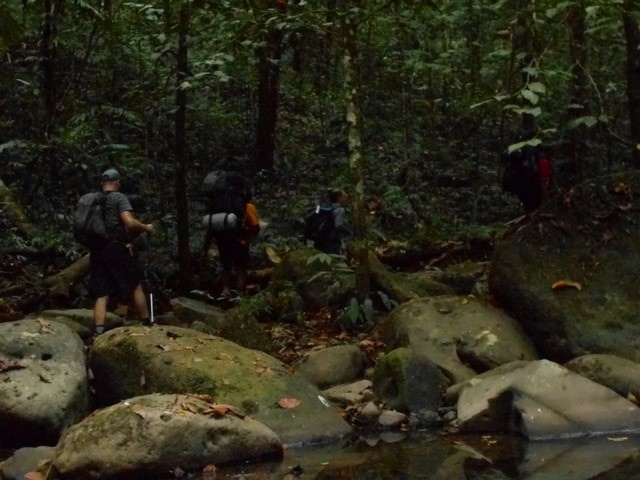 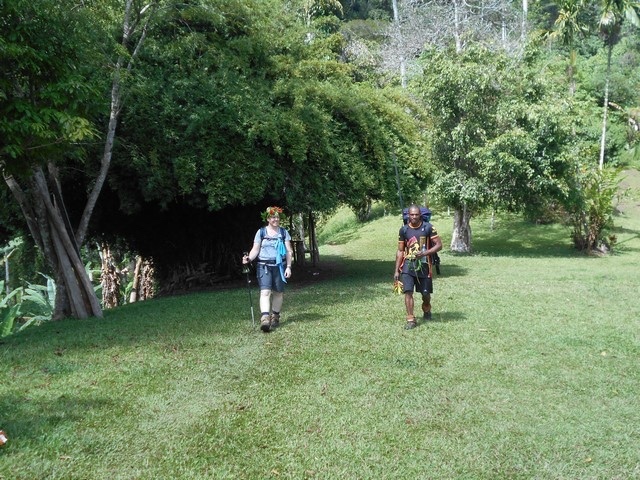 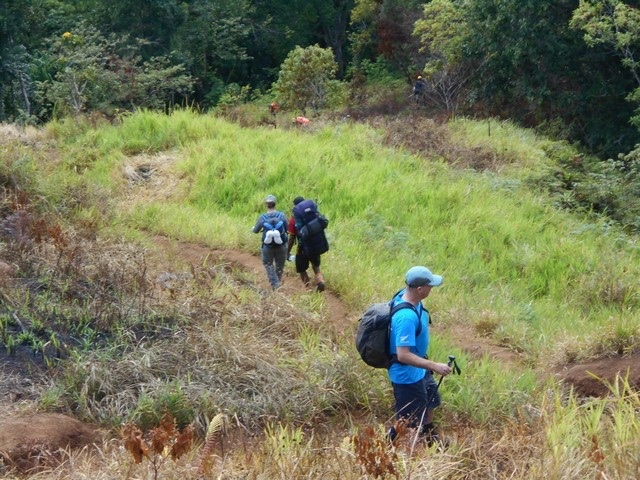 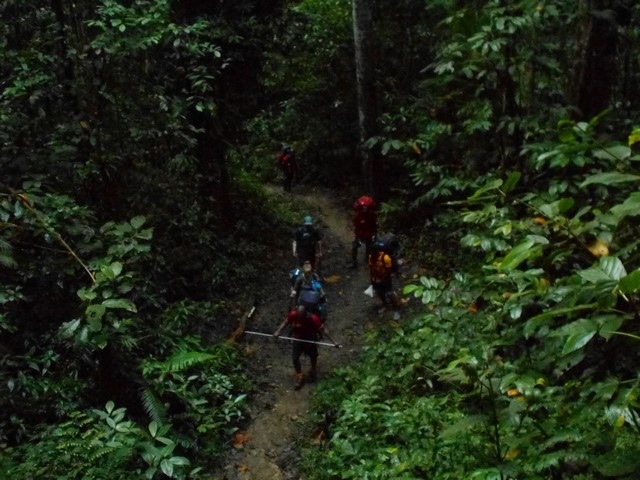 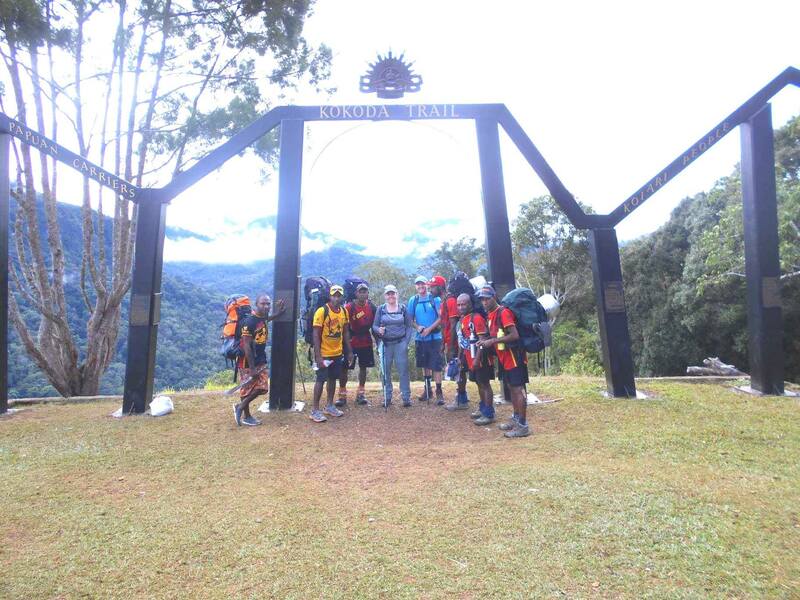 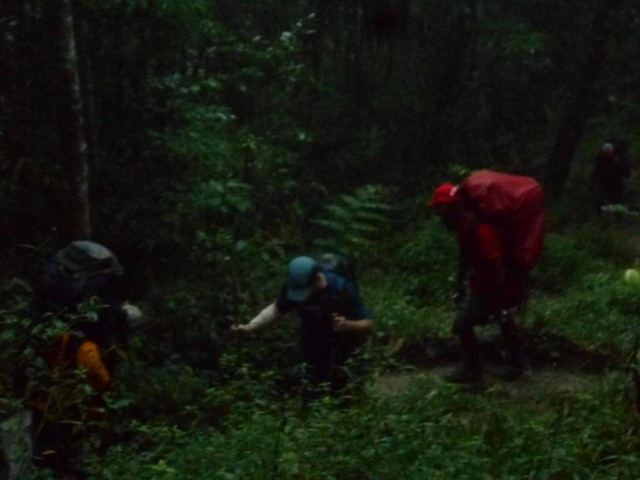 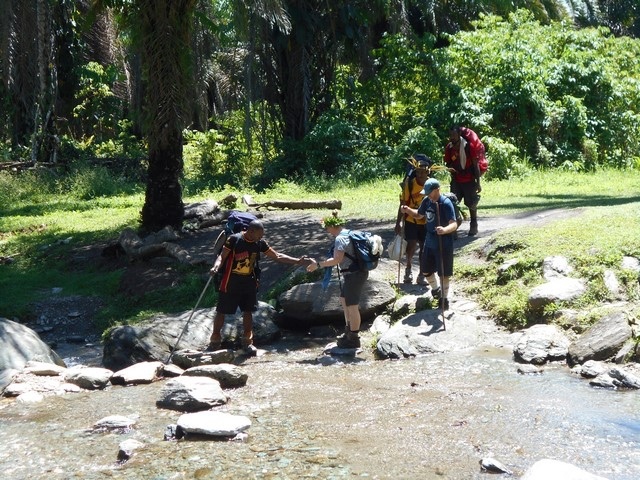 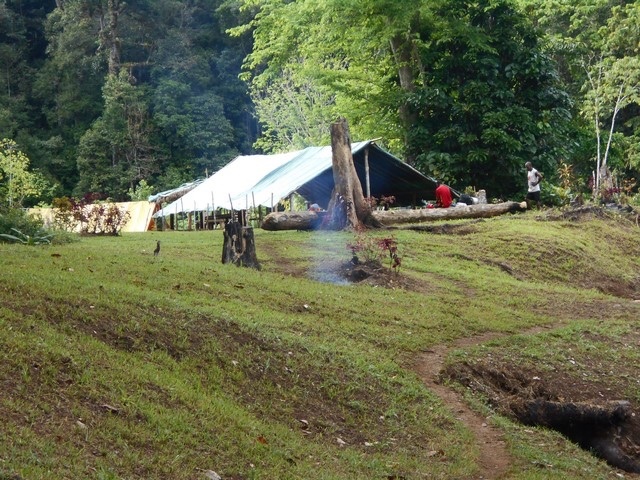 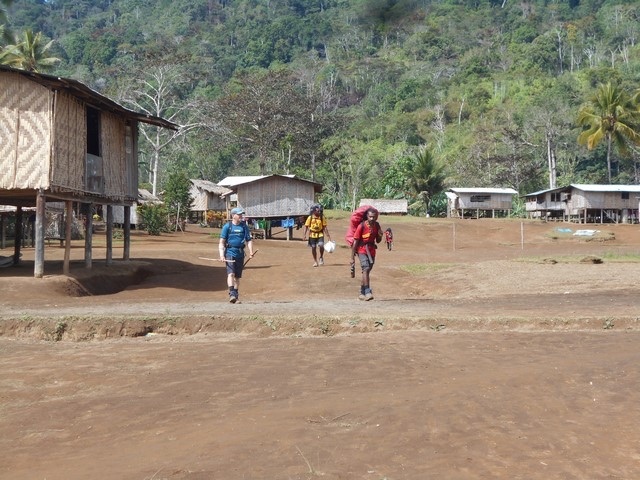 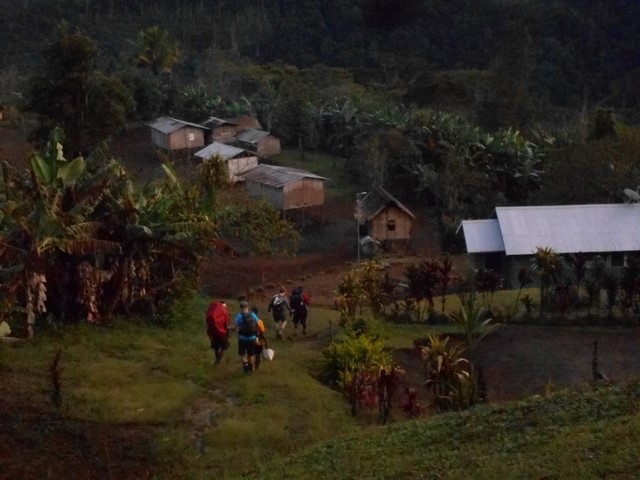 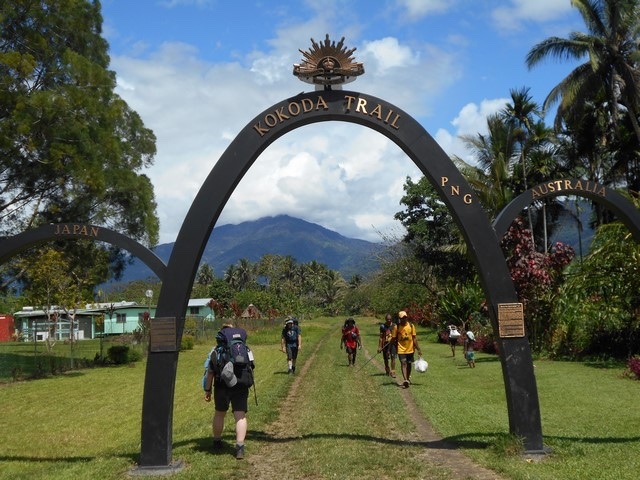 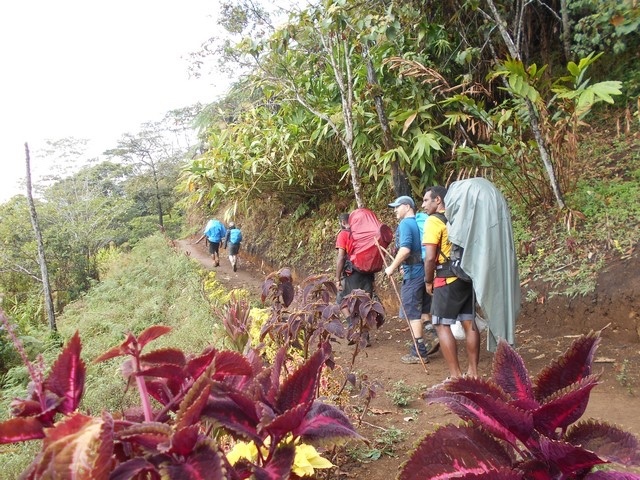 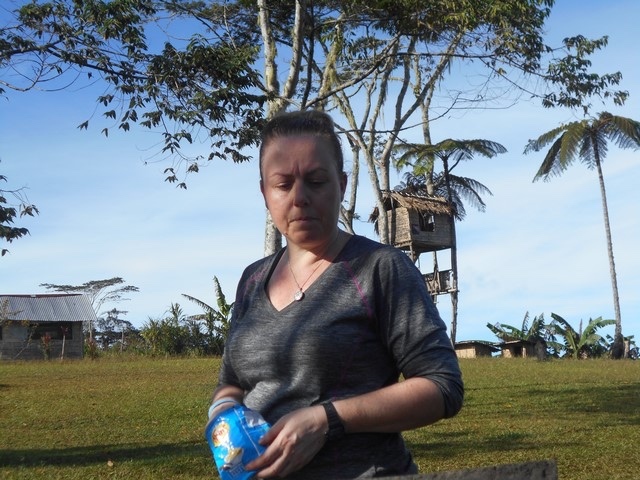 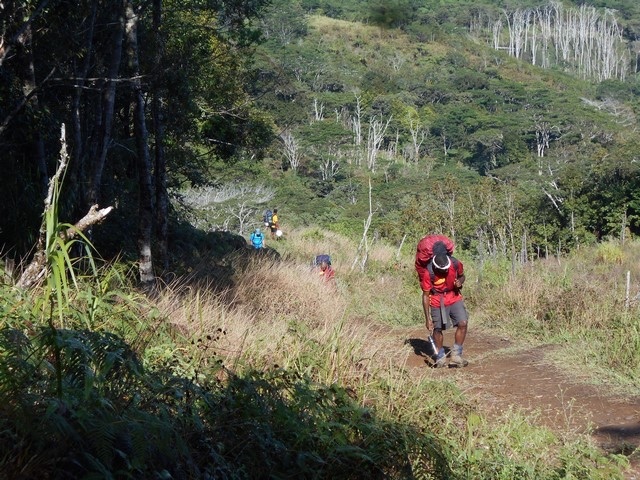 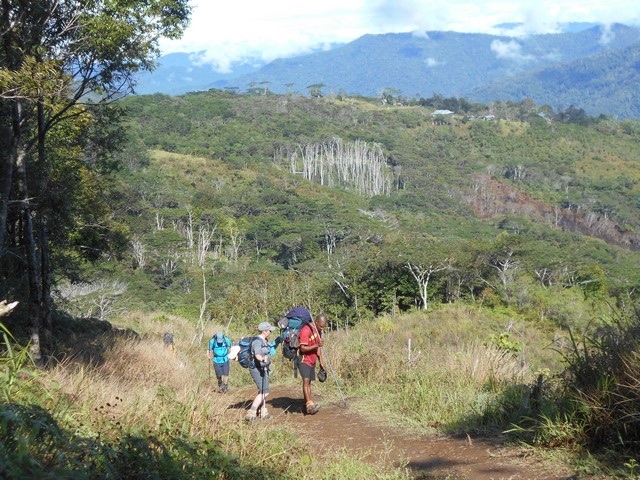 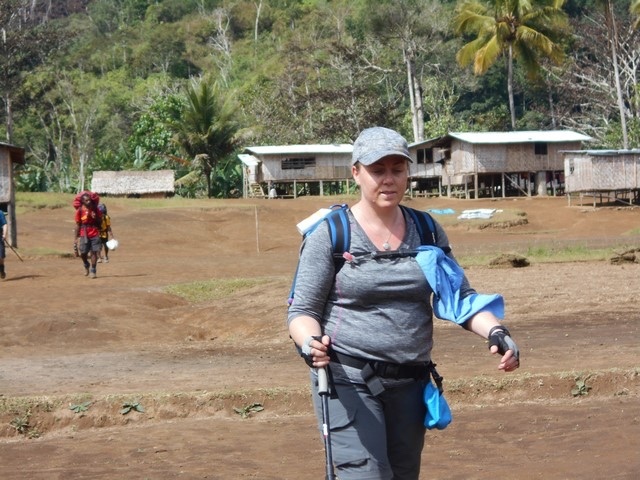 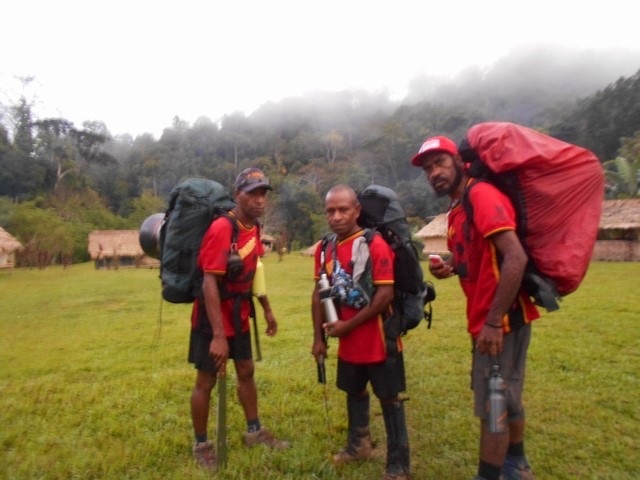 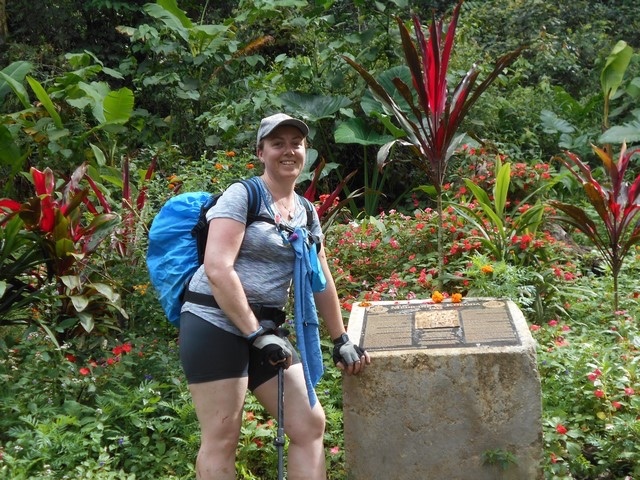 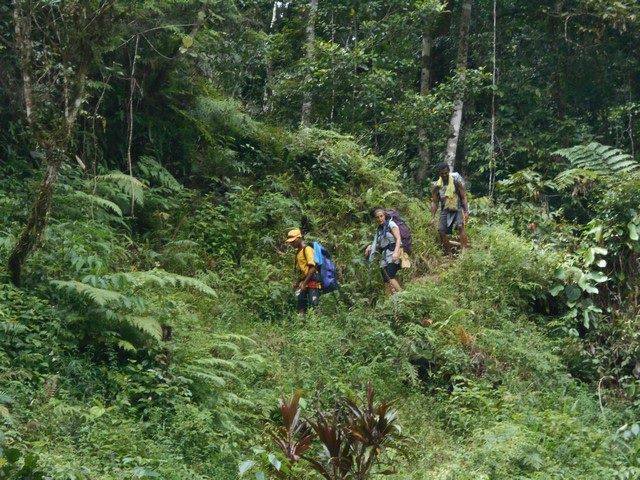 Trek 1130: Congratulations to everyone as this trek just walked off the track in Kokoda a short time ago. 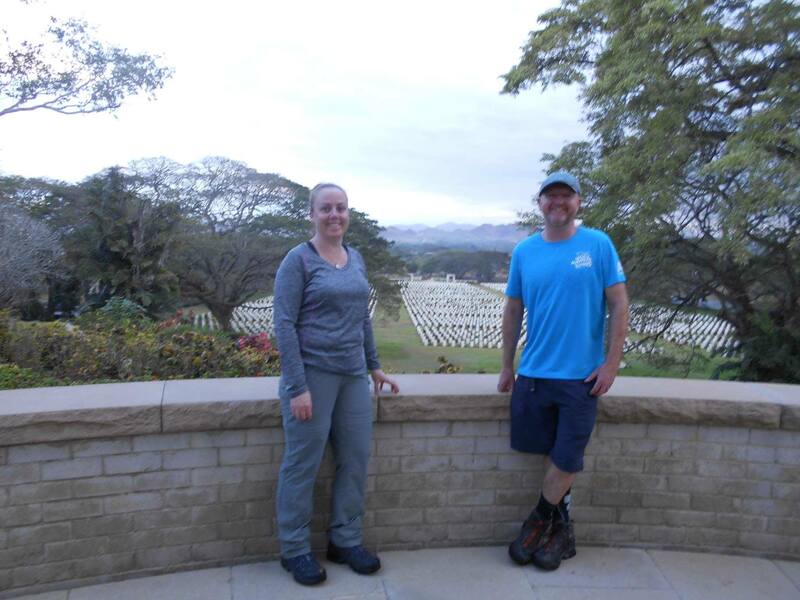 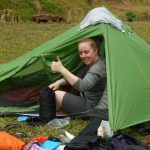 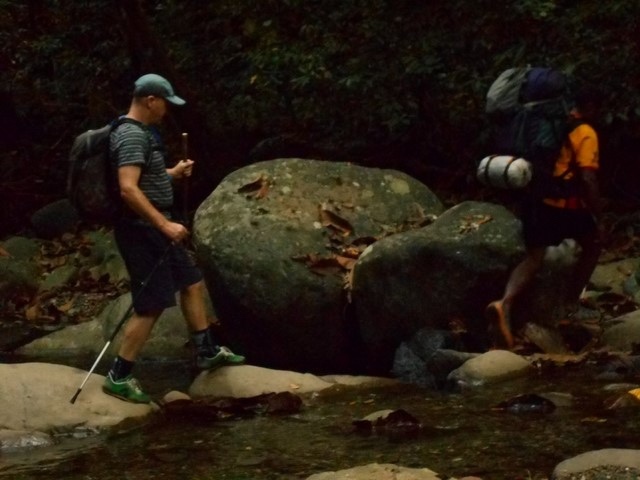 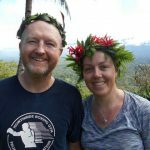 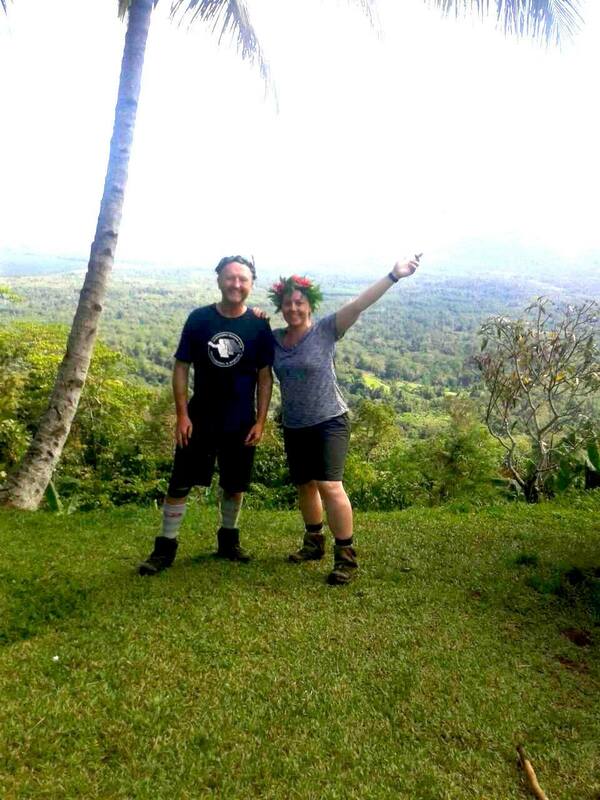 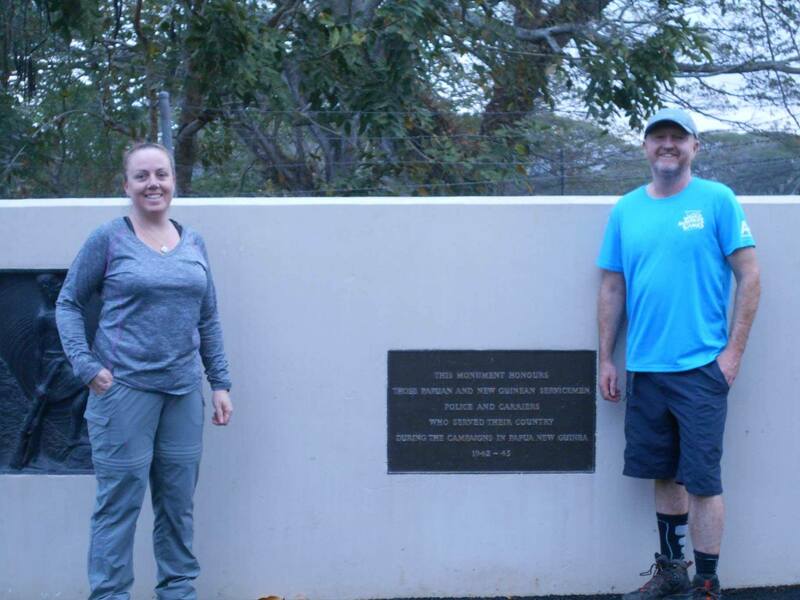 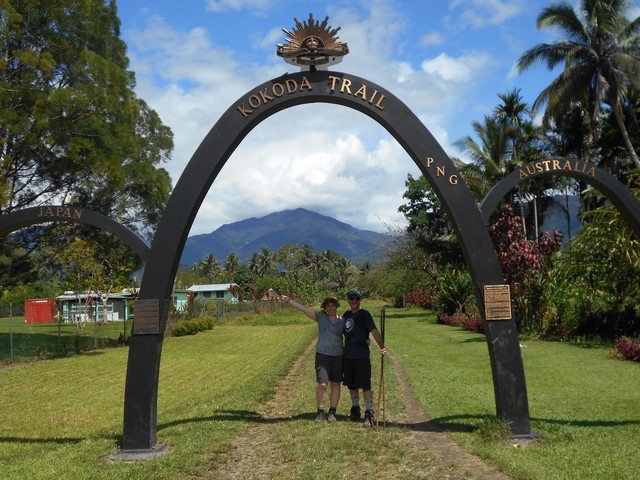 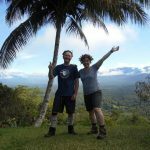 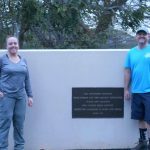 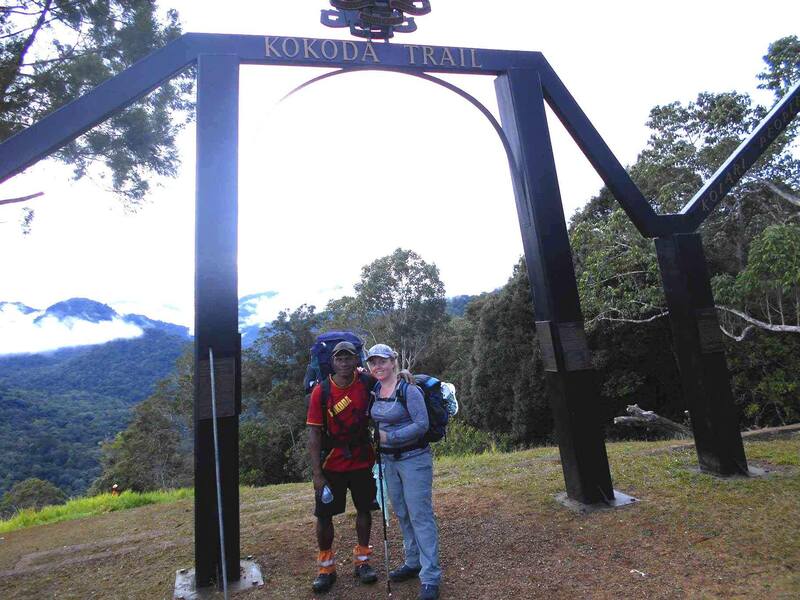 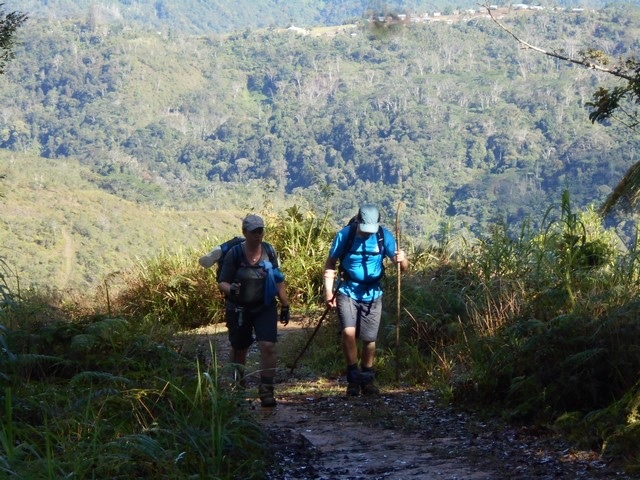 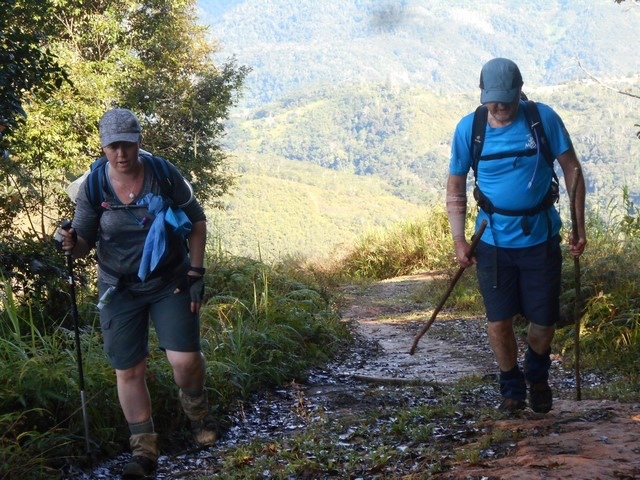 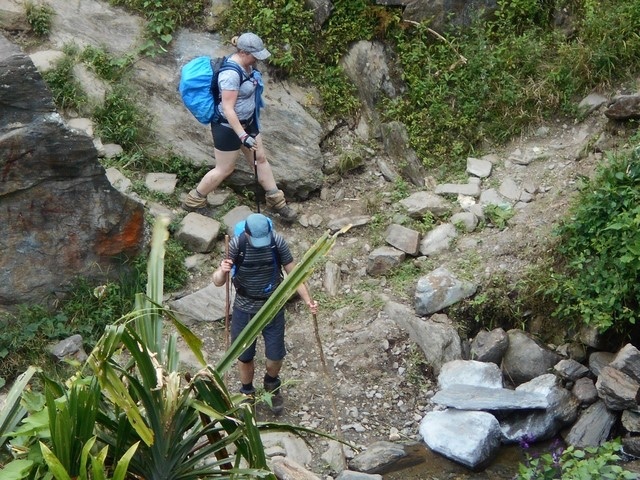 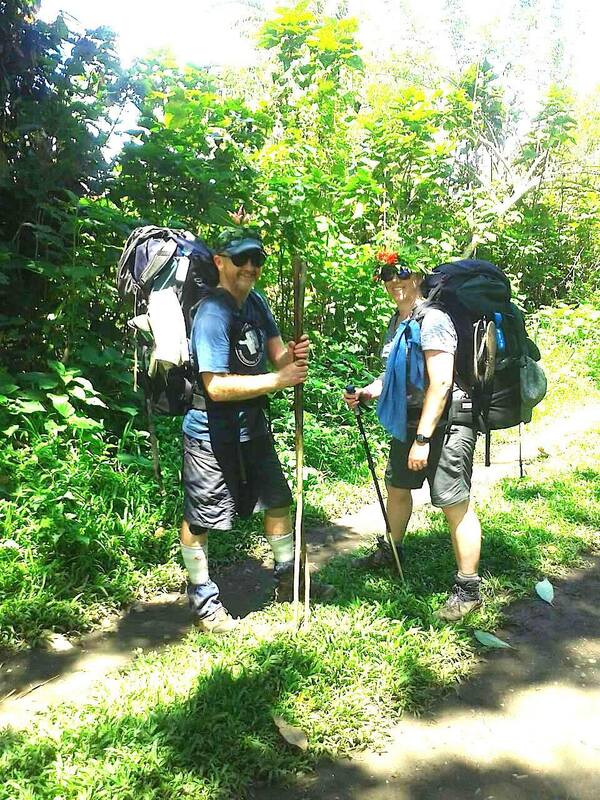 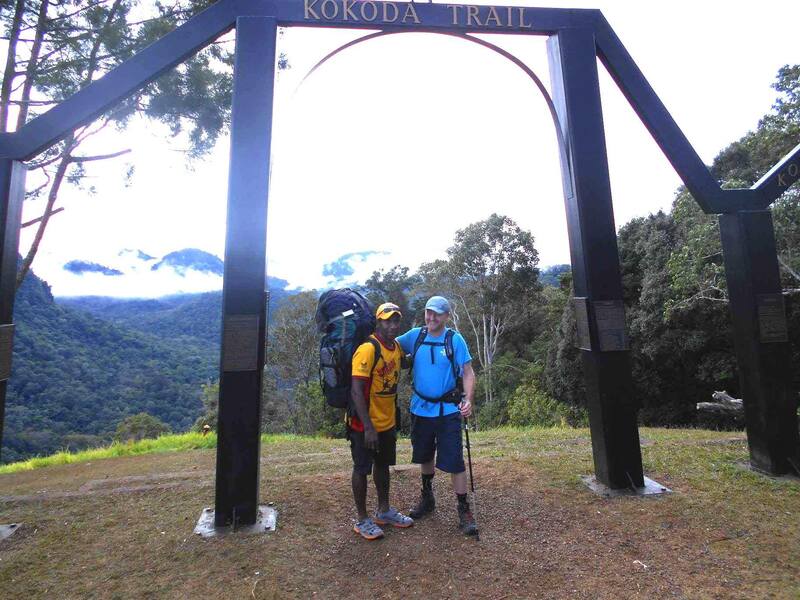 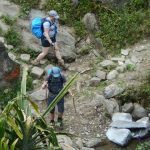 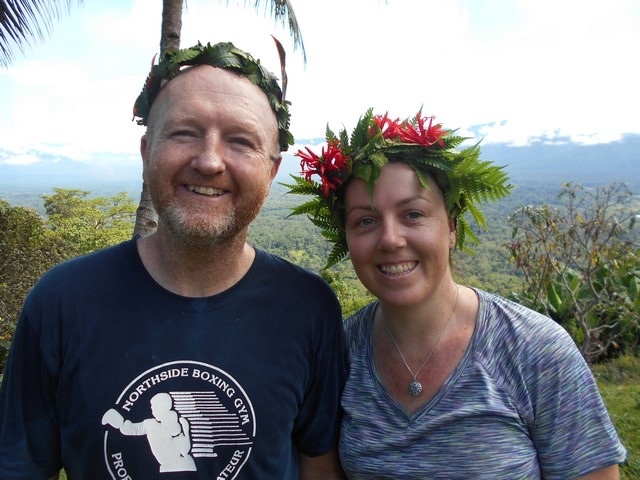 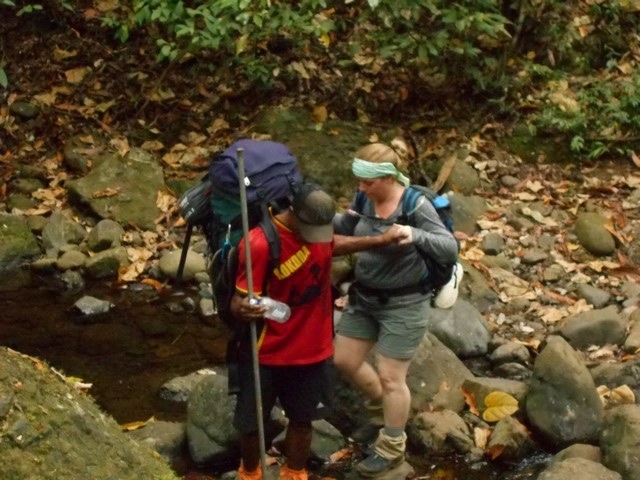 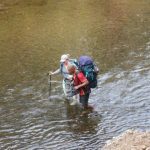 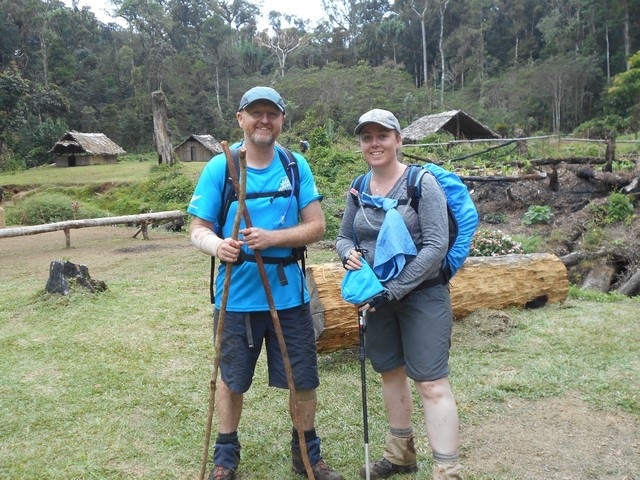 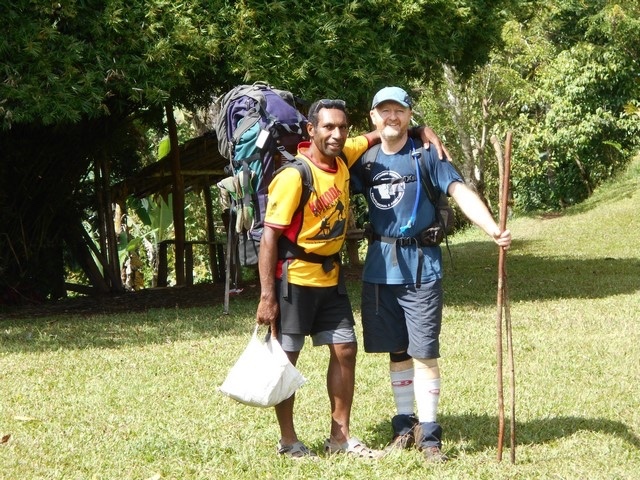 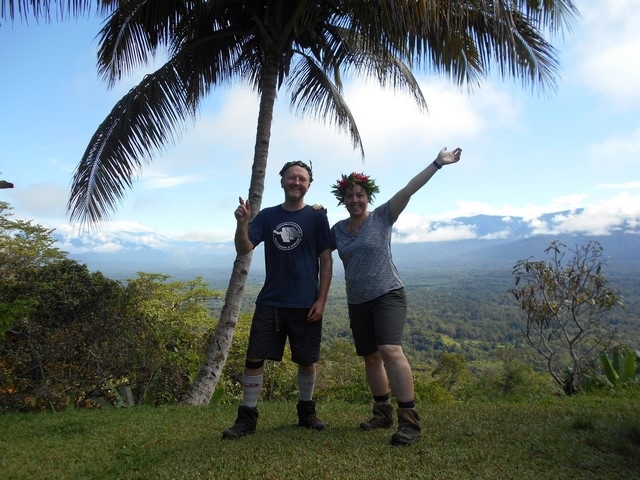 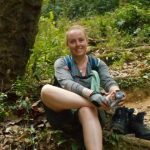 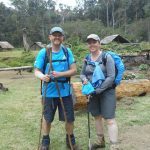 Well done to you both from all of us here at Kokoda Trekking. 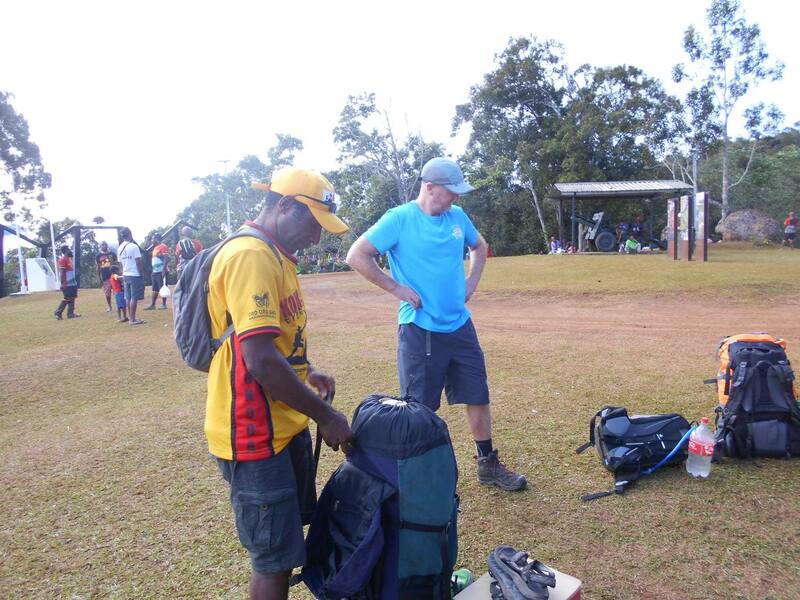 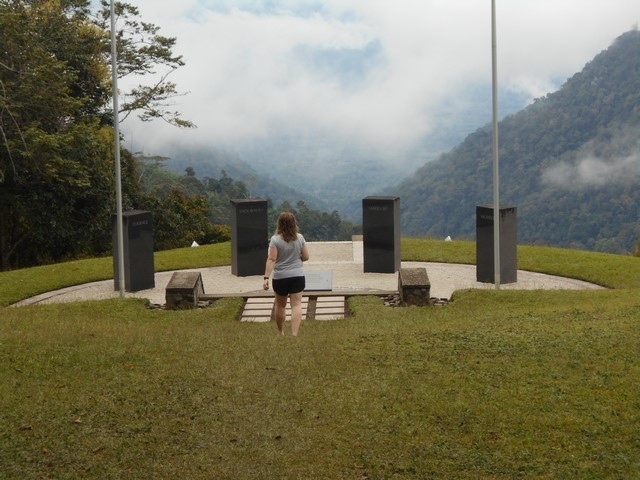 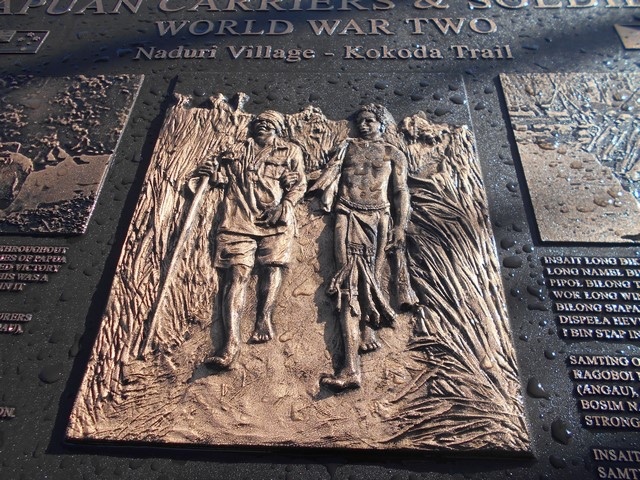 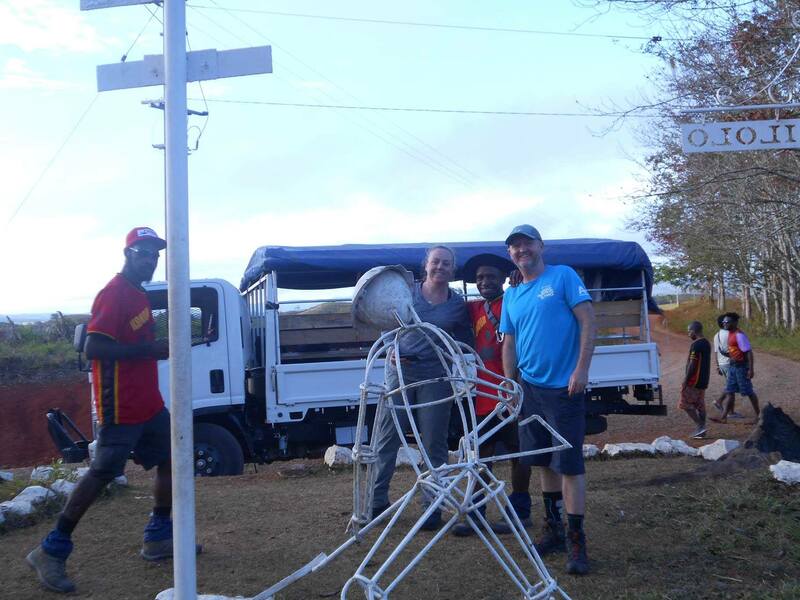 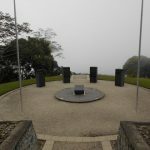 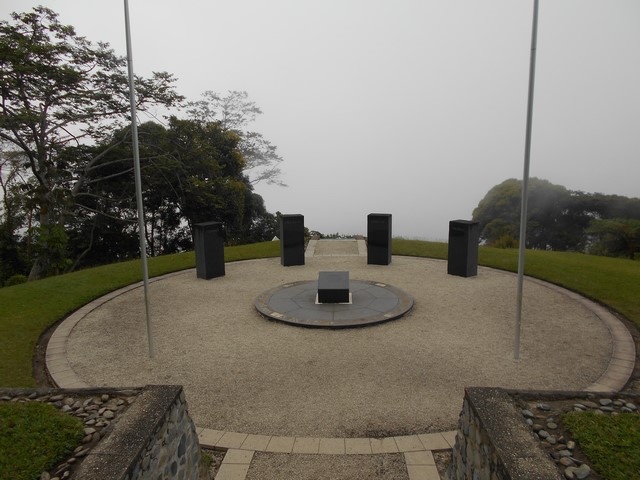 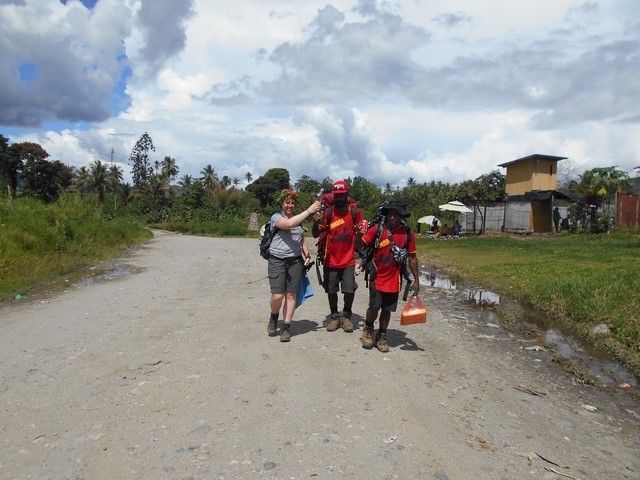 A big thank you to Ivan and our boys for getting you safely to Kokoda.